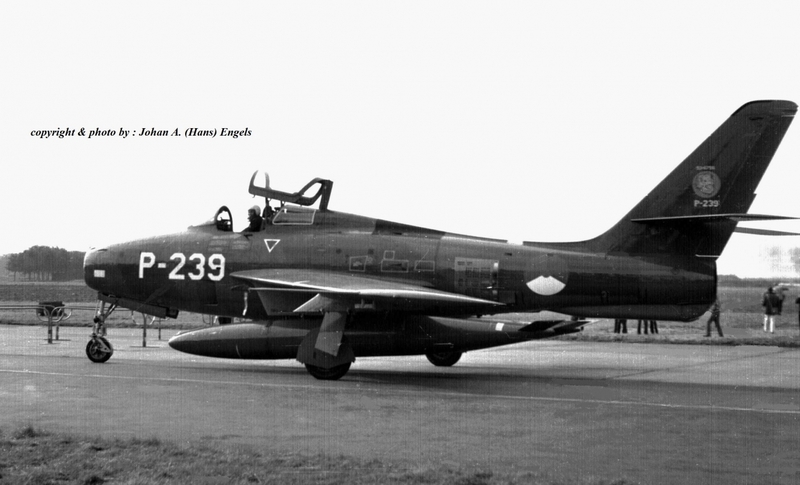 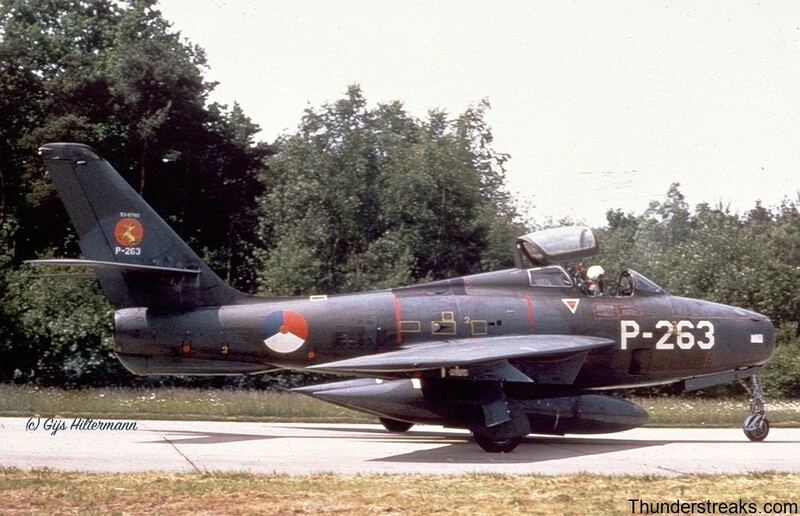 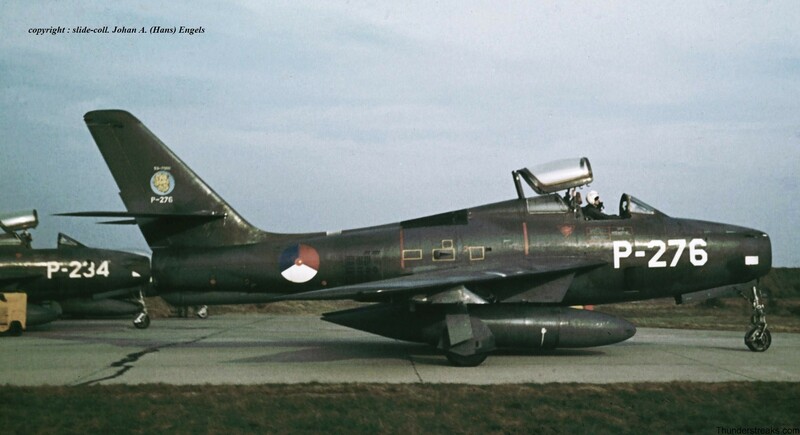 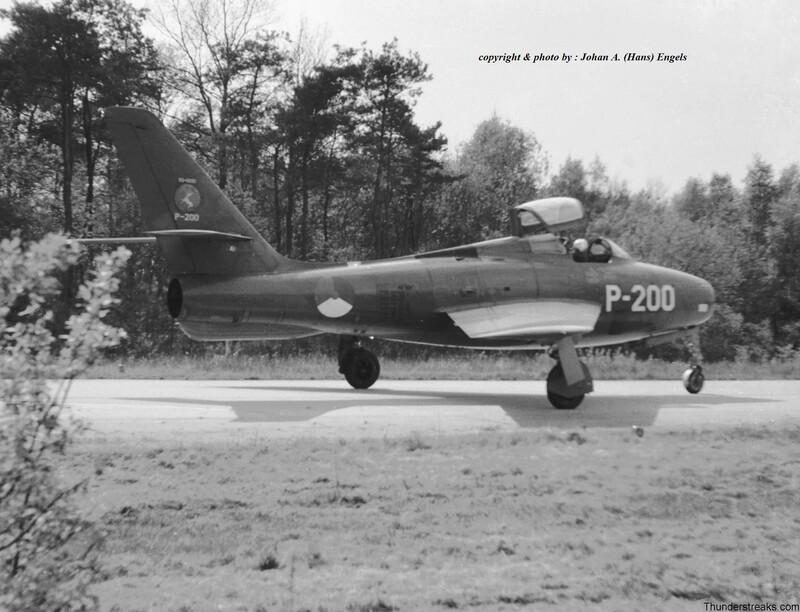 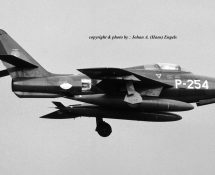 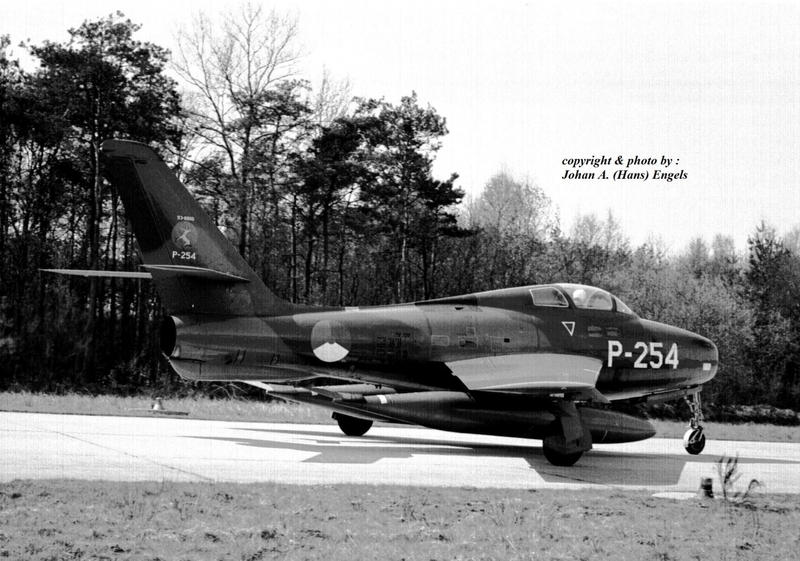 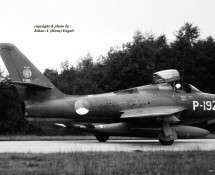 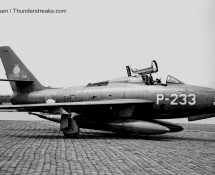 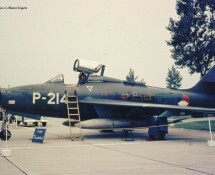 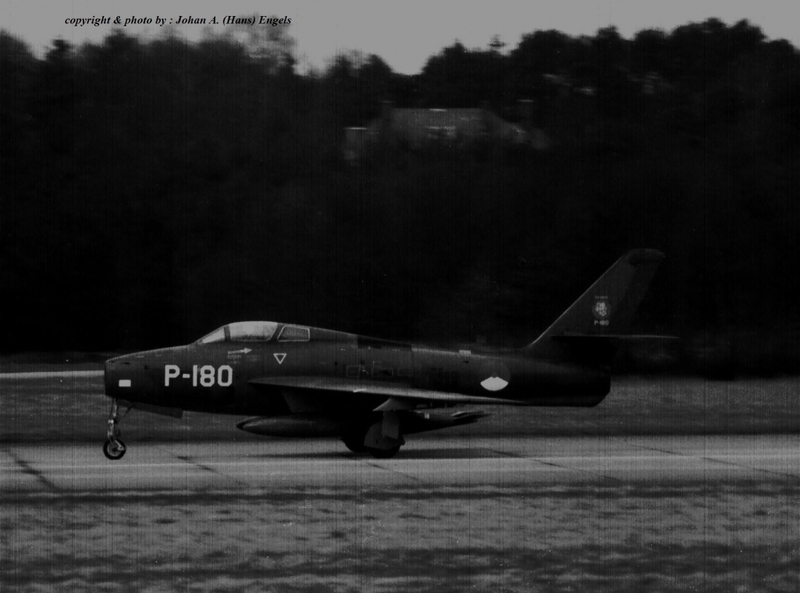 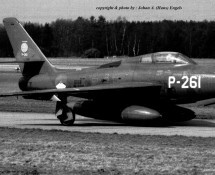 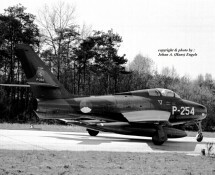 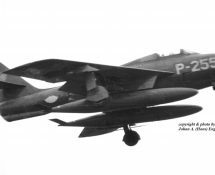 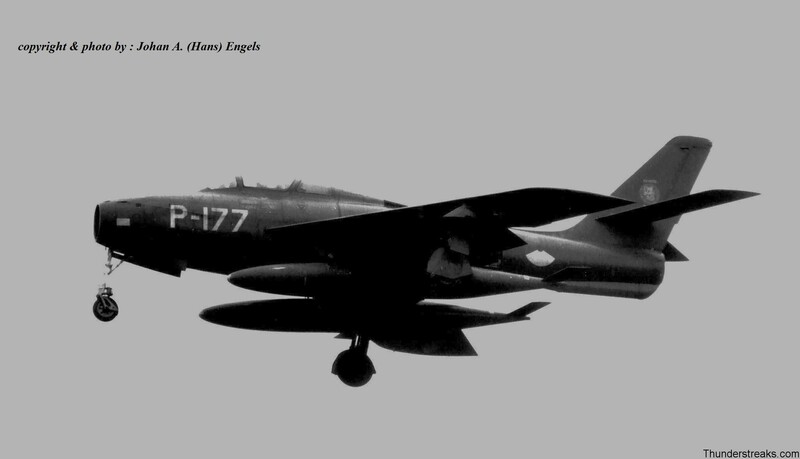 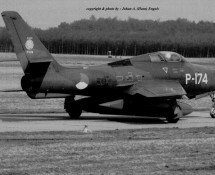 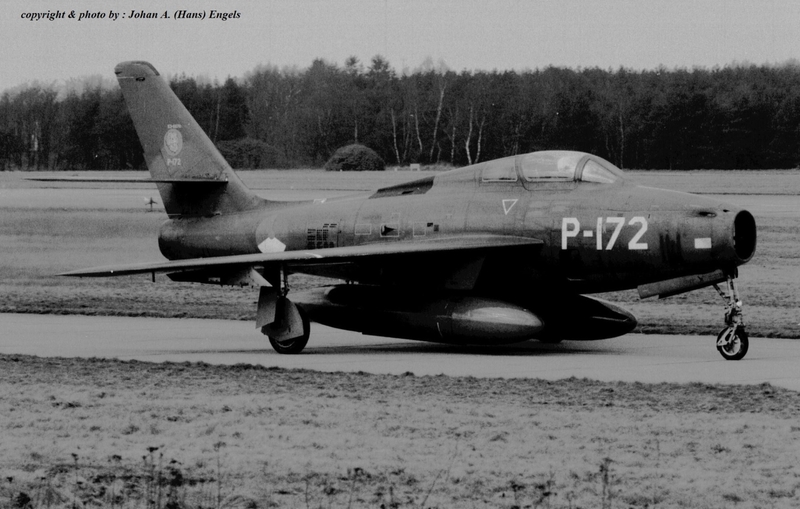 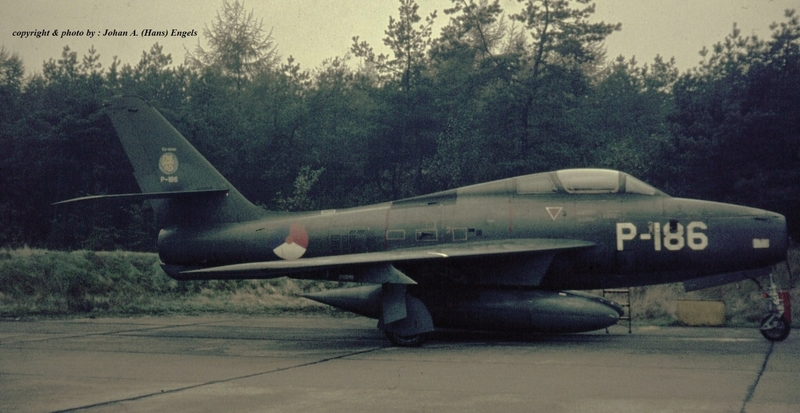 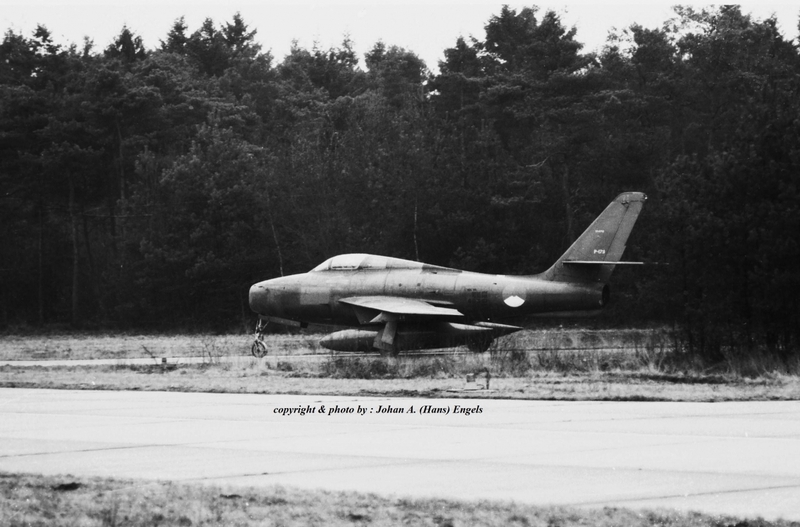 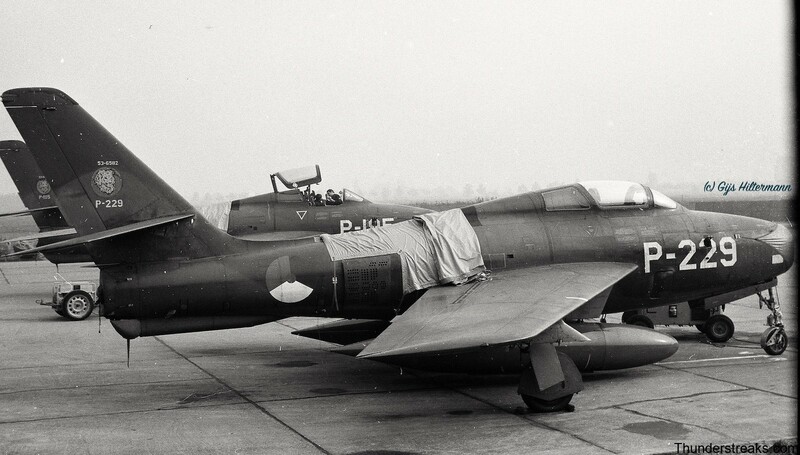 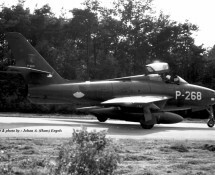 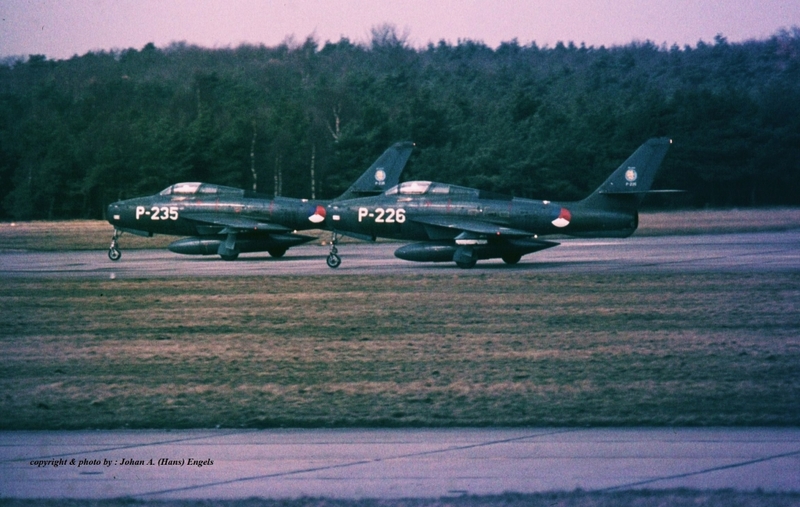 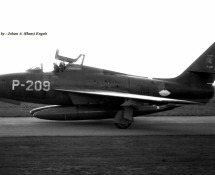 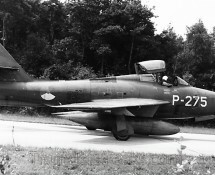 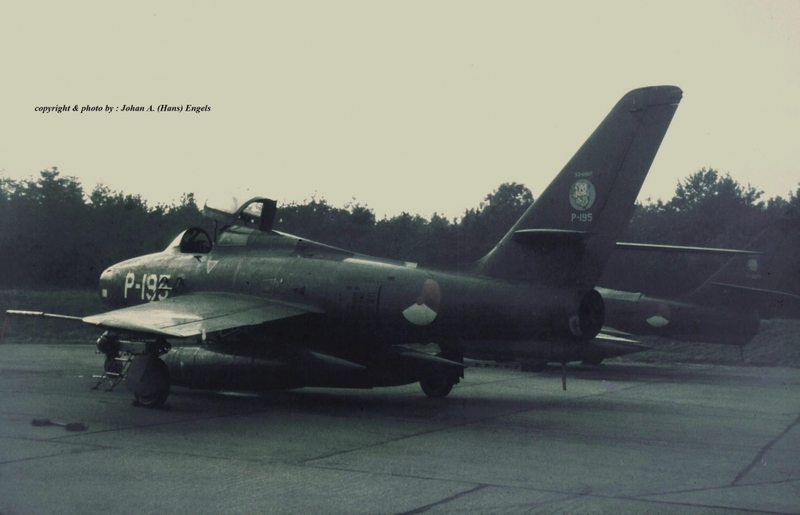 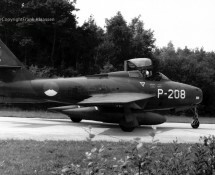 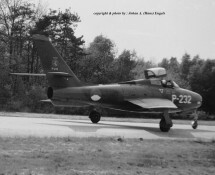 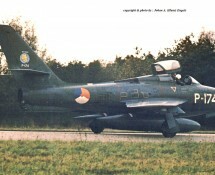 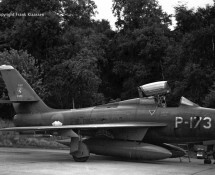 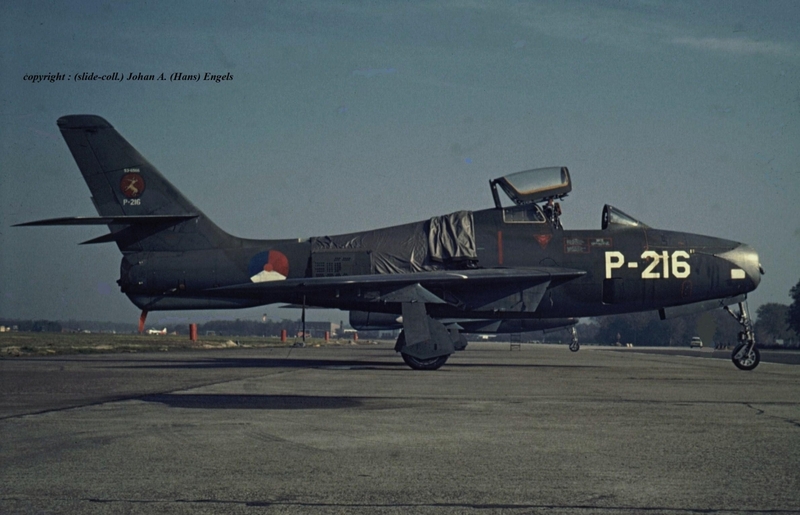 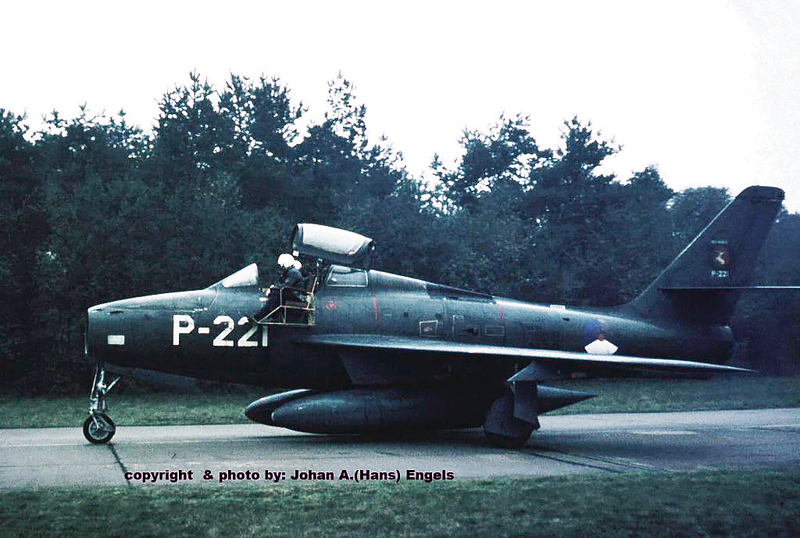 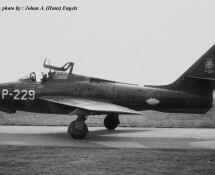 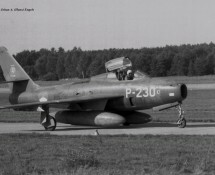 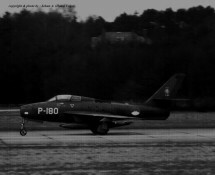 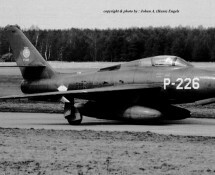 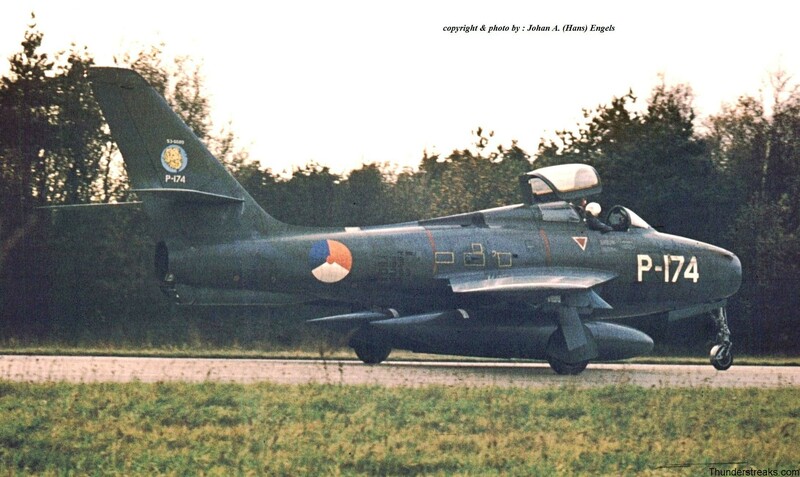 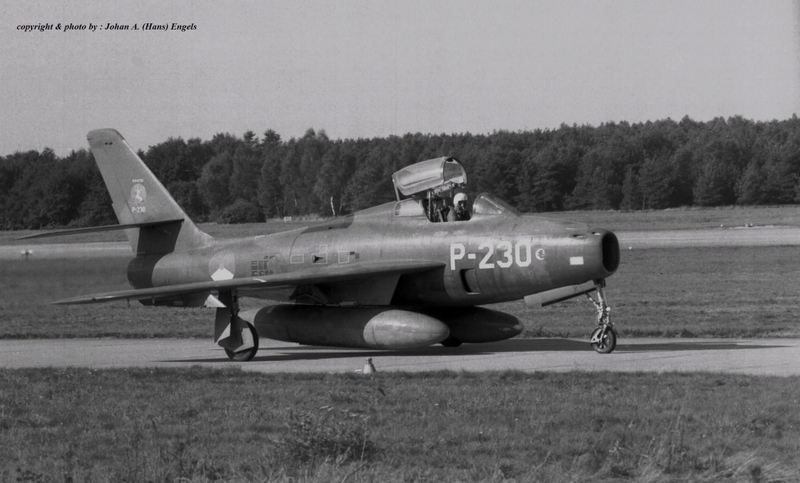 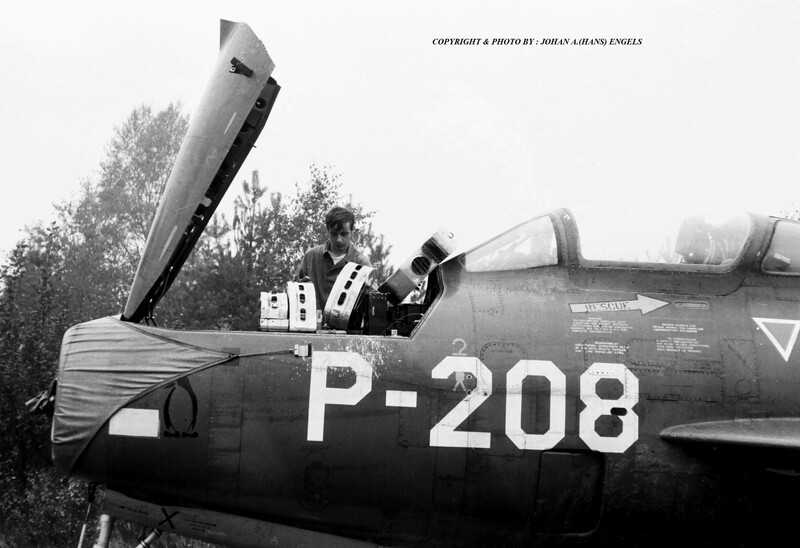 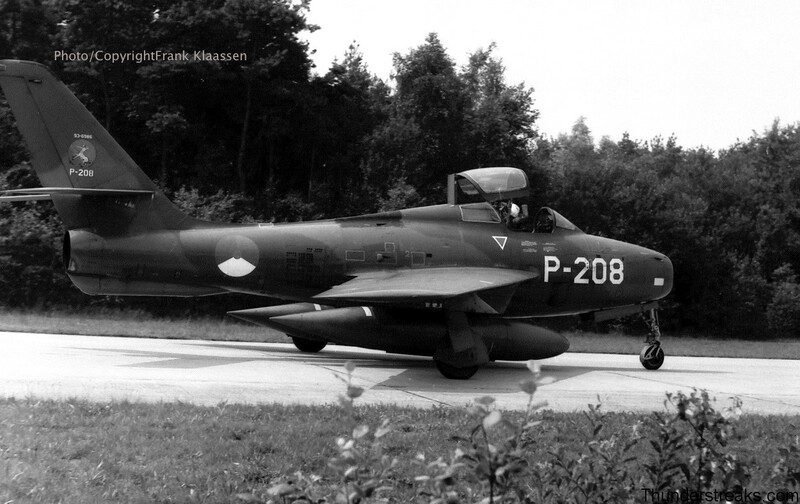 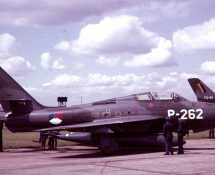 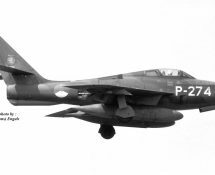 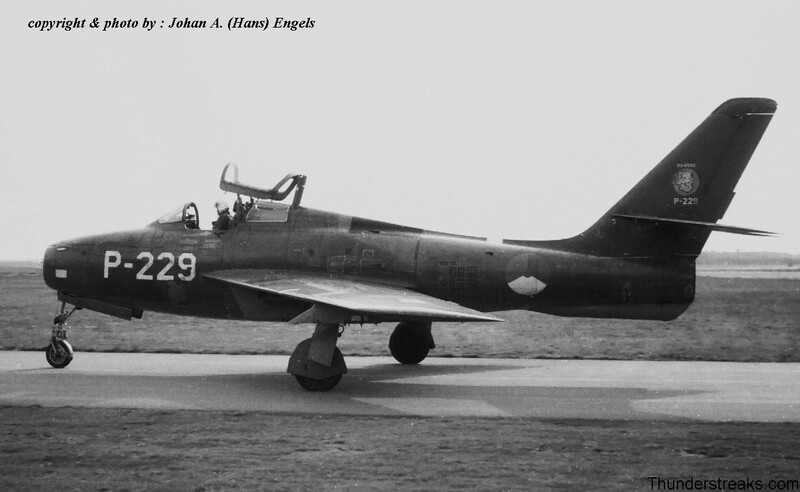 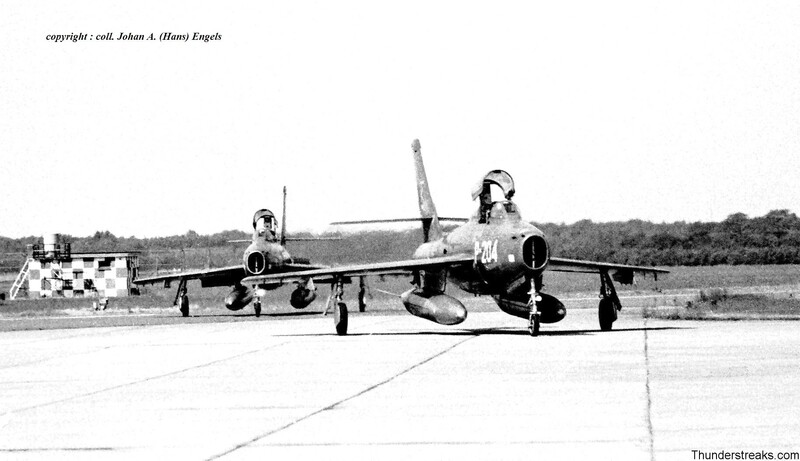 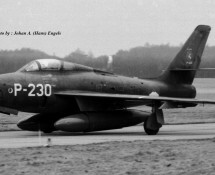 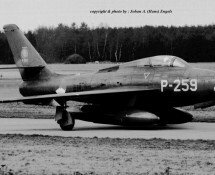 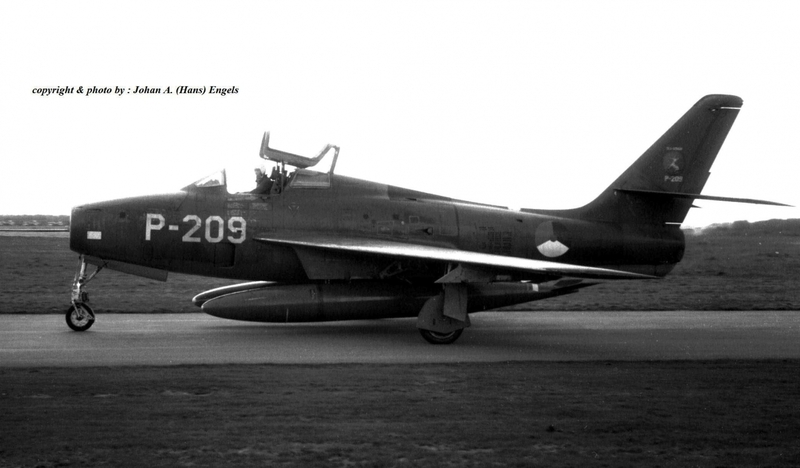 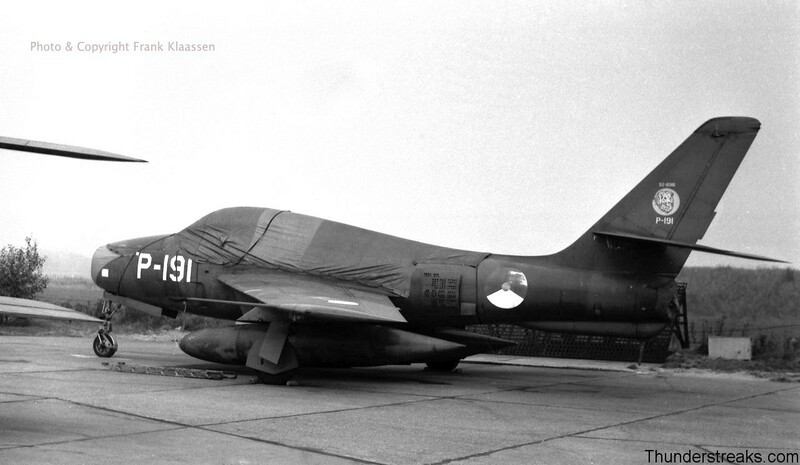 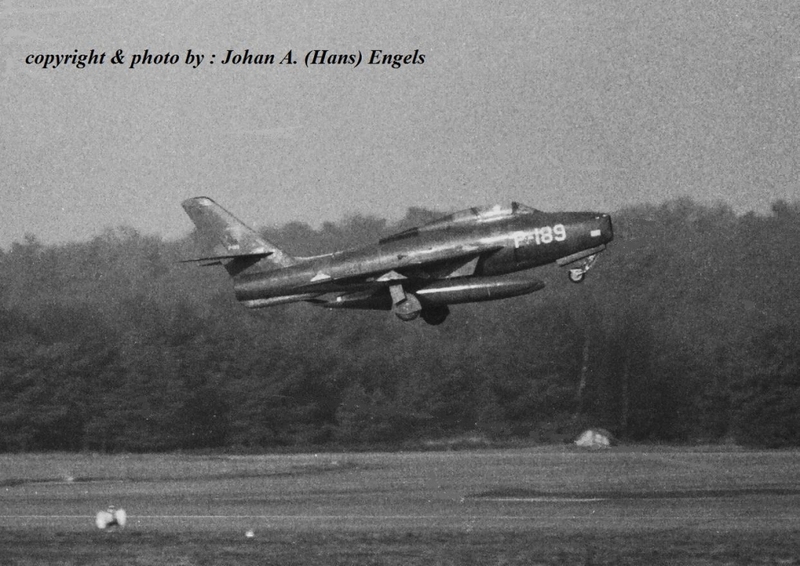 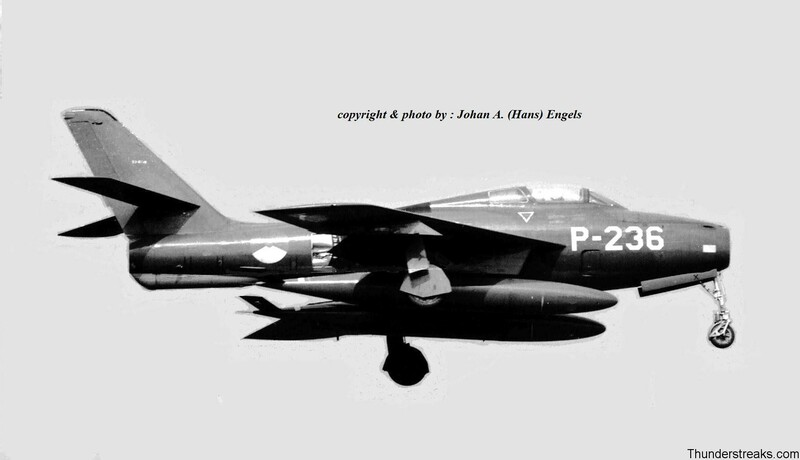 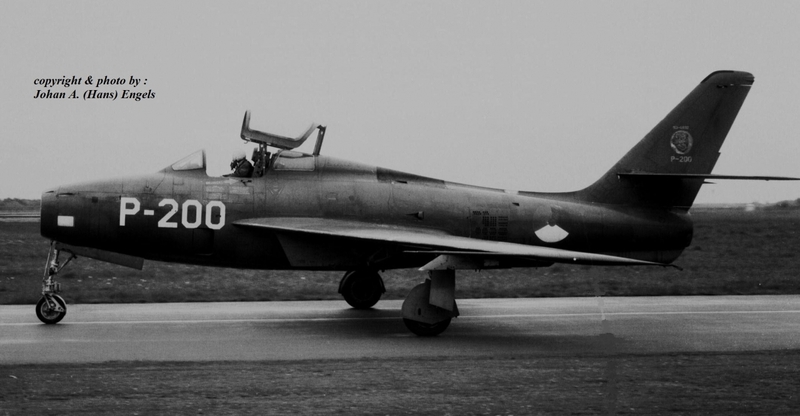 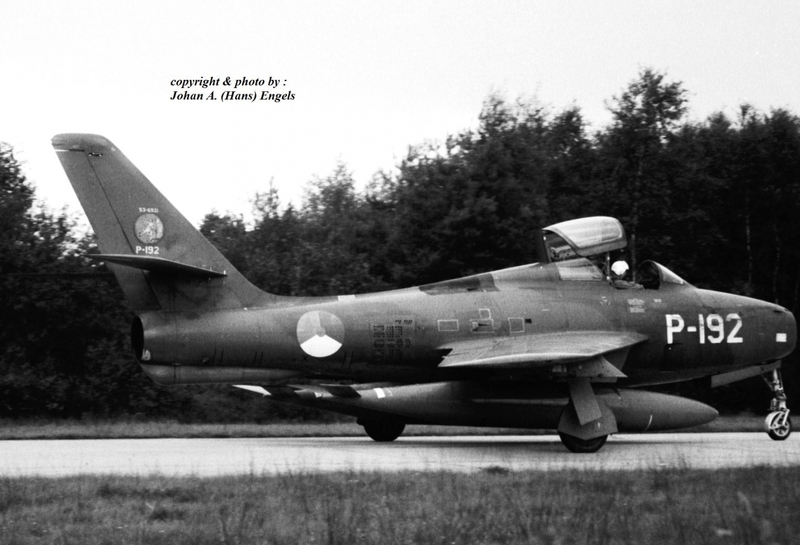 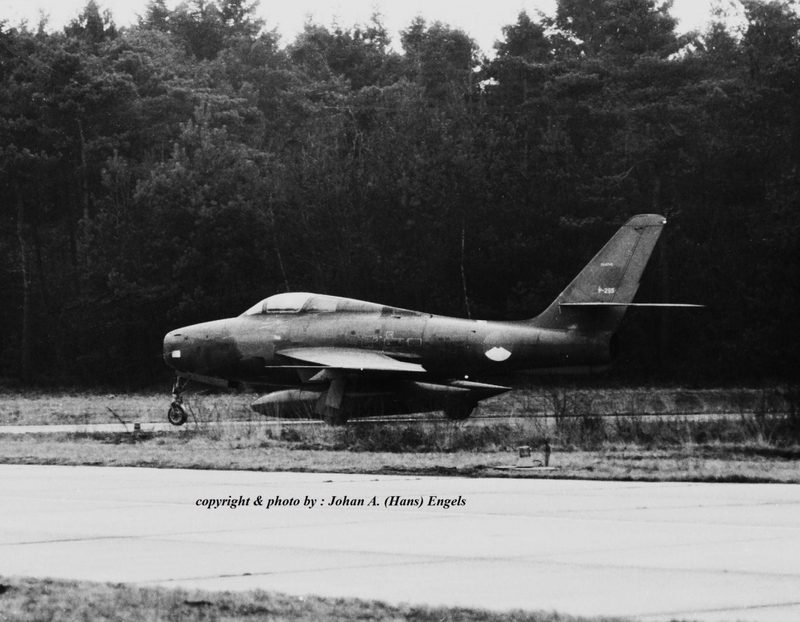 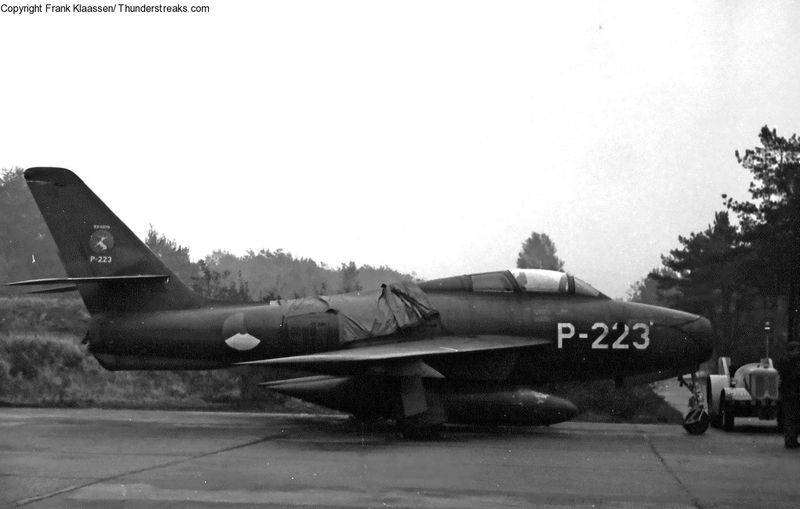 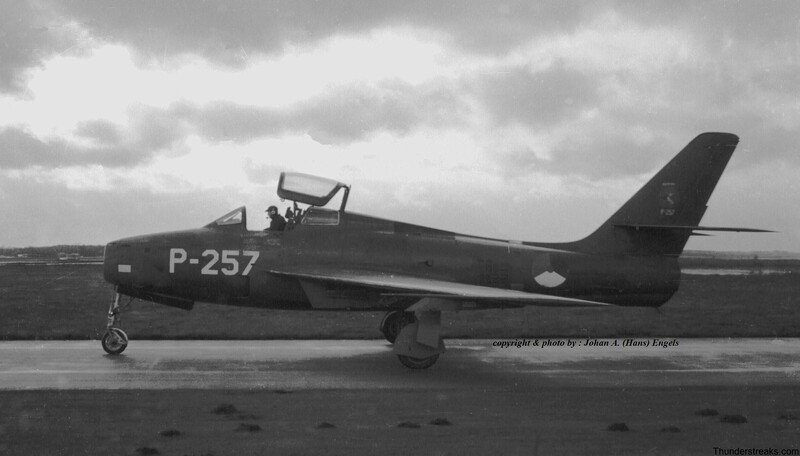 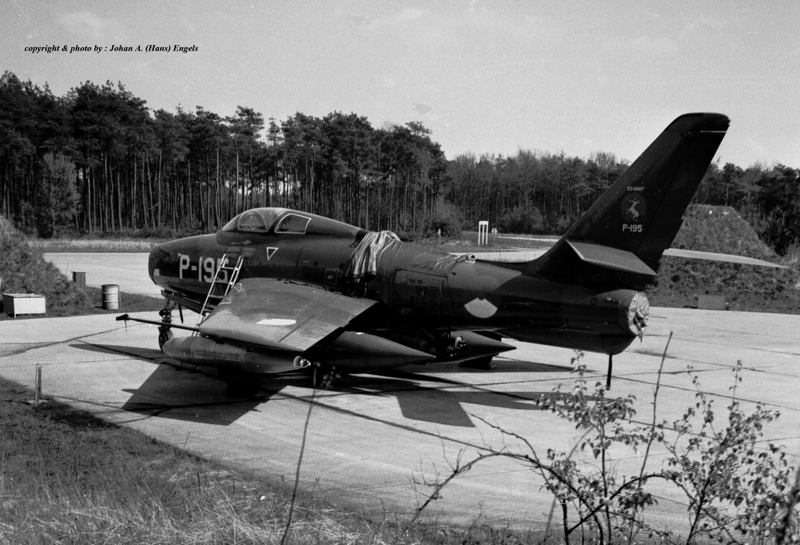 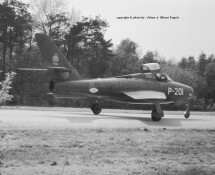 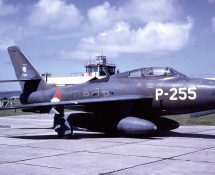 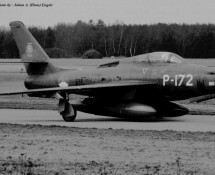 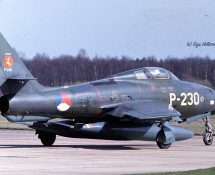 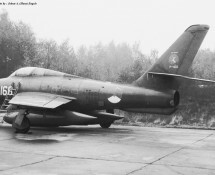 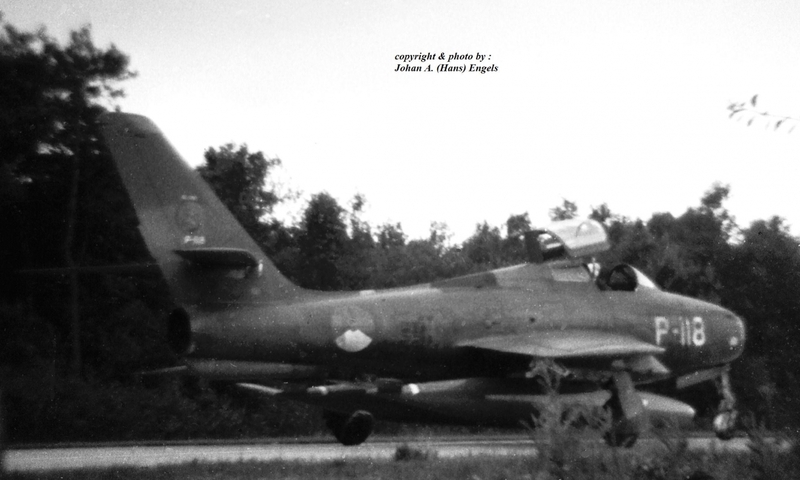 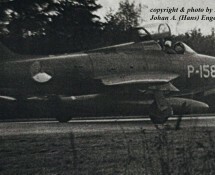 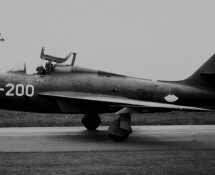 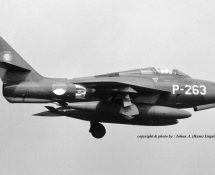 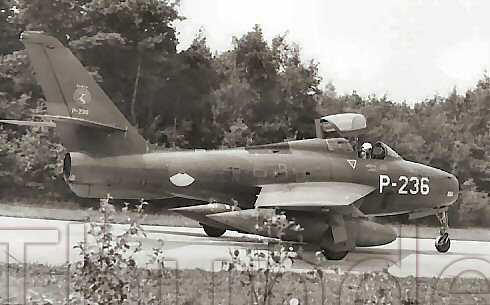 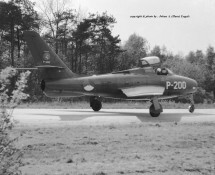 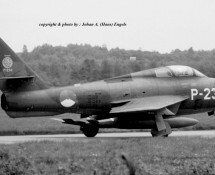 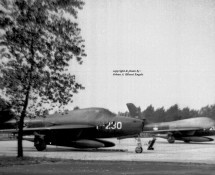 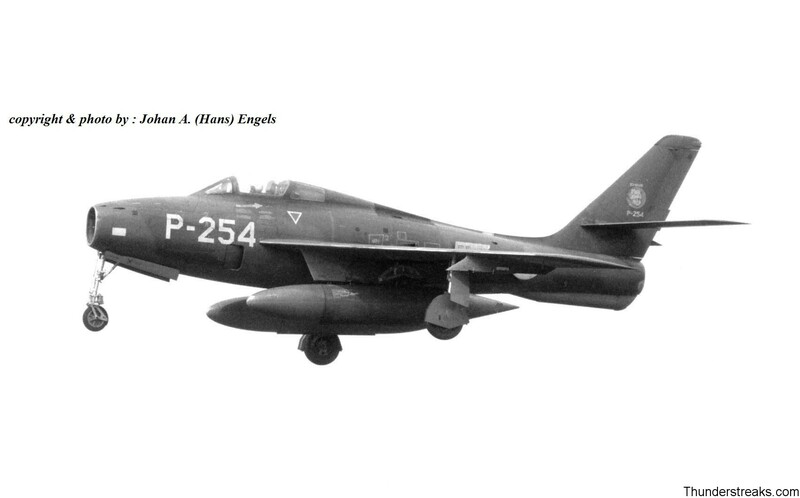 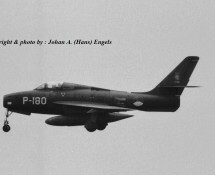 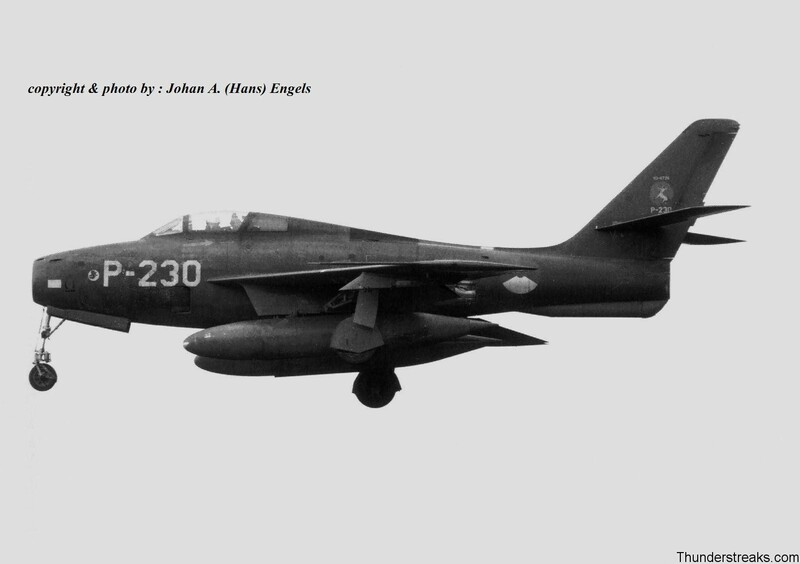 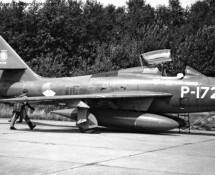 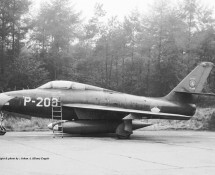 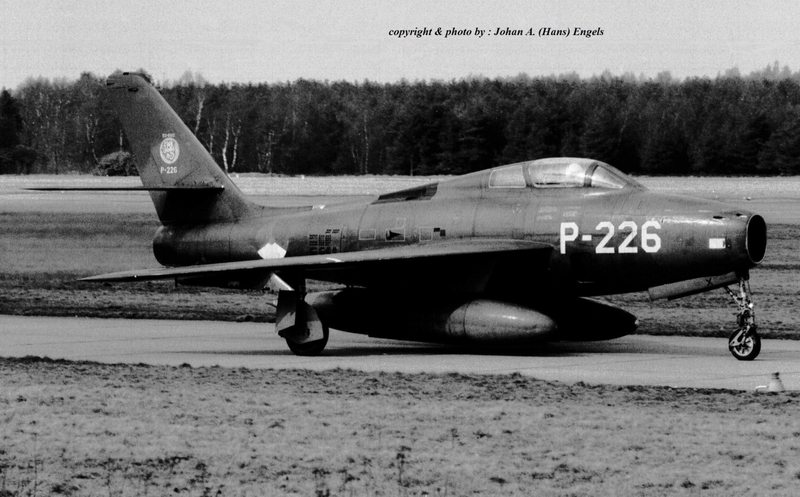 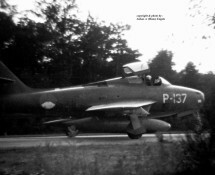 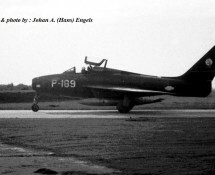 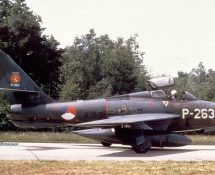 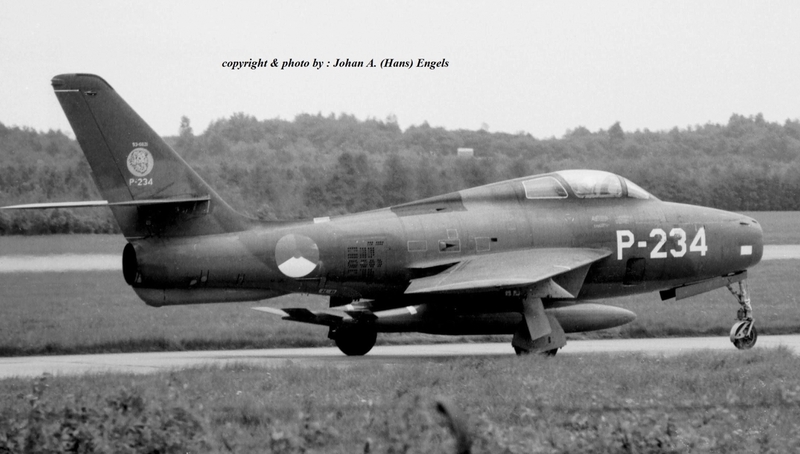 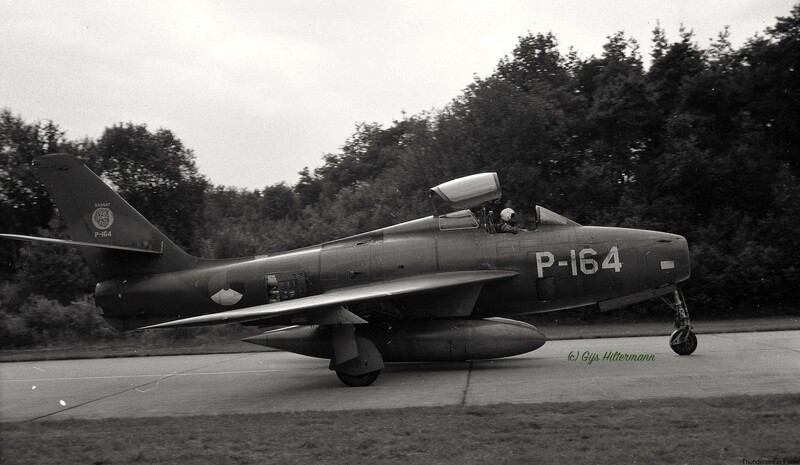 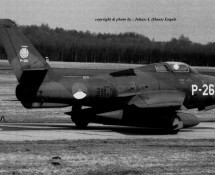 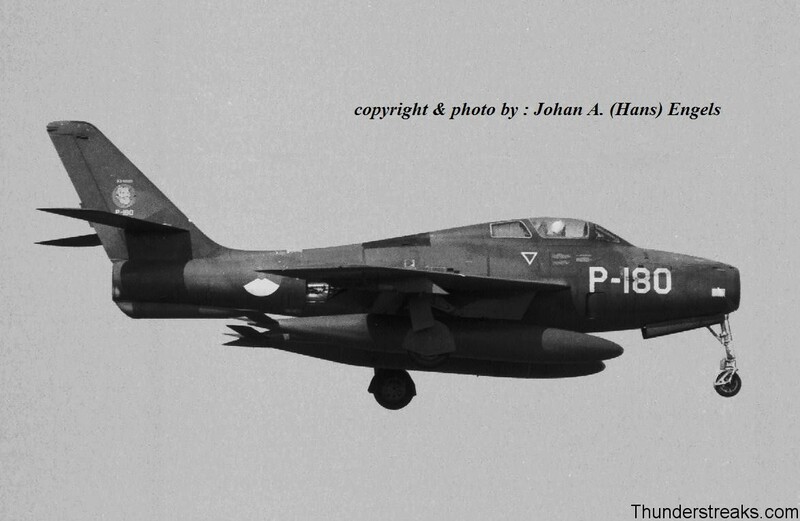 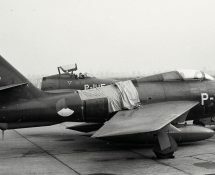 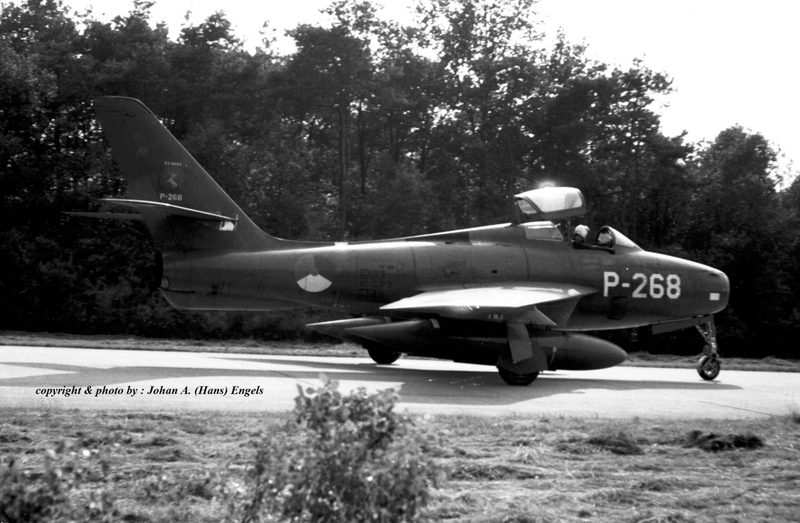 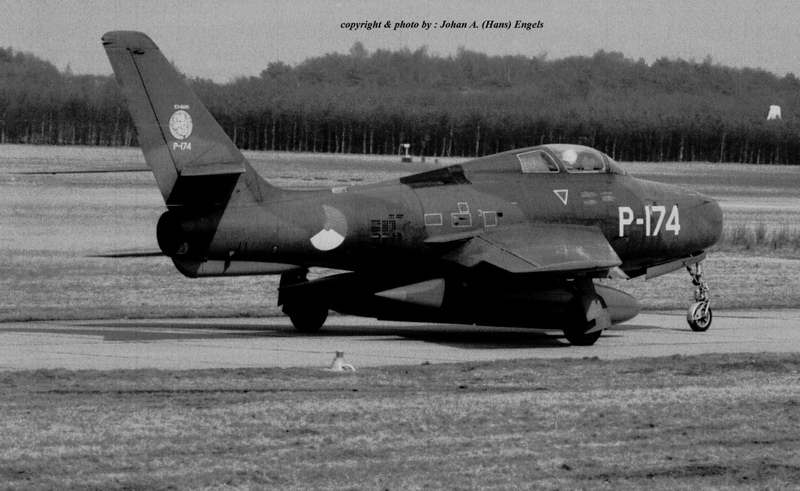 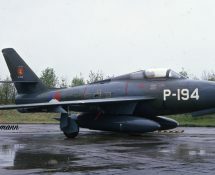 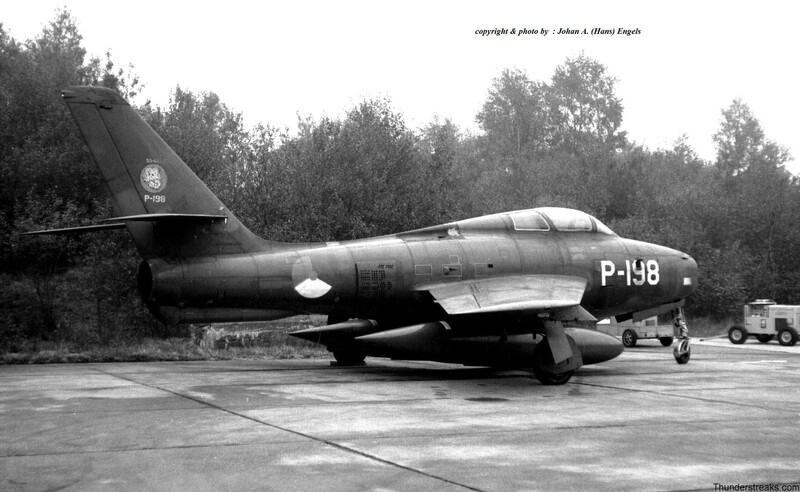 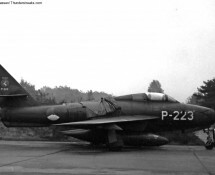 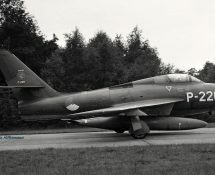 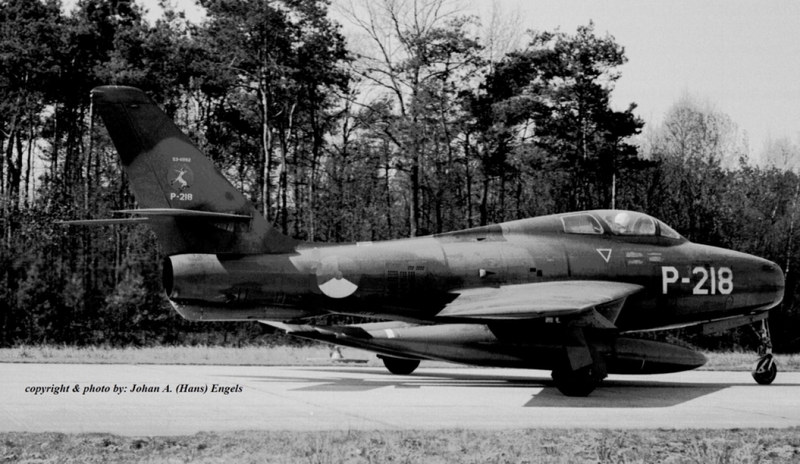 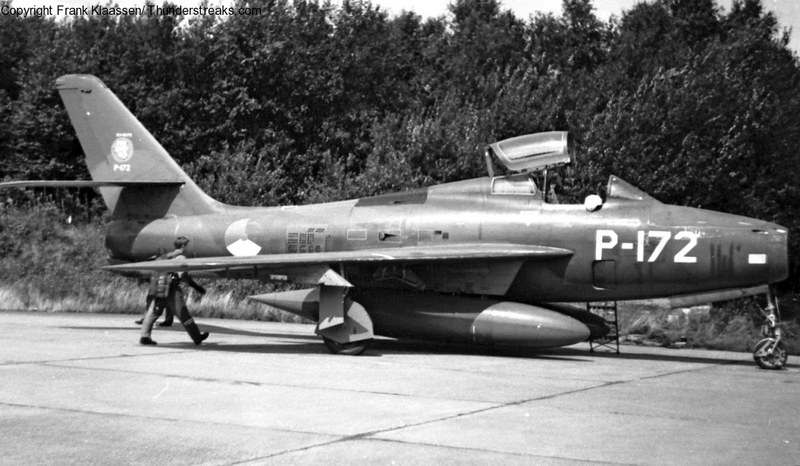 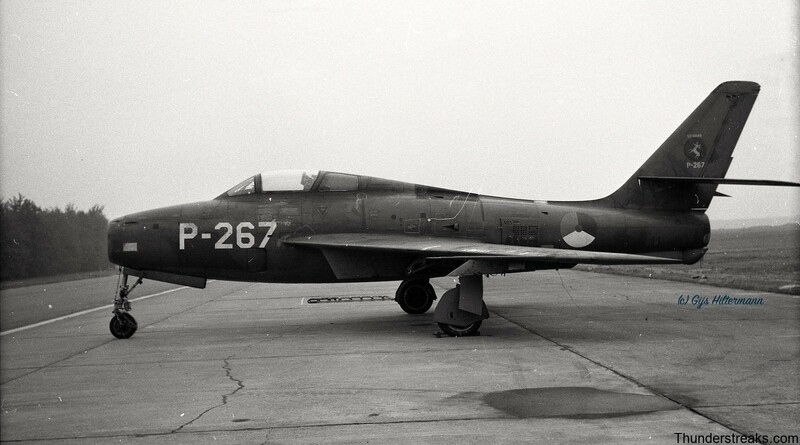 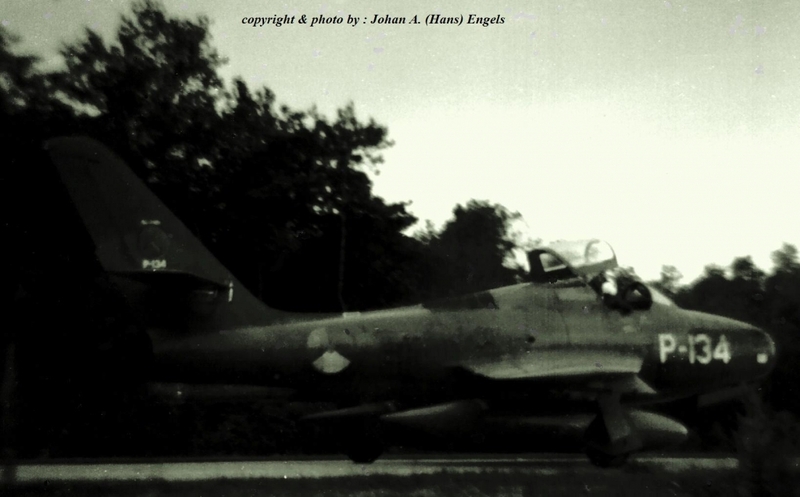 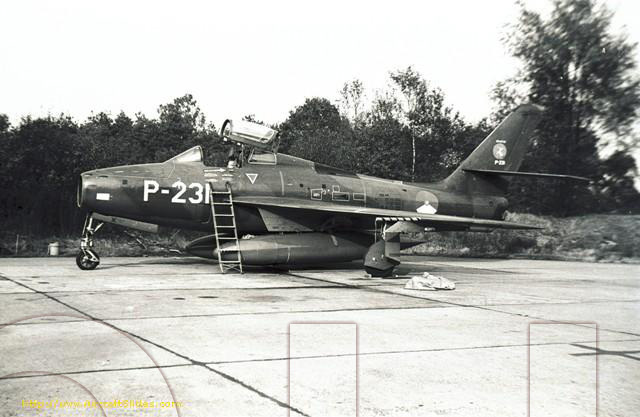 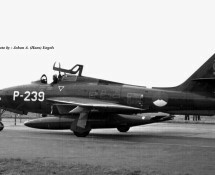 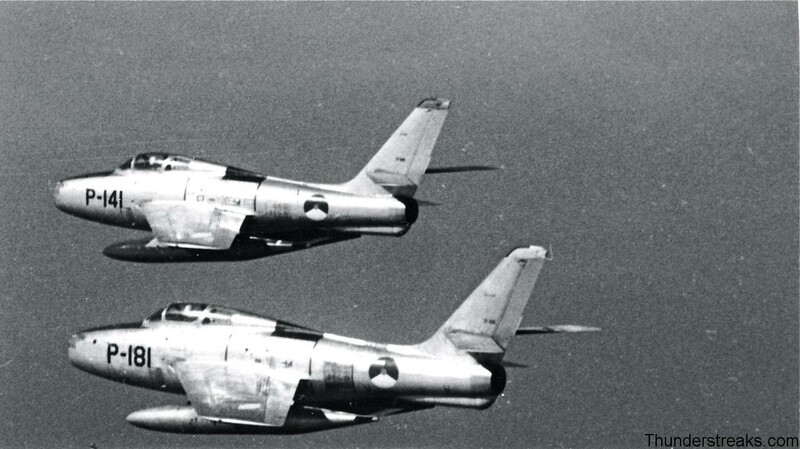 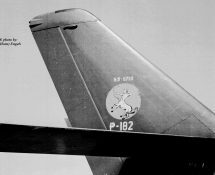 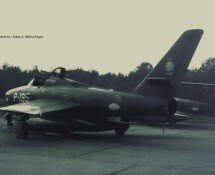 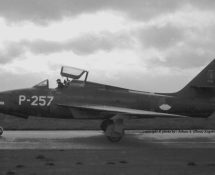 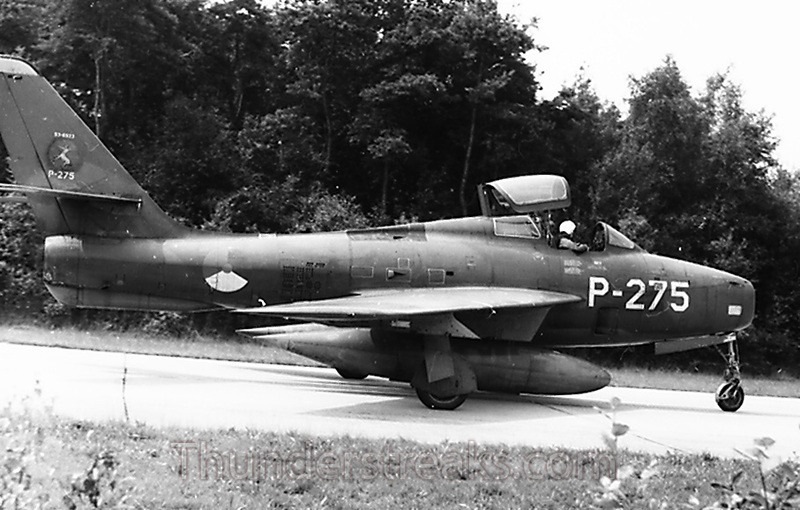 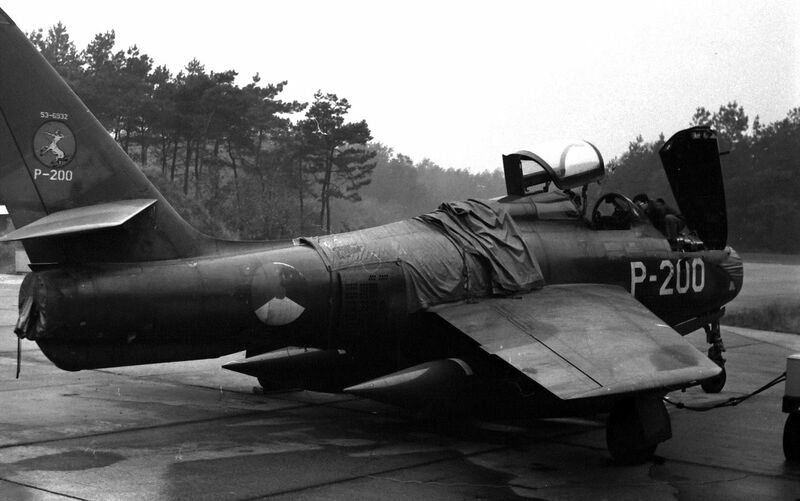 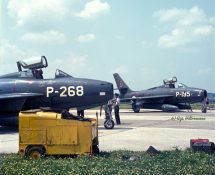 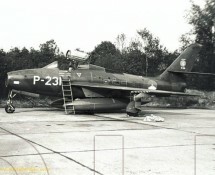 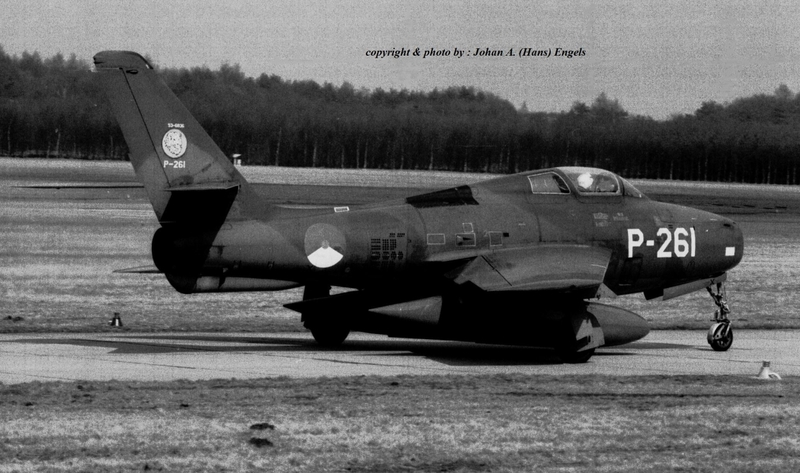 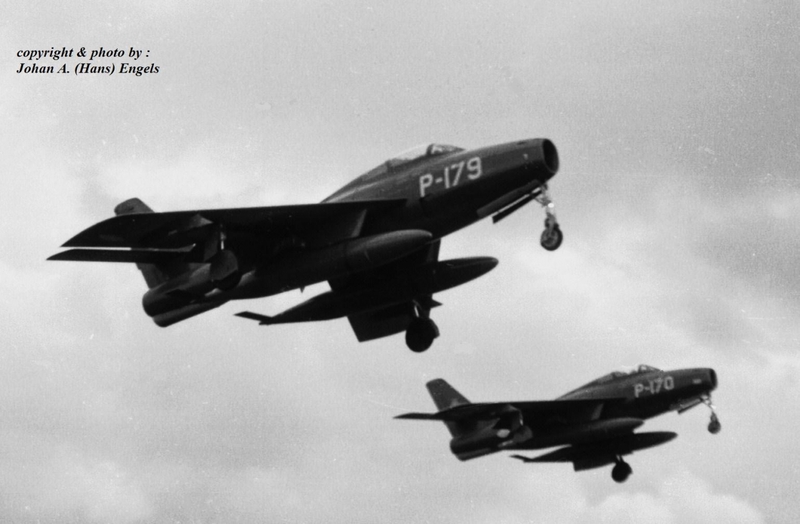 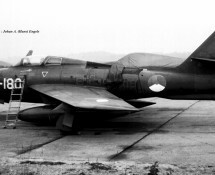 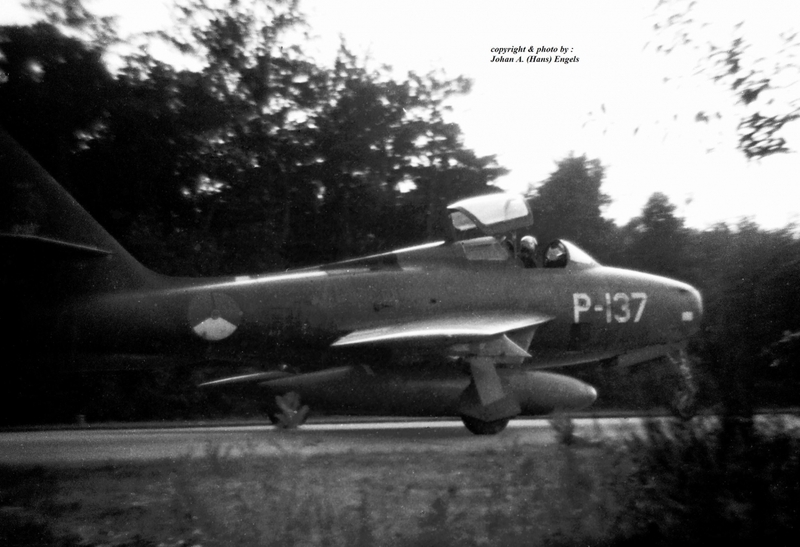 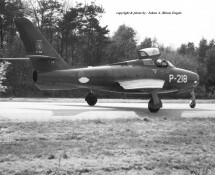 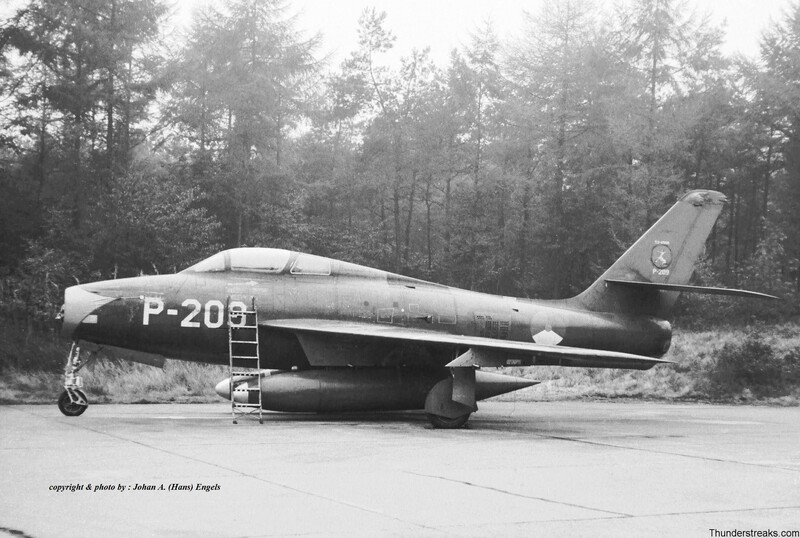 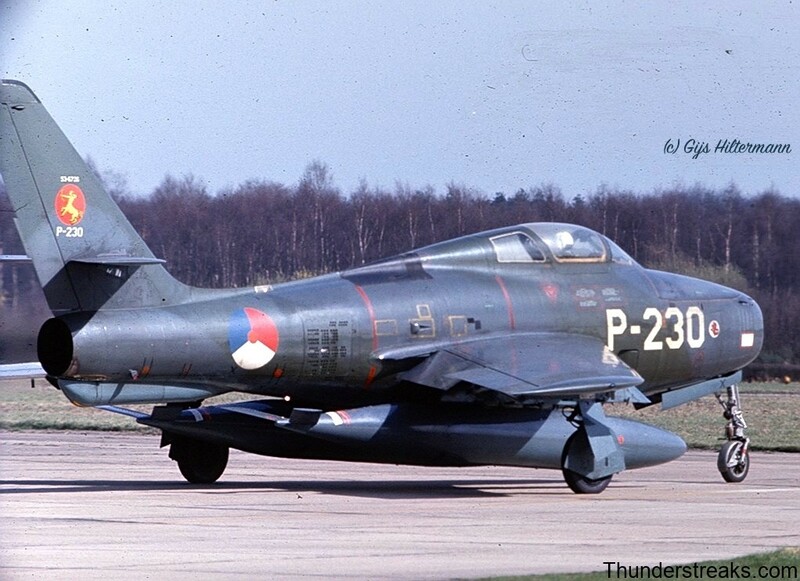 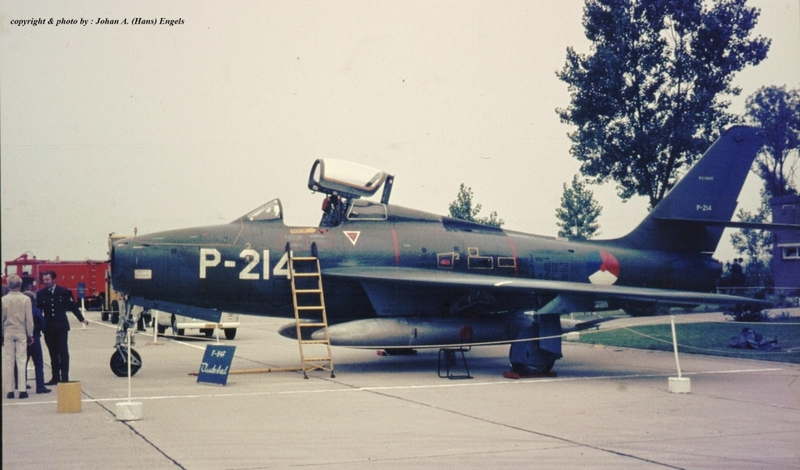 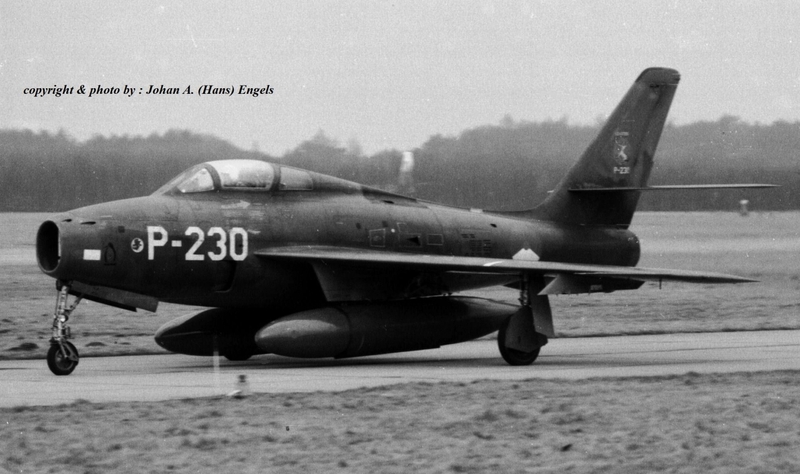 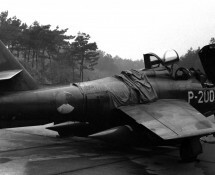 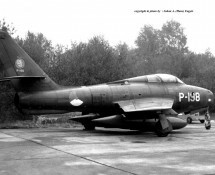 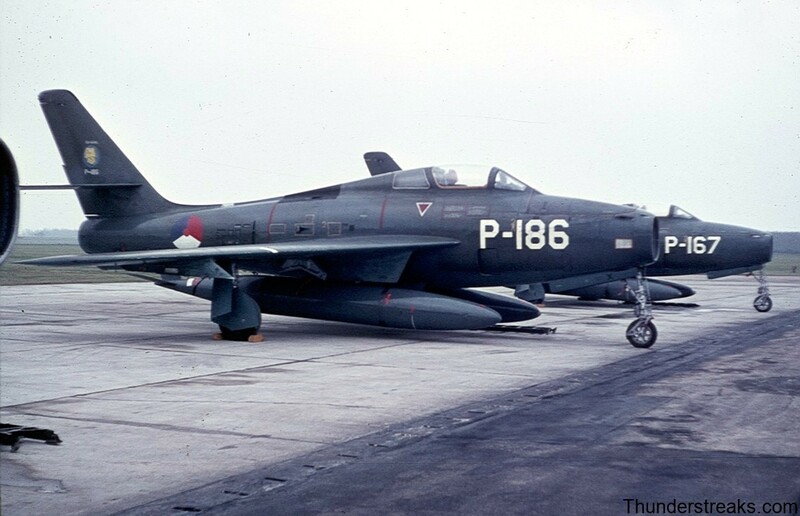 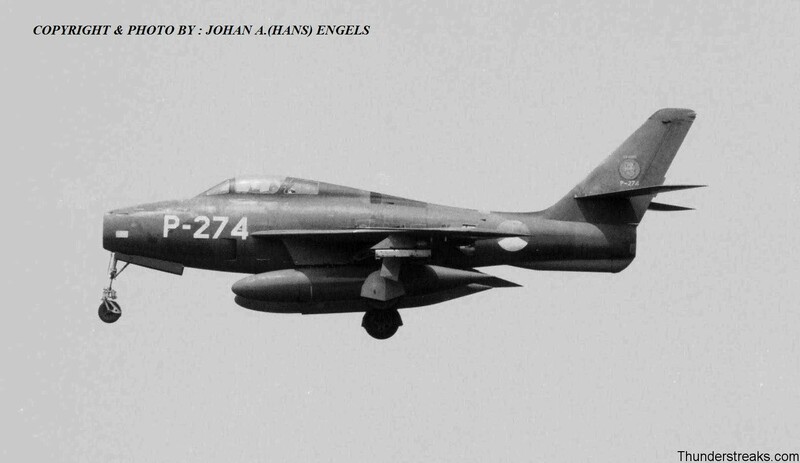 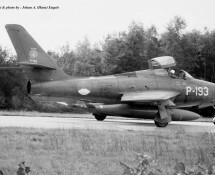 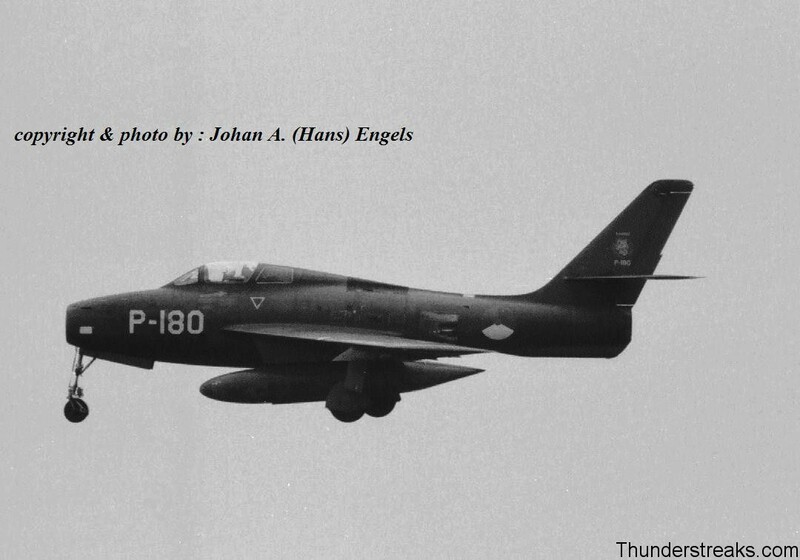 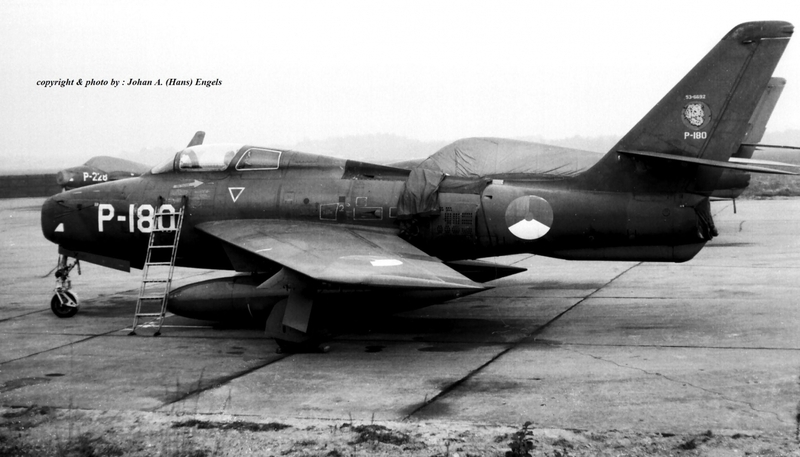 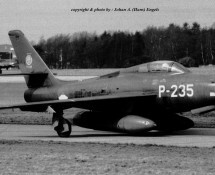 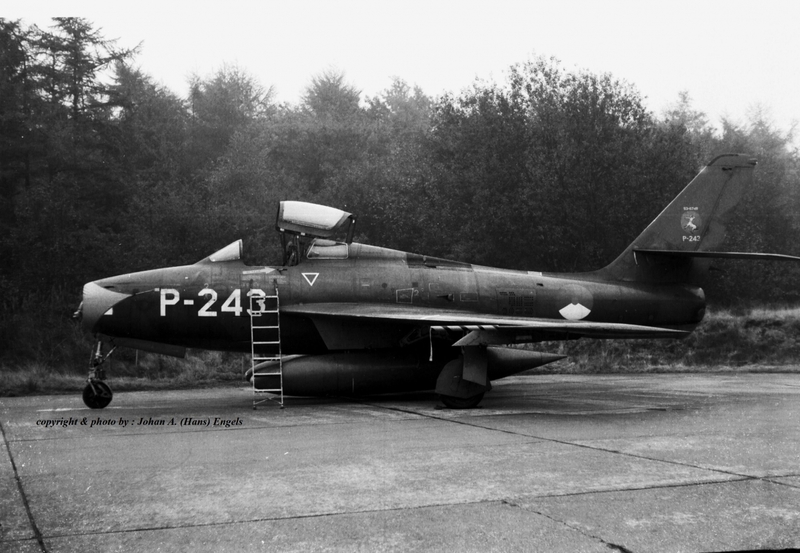 In the mid fifties the KLu (Koninklijke Luchtmacht) acquired 180 Republic F-84F Thunderstreaks, registered P-101 to P-277 and P-298 to P-300. 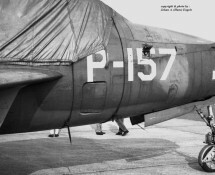 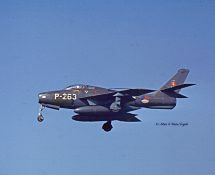 The majority of the Streaks depicted in this album are selected out of the range P-157 to P-300, being the last of the type in operational service, flying with both 314 and 315 squadrons from Eindhoven AB. 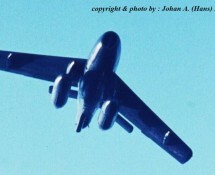 The Streak entered service in 1955 and the last ones were phased out in 1970. 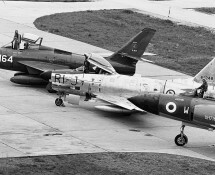 Last departures to other air forces (see below) took place in 1971. 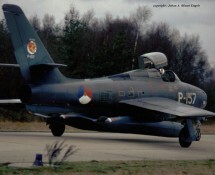 Most pictures in this gallery were made by Hans, Frank or Gijs (no “borrowing” from other websites !) 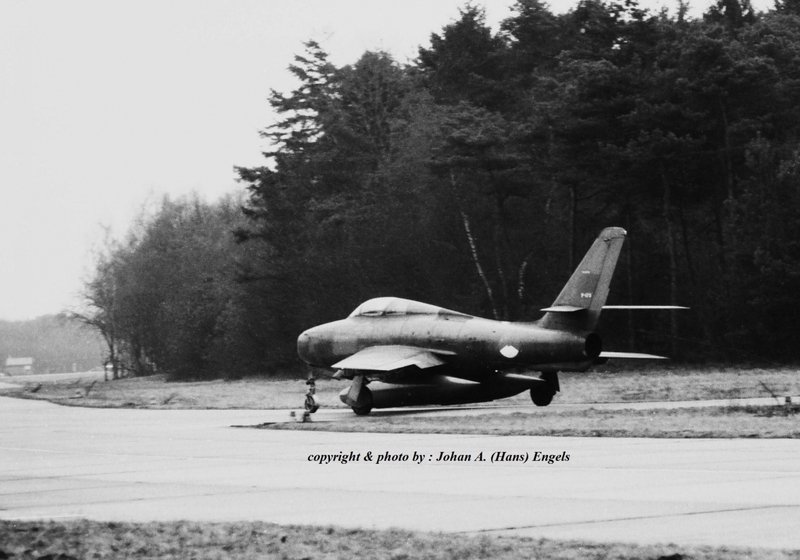 during the mid- and late sixties. 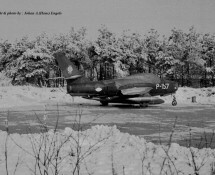 Especially the ones taken near landing-lights and alongside taxy-tracks were made under difficult circumstances ! 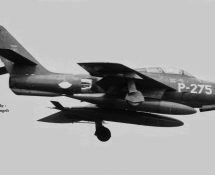 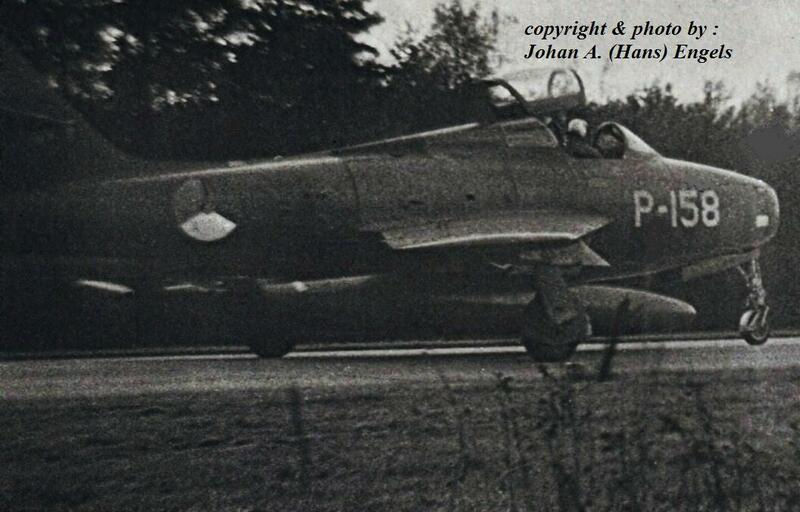 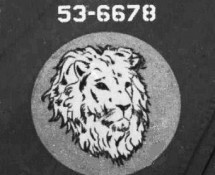 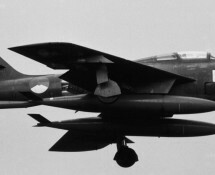 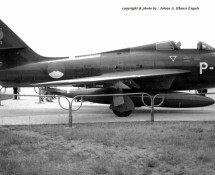 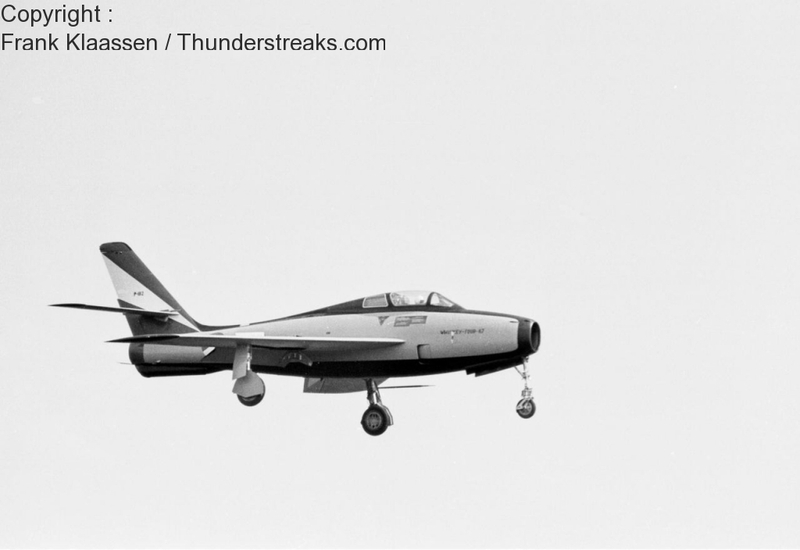 Service history: The first Thunderstreak entered K.Lu.-service with 311 squadron at Volkel; as such the type replaced the F-84G Thunderjet. 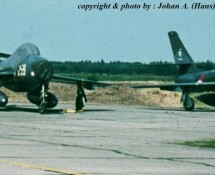 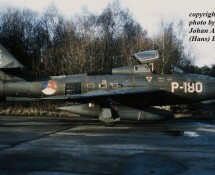 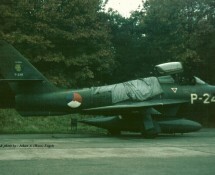 Subsequently 312, 313, 314, 315 and 316 squadron re-equipped, based at both Volkel and Eindhoven air bases. 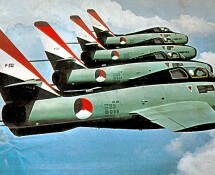 In the early days the Streaks were finished in metal colours. 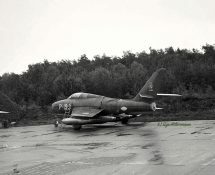 At first the P-regs. 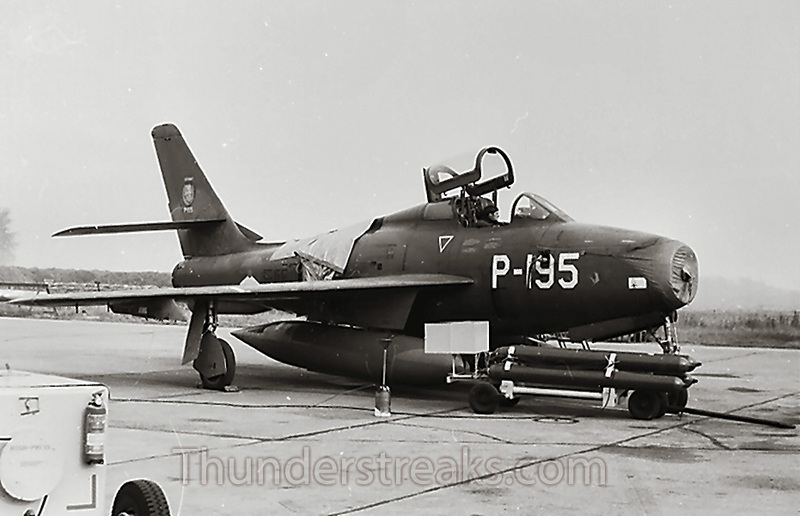 were only applied in small digits on the tail and they wore a specific code on the nose, indicating their respective squadrons ; pictures of Thunderstreaks wearing the squadron-codes are not very common , but you will find some in the gallery. 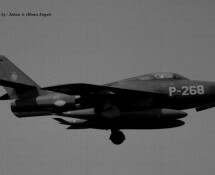 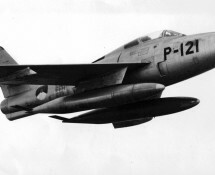 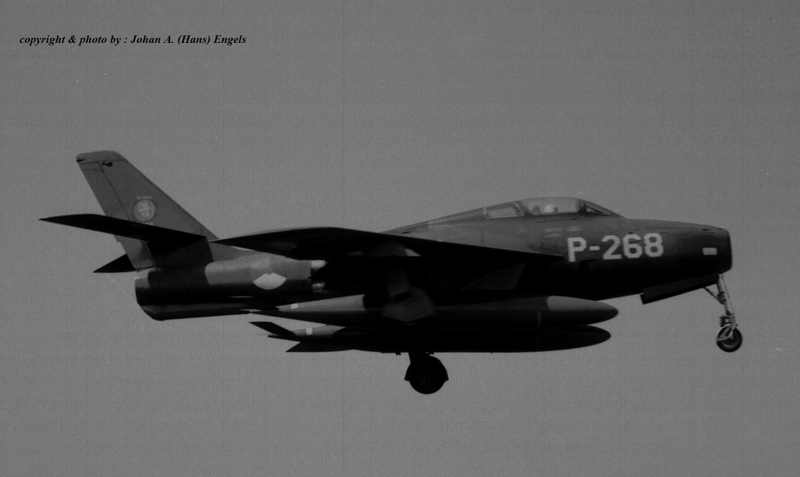 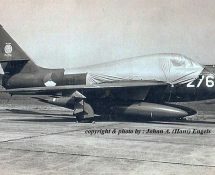 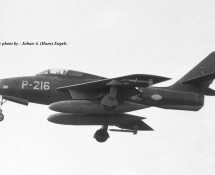 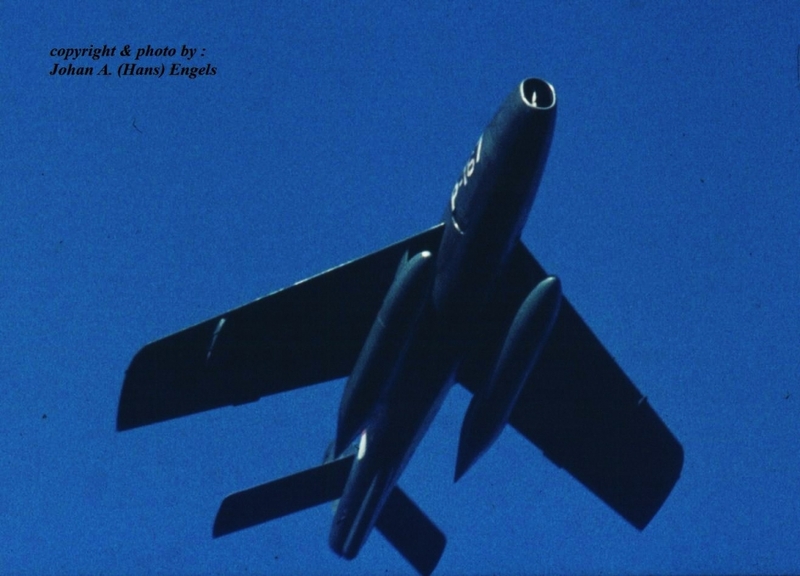 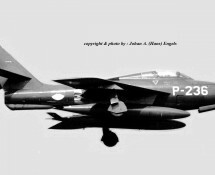 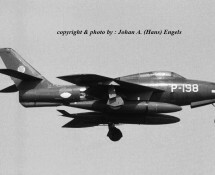 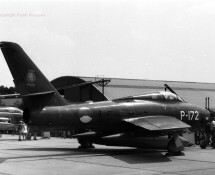 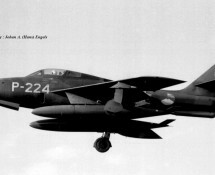 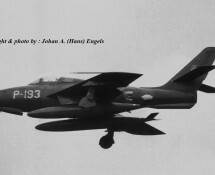 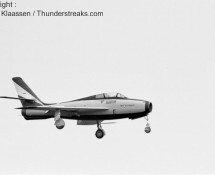 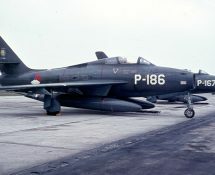 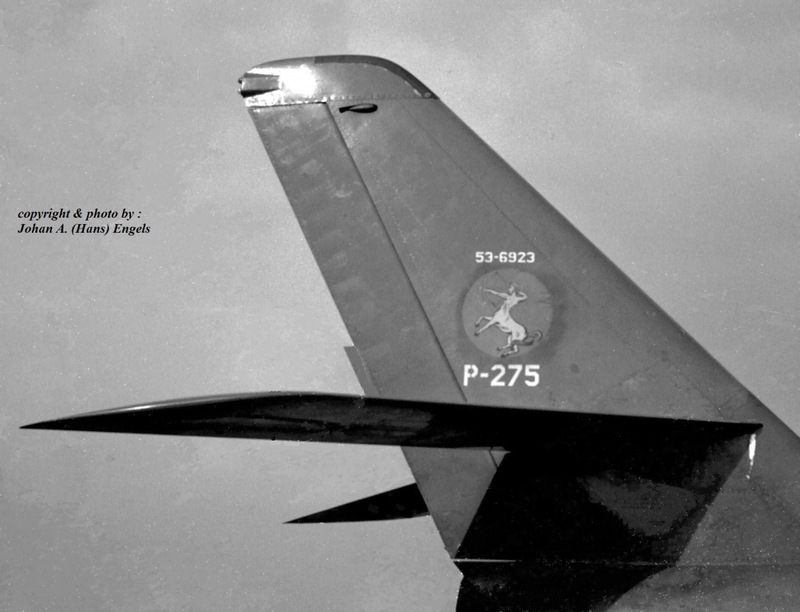 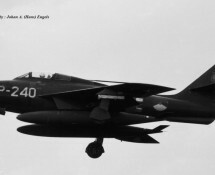 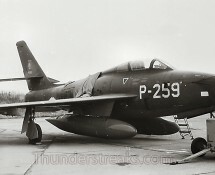 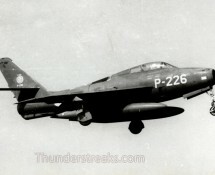 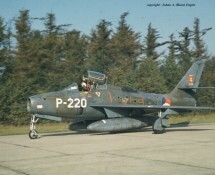 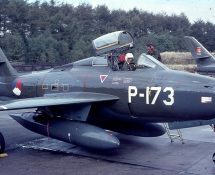 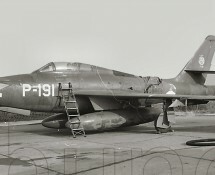 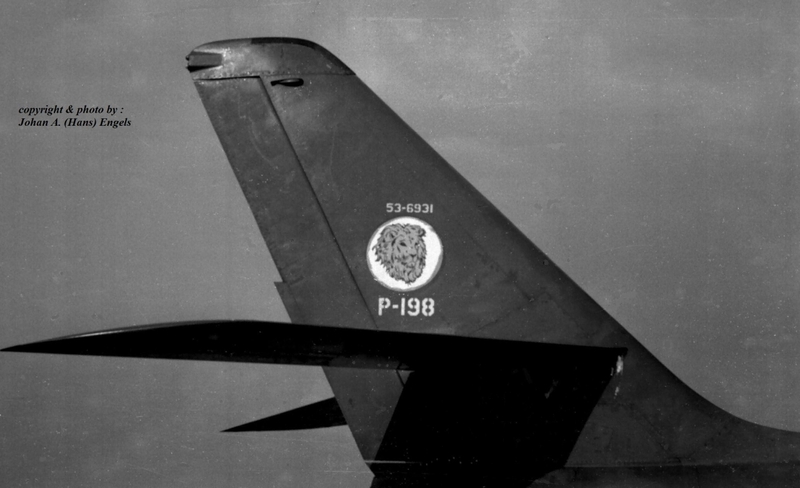 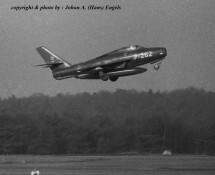 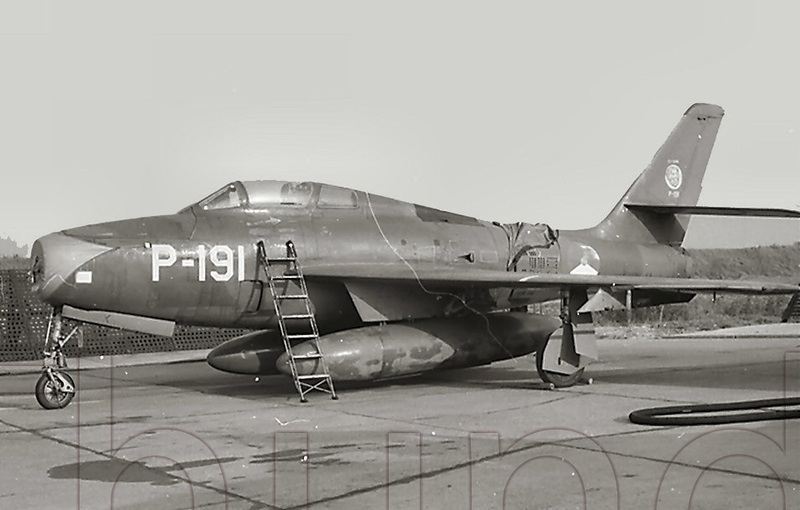 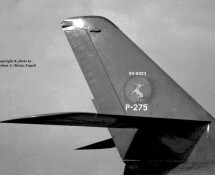 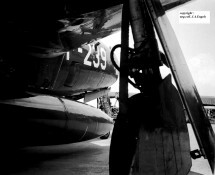 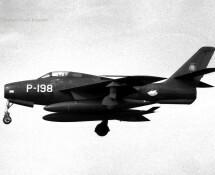 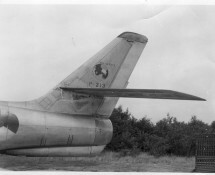 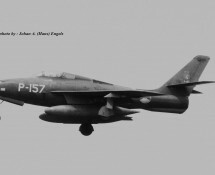 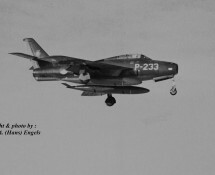 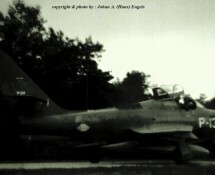 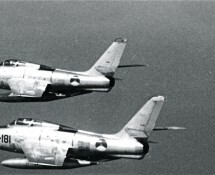 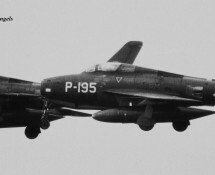 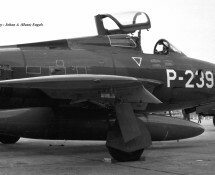 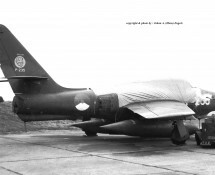 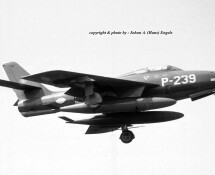 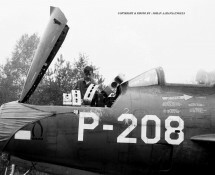 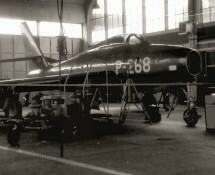 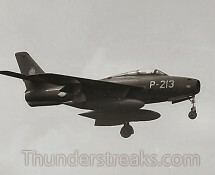 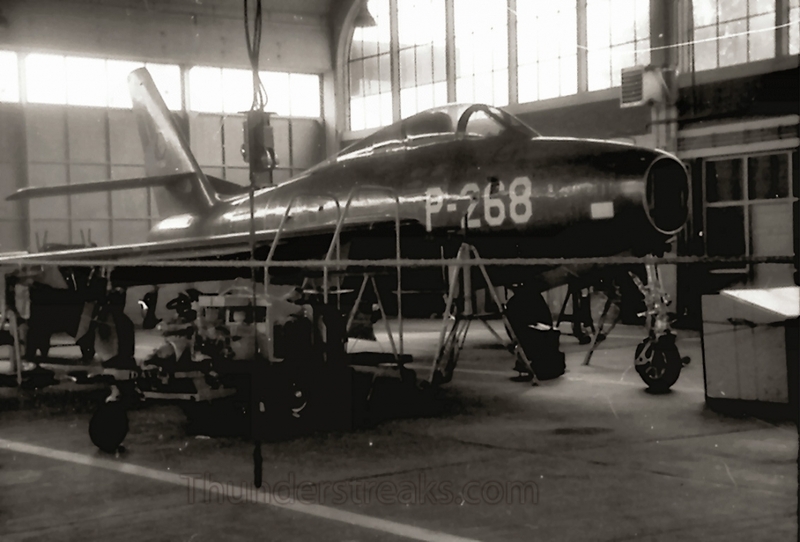 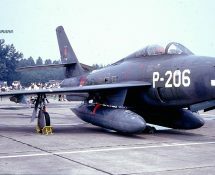 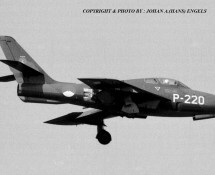 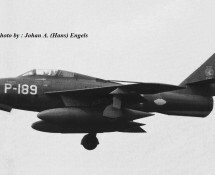 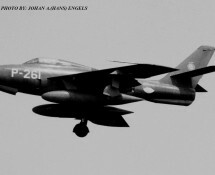 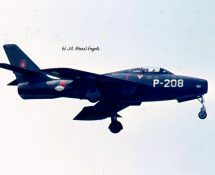 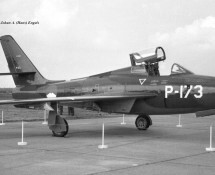 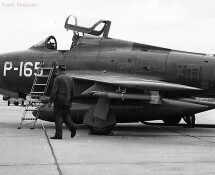 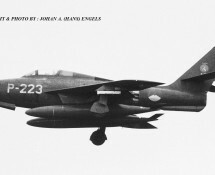 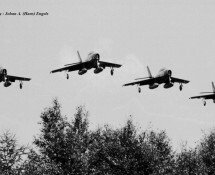 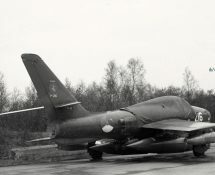 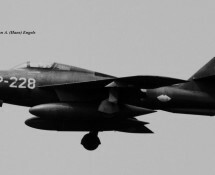 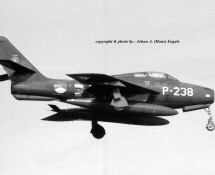 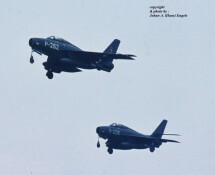 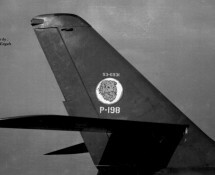 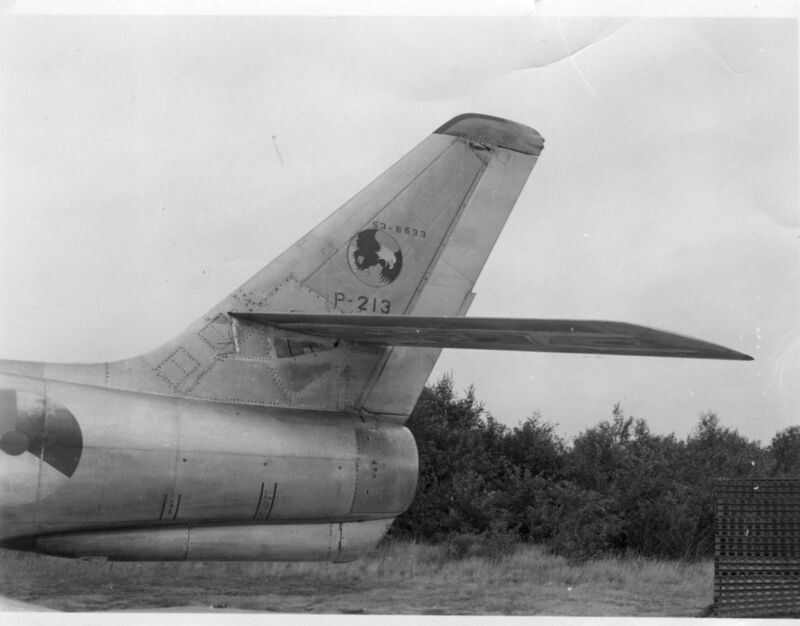 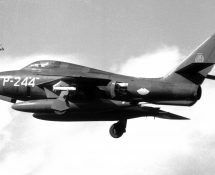 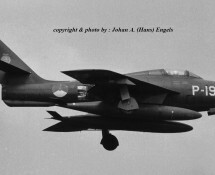 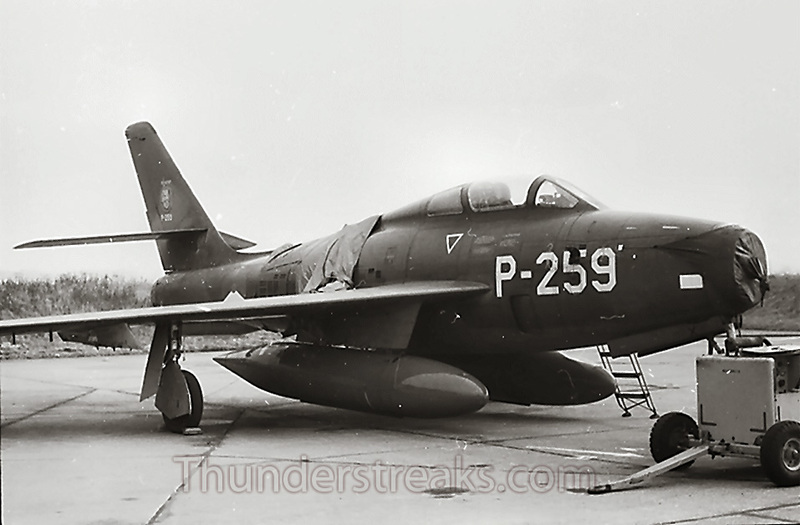 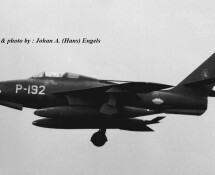 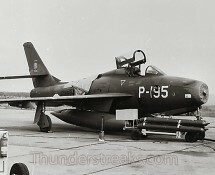 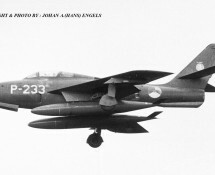 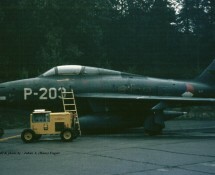 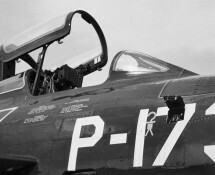 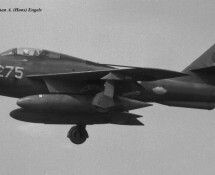 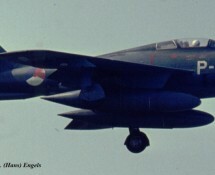 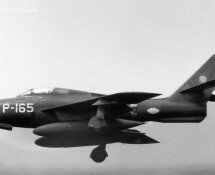 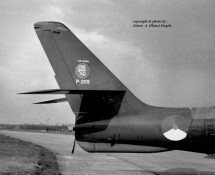 In 1959/60 the P-registration was applied in large digits on the nose-sections of the Thunderstreaks and maintained in small digits on the tail. 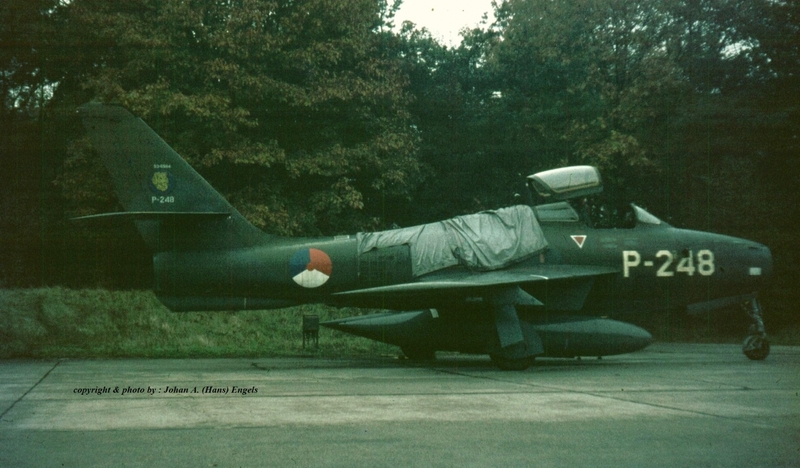 From 1961 to 1964 they were gradually re-painted in dark green/grey-blue camouflage colours. 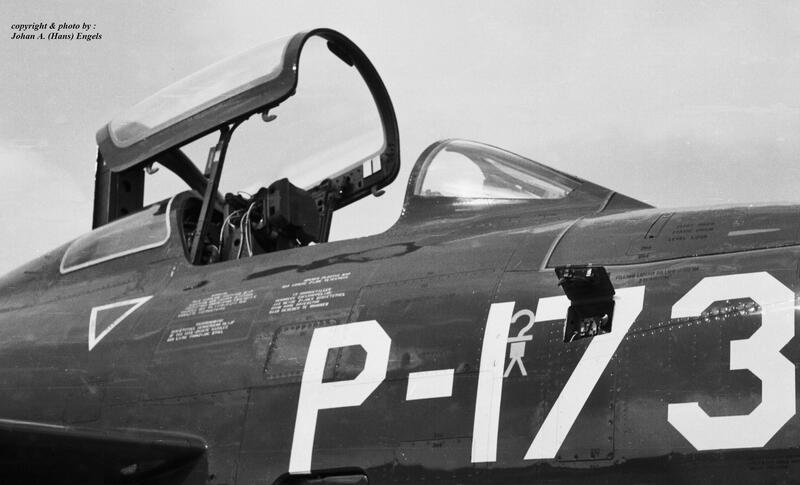 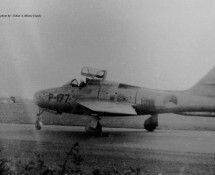 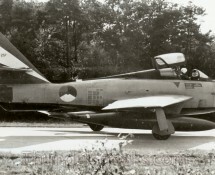 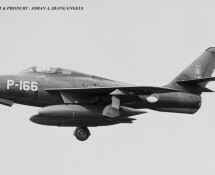 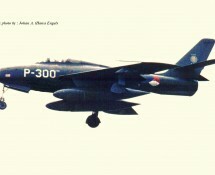 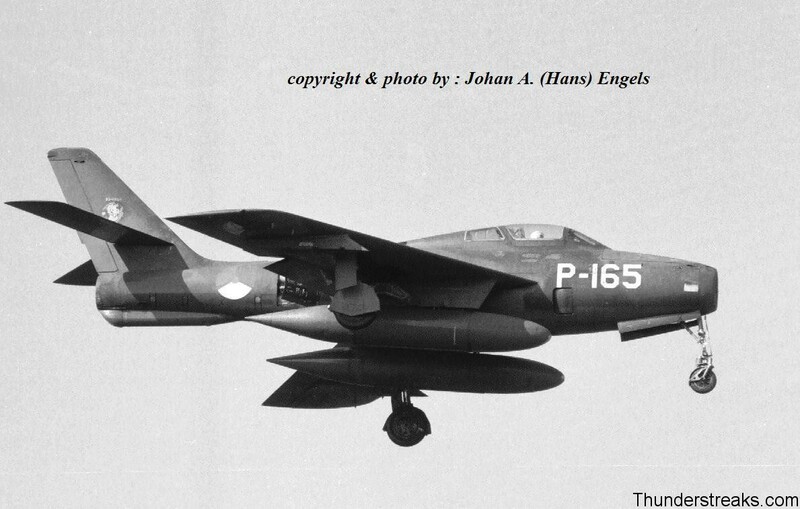 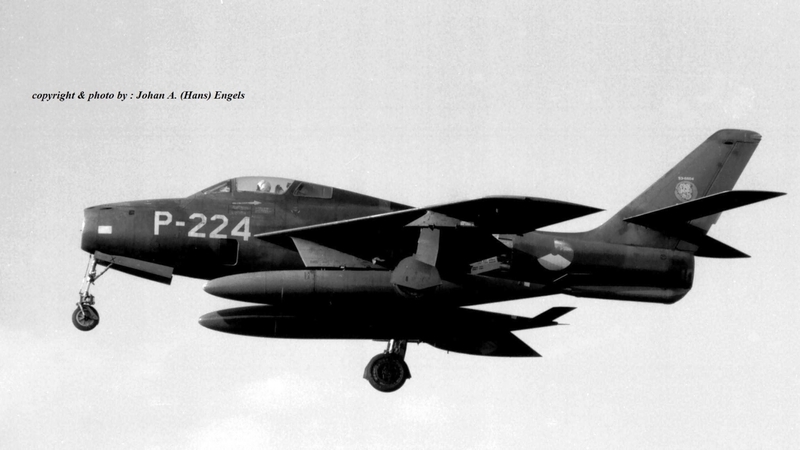 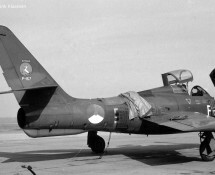 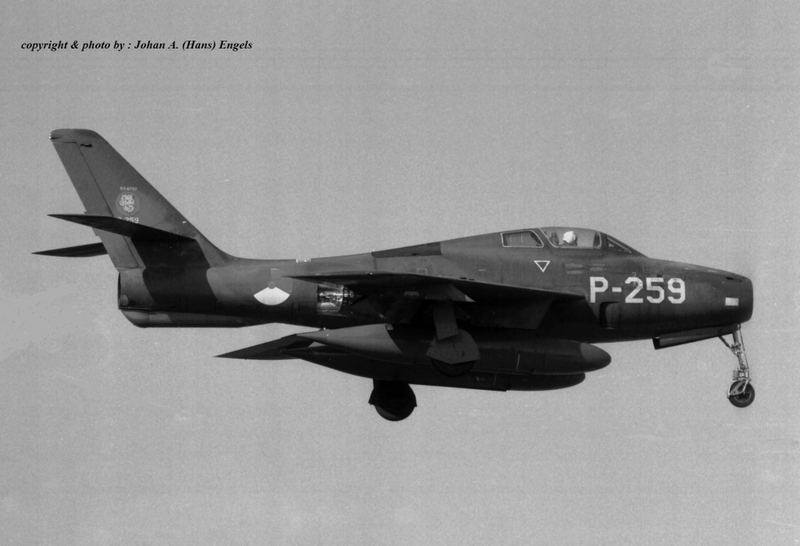 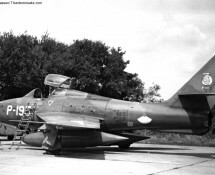 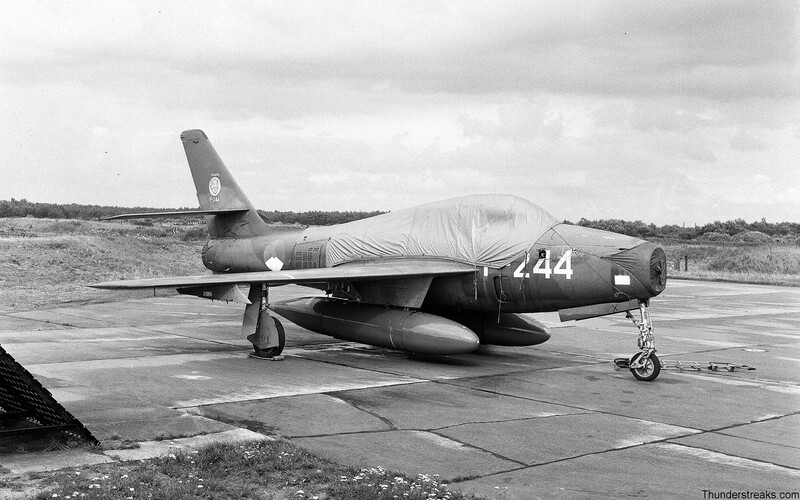 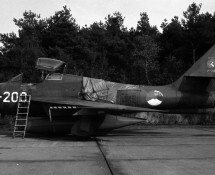 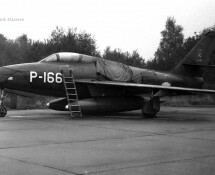 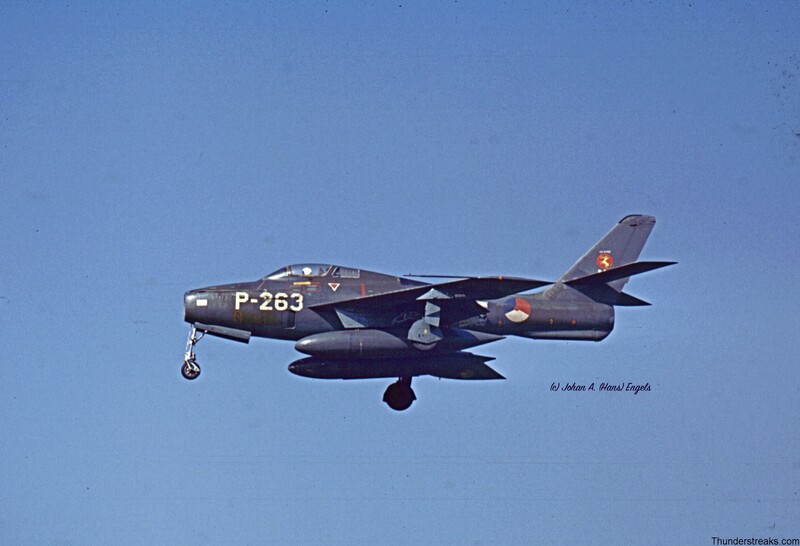 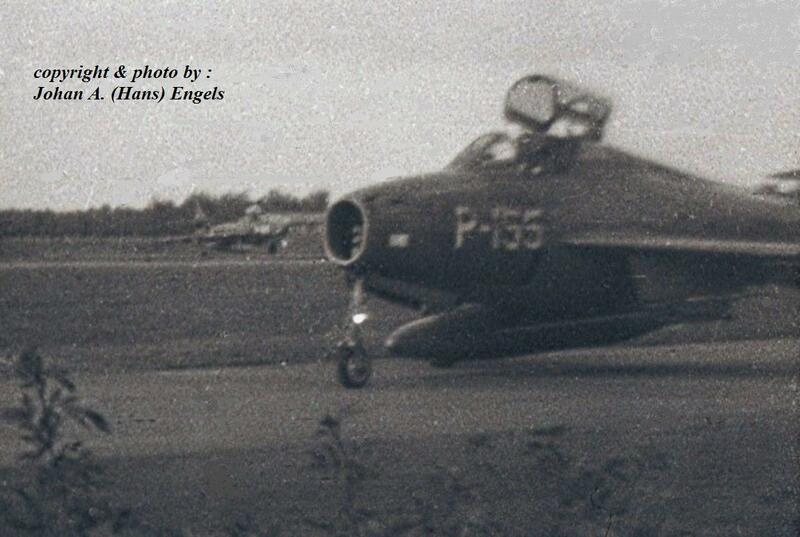 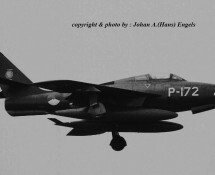 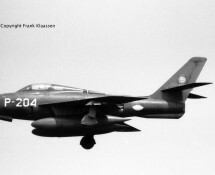 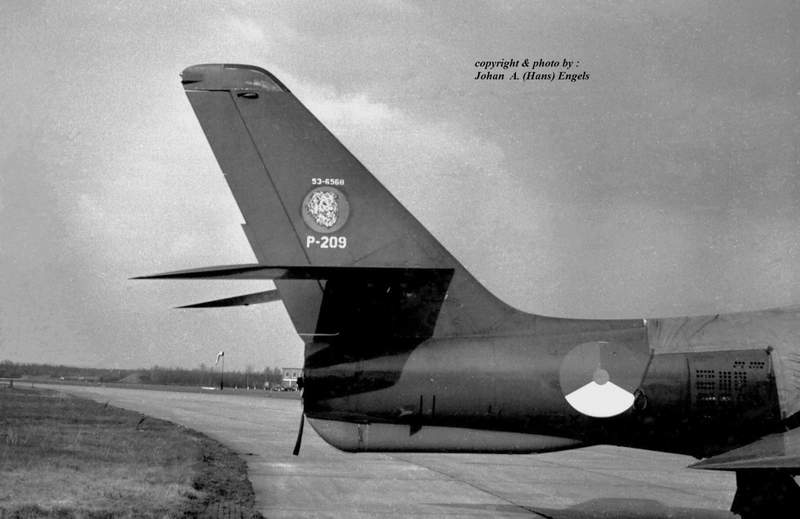 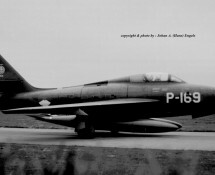 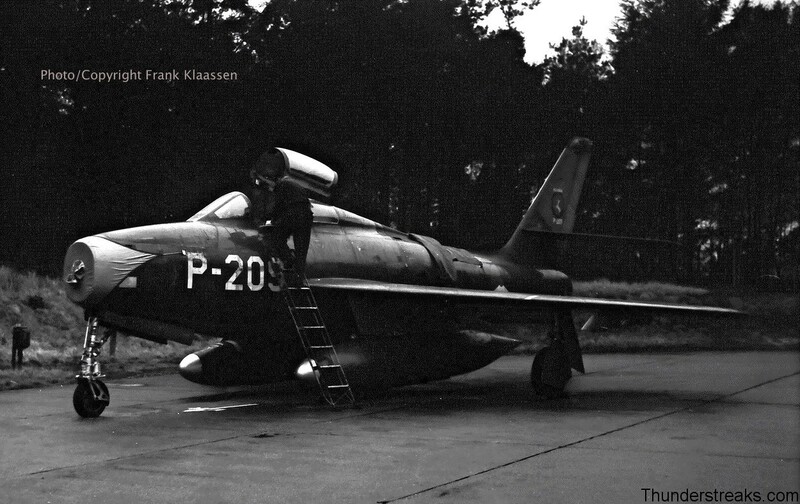 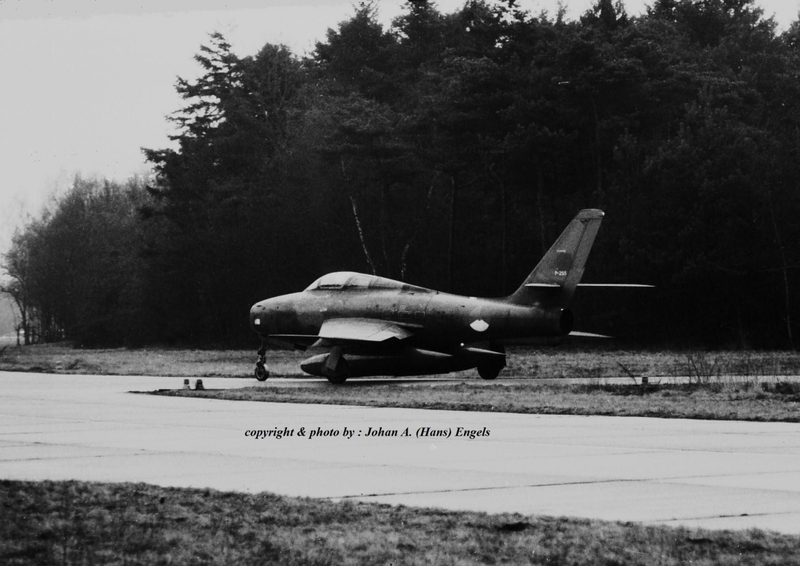 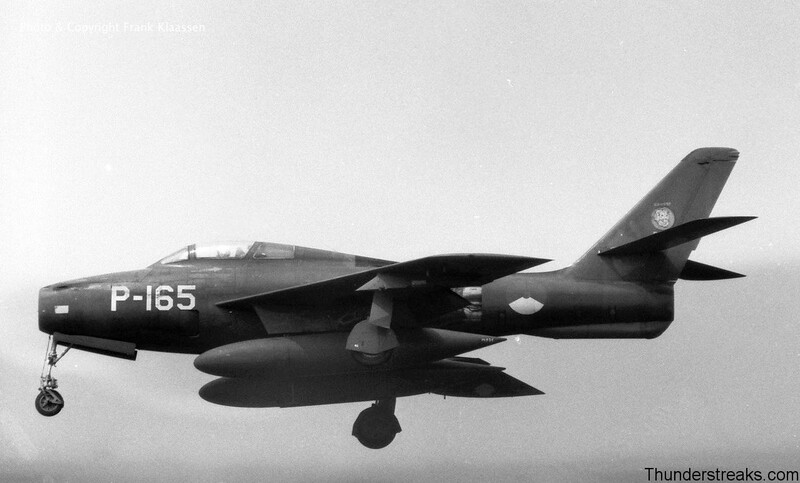 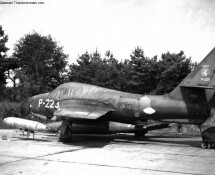 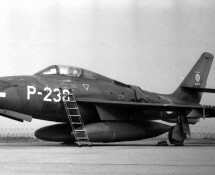 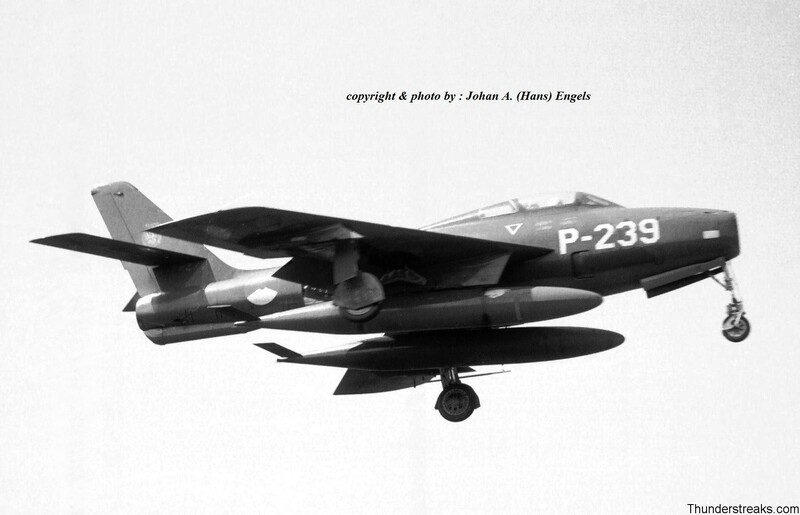 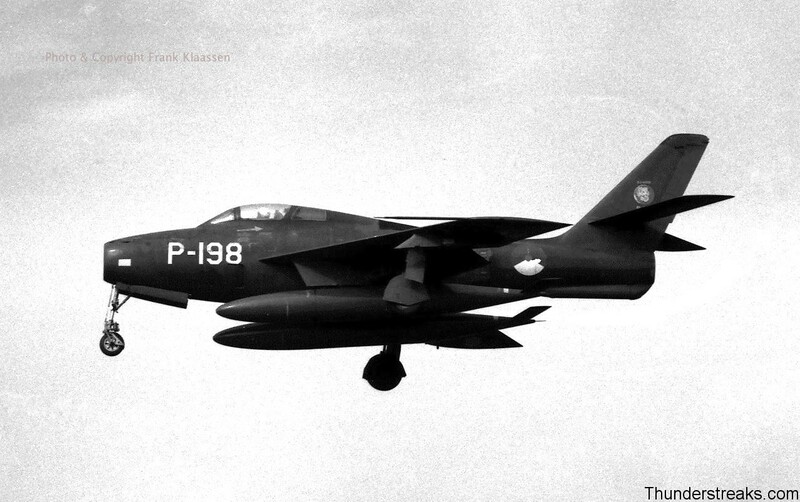 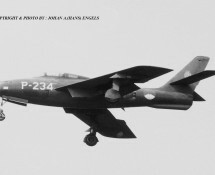 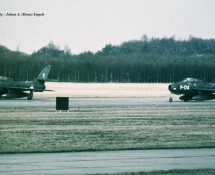 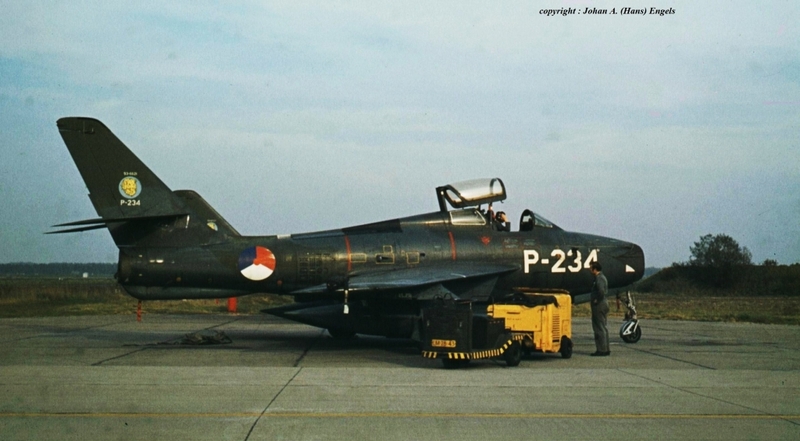 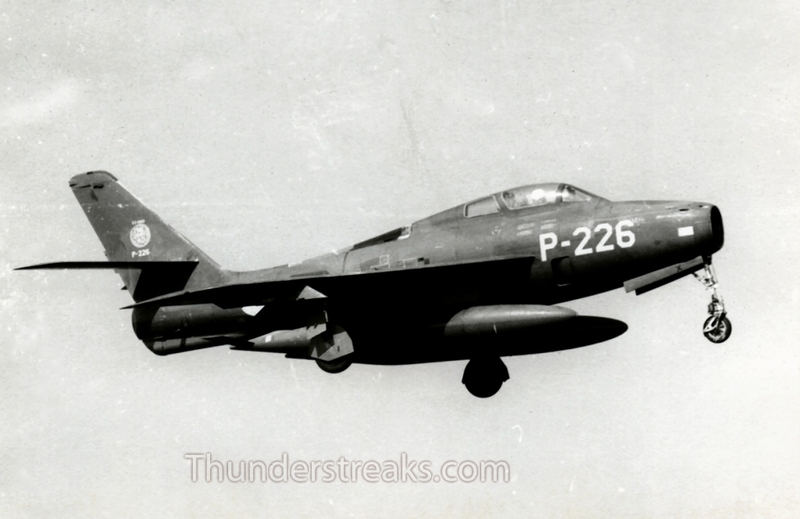 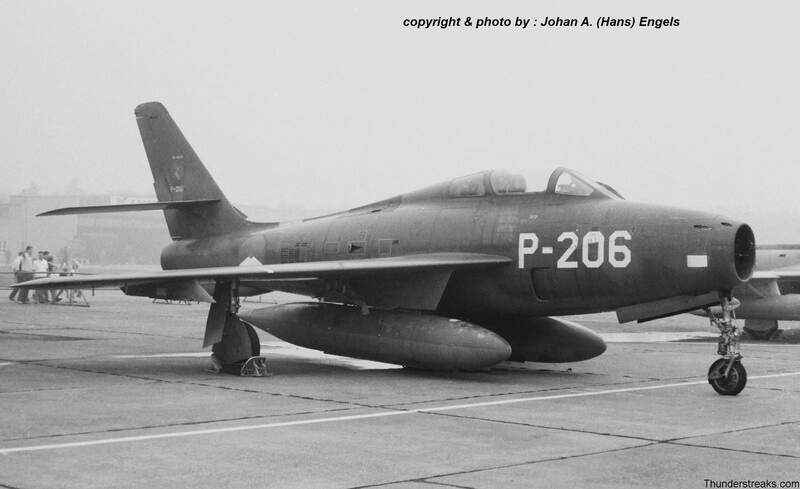 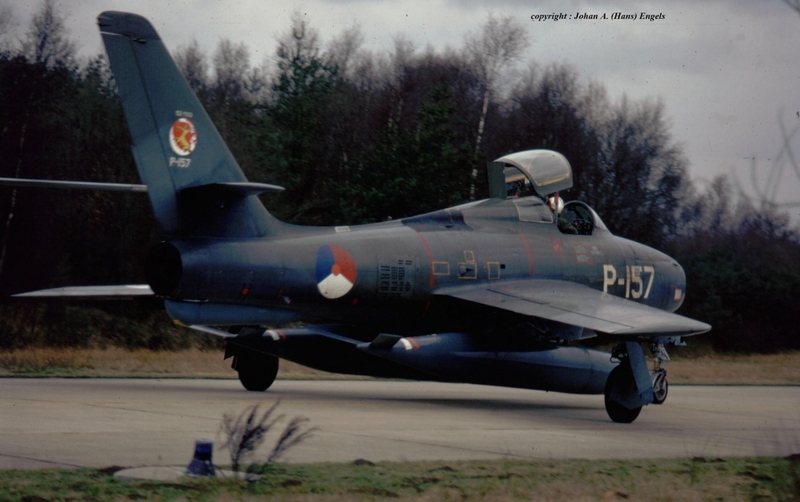 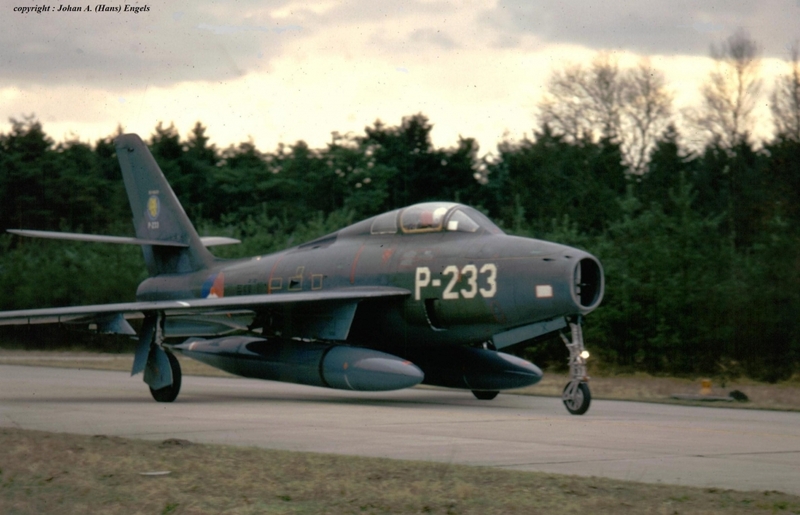 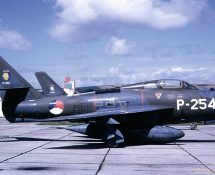 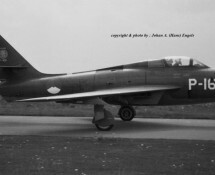 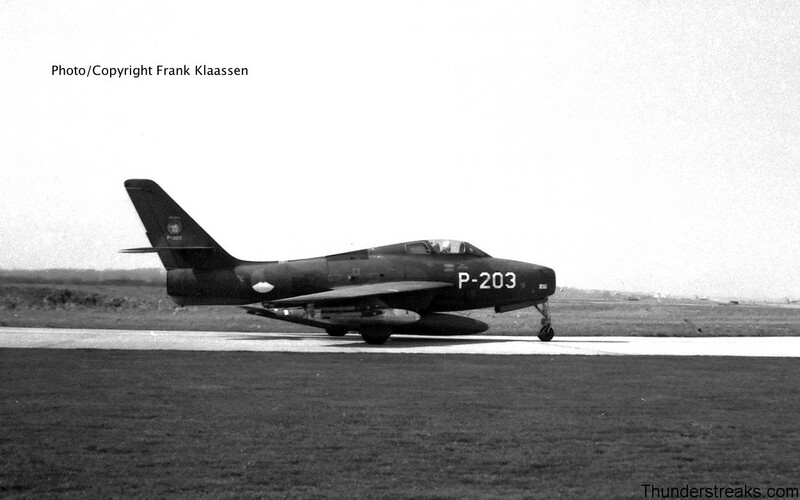 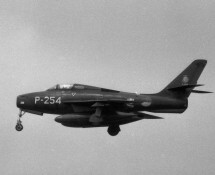 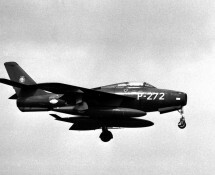 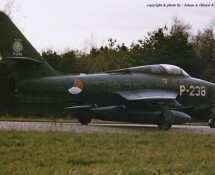 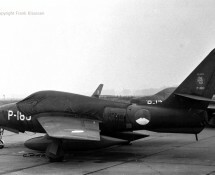 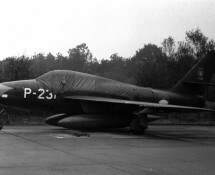 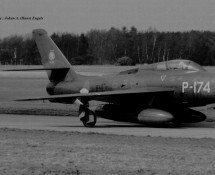 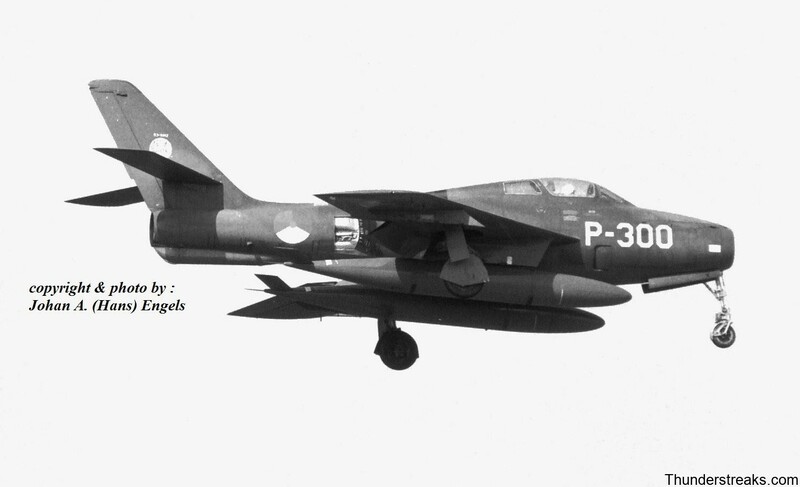 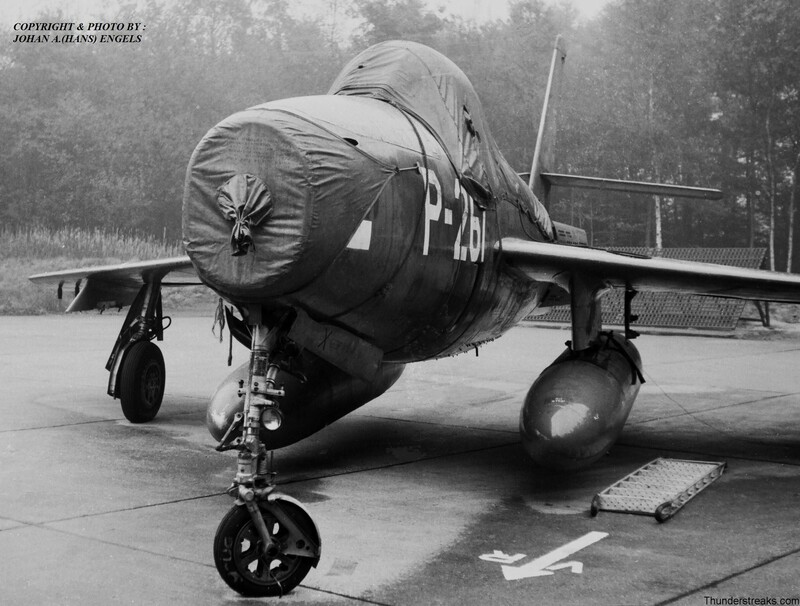 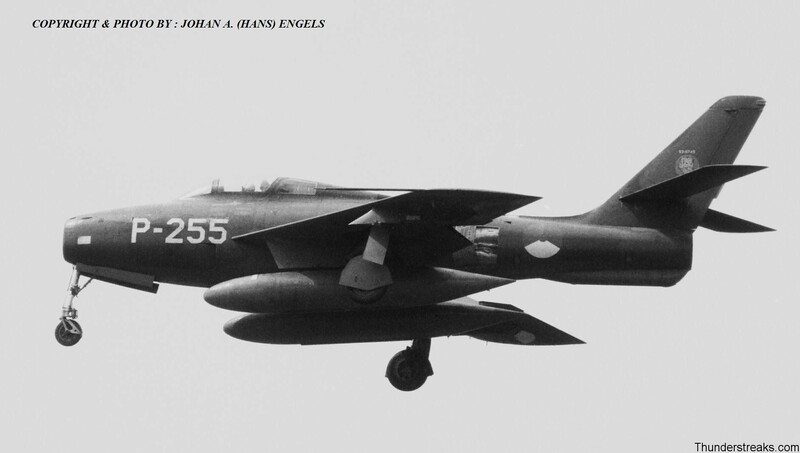 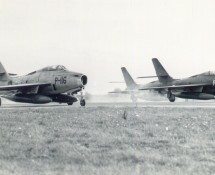 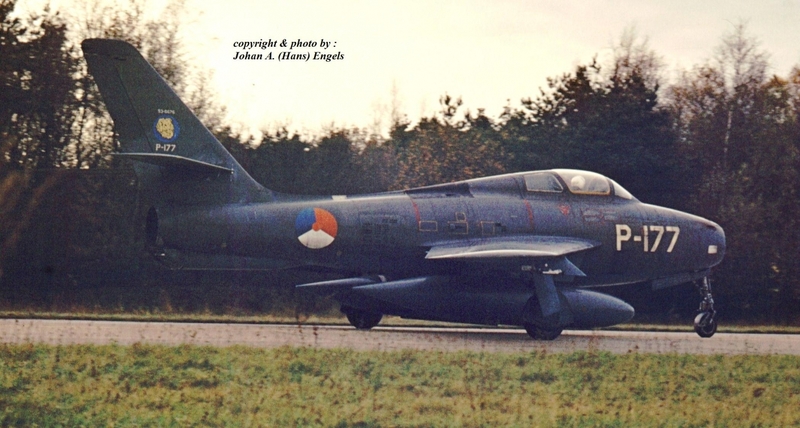 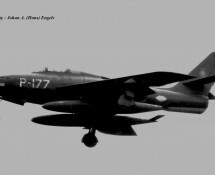 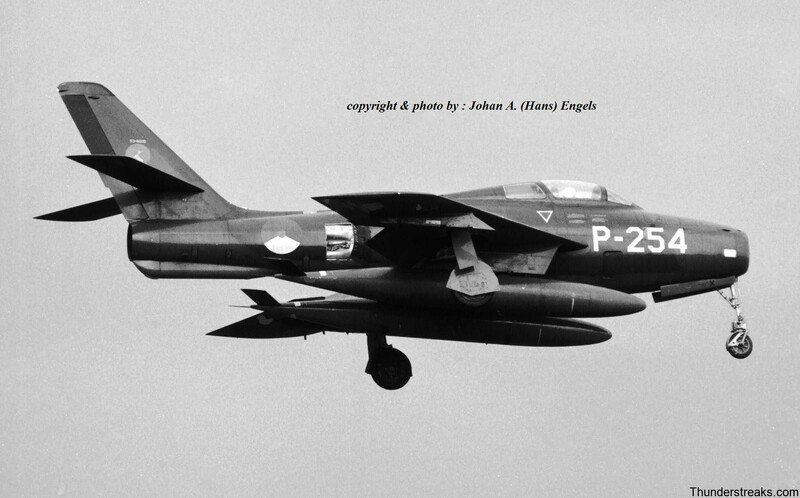 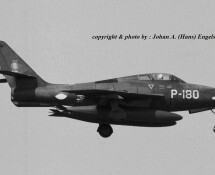 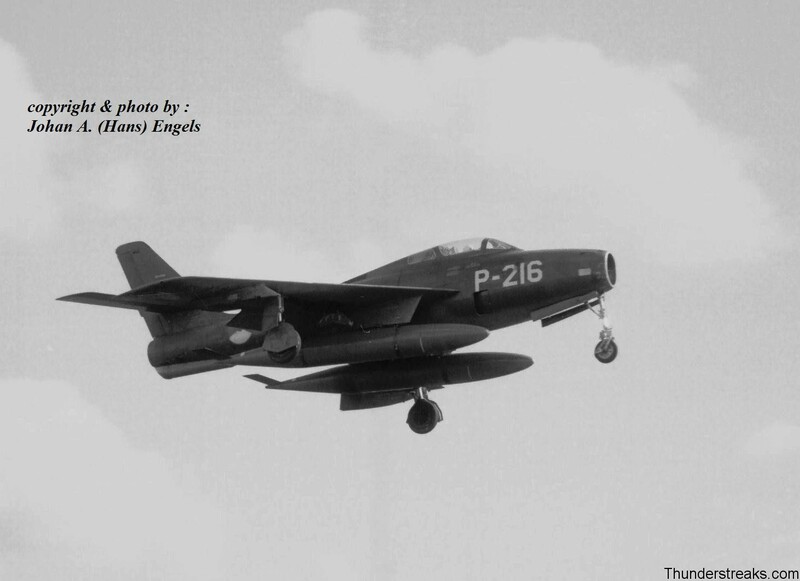 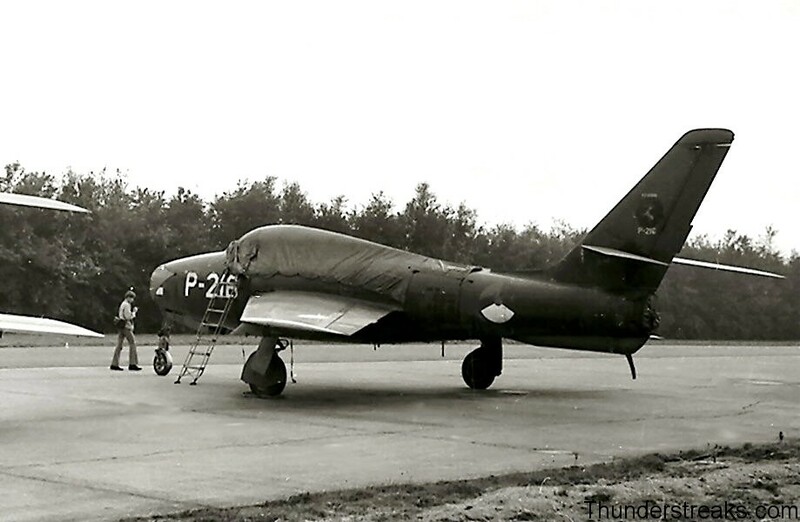 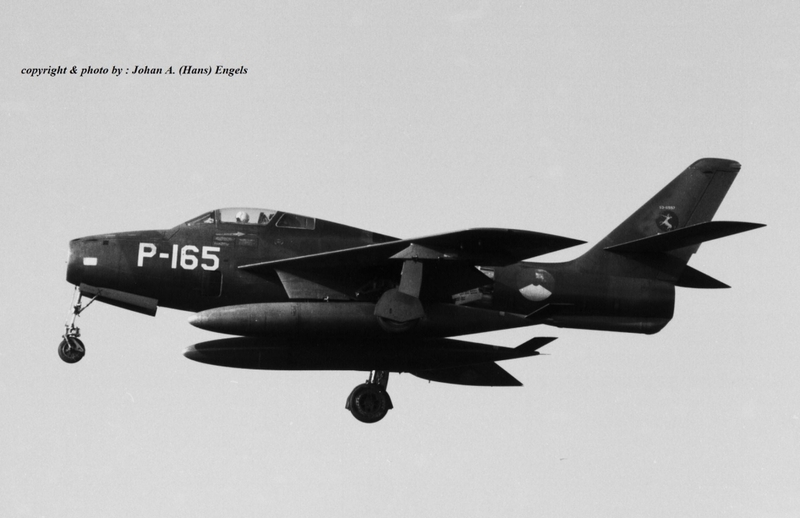 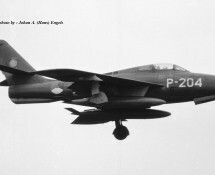 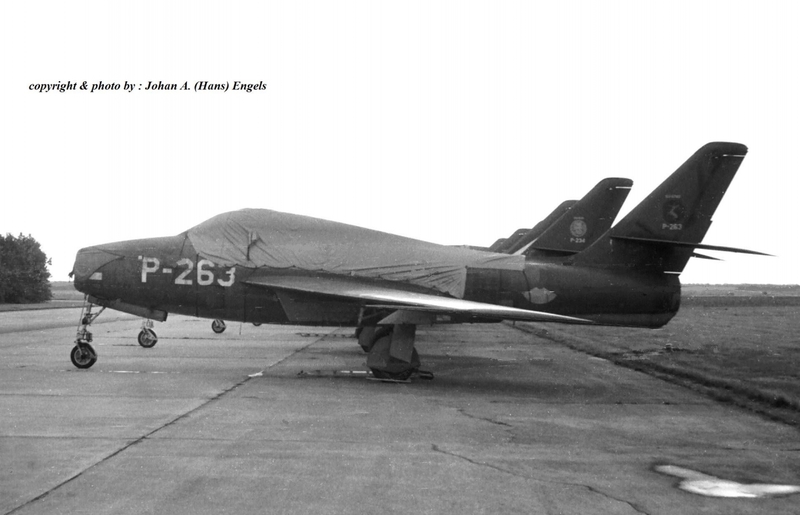 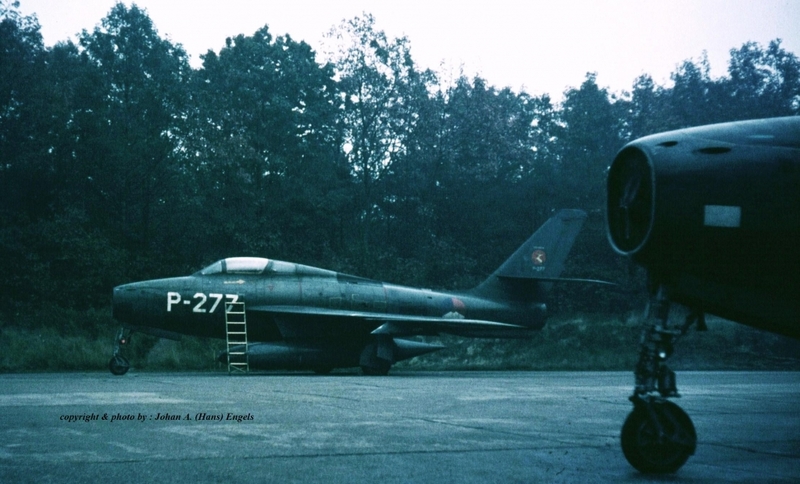 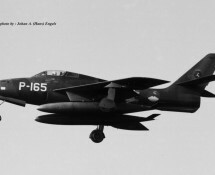 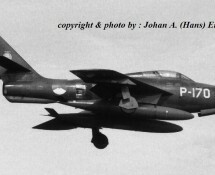 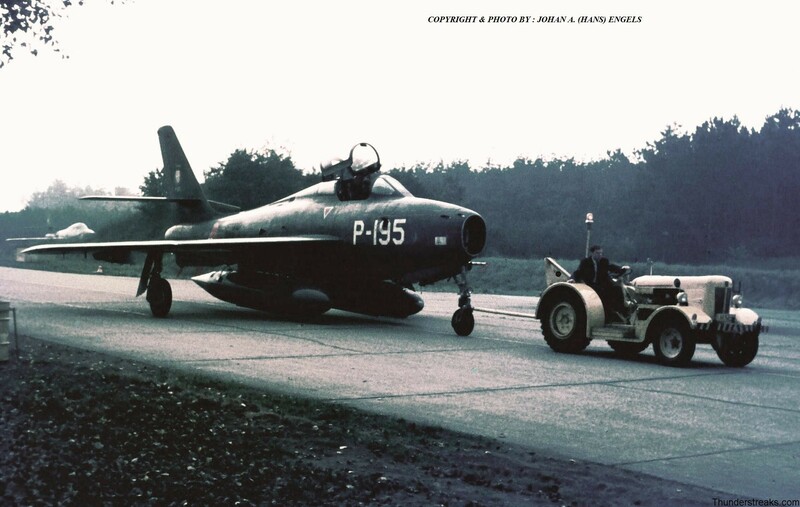 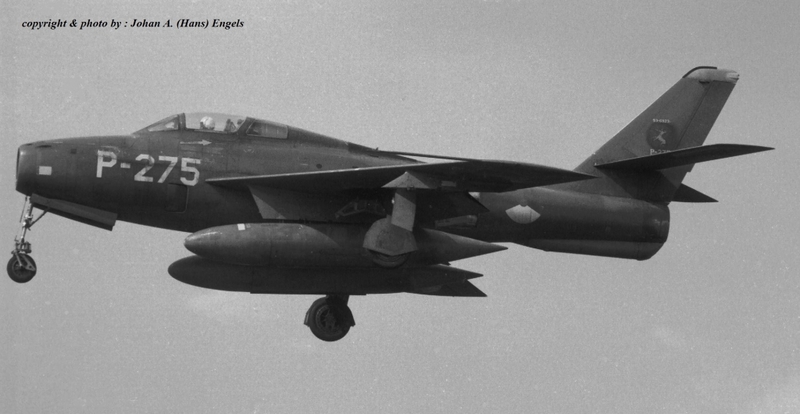 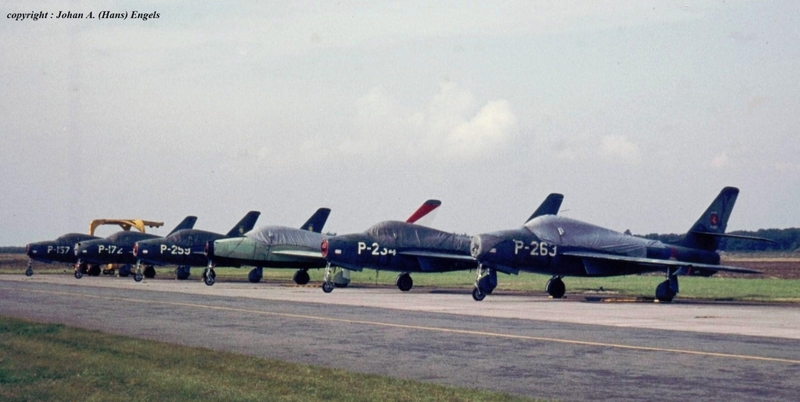 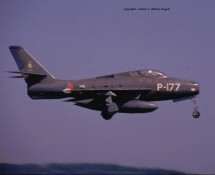 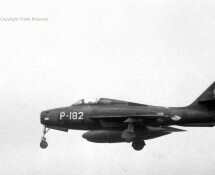 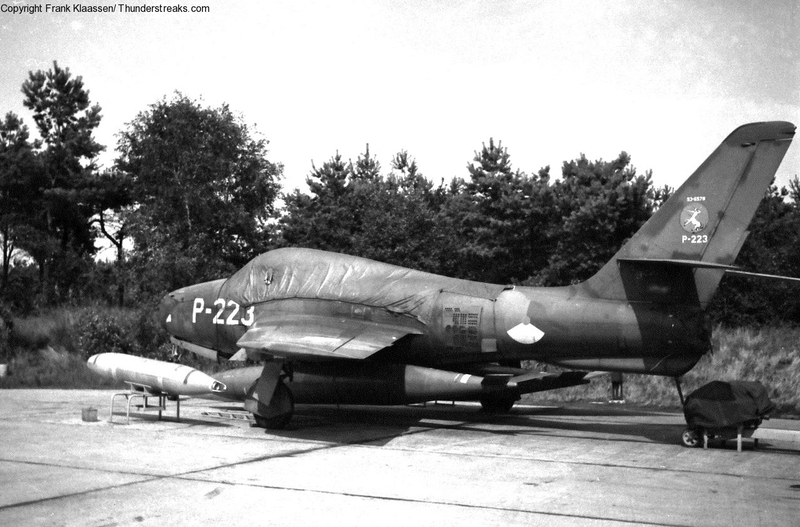 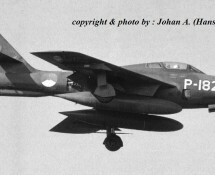 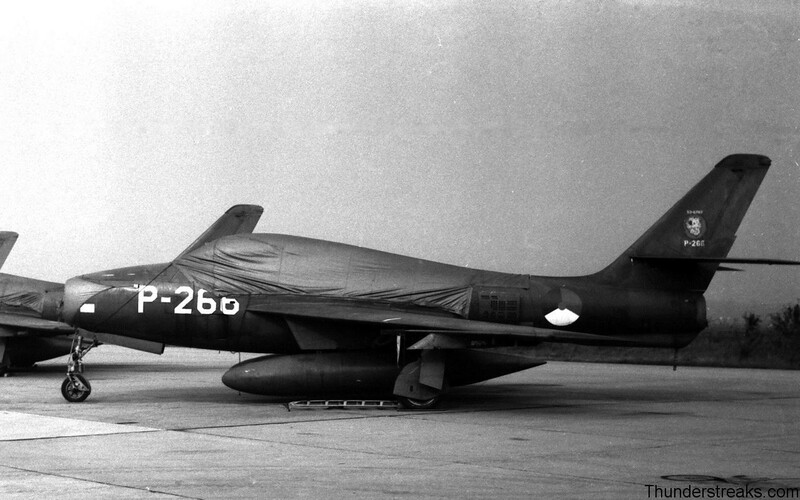 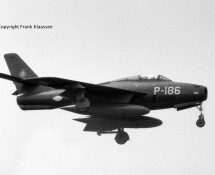 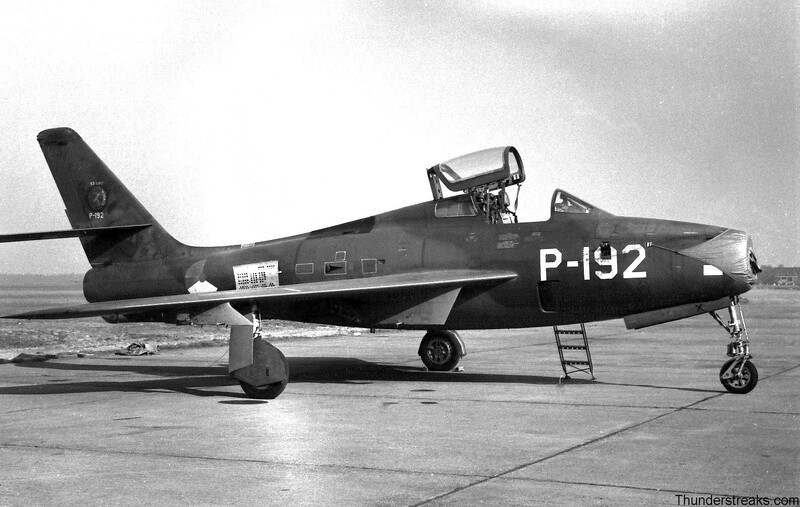 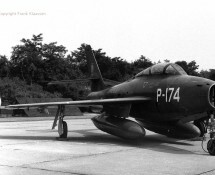 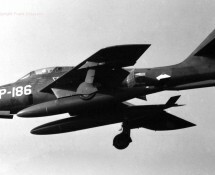 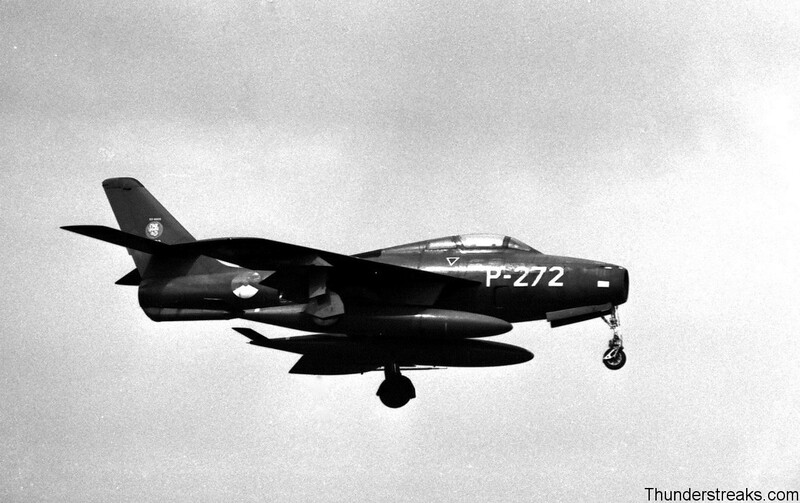 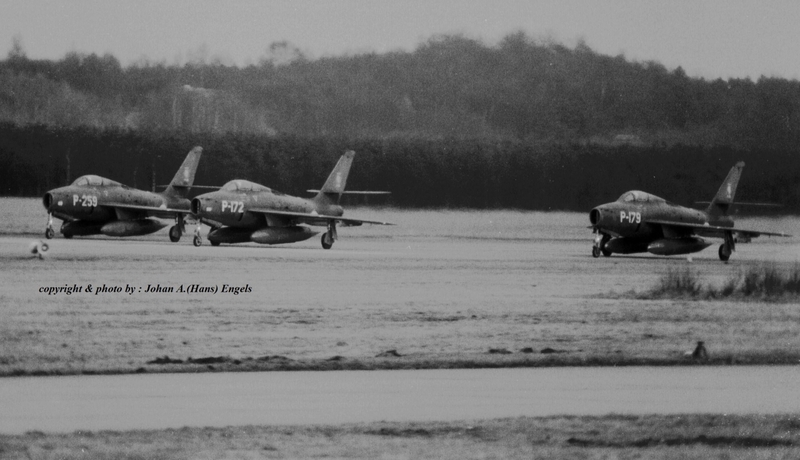 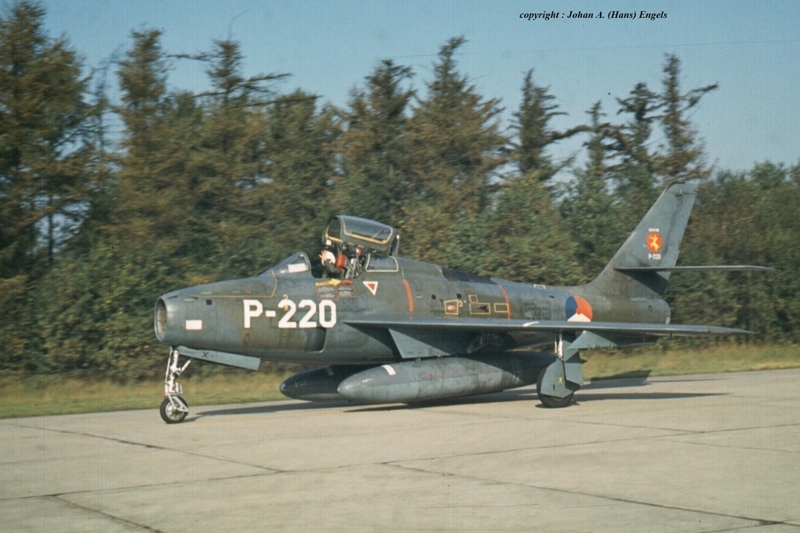 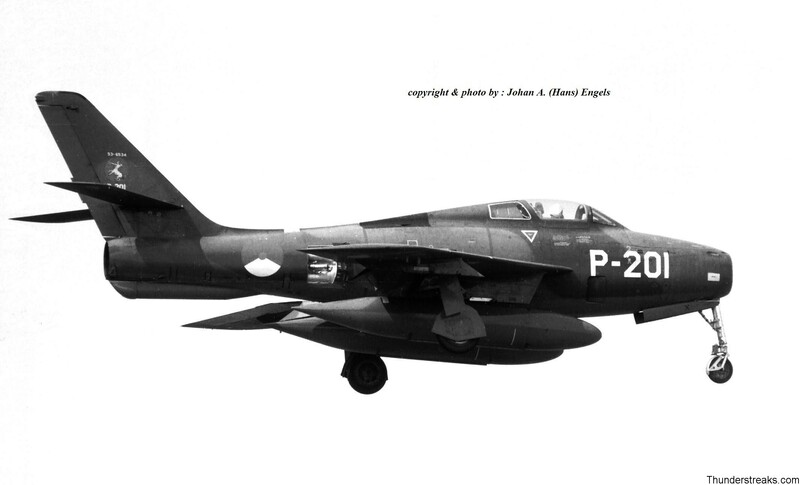 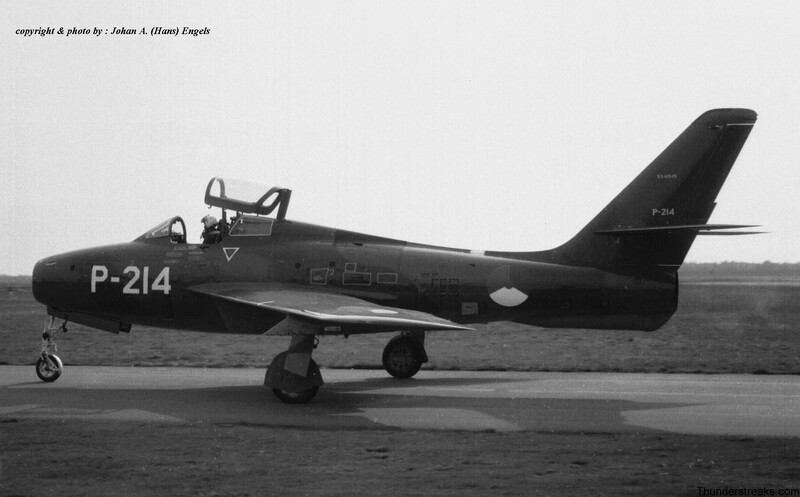 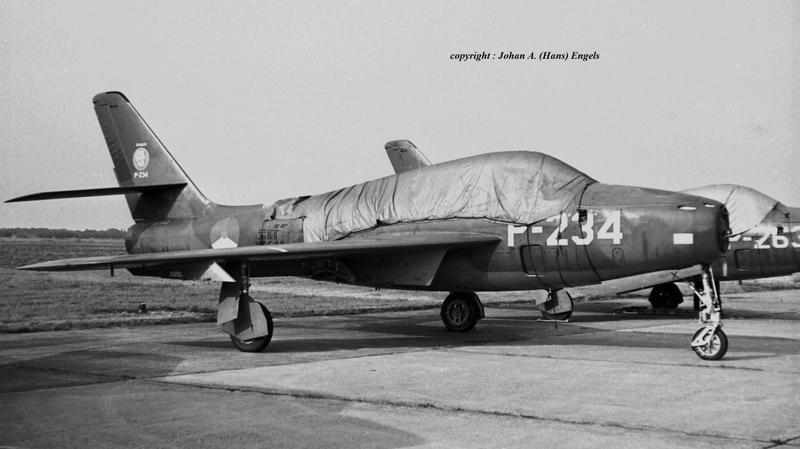 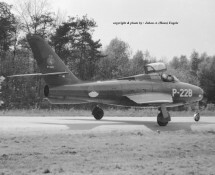 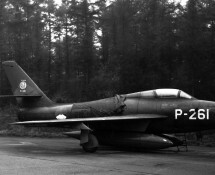 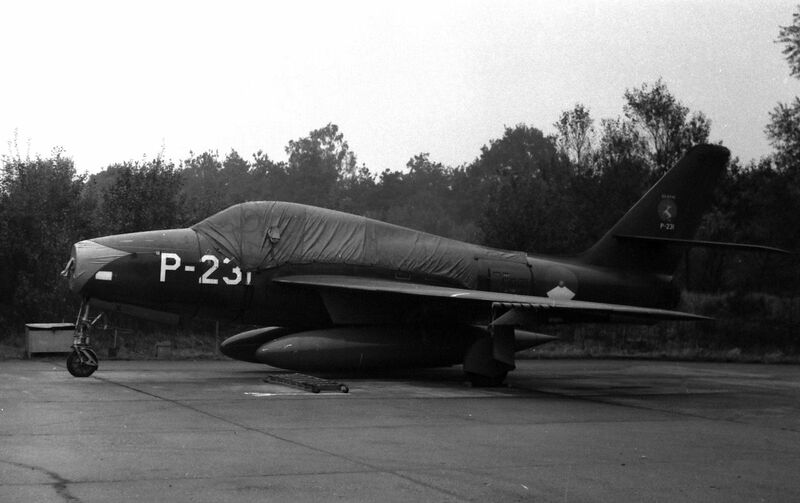 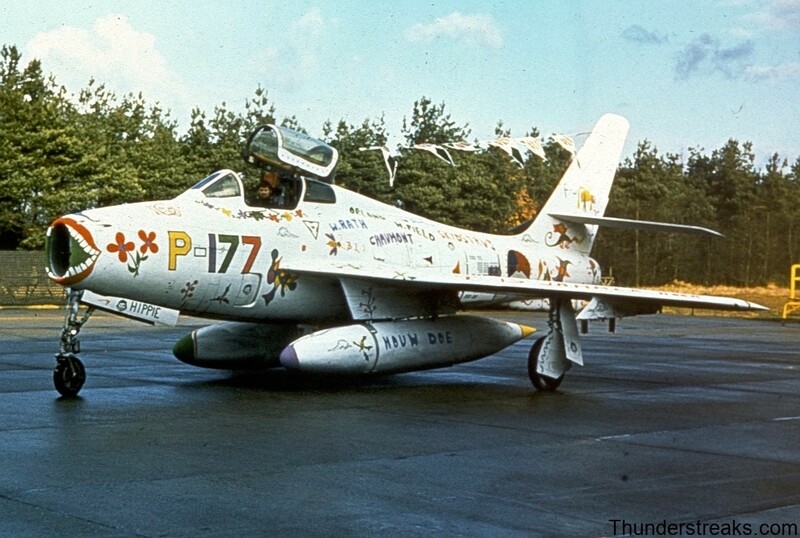 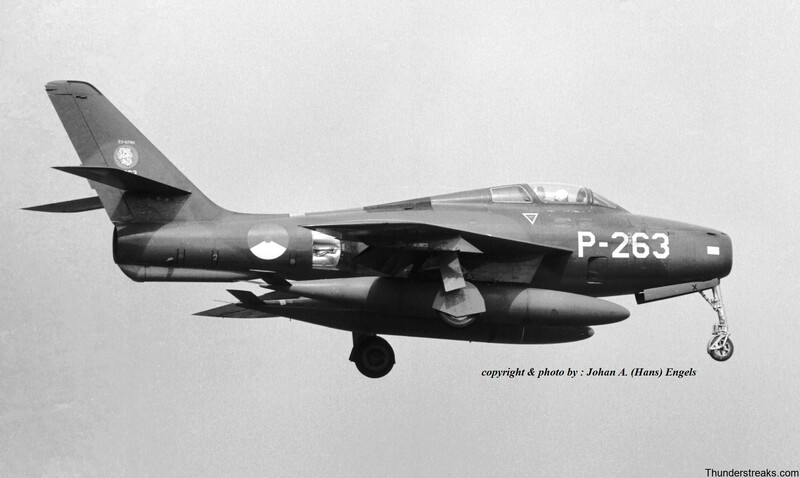 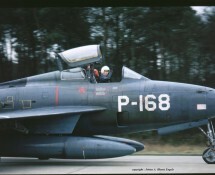 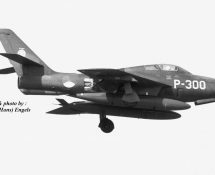 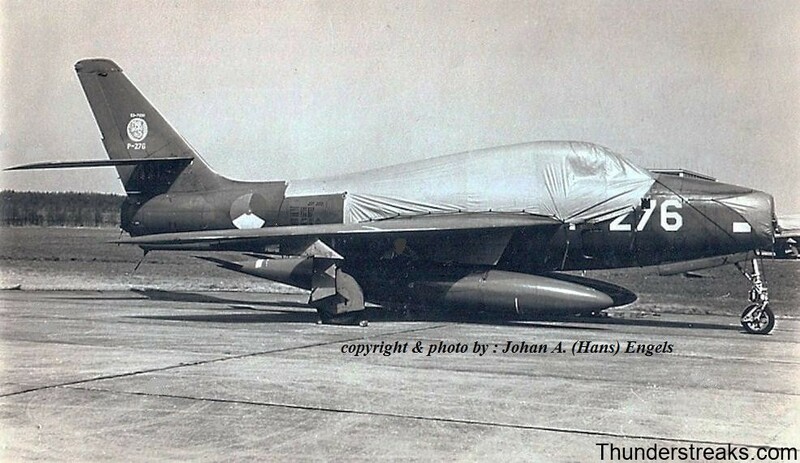 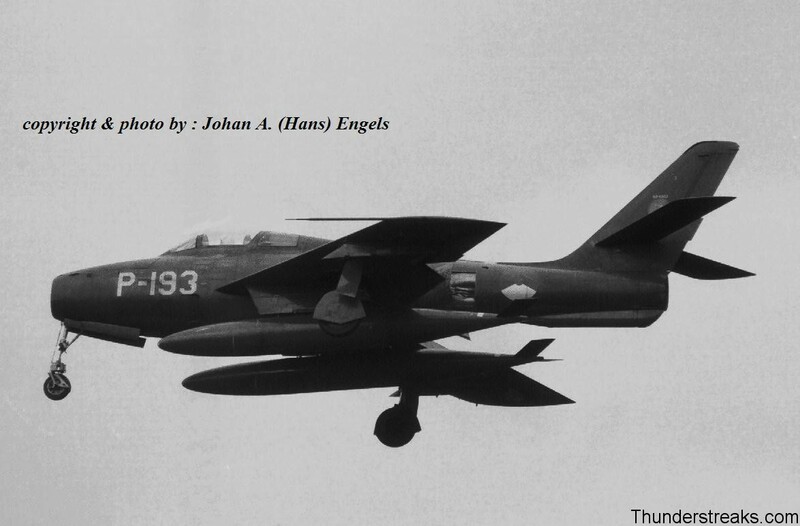 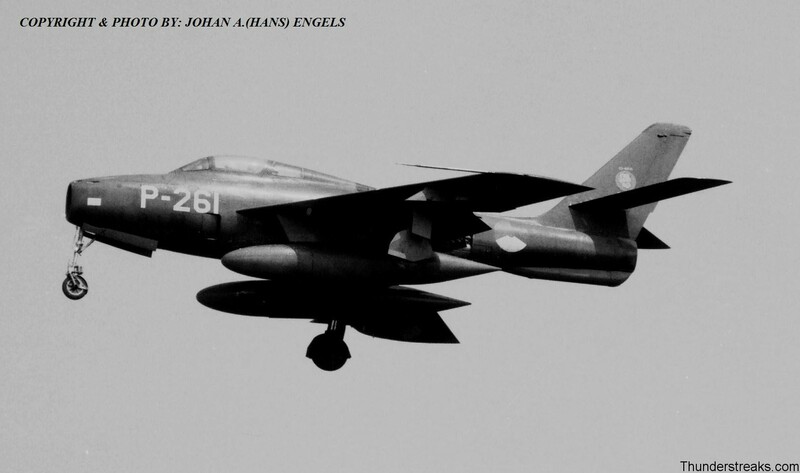 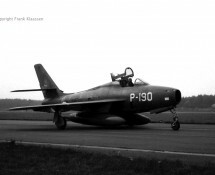 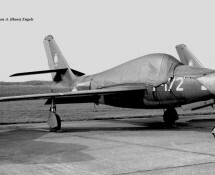 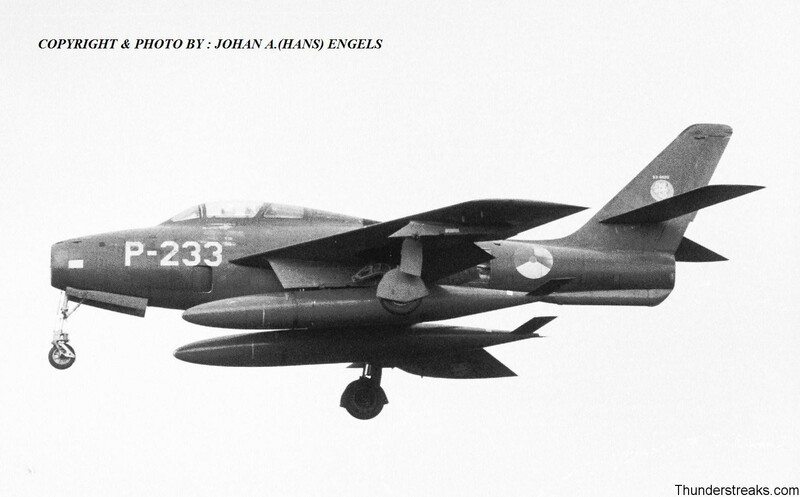 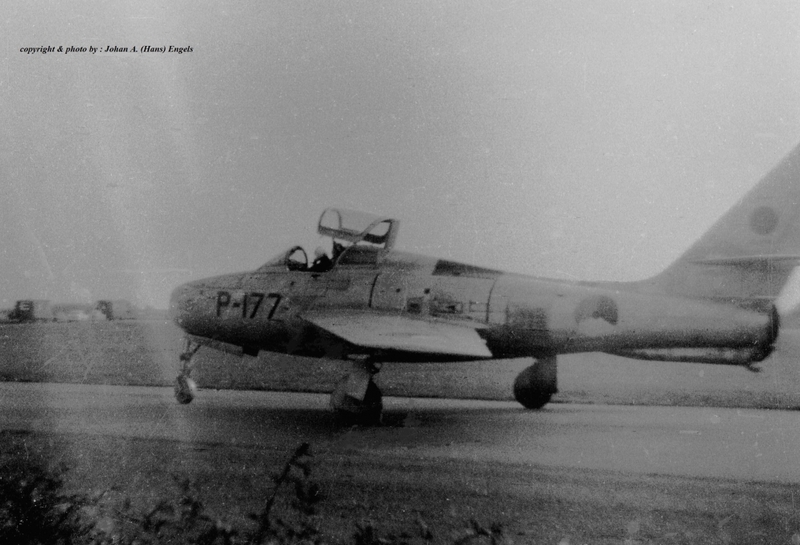 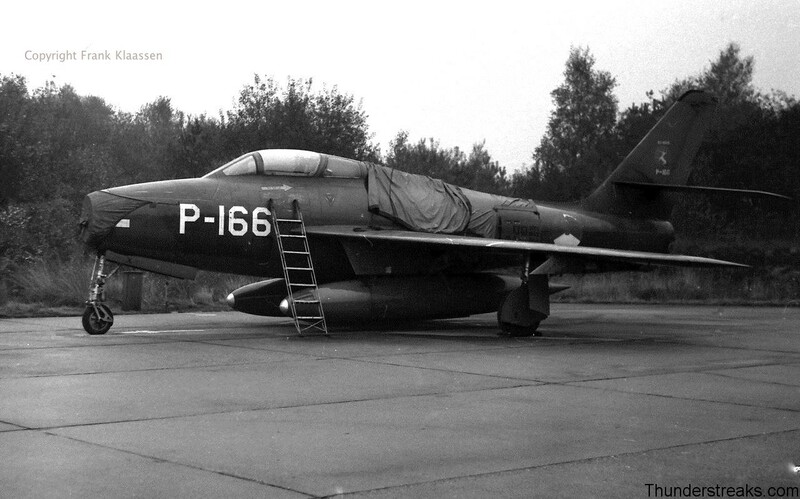 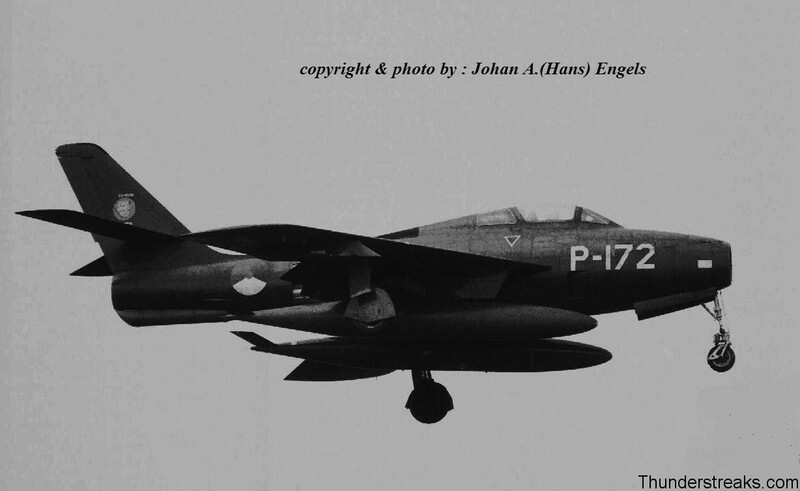 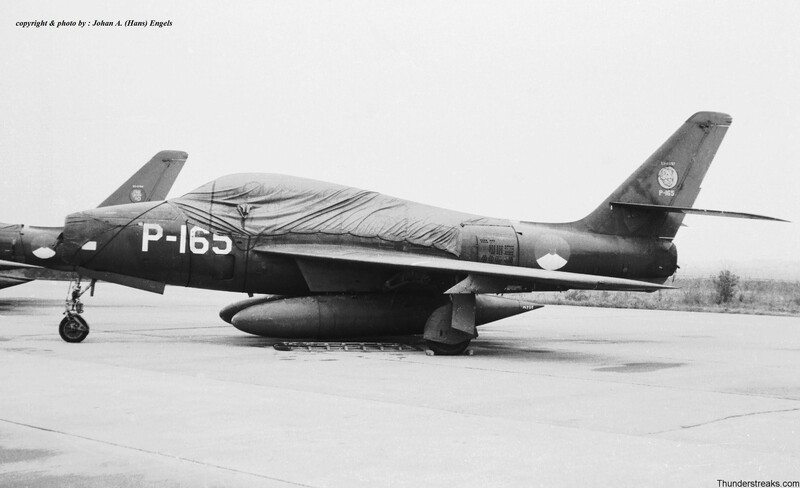 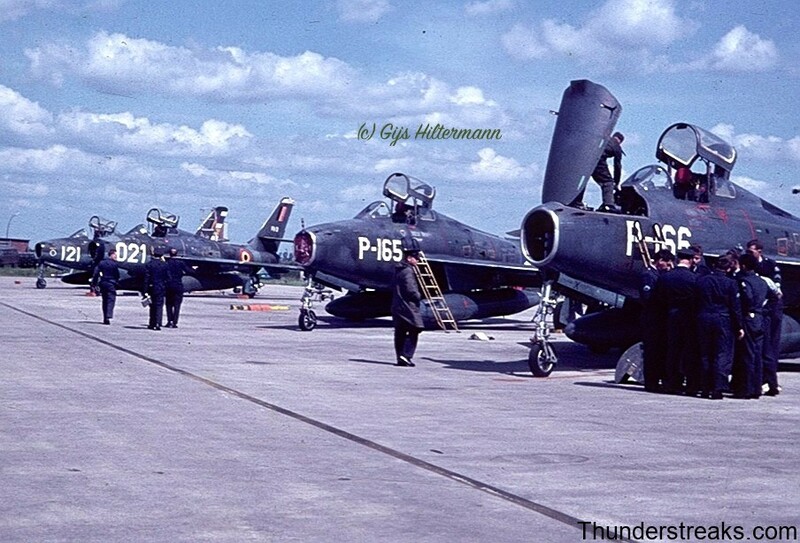 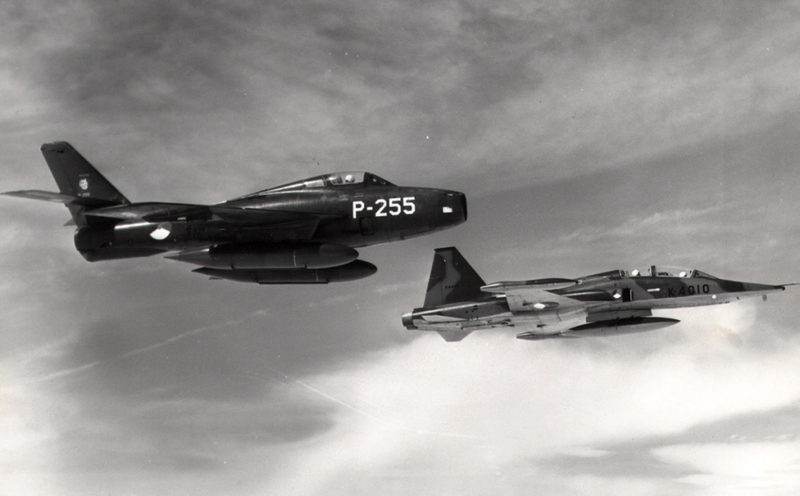 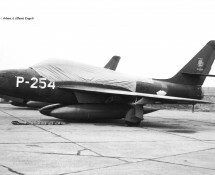 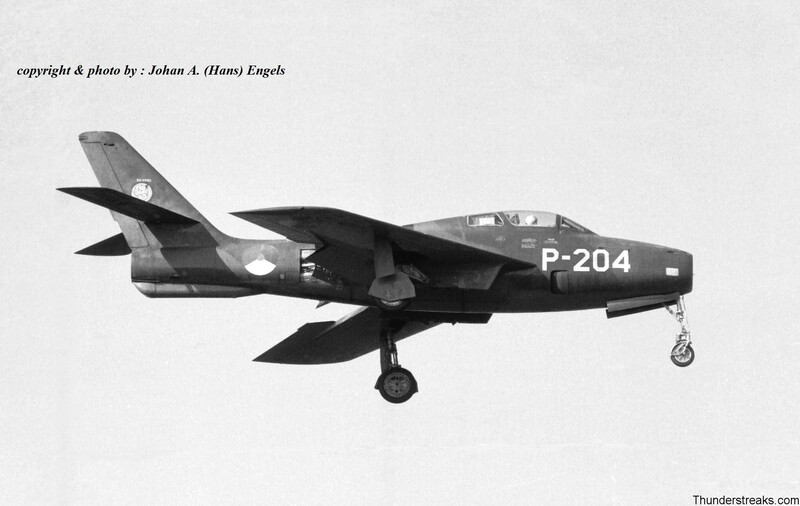 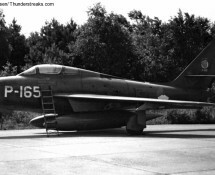 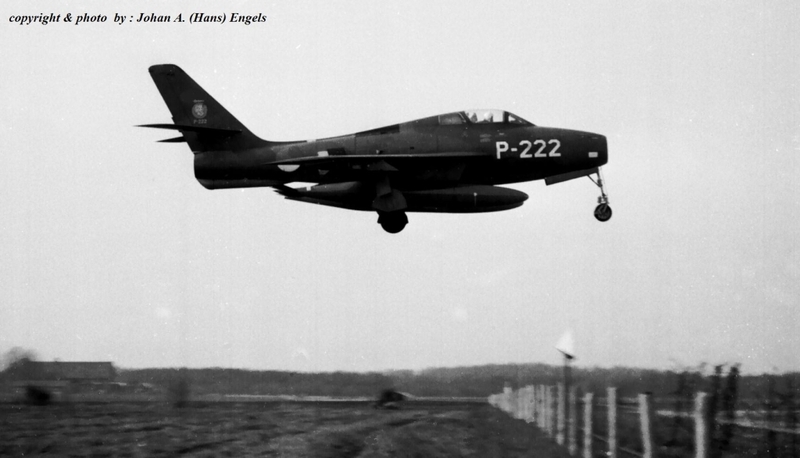 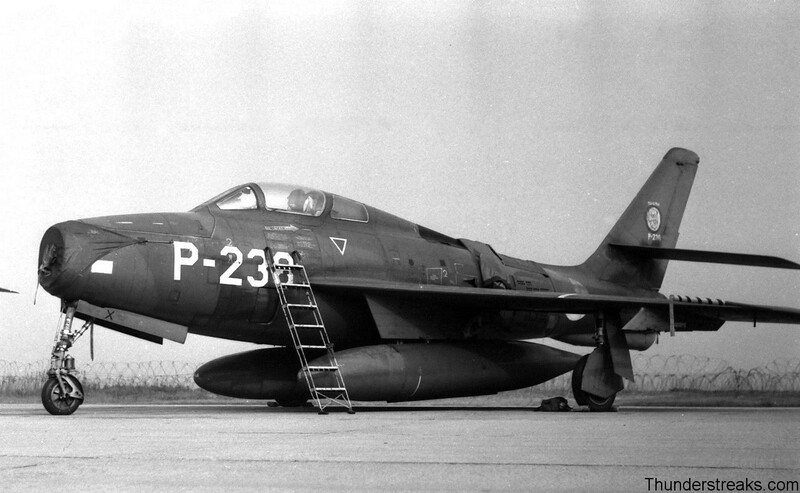 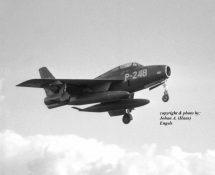 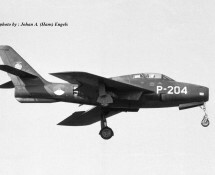 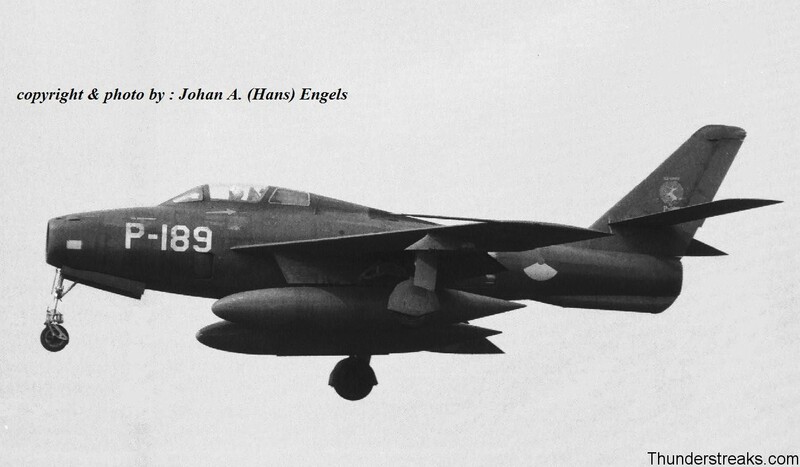 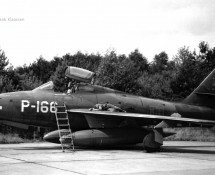 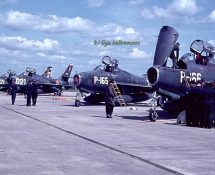 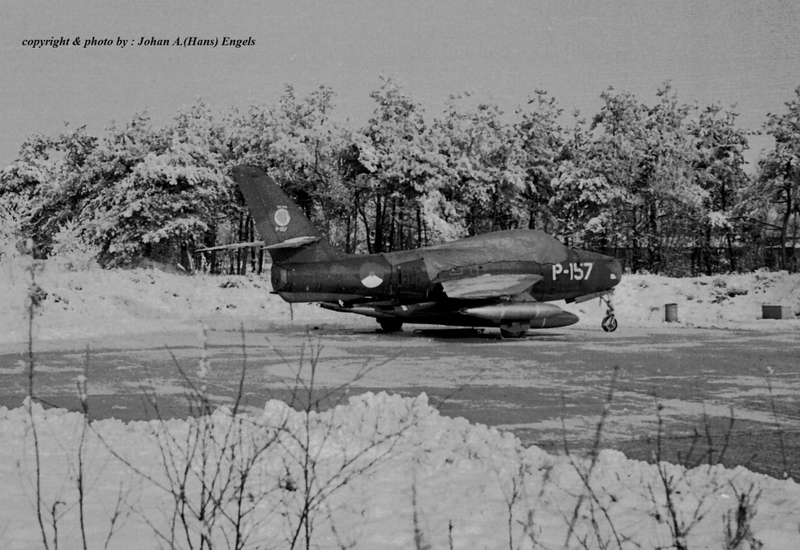 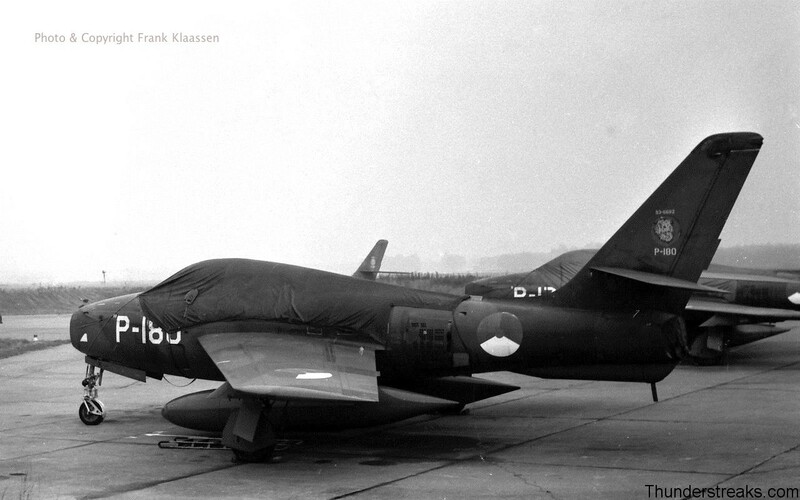 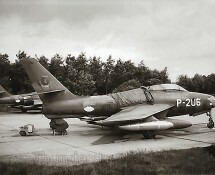 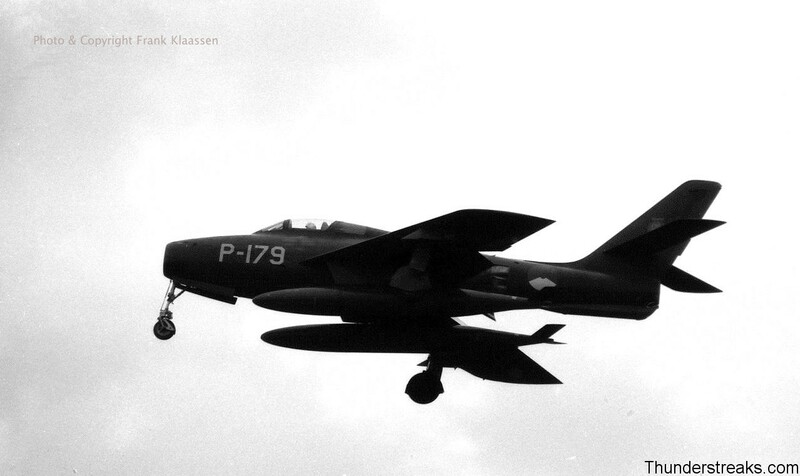 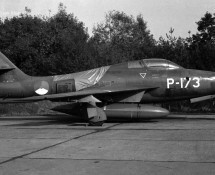 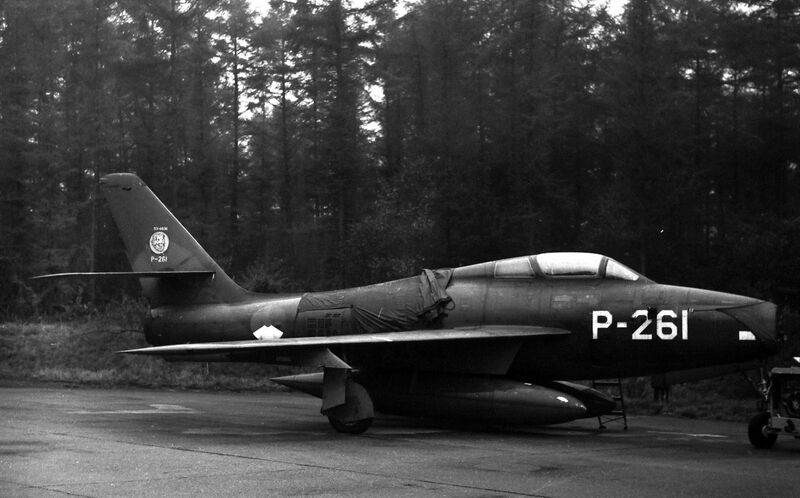 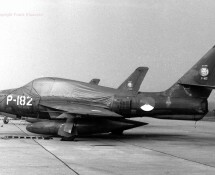 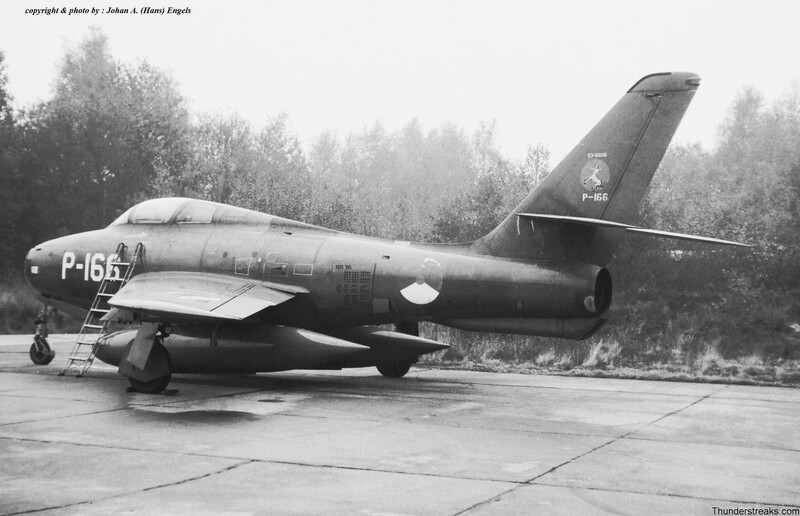 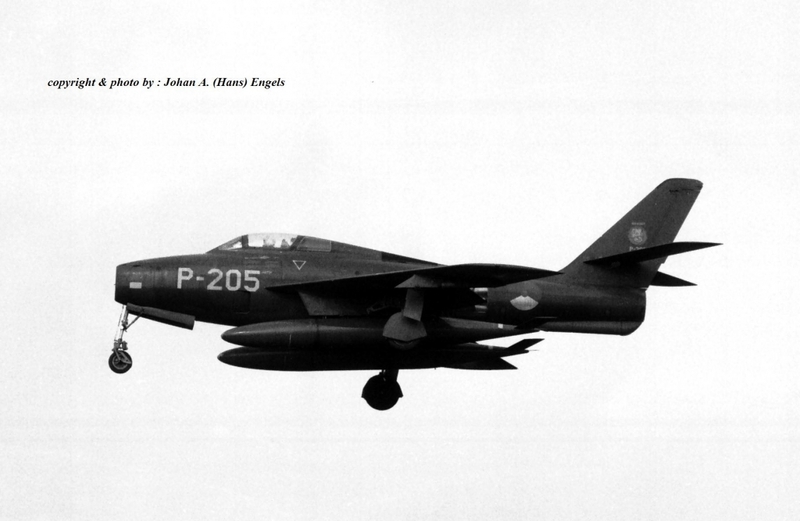 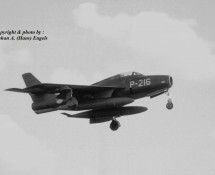 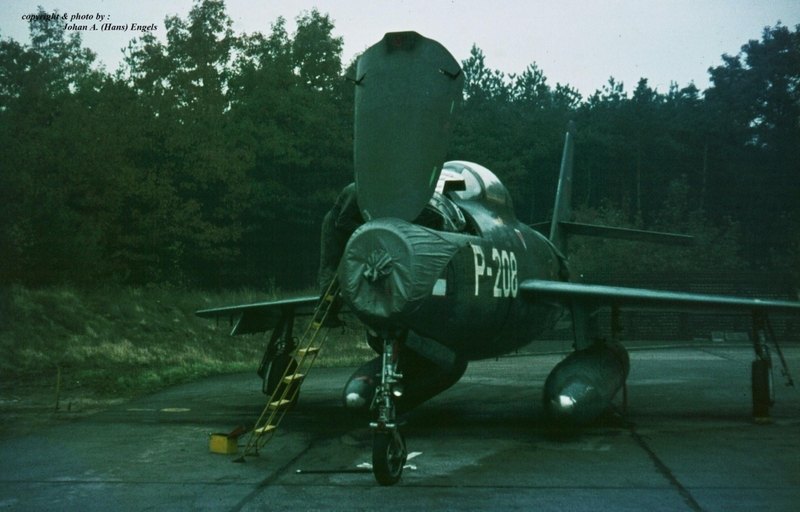 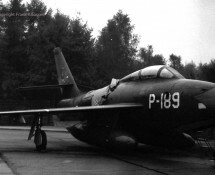 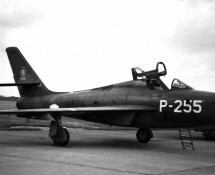 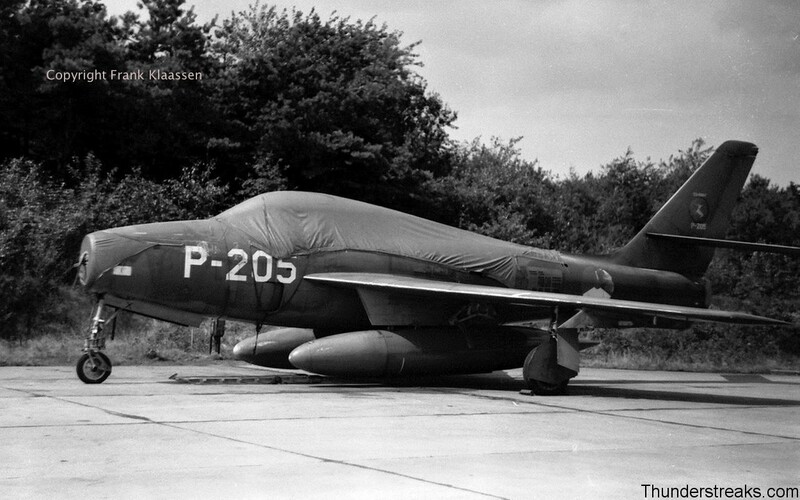 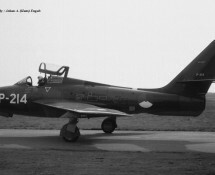 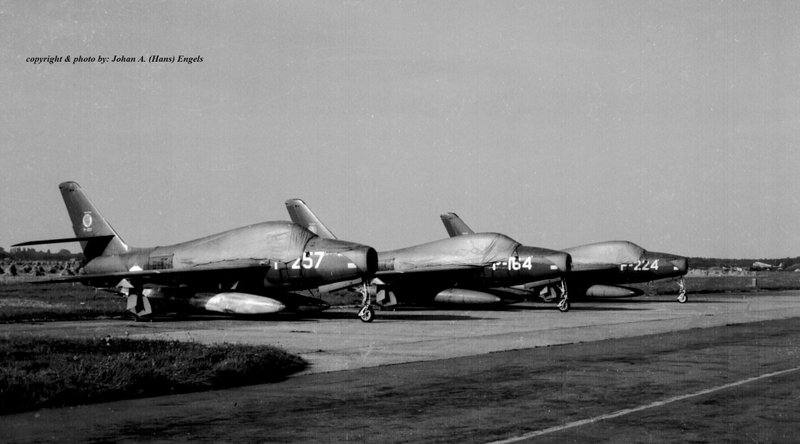 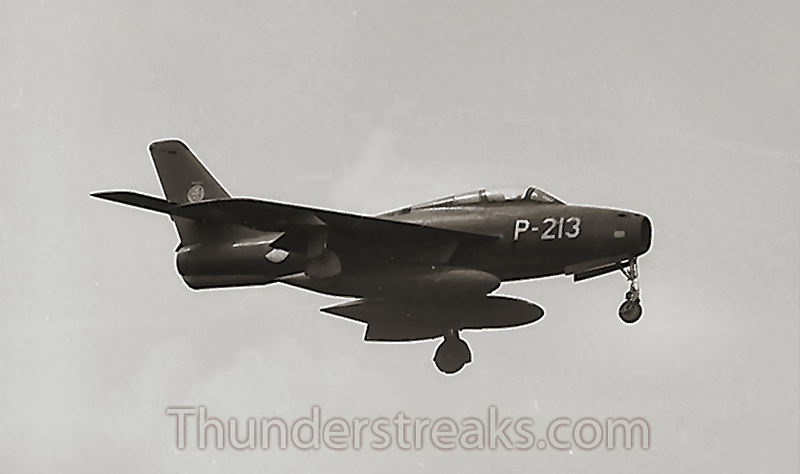 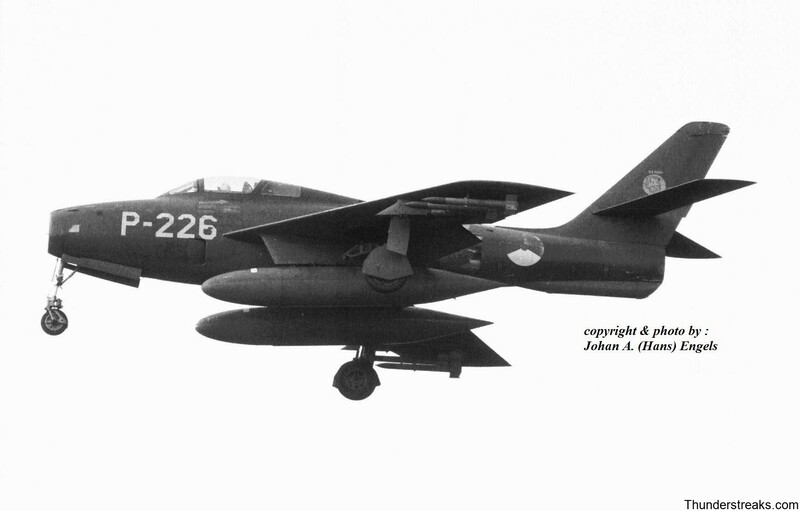 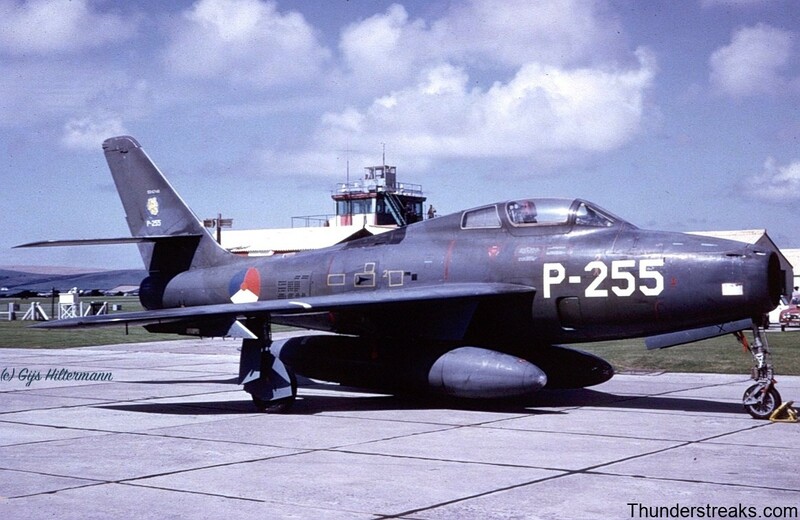 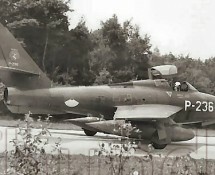 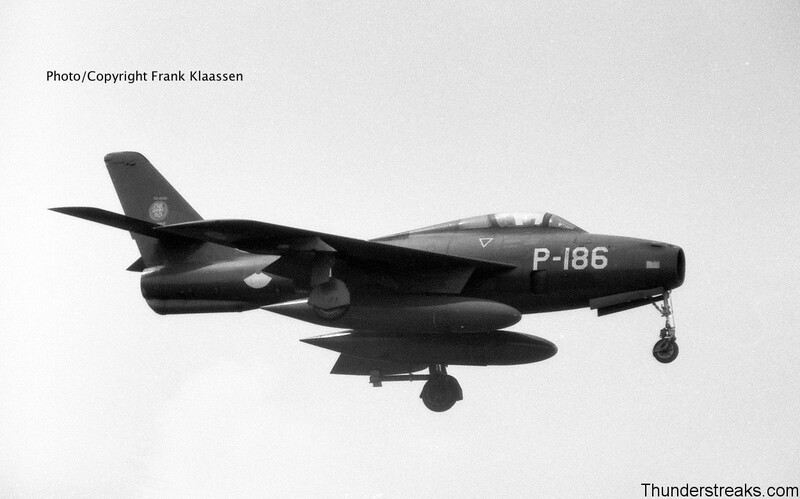 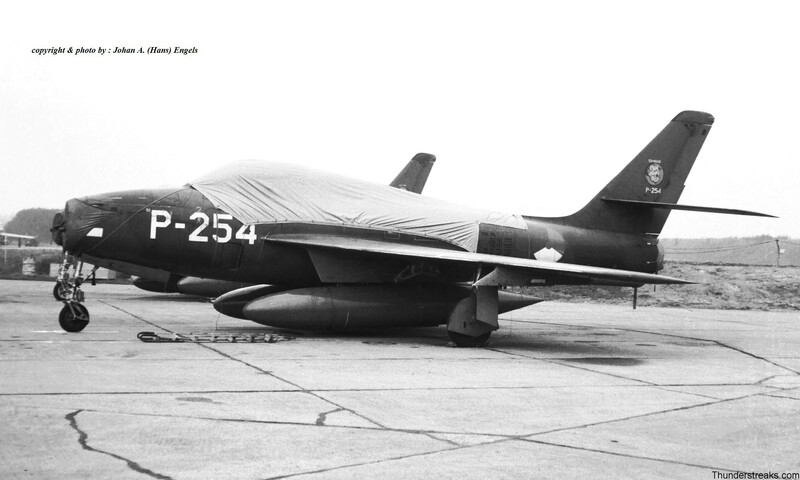 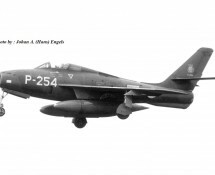 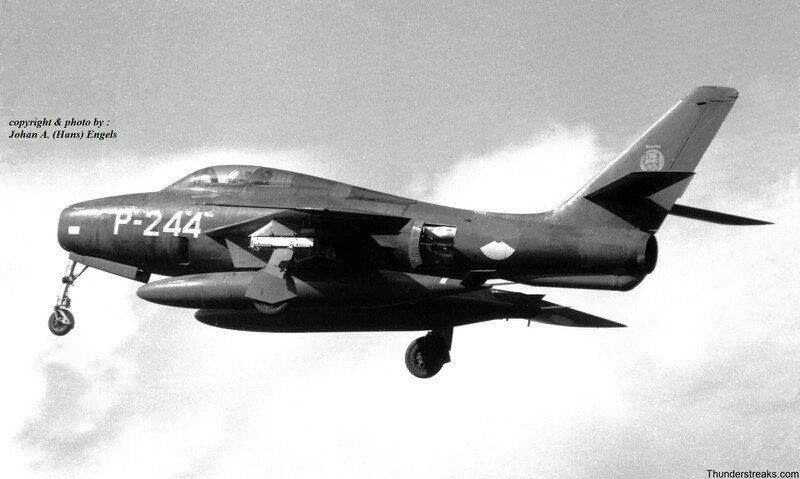 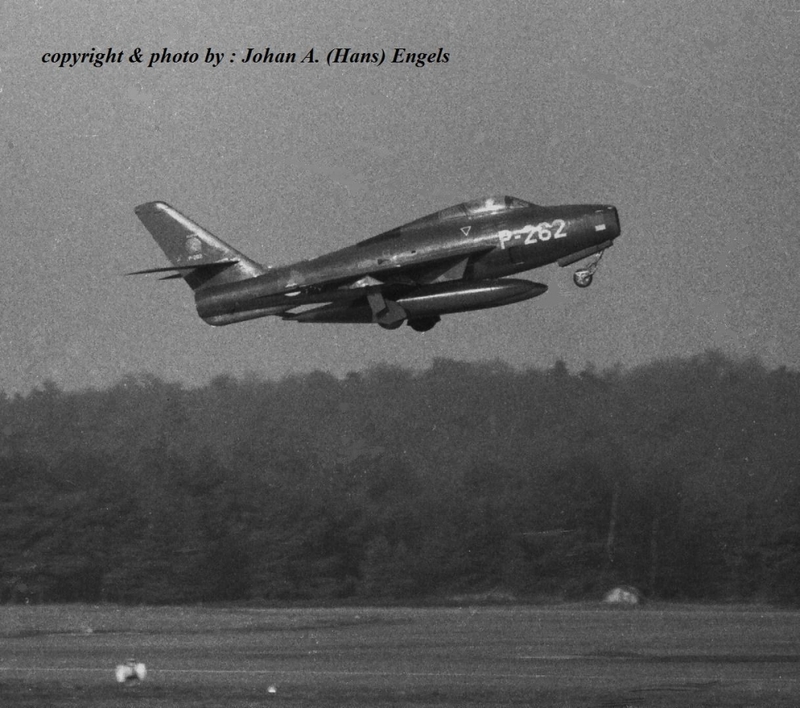 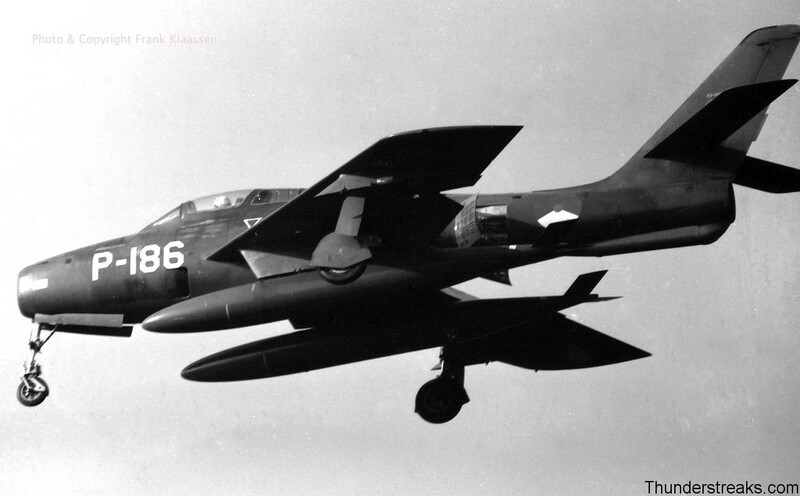 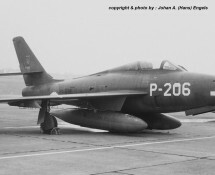 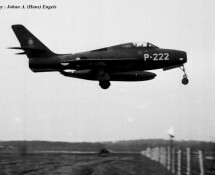 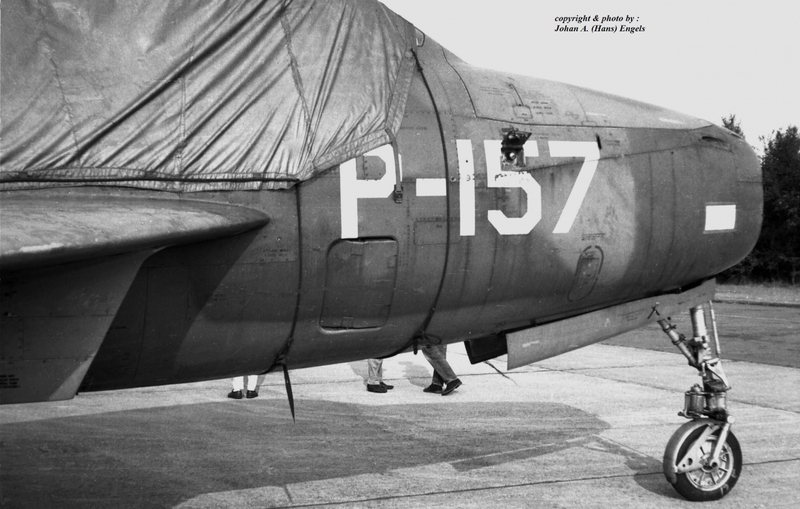 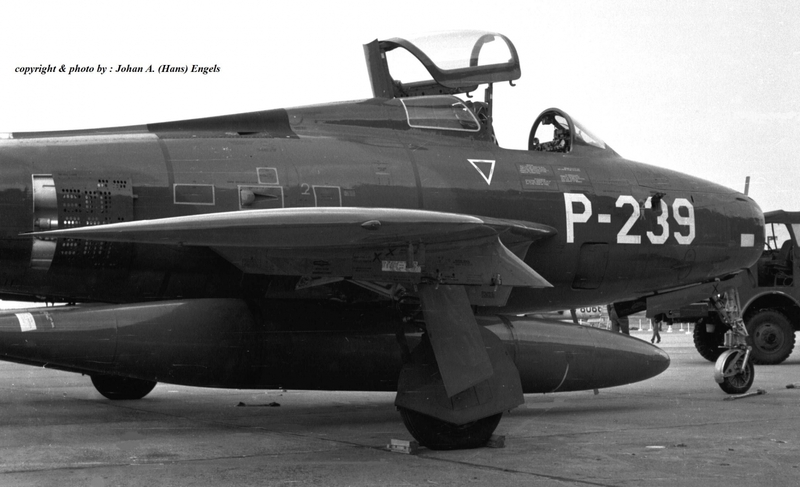 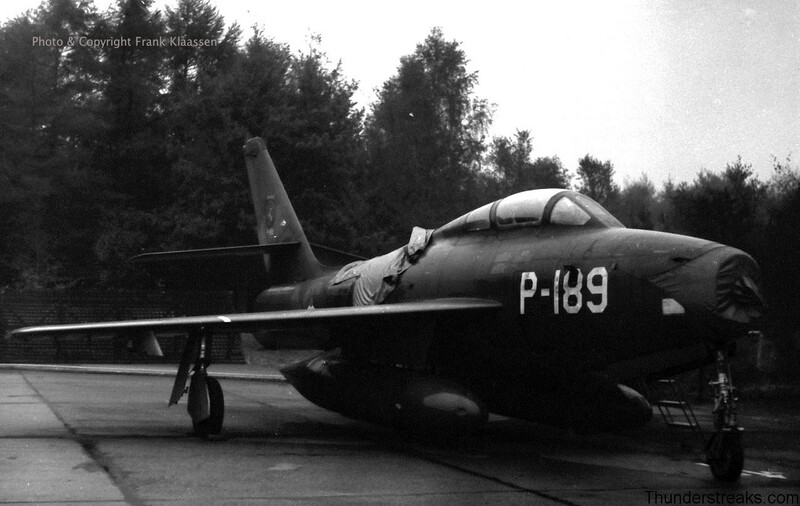 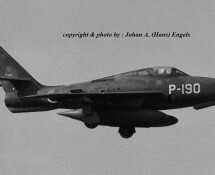 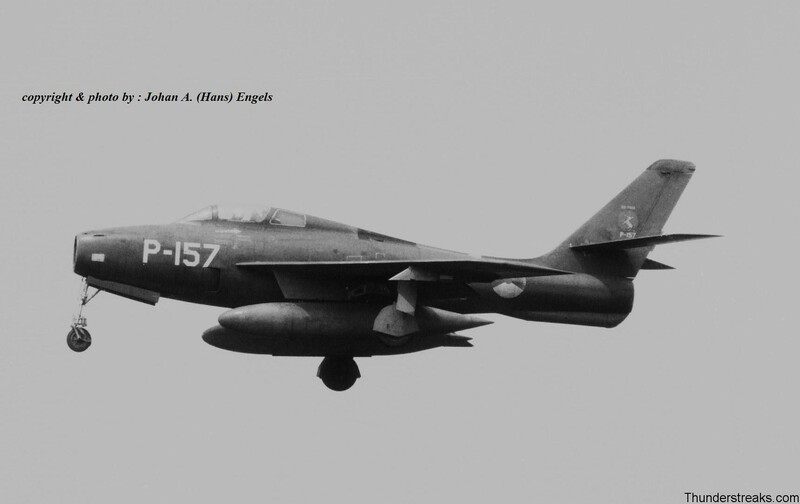 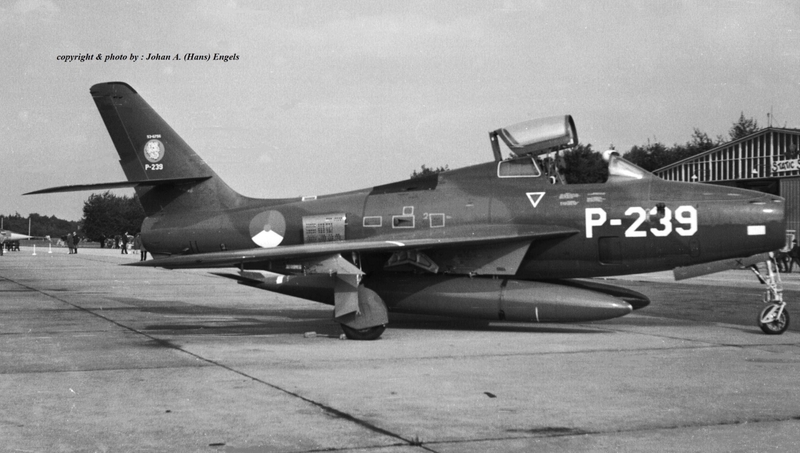 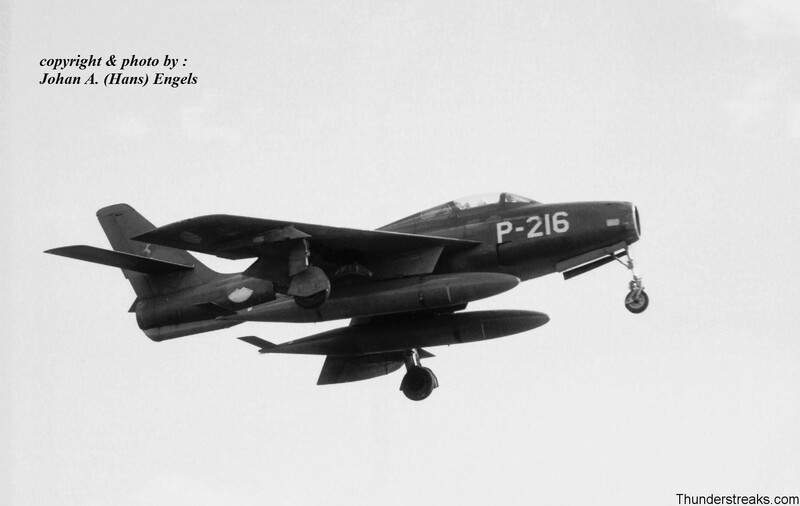 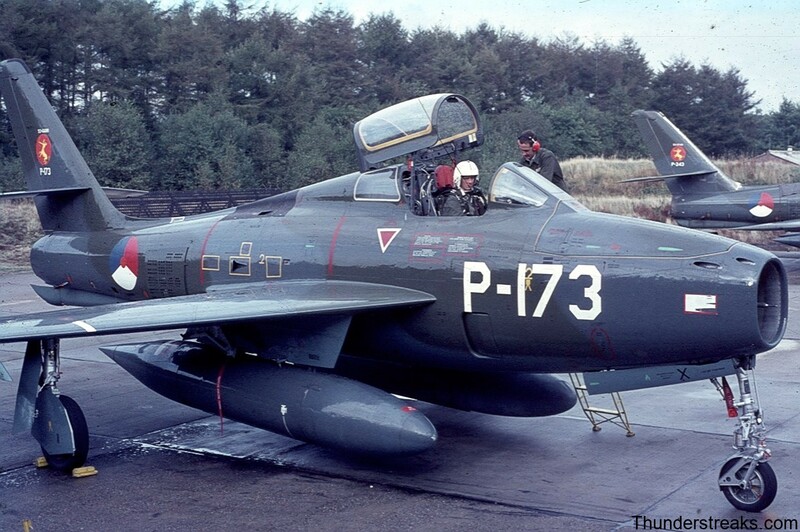 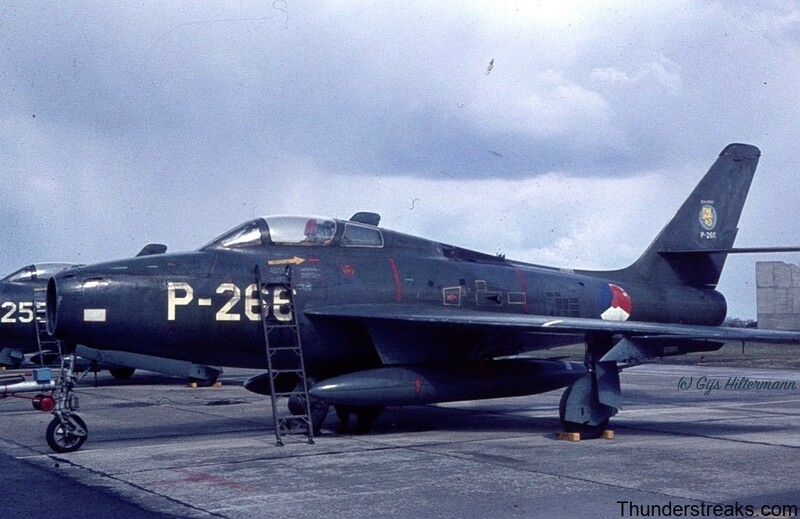 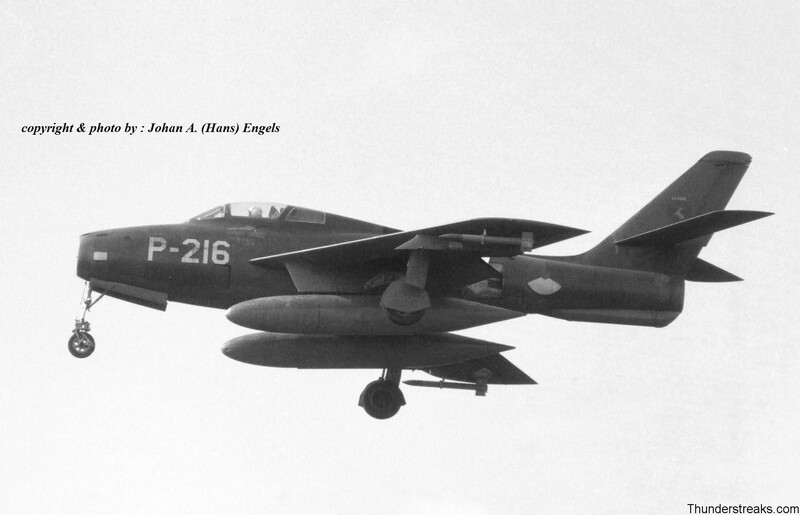 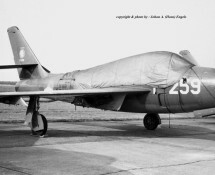 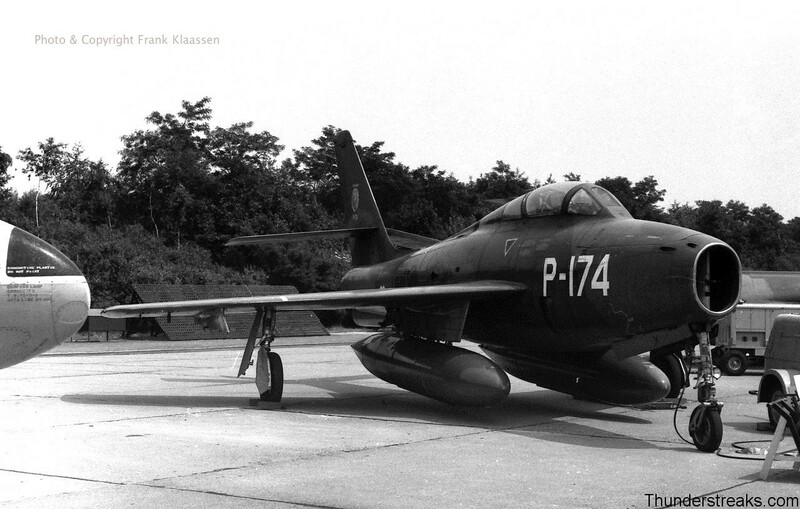 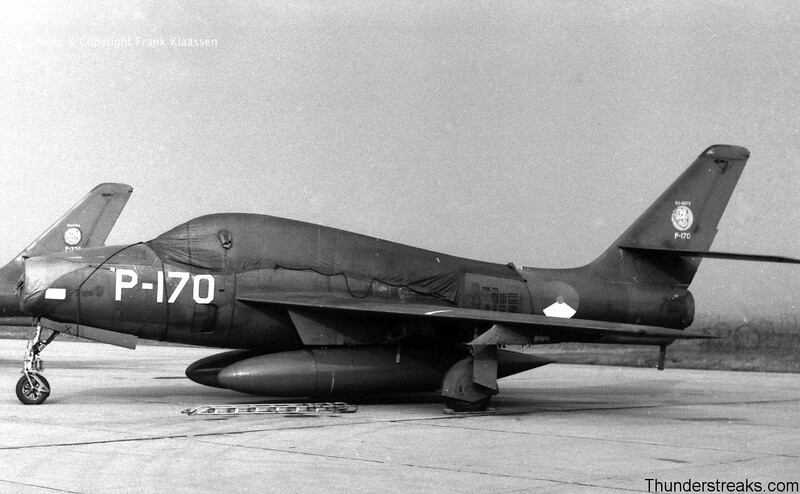 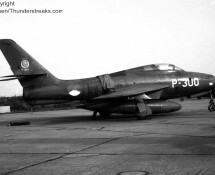 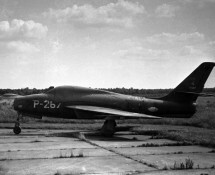 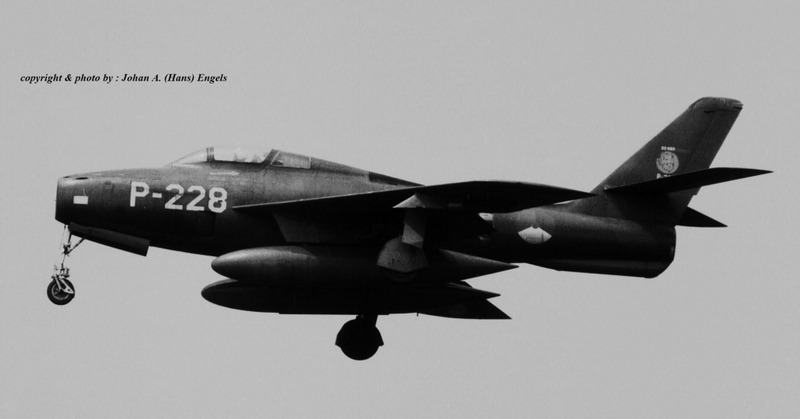 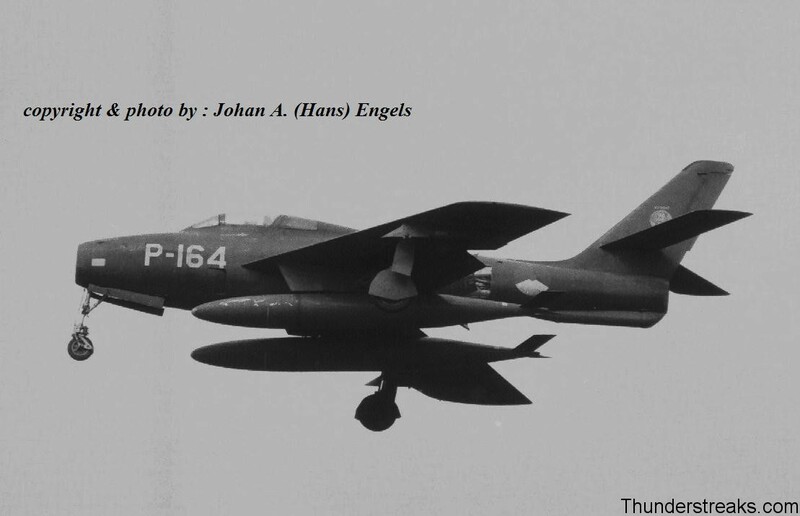 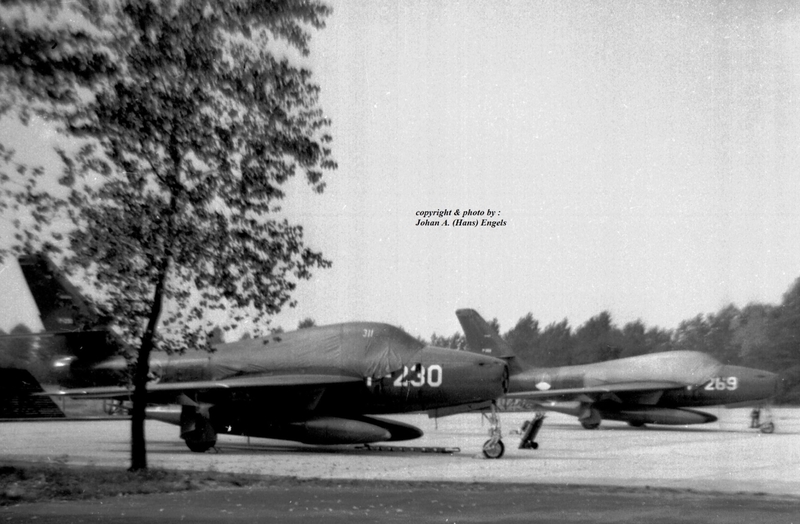 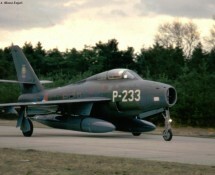 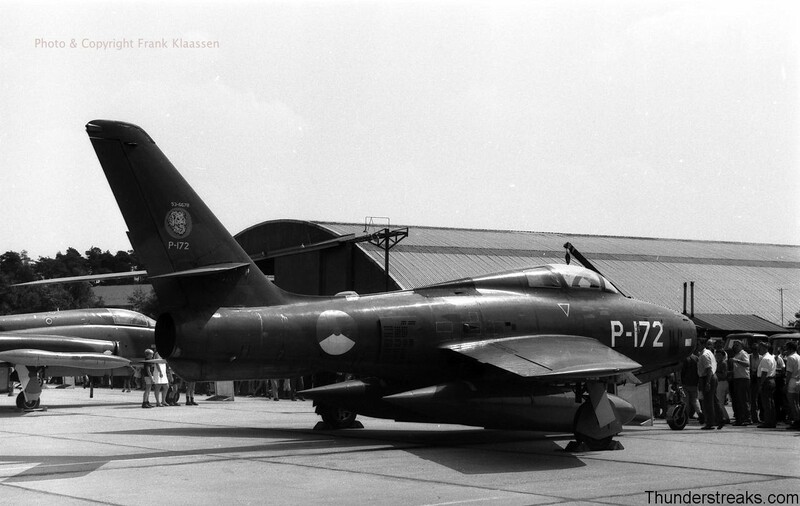 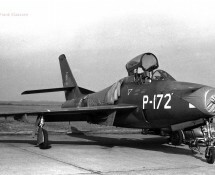 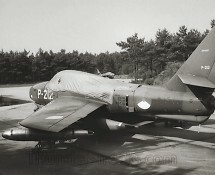 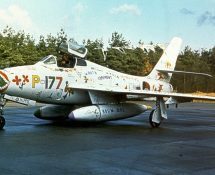 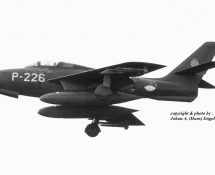 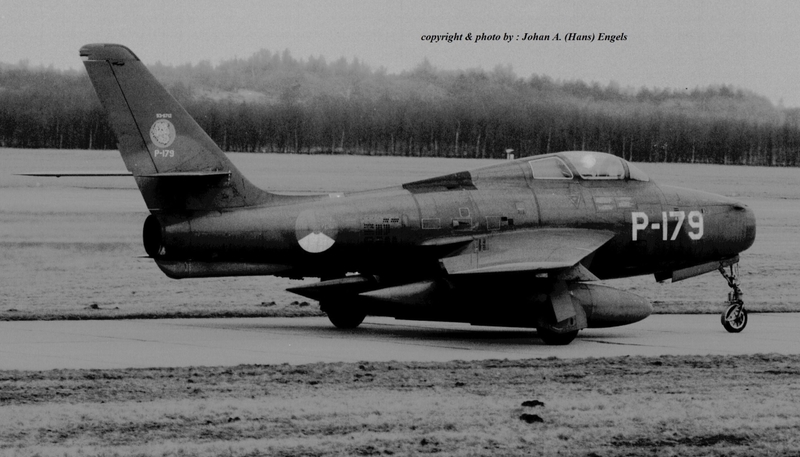 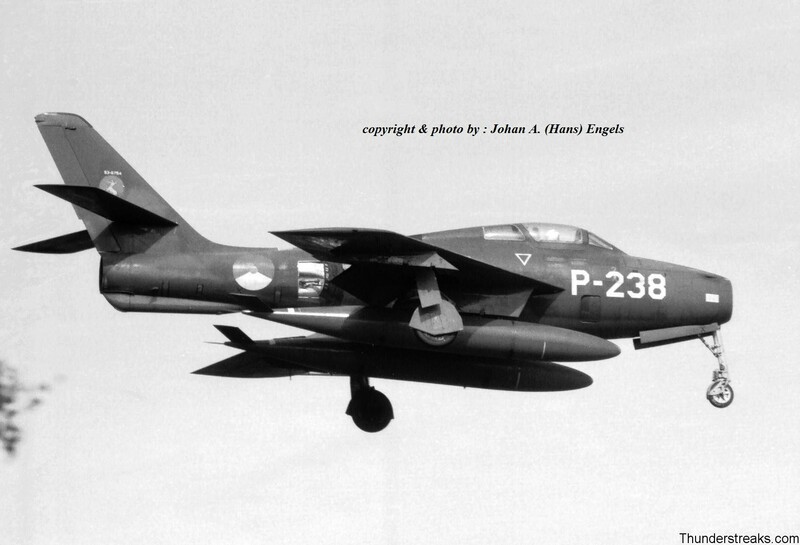 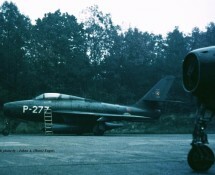 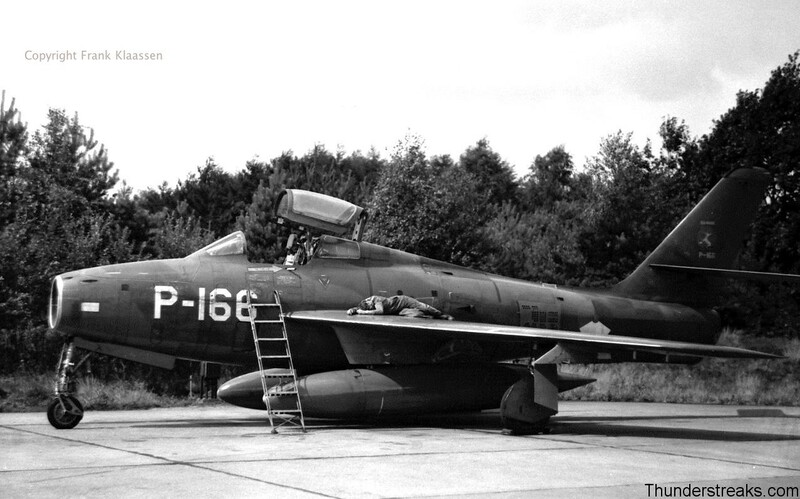 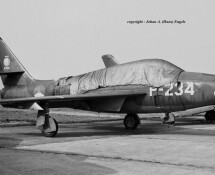 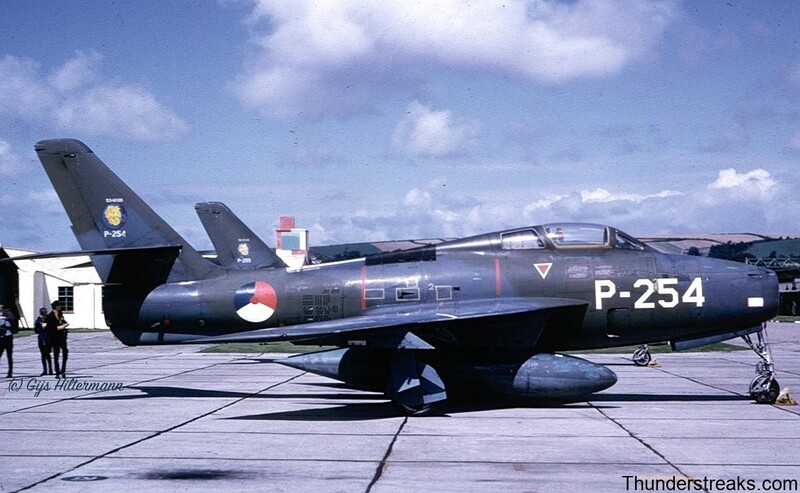 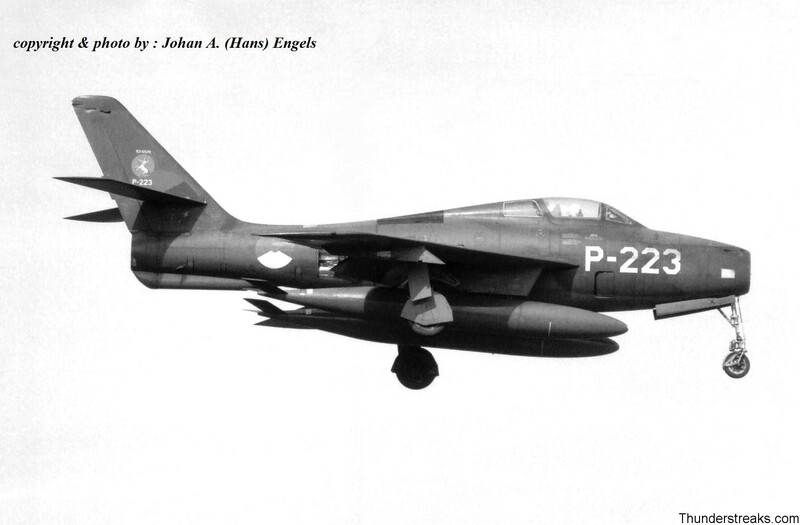 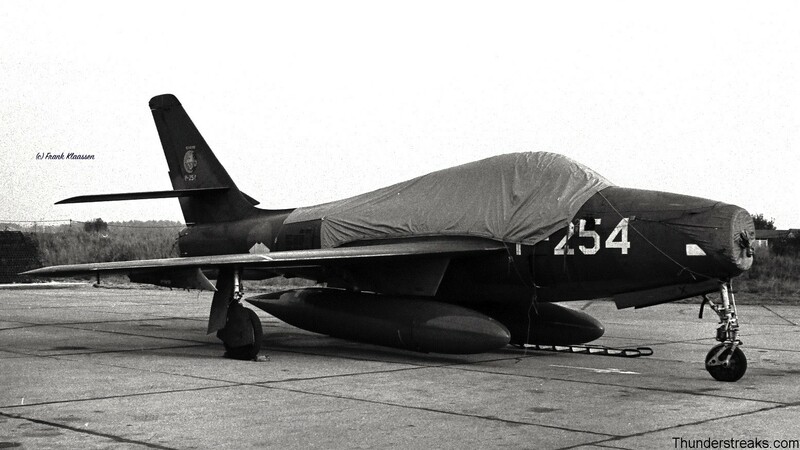 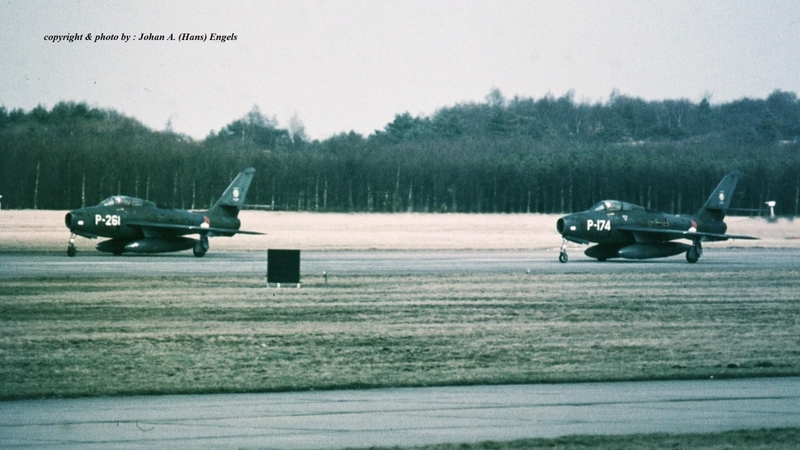 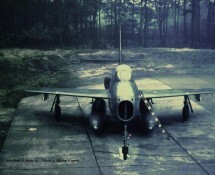 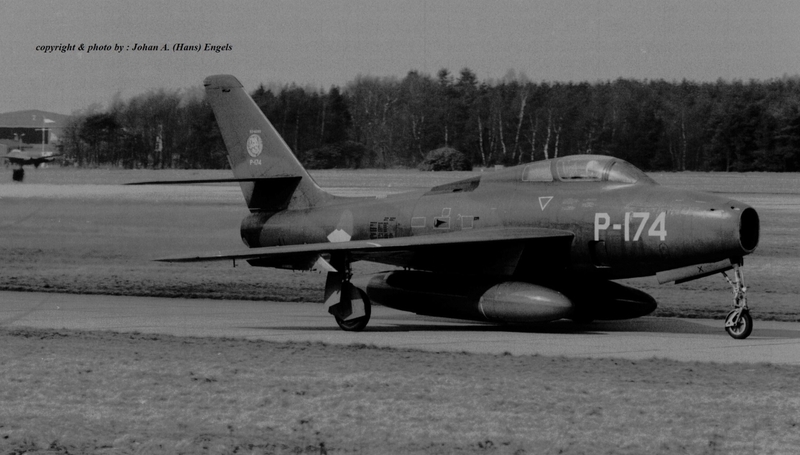 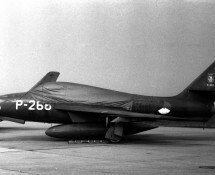 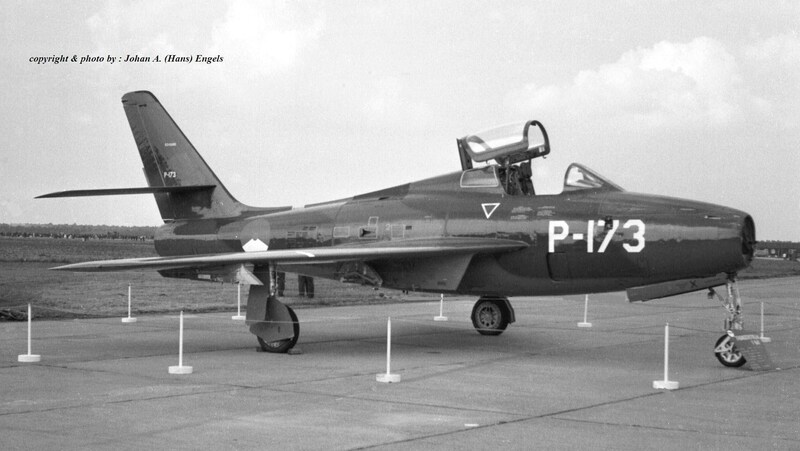 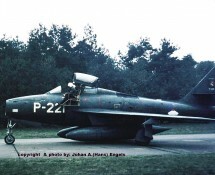 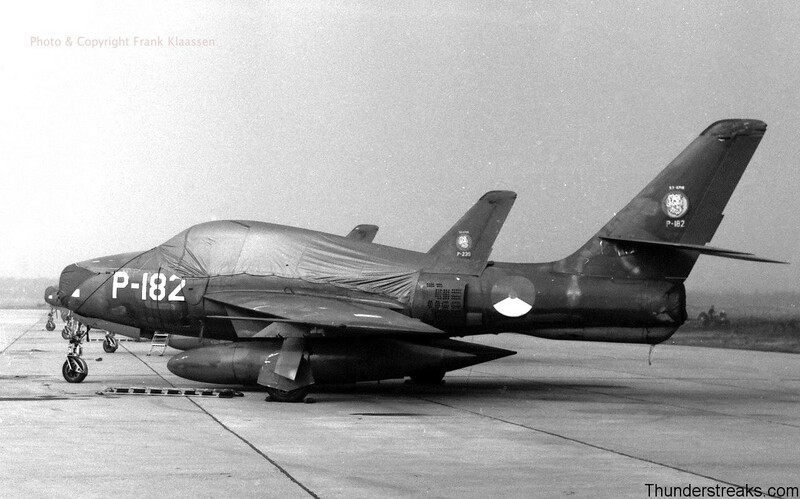 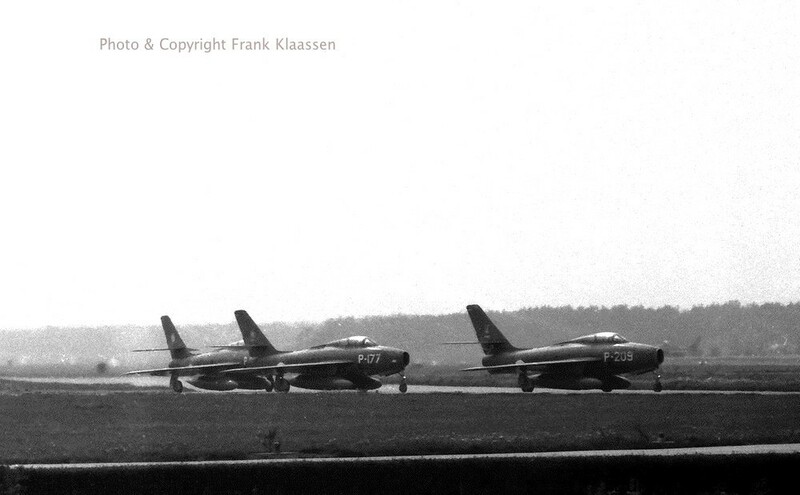 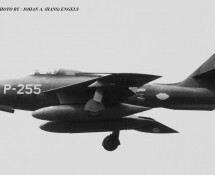 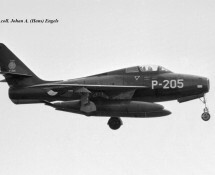 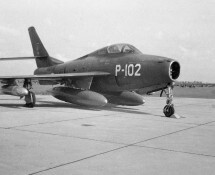 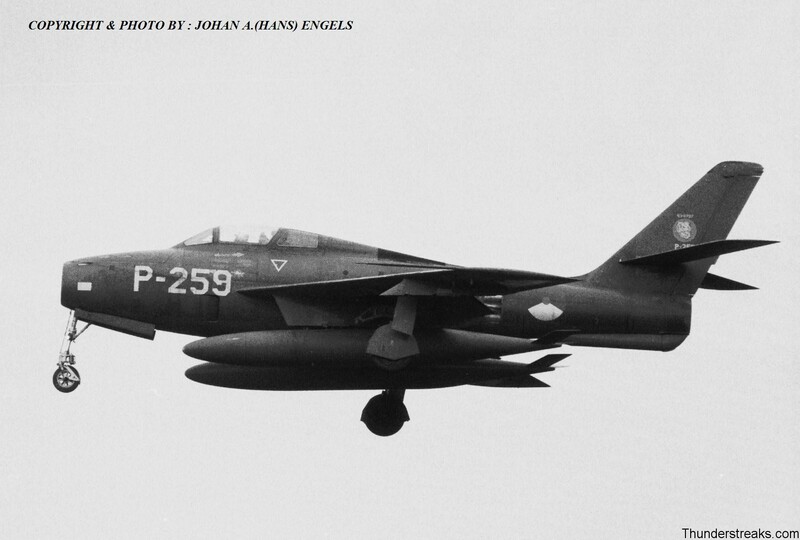 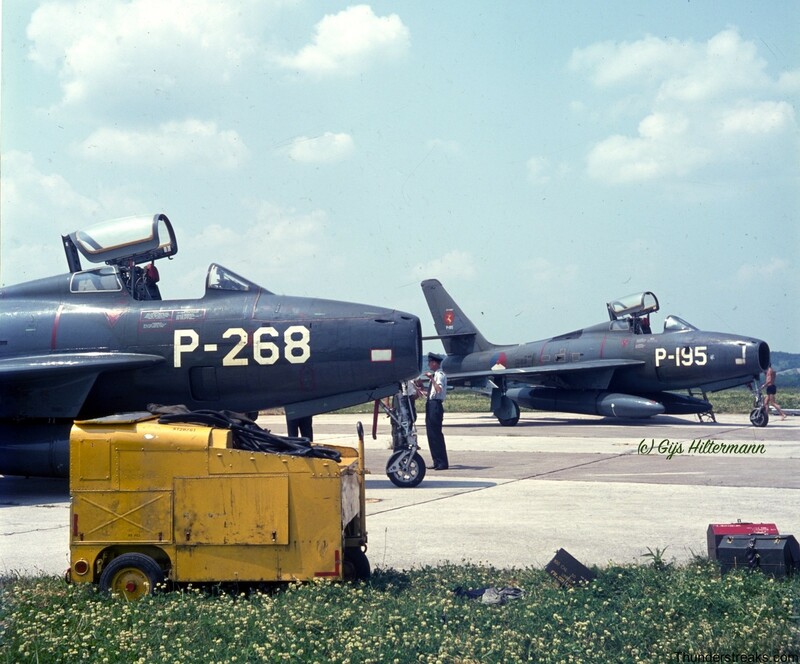 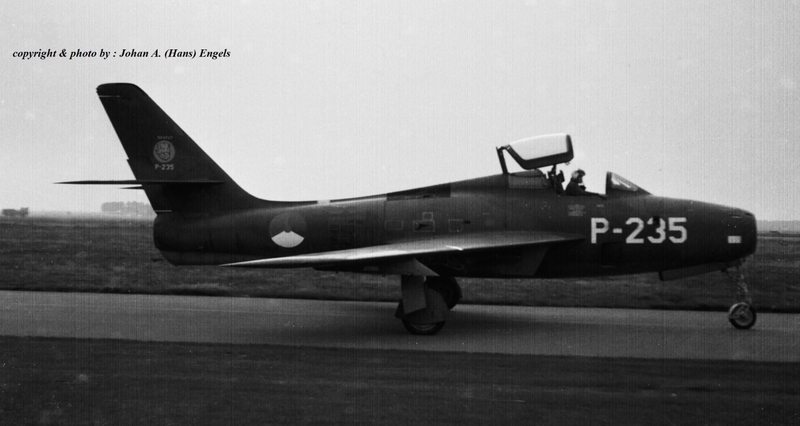 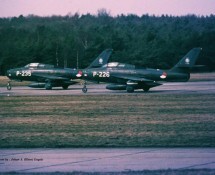 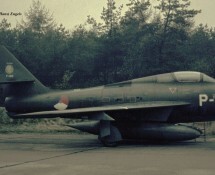 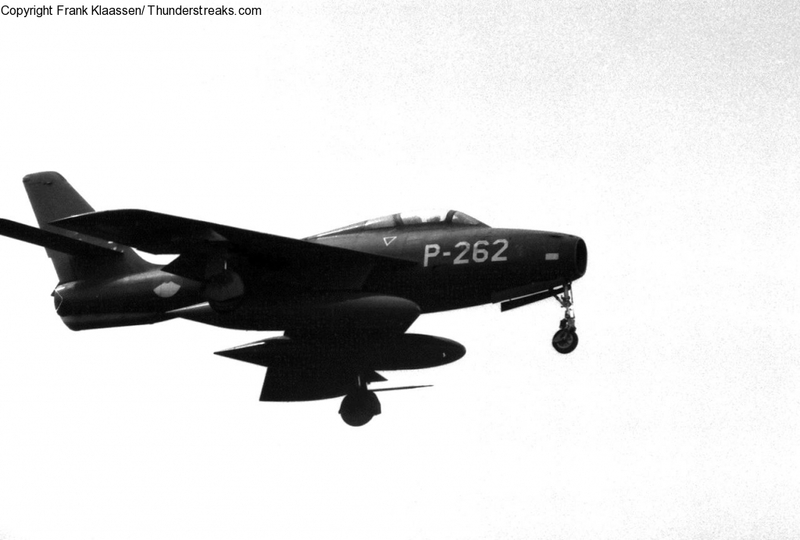 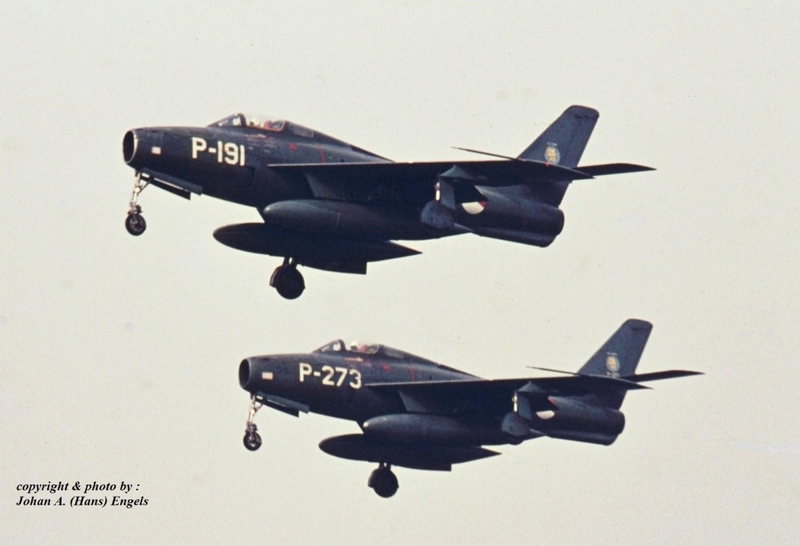 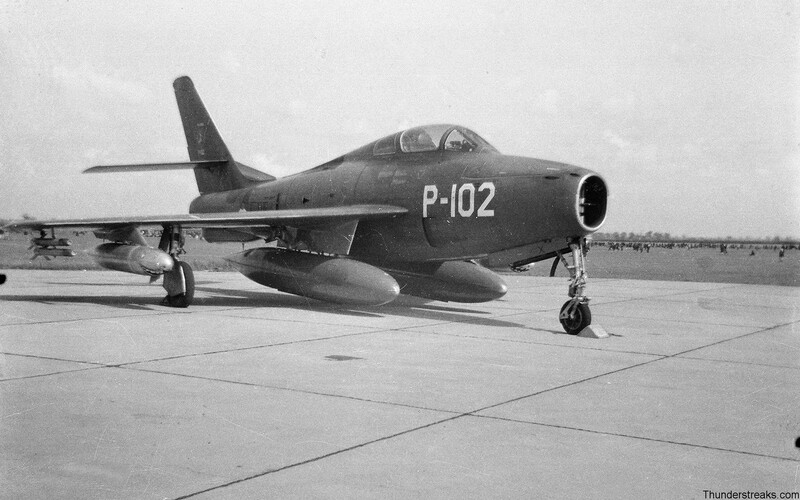 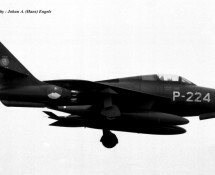 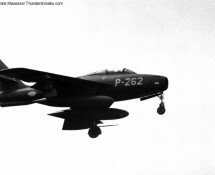 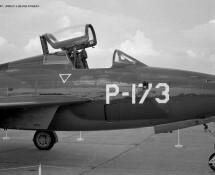 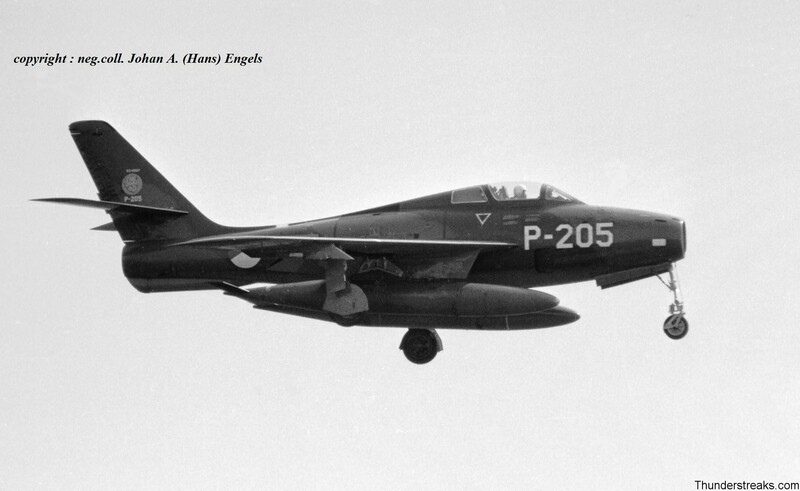 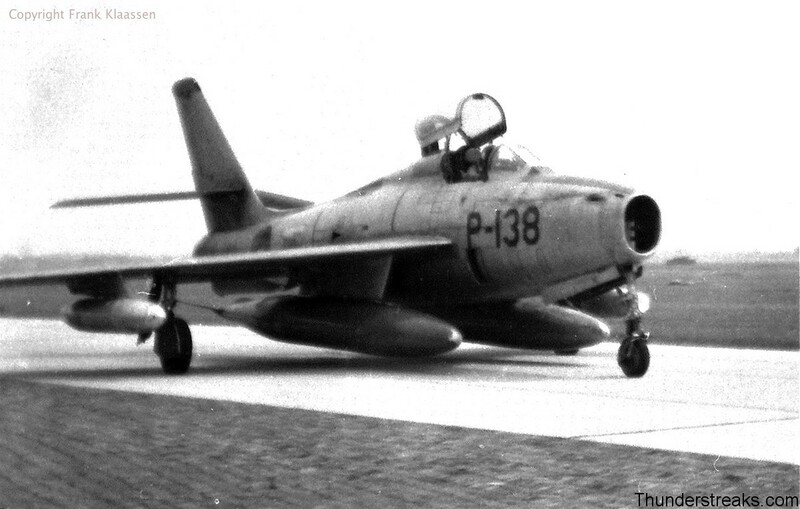 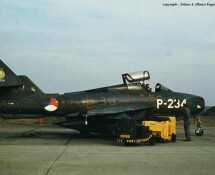 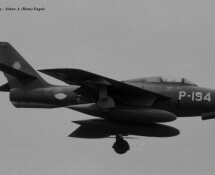 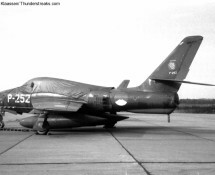 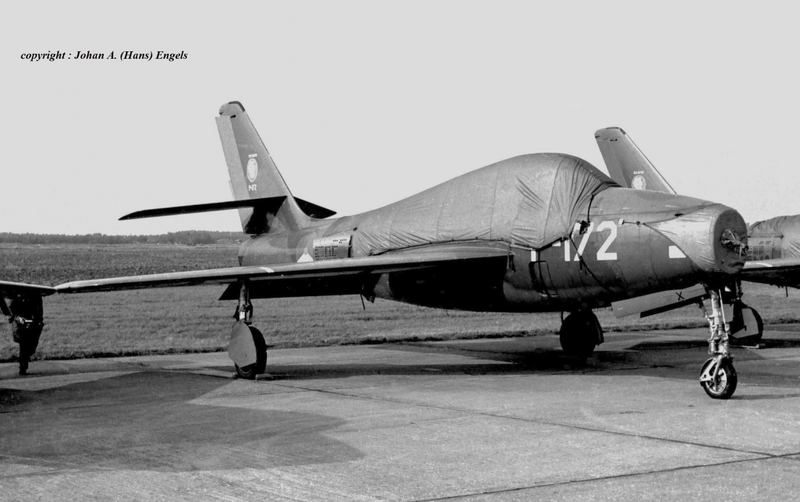 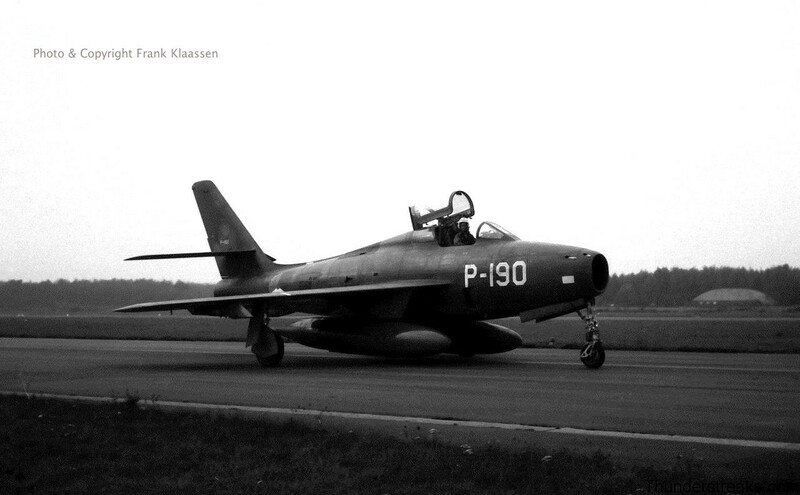 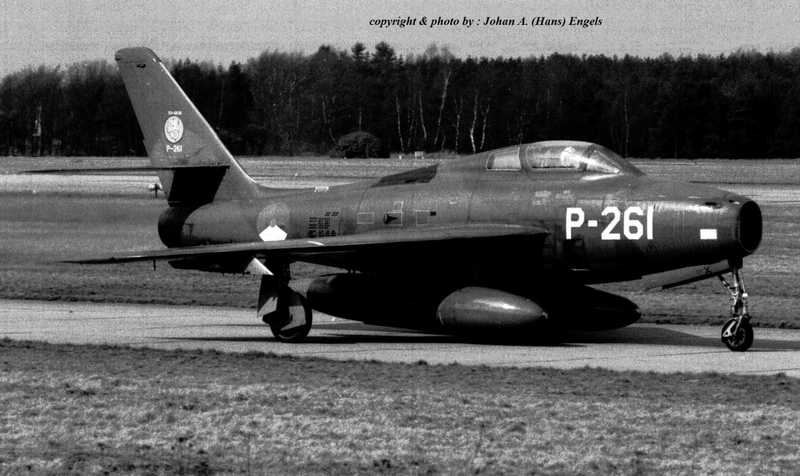 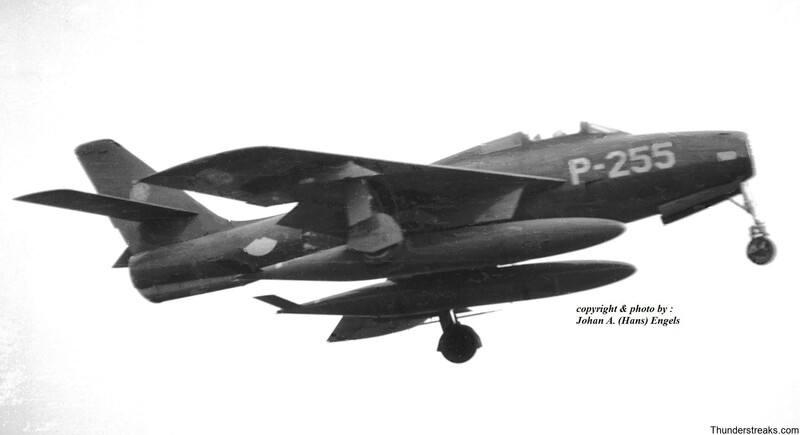 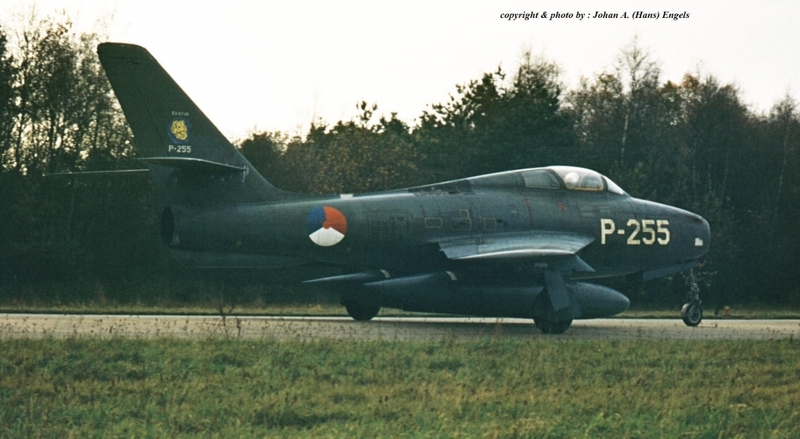 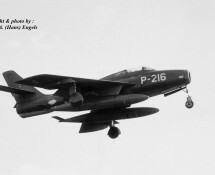 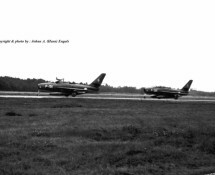 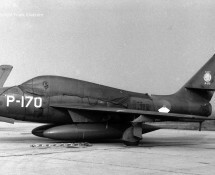 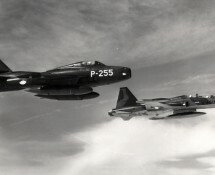 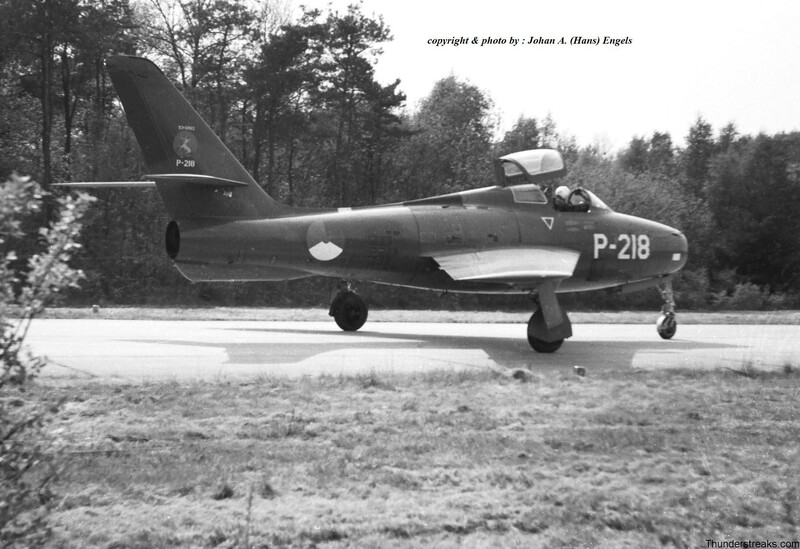 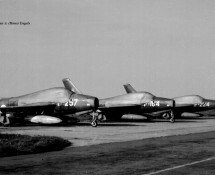 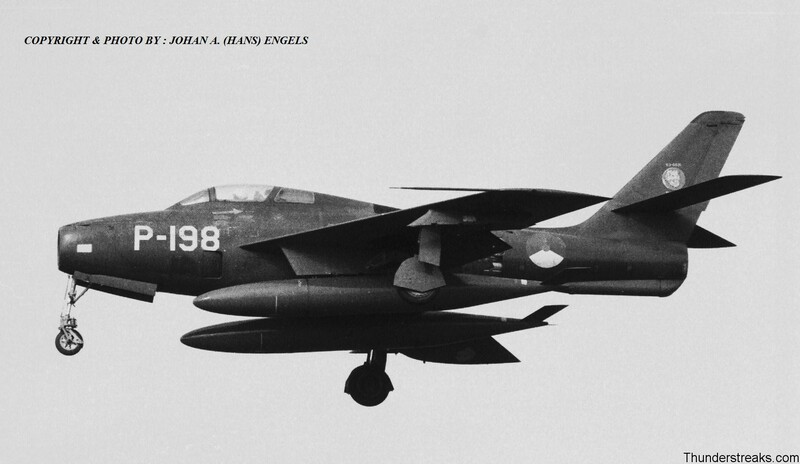 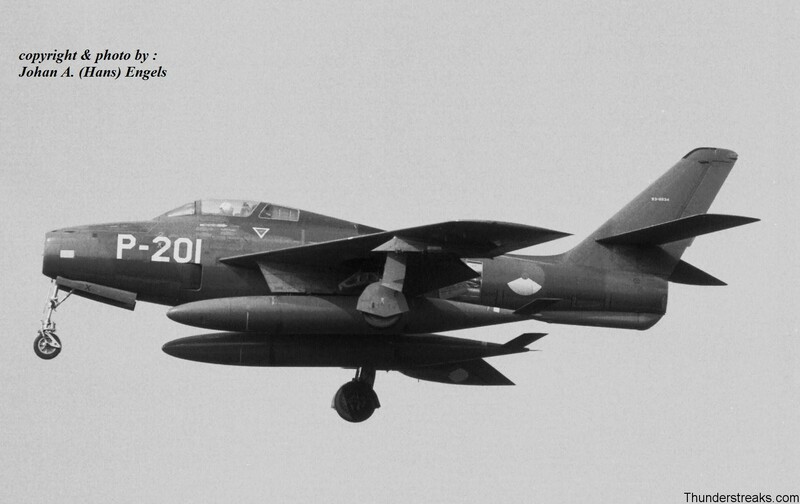 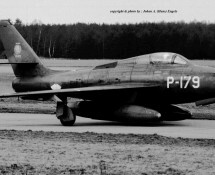 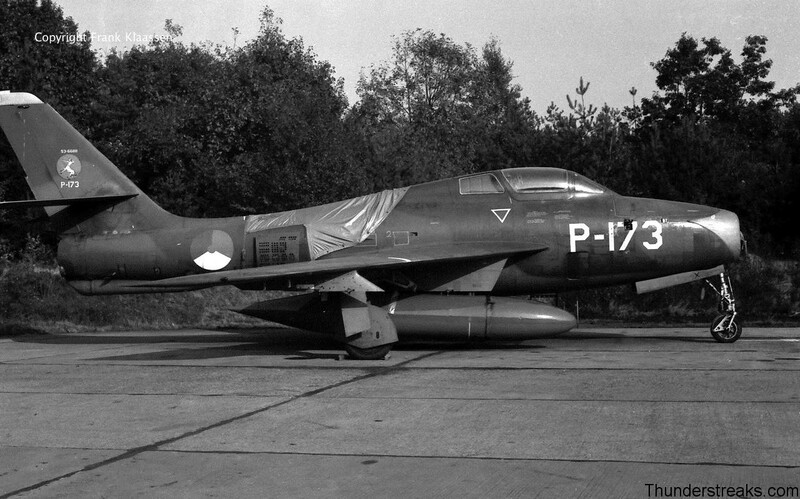 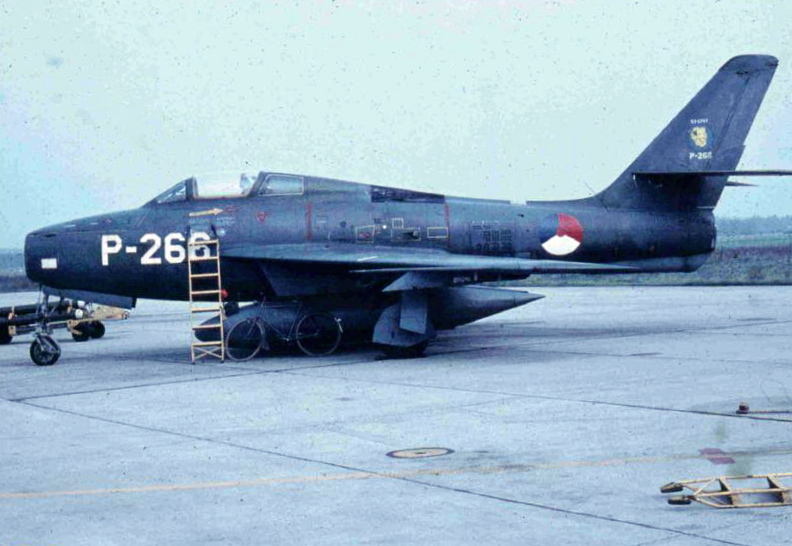 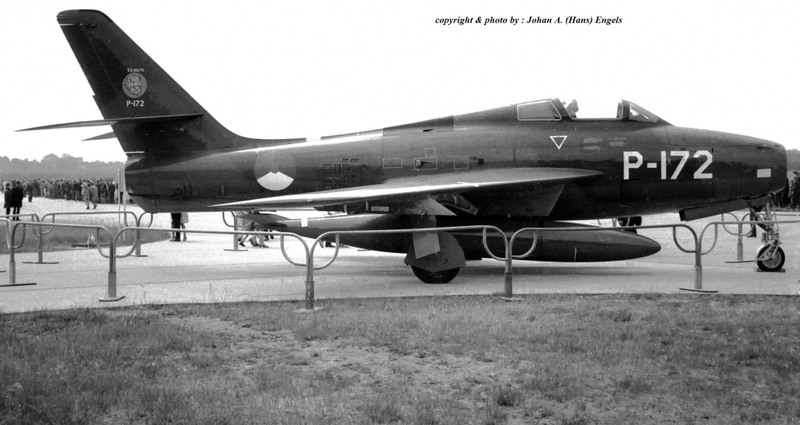 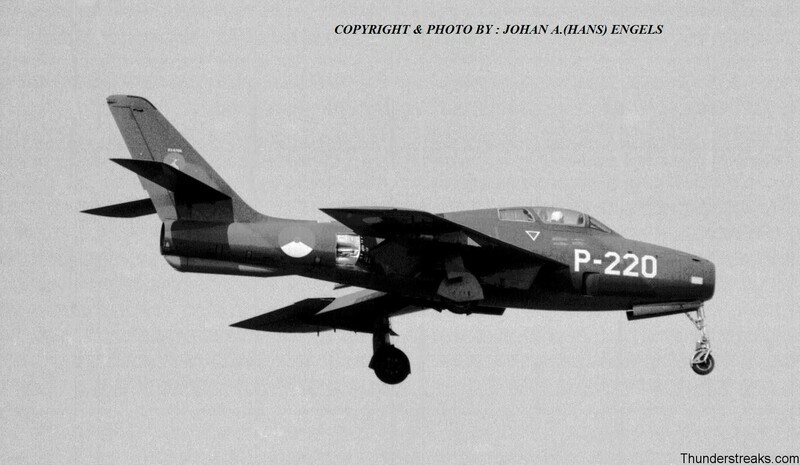 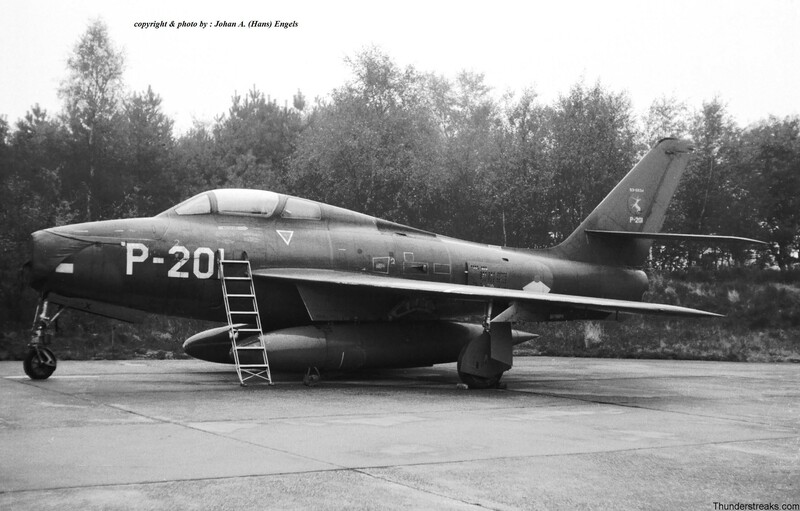 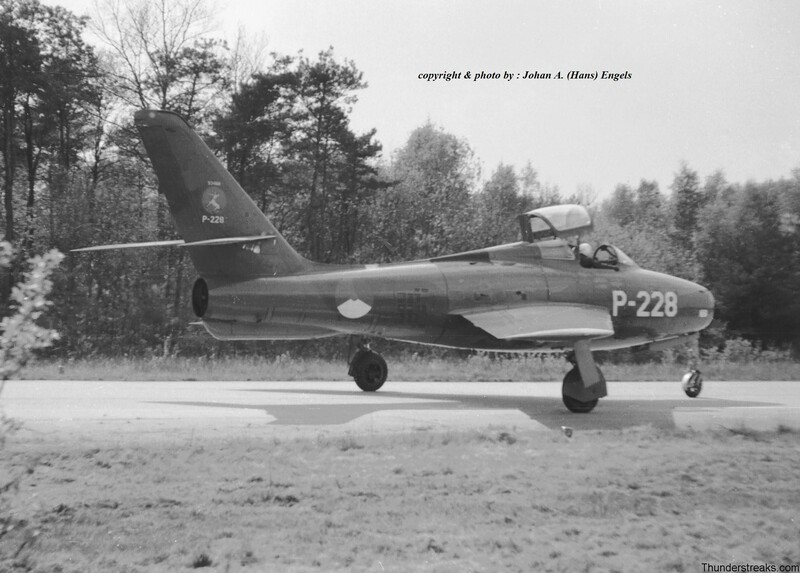 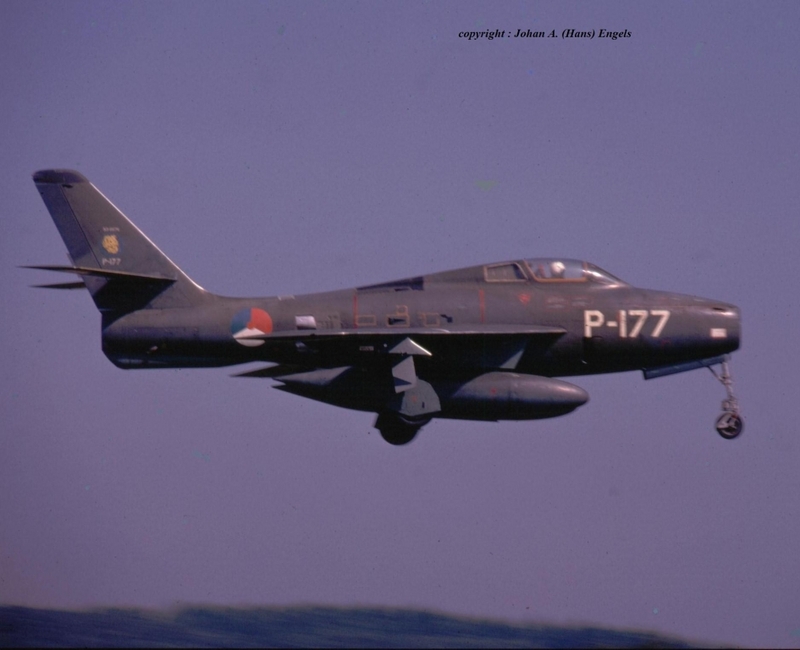 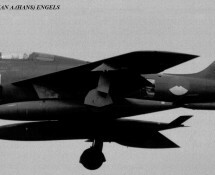 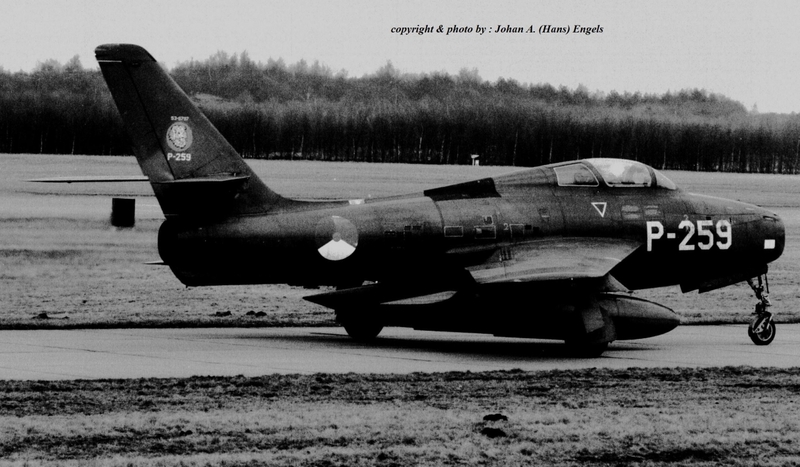 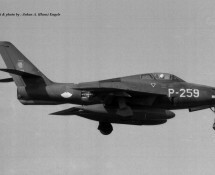 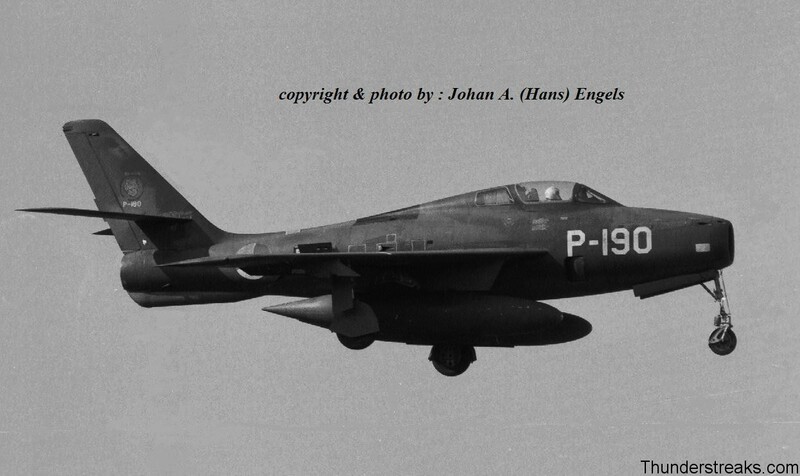 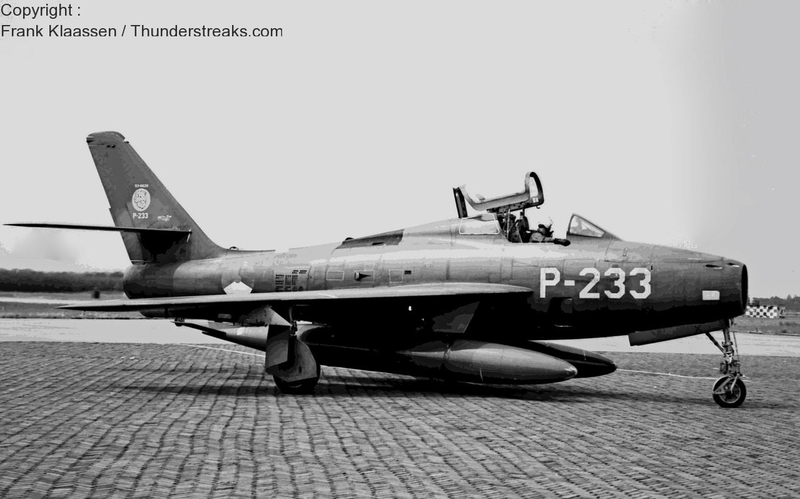 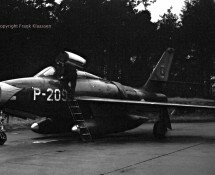 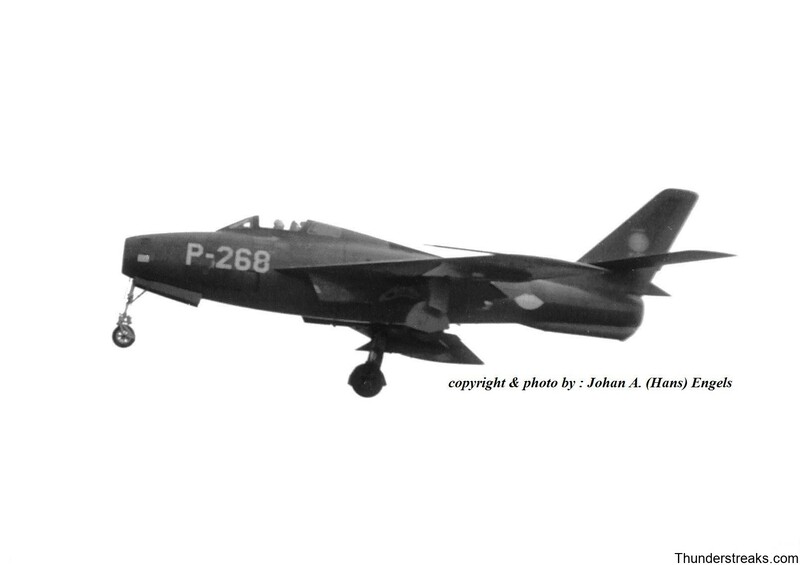 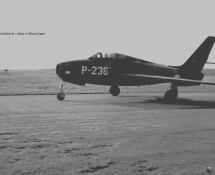 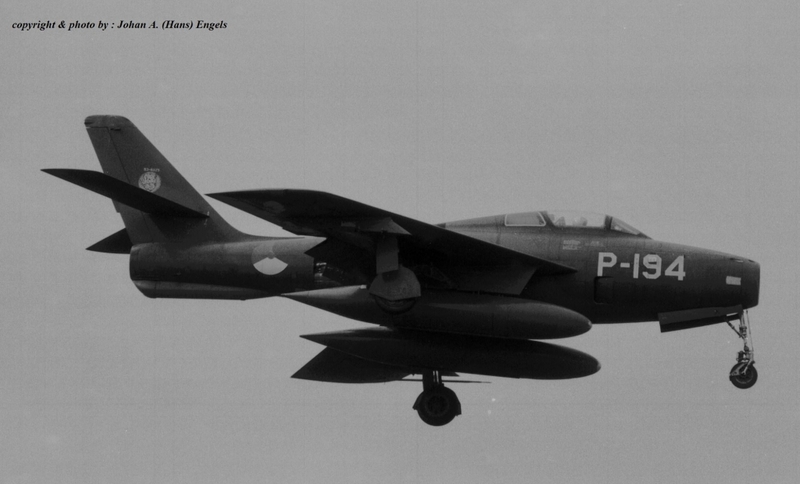 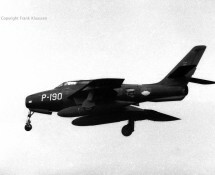 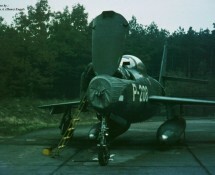 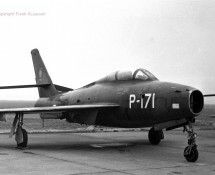 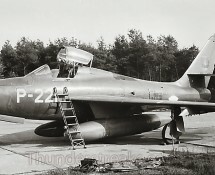 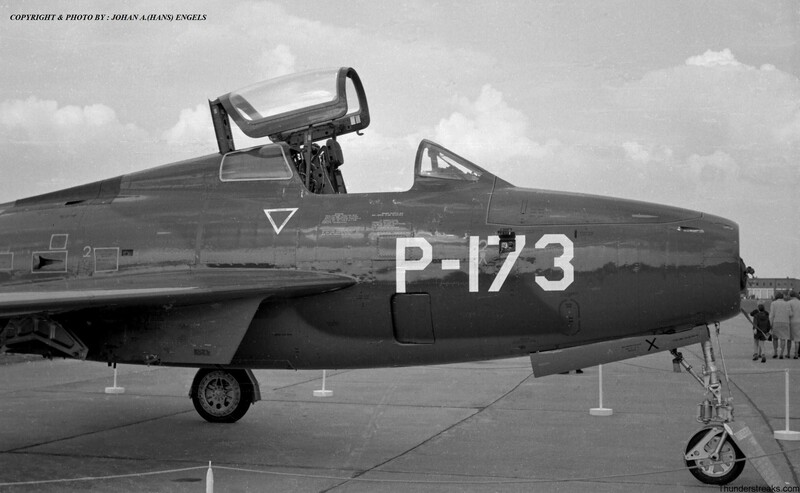 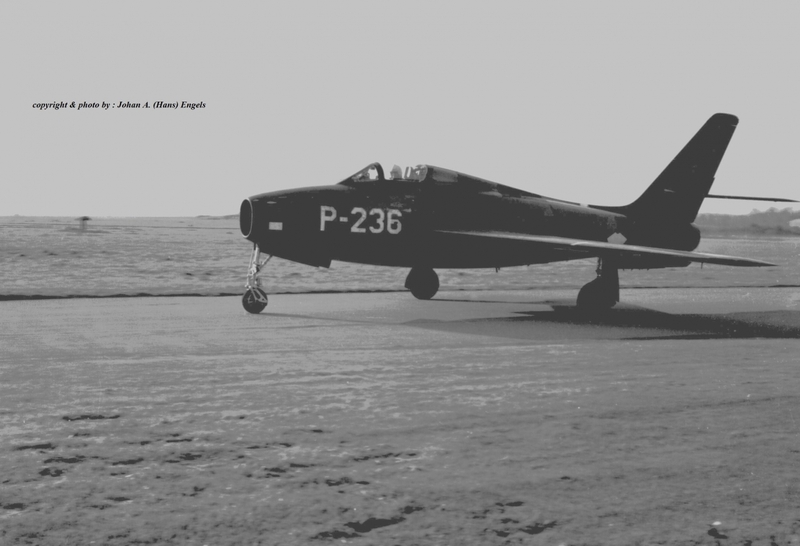 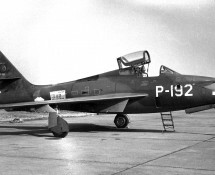 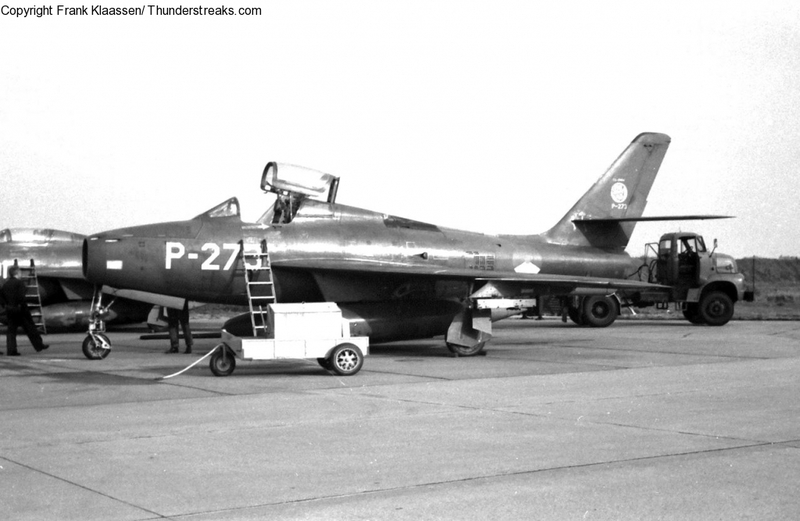 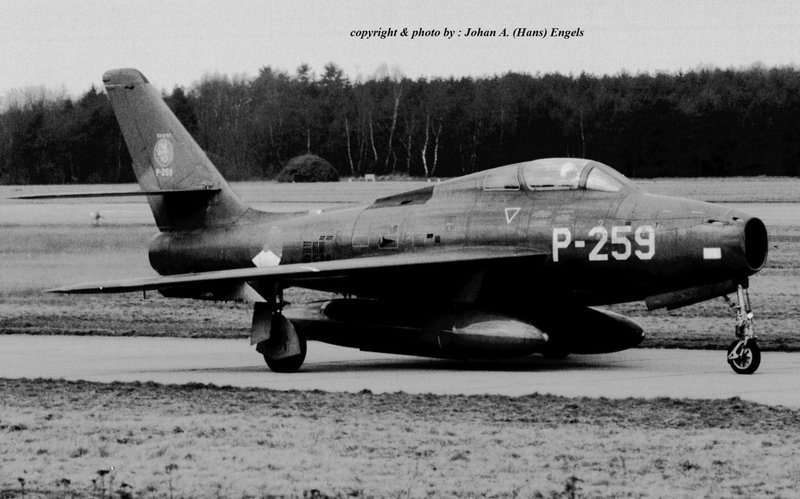 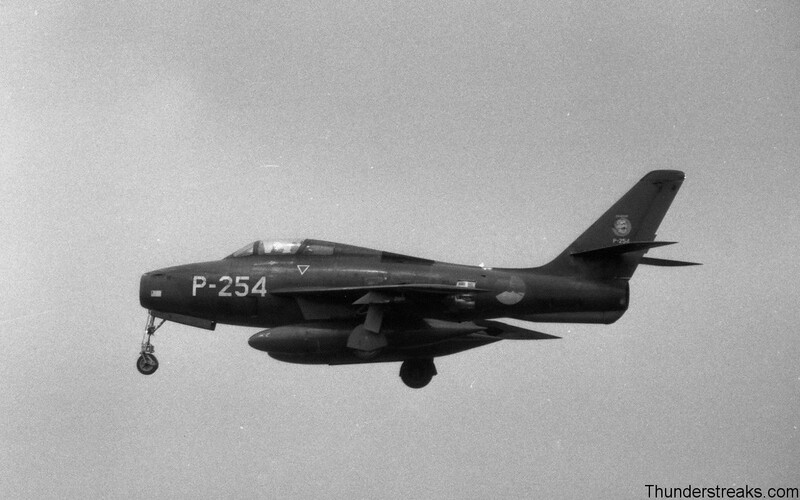 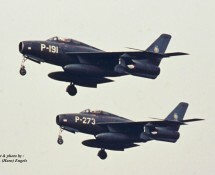 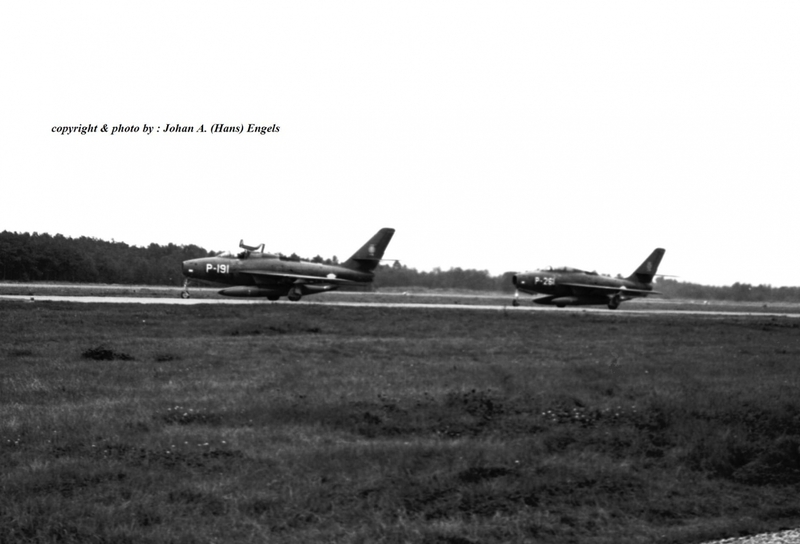 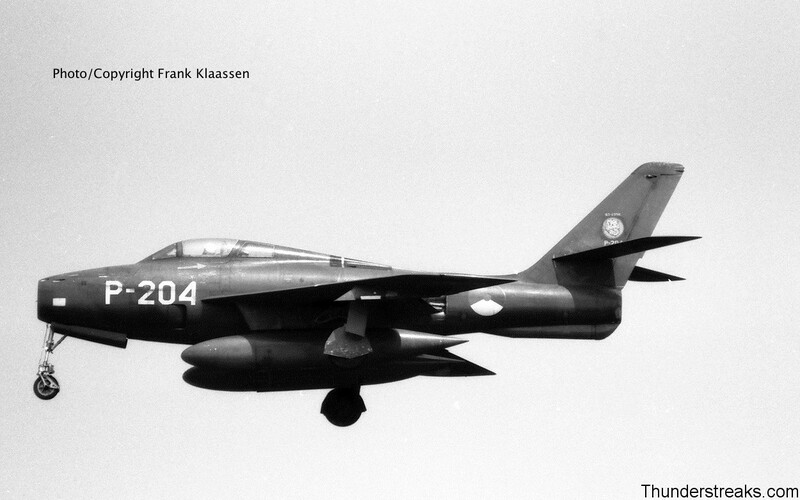 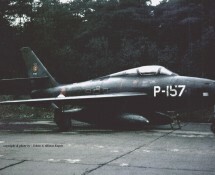 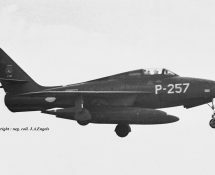 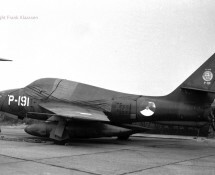 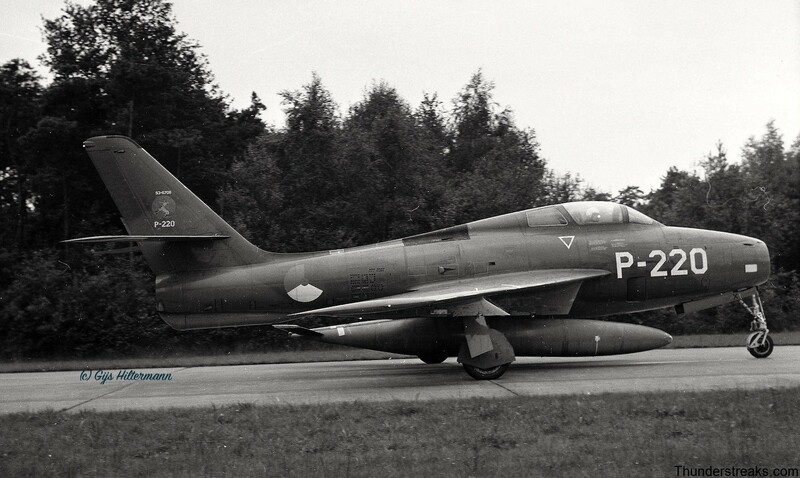 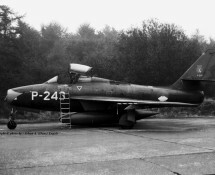 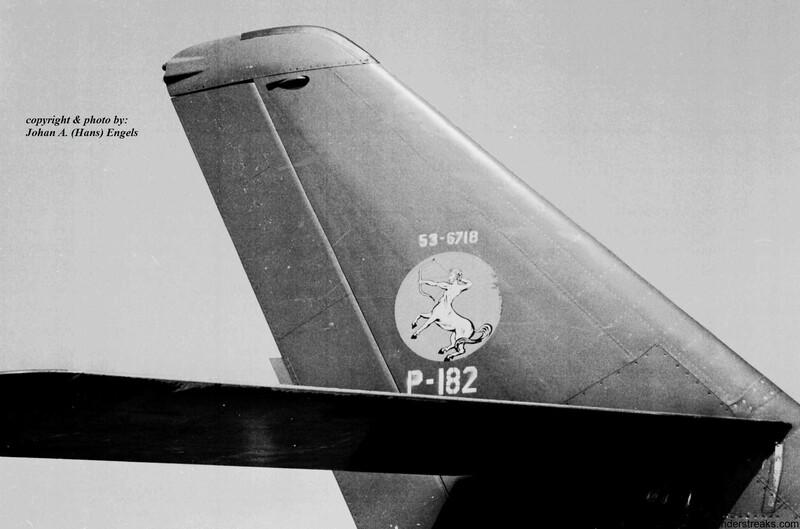 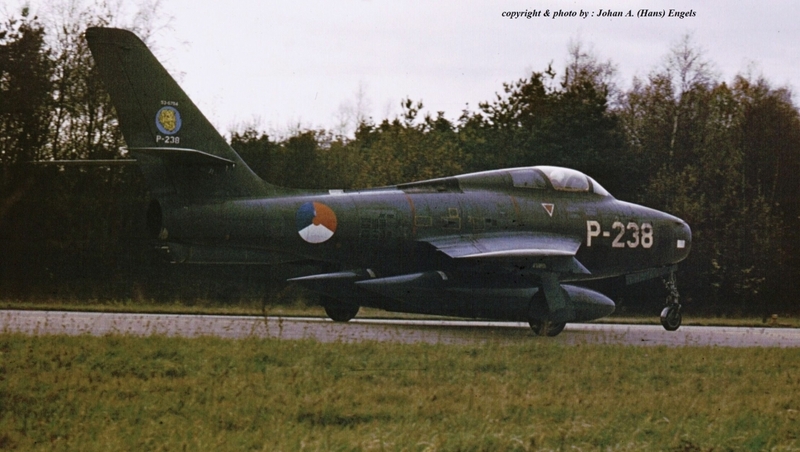 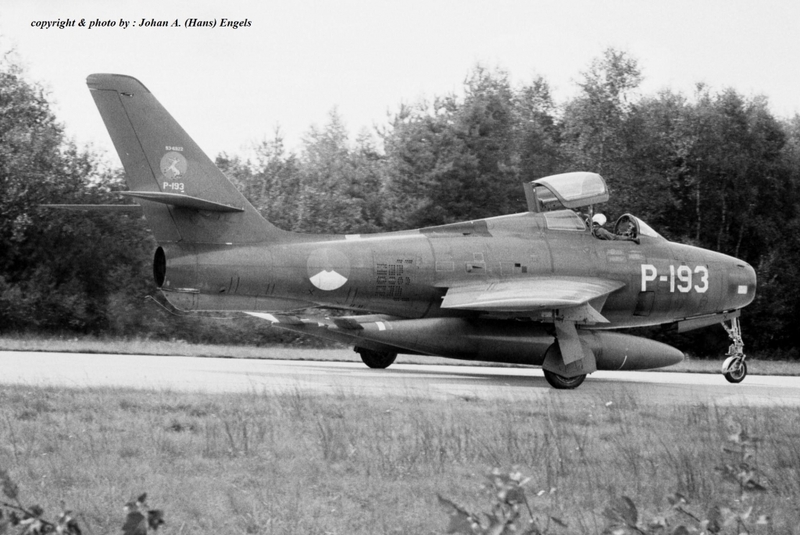 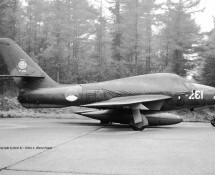 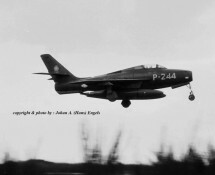 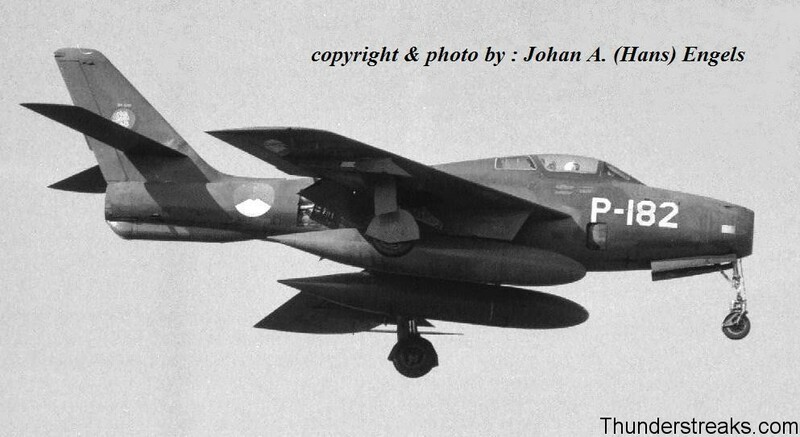 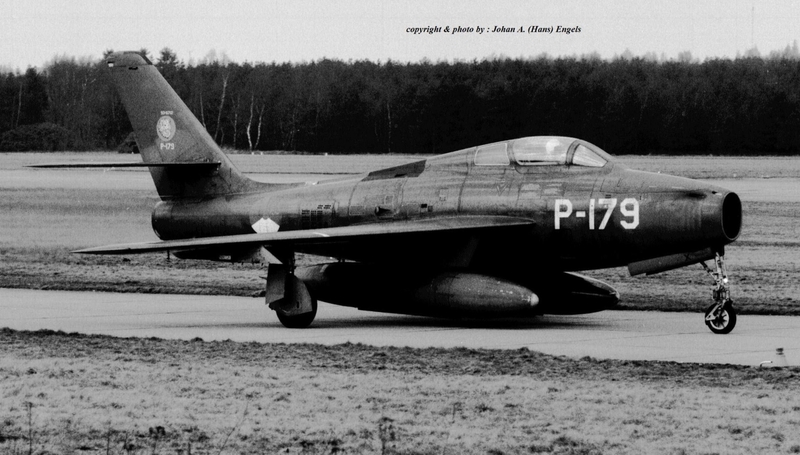 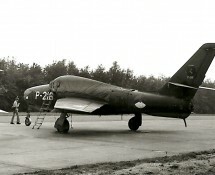 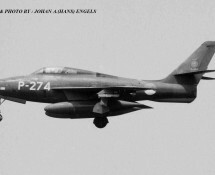 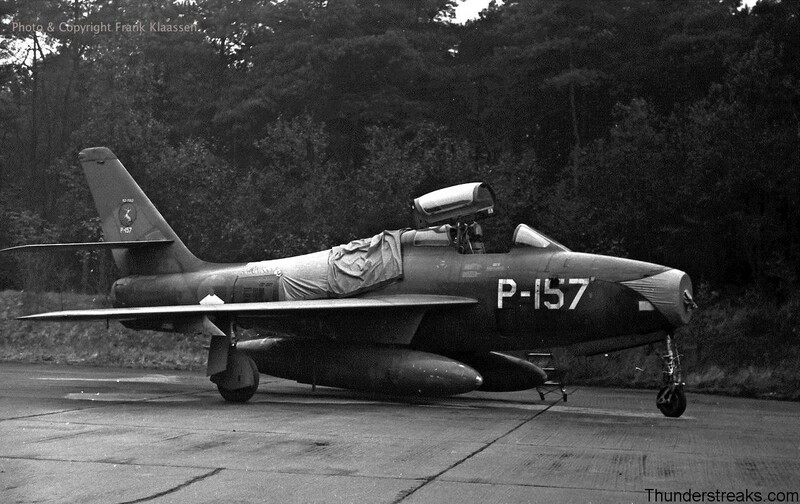 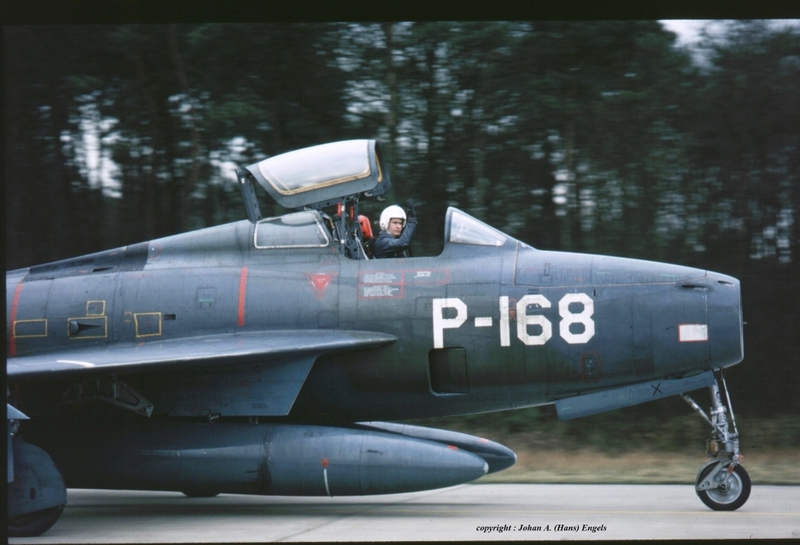 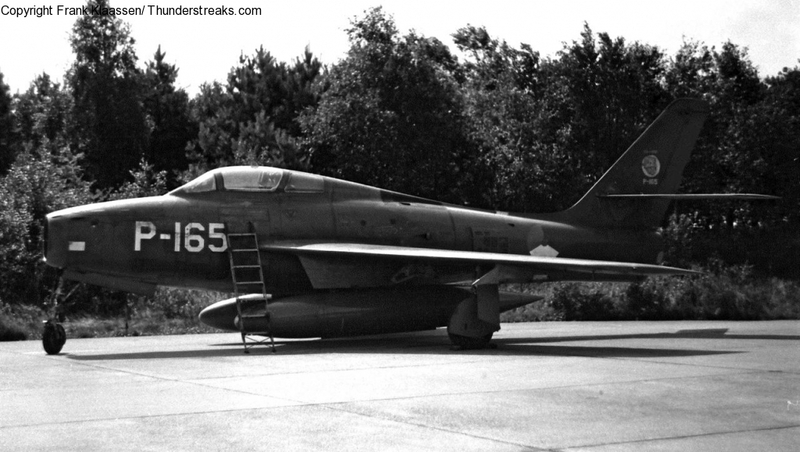 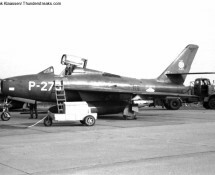 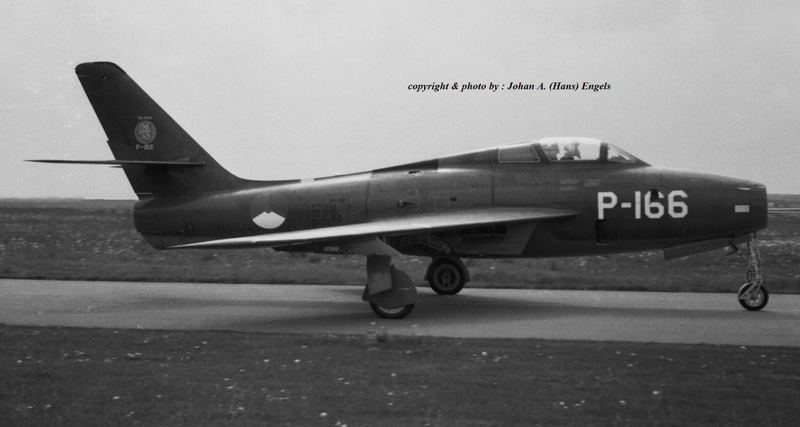 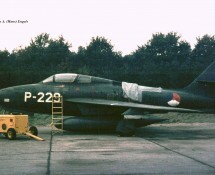 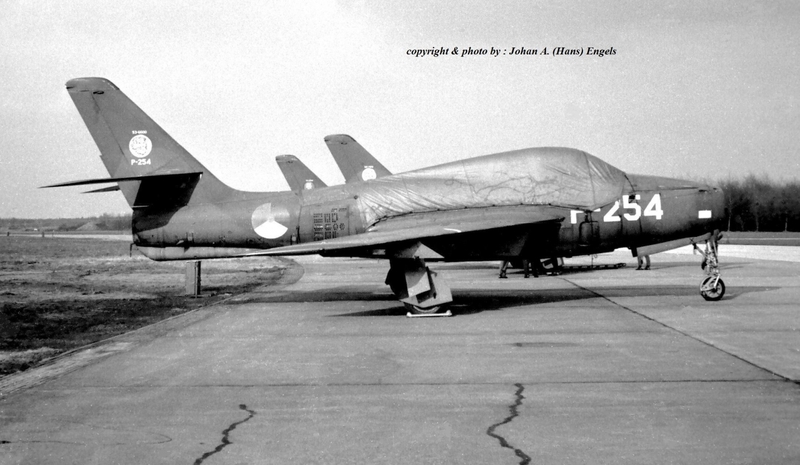 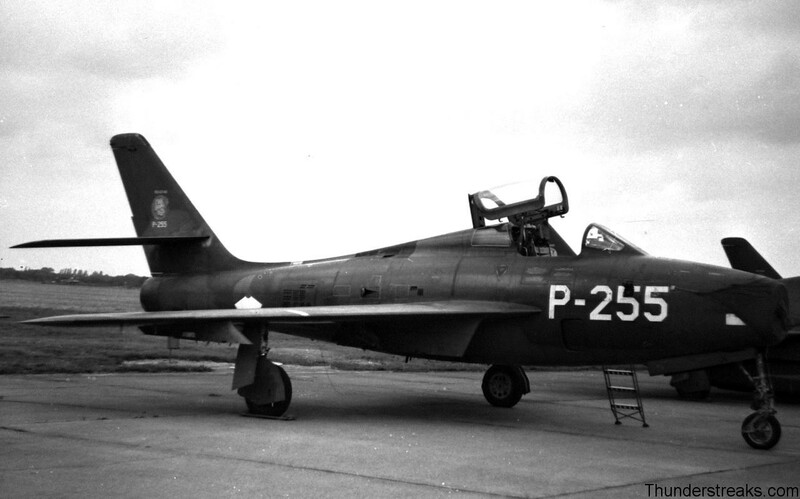 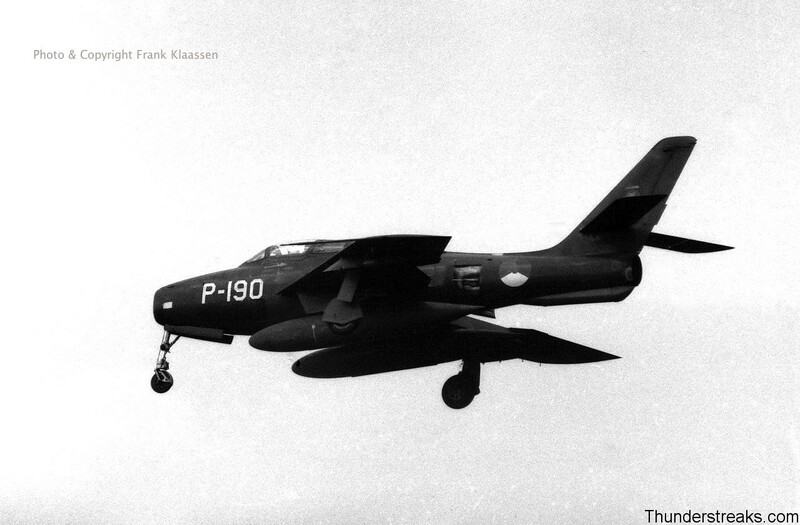 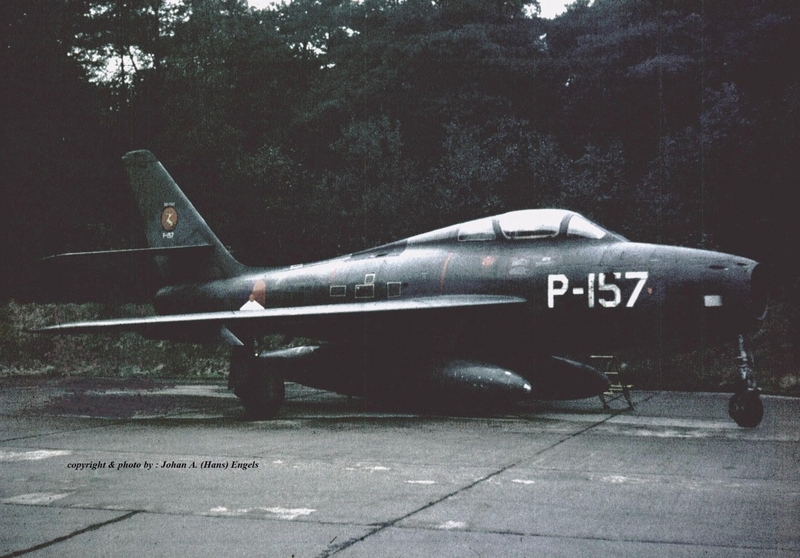 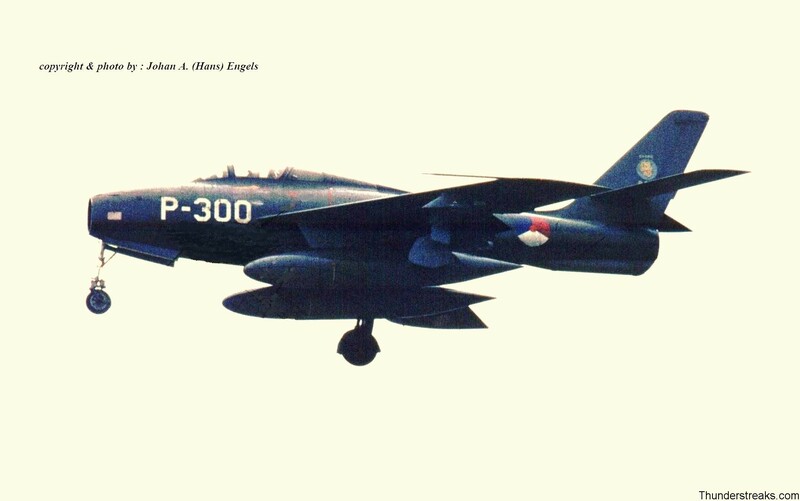 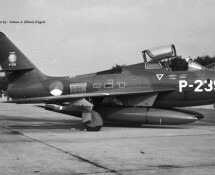 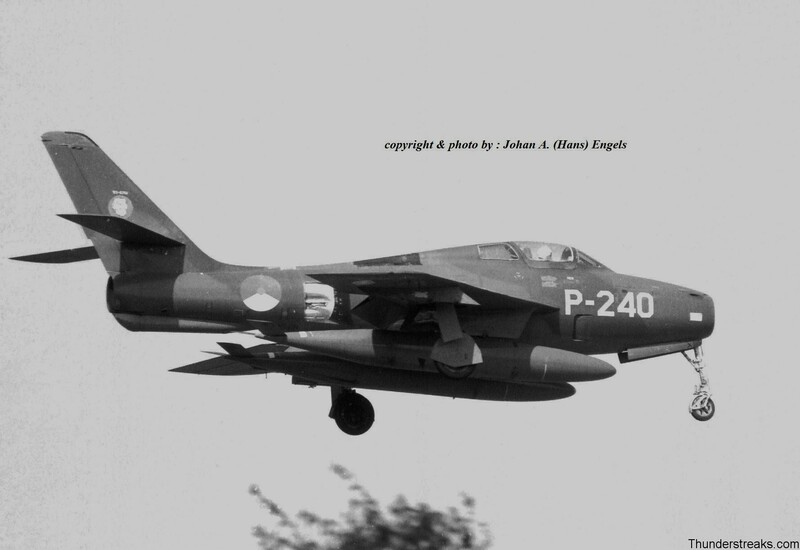 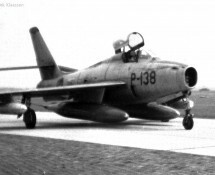 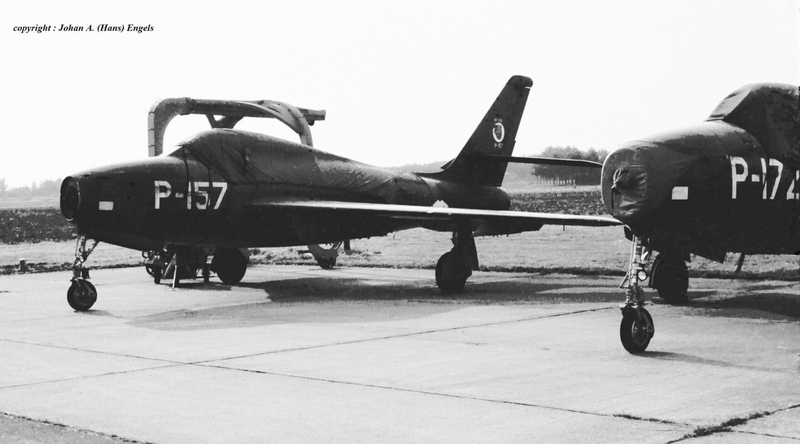 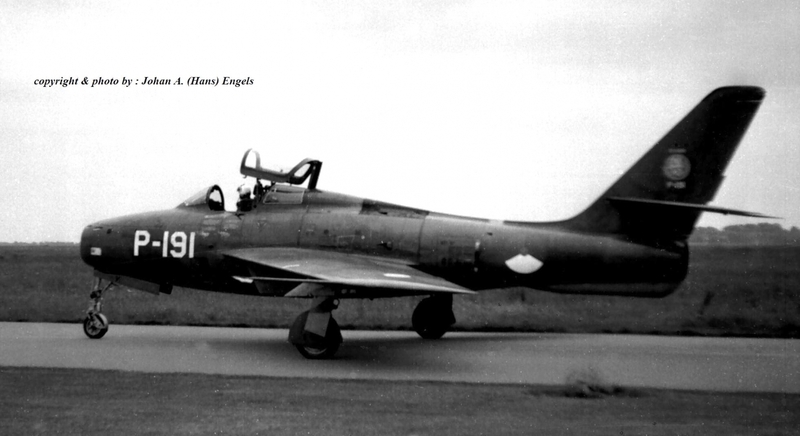 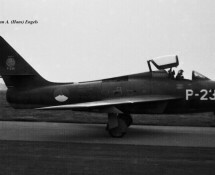 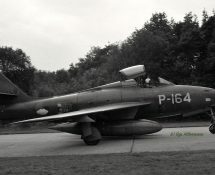 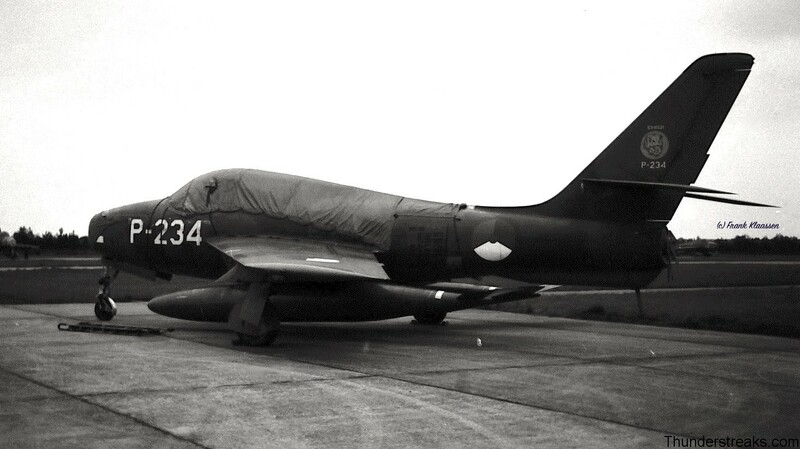 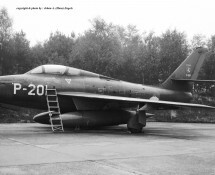 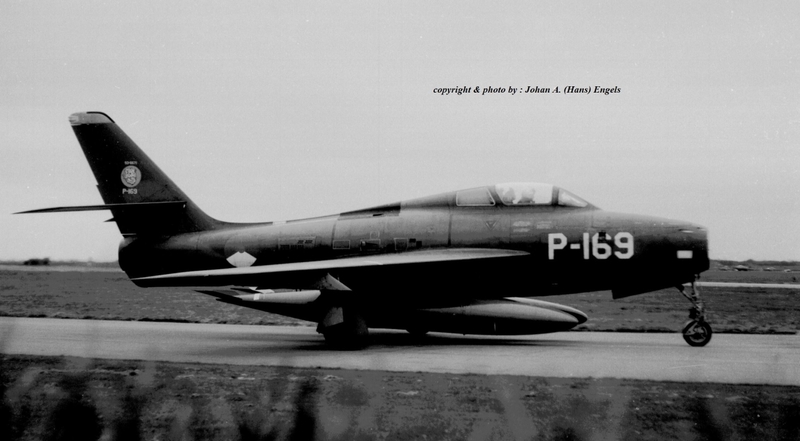 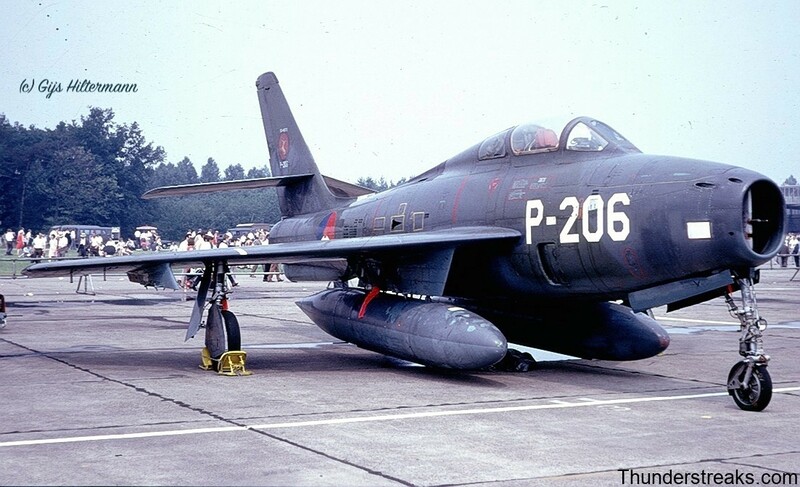 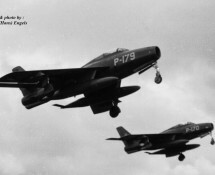 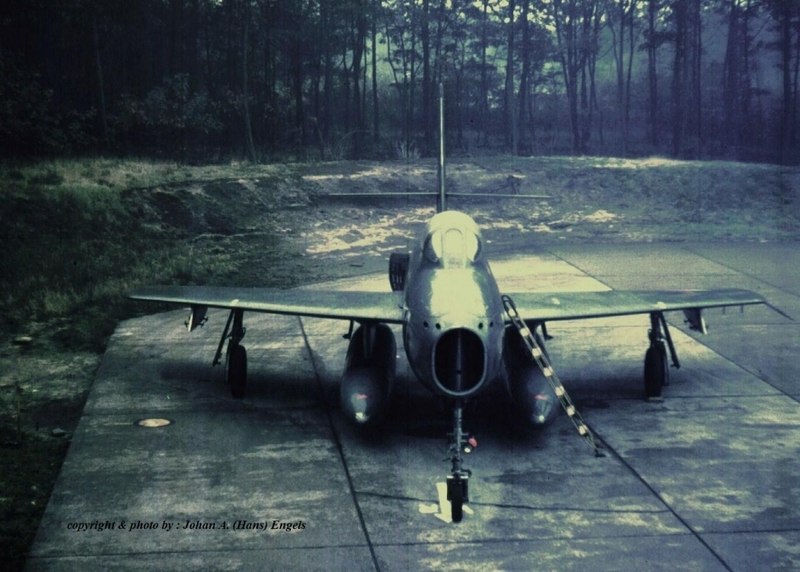 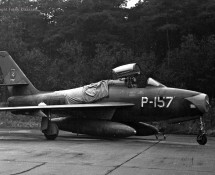 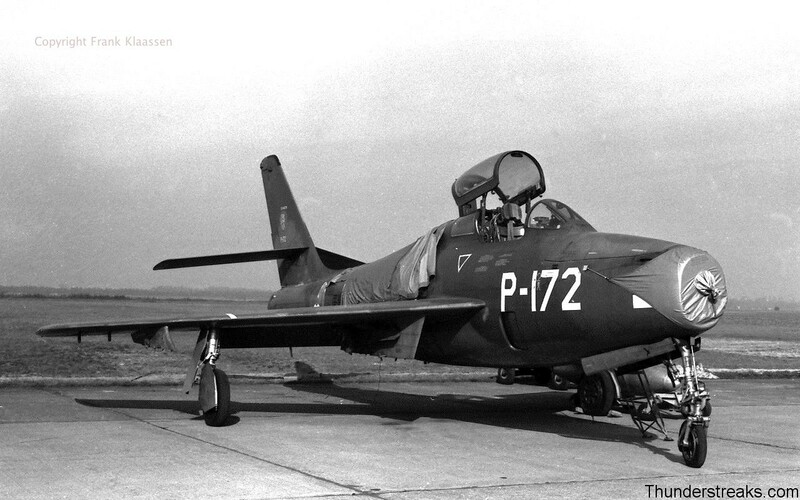 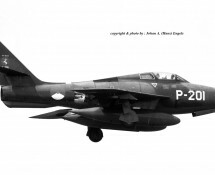 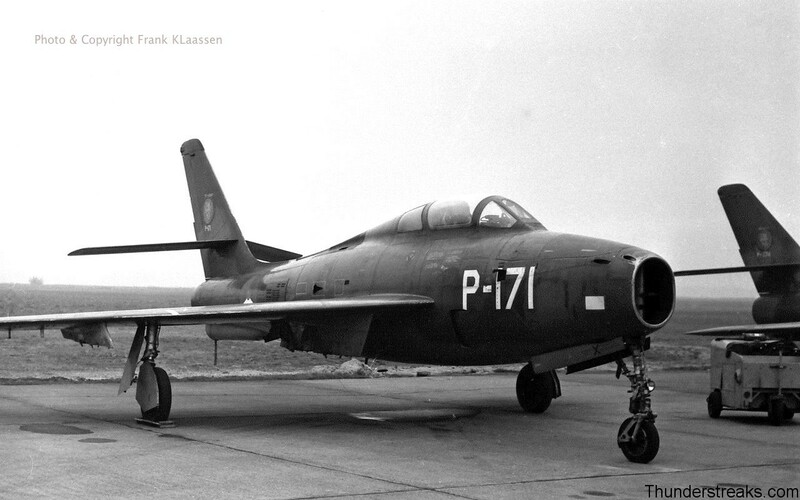 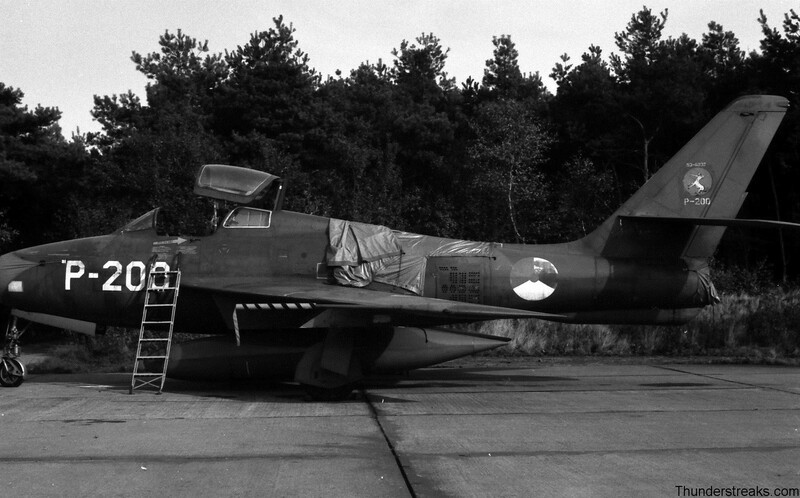 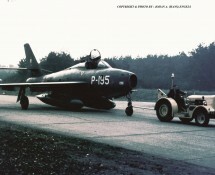 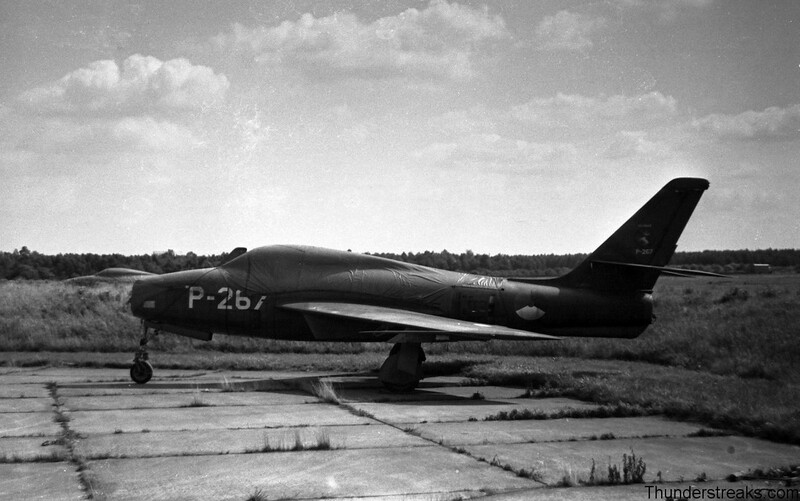 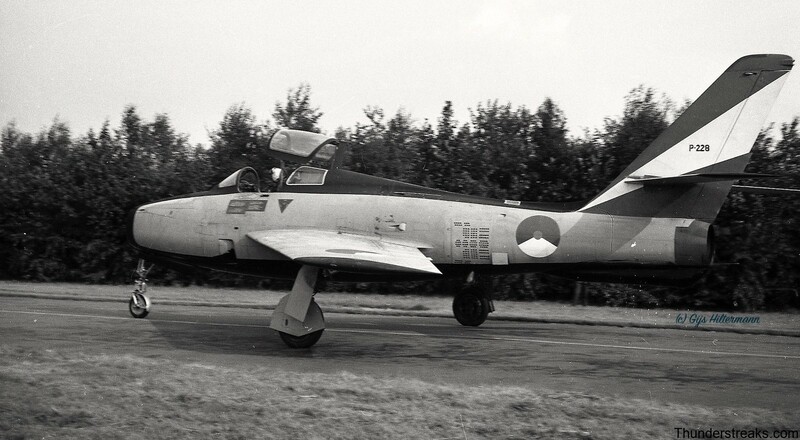 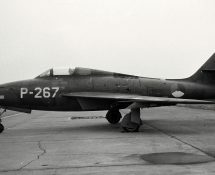 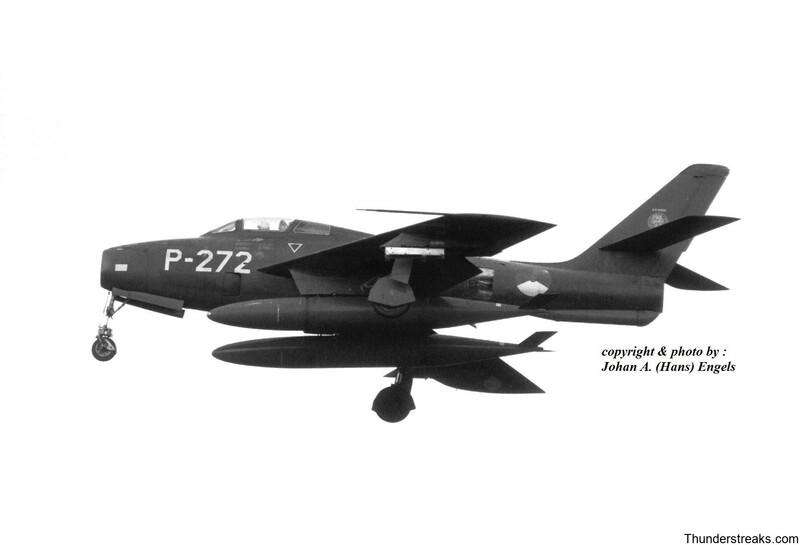 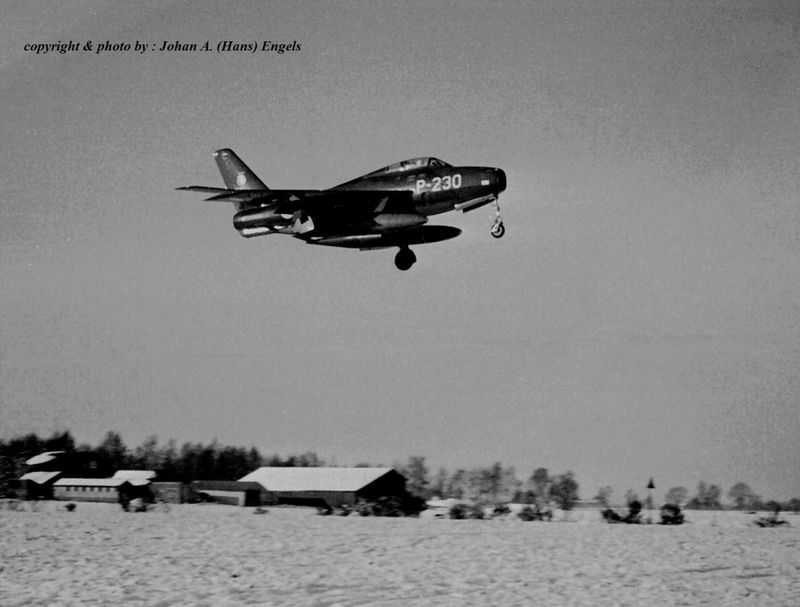 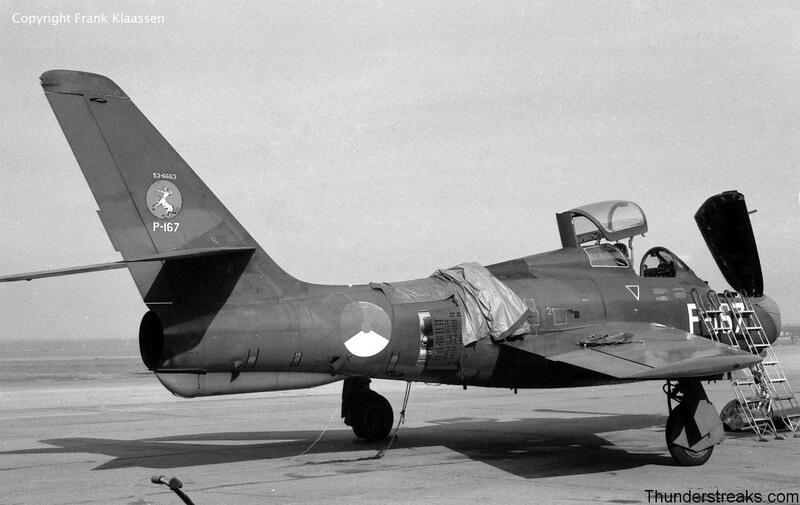 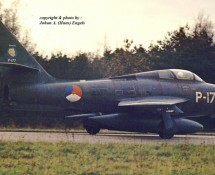 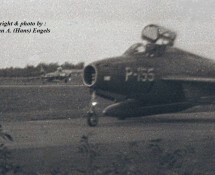 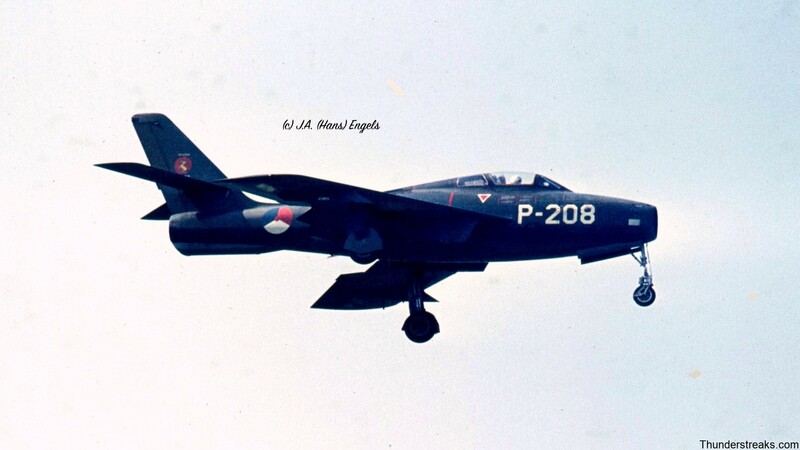 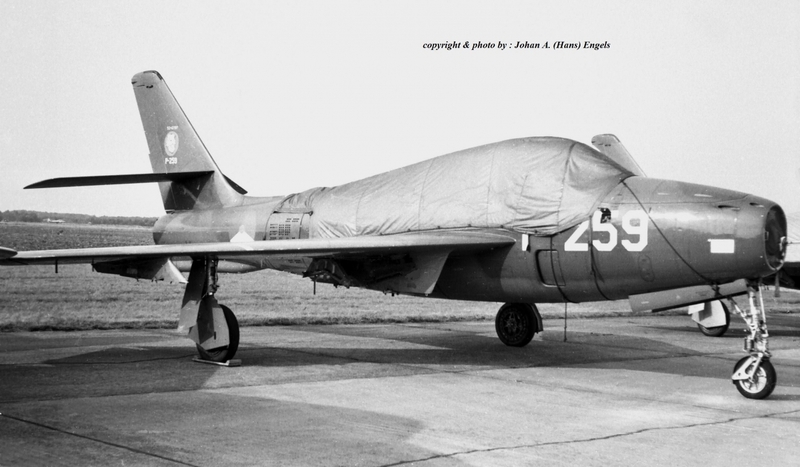 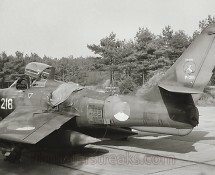 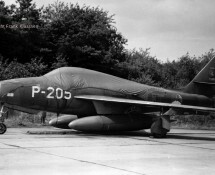 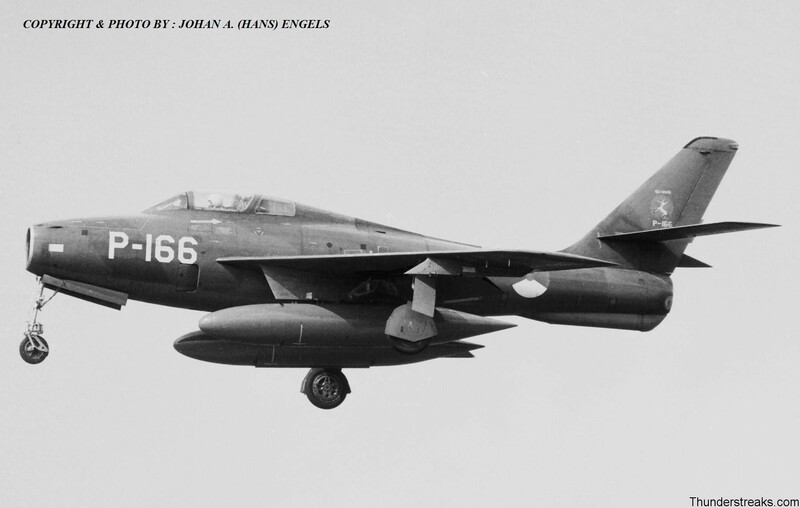 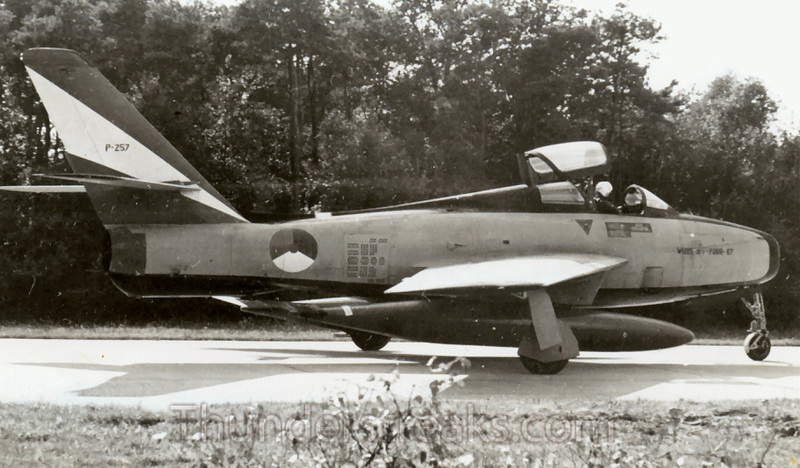 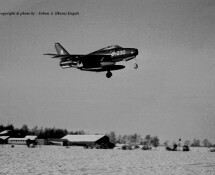 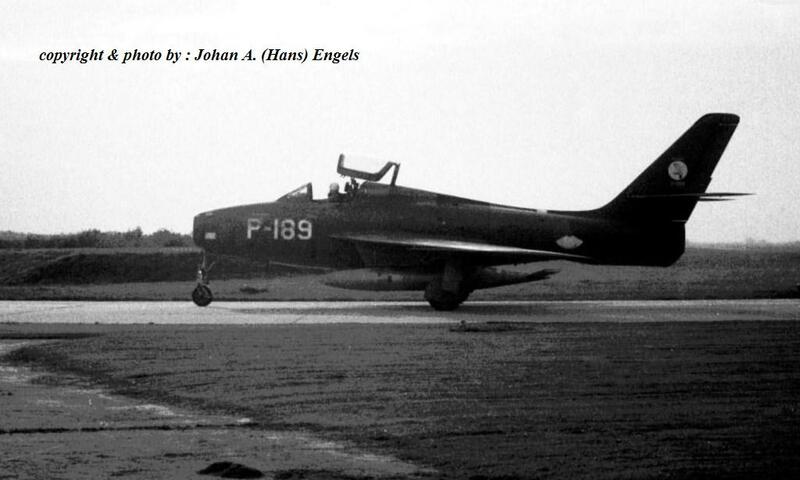 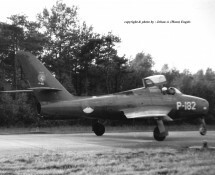 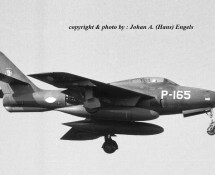 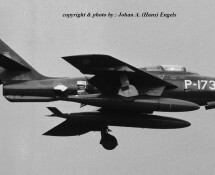 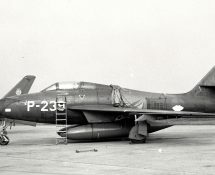 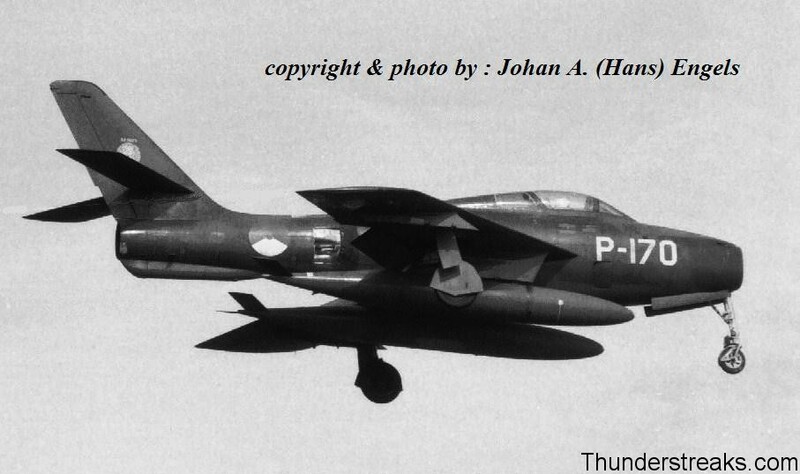 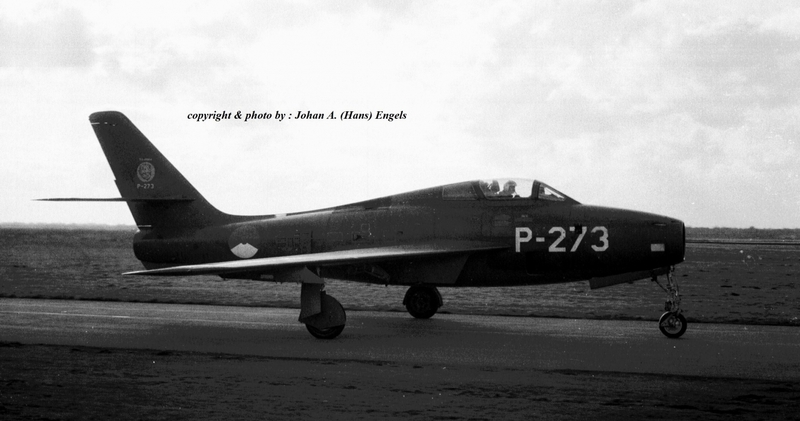 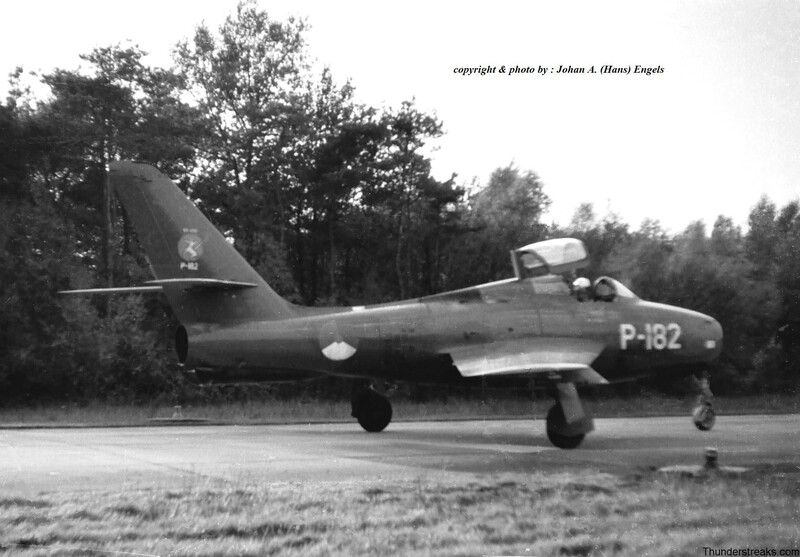 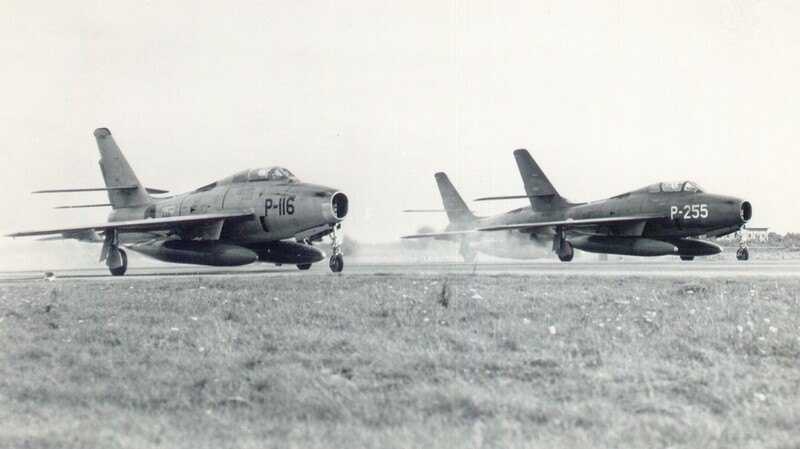 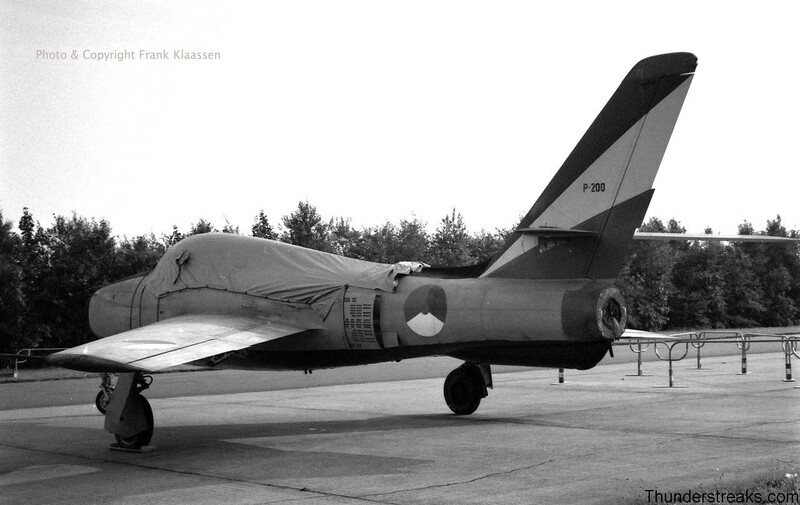 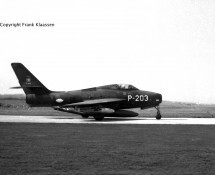 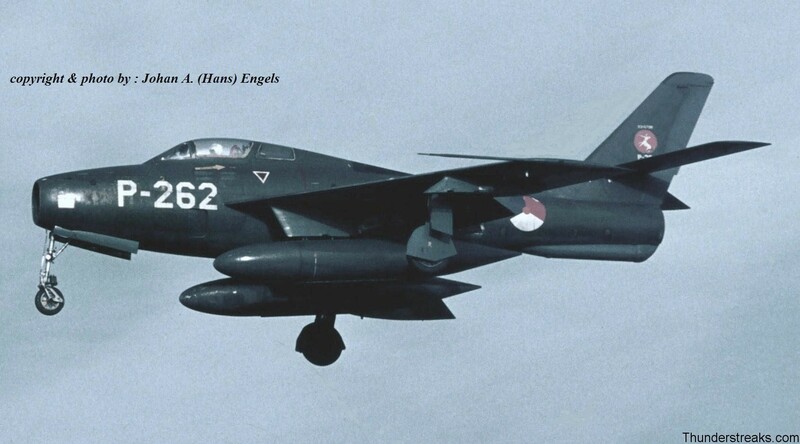 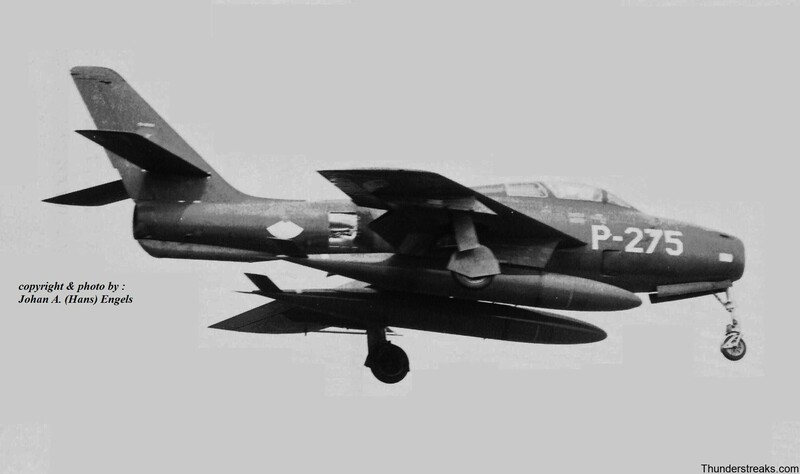 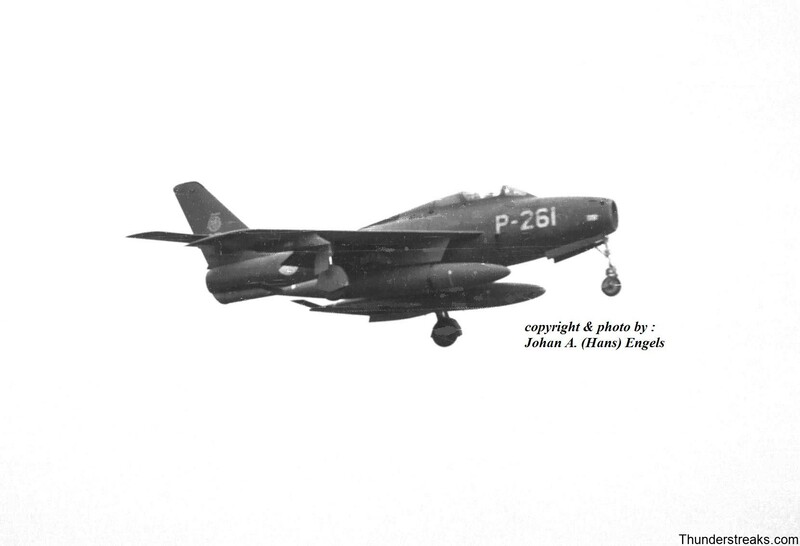 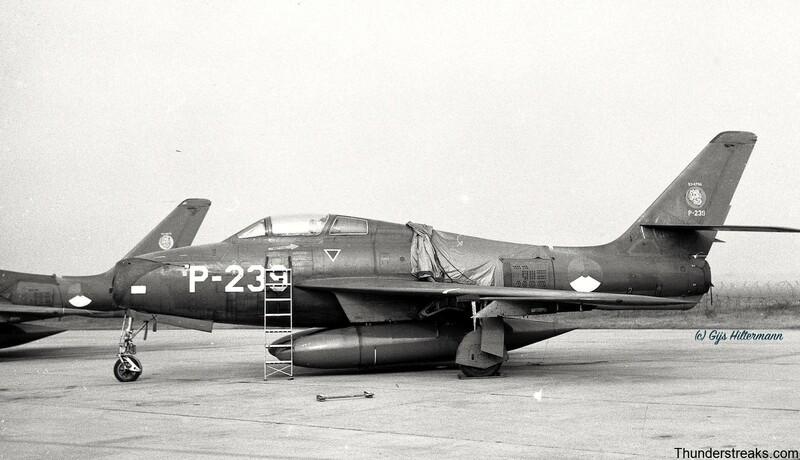 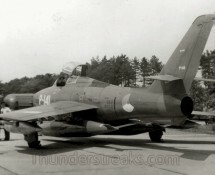 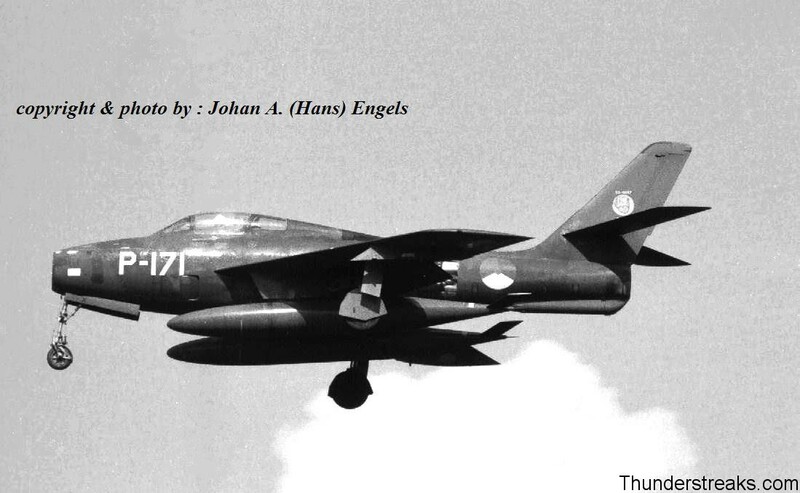 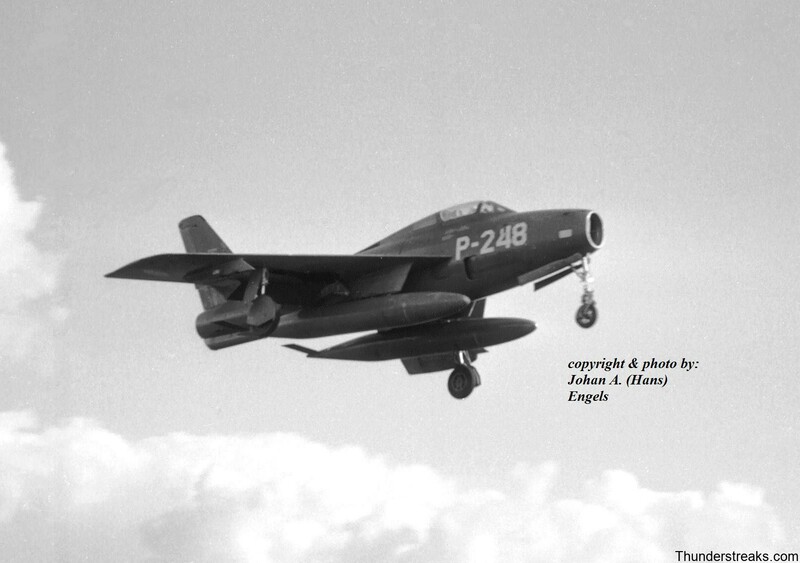 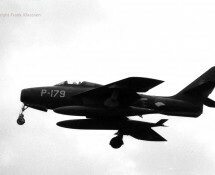 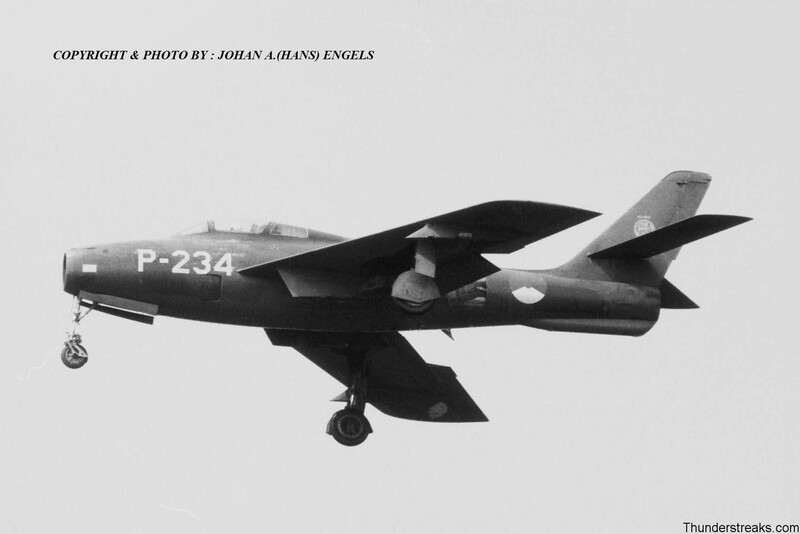 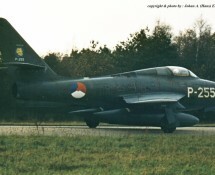 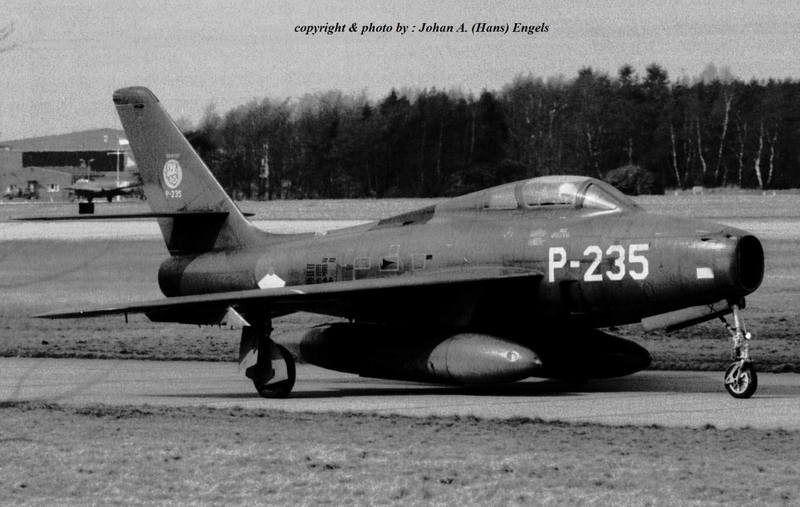 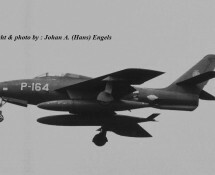 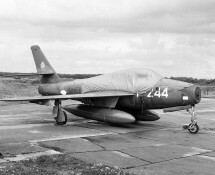 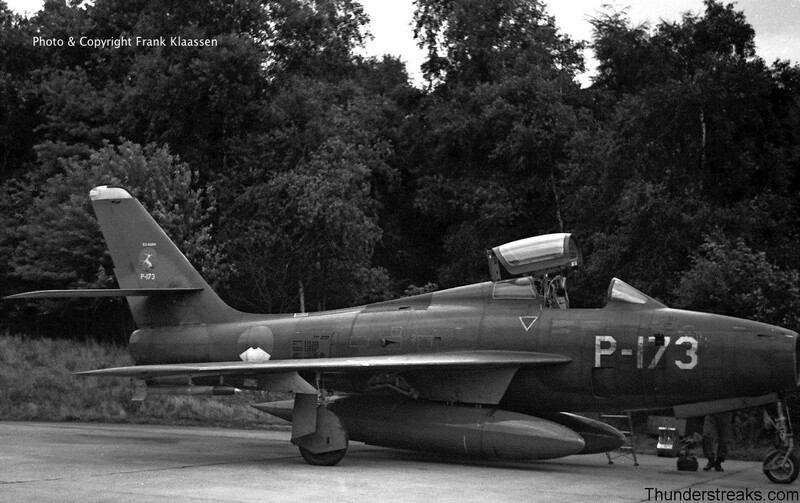 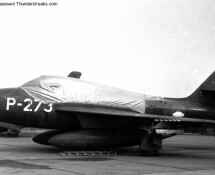 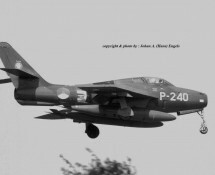 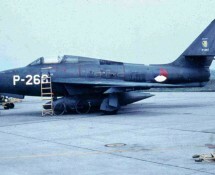 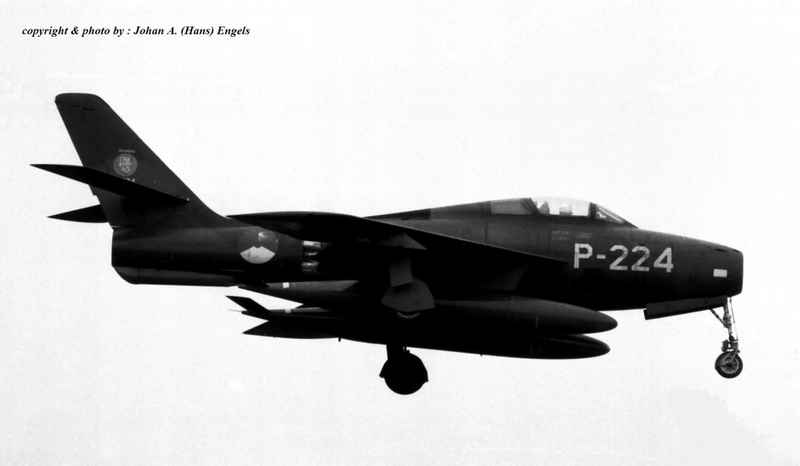 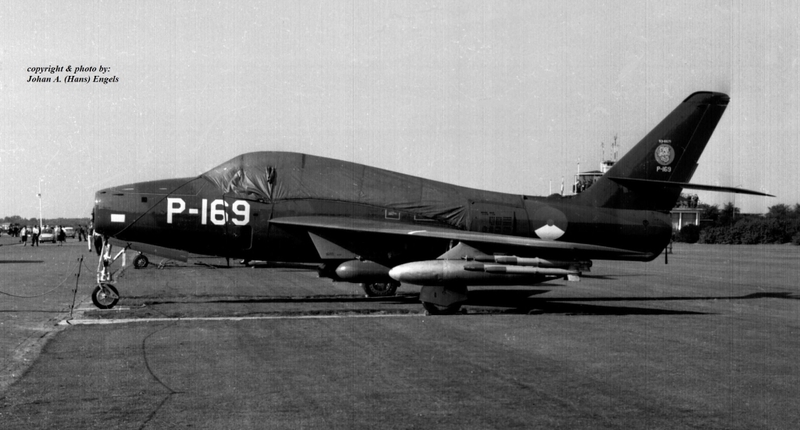 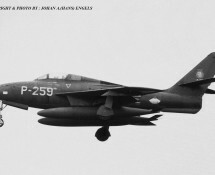 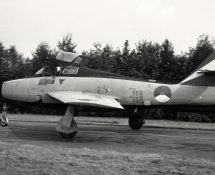 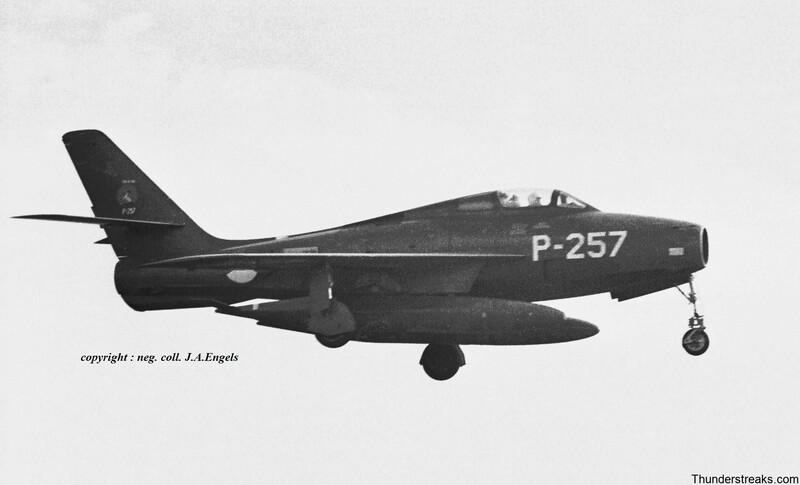 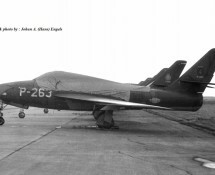 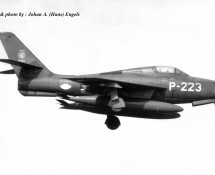 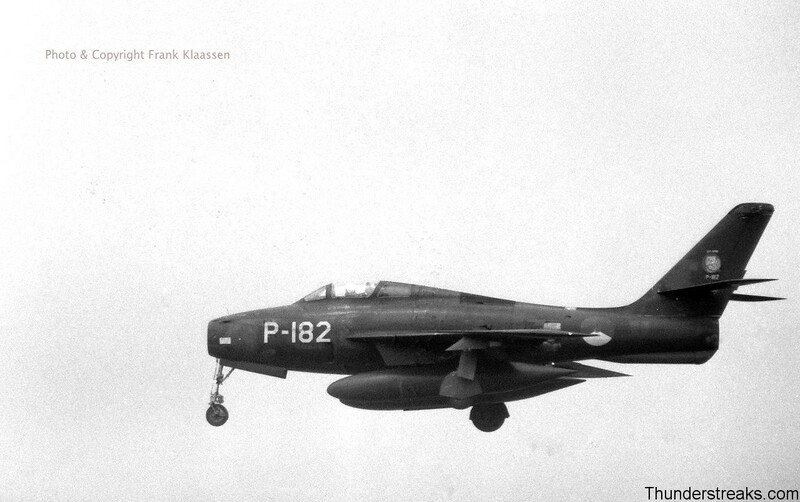 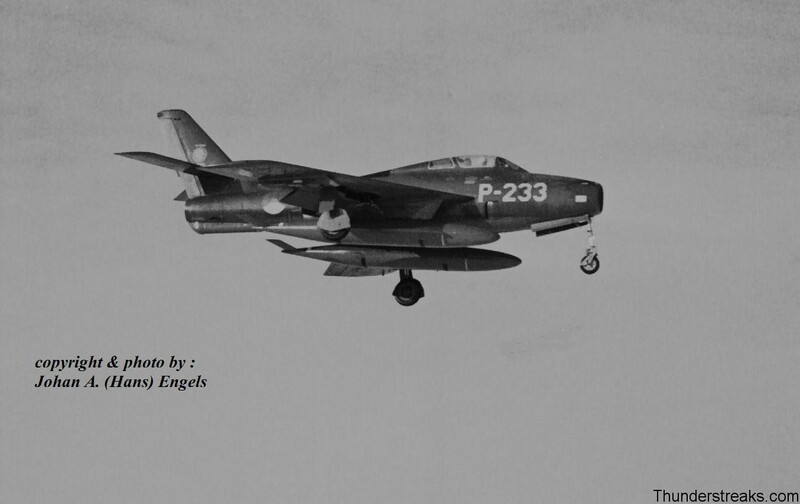 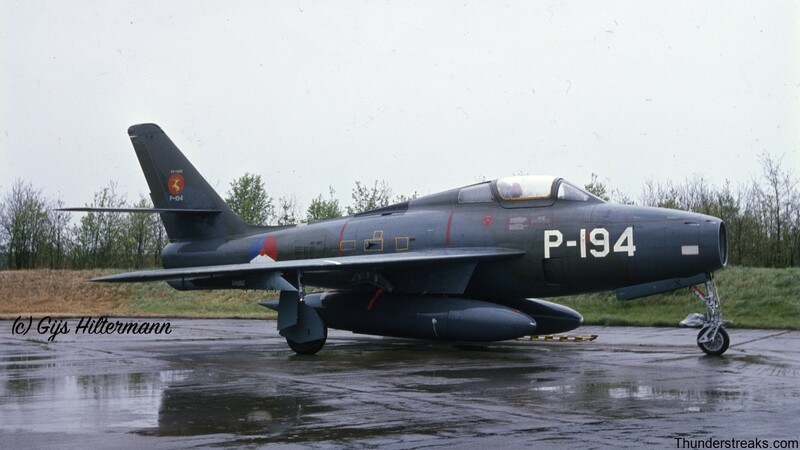 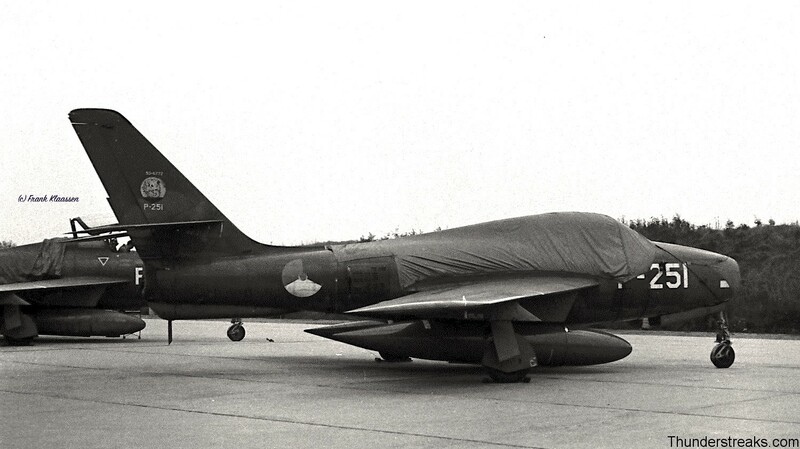 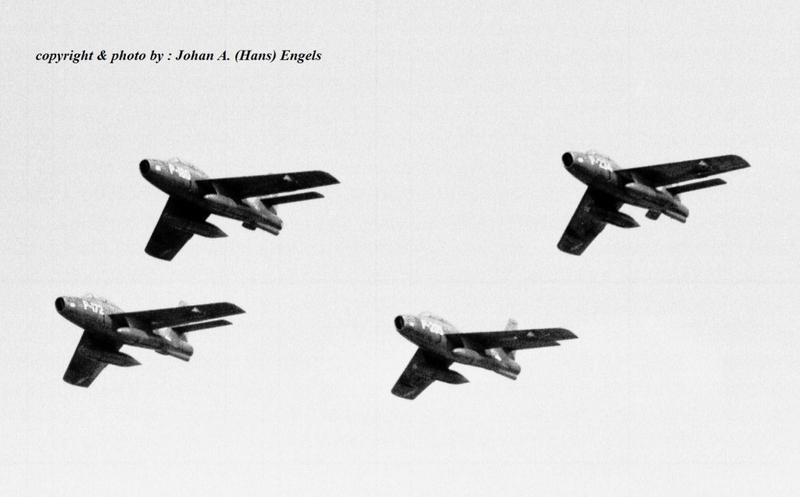 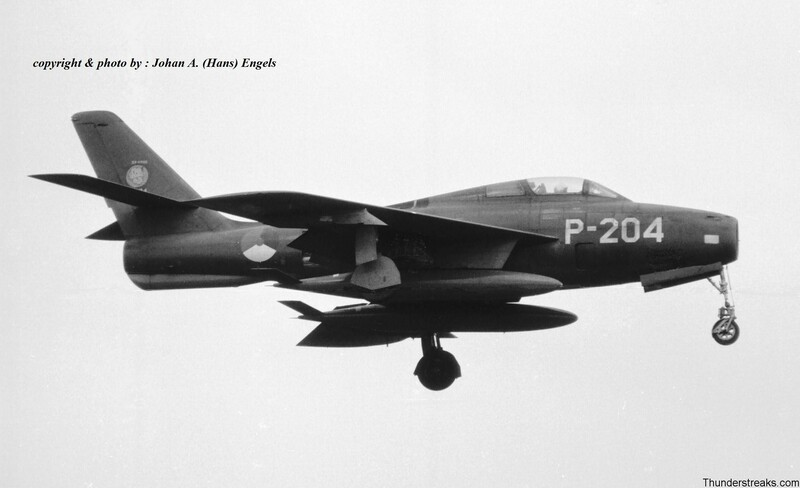 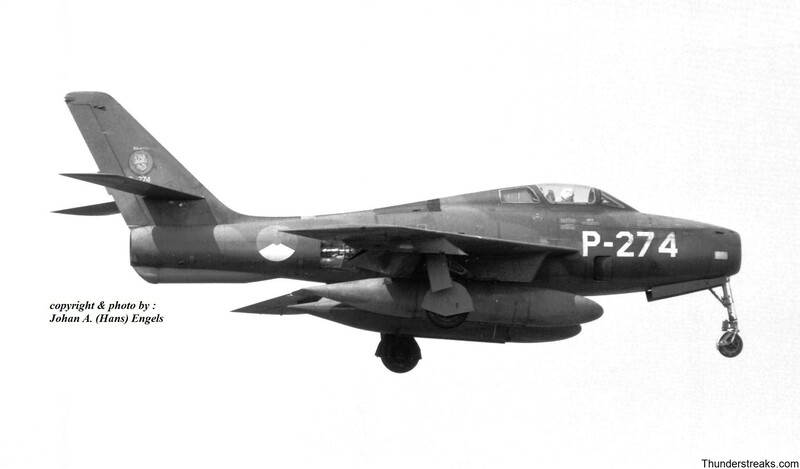 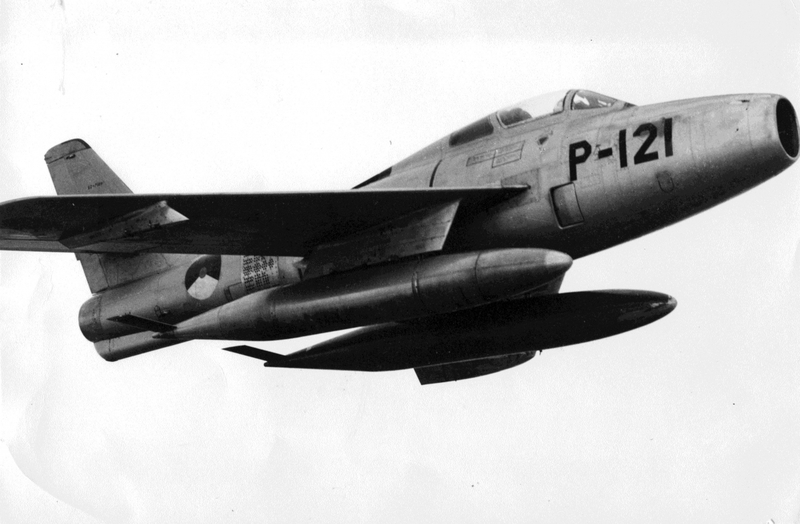 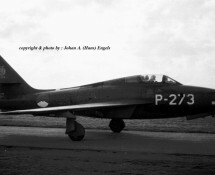 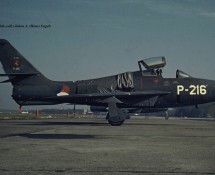 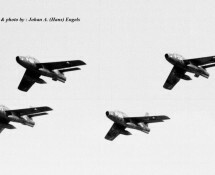 The Volkel and Eindhoven based F-84Fs were phased out of Dutch services in two parts. 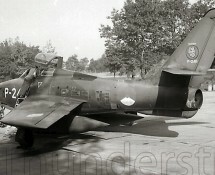 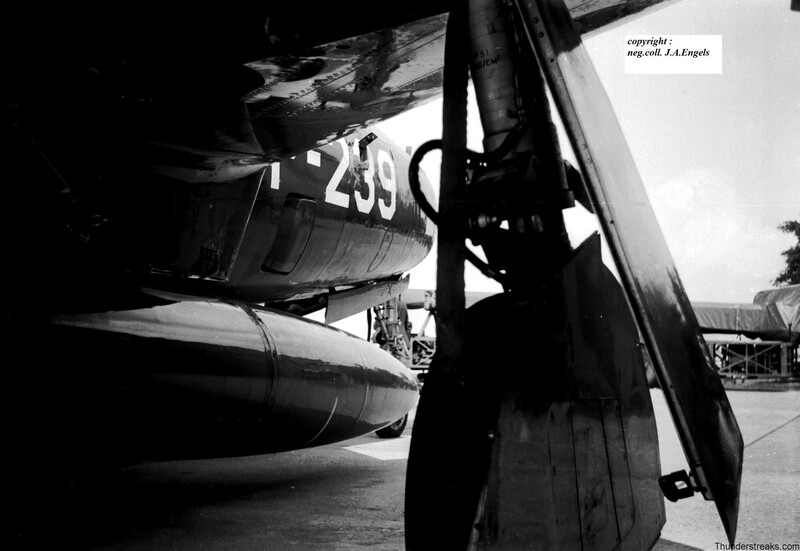 The first part involved the Streaks of 311 and 312 squadron at Volkel. 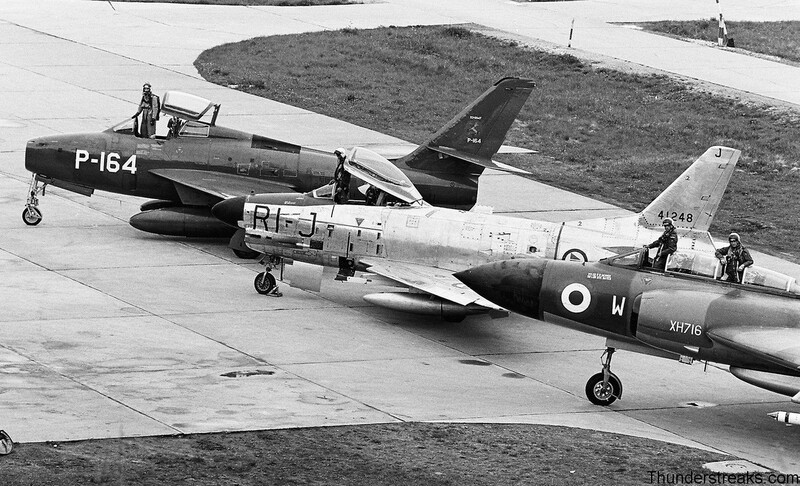 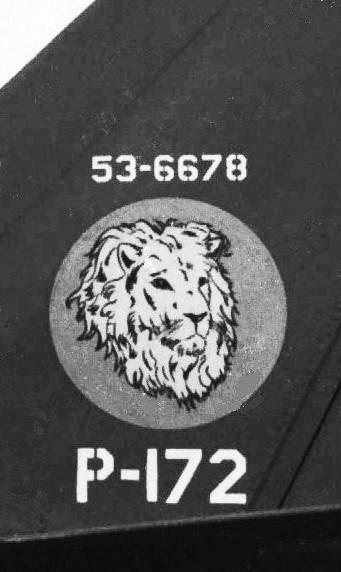 From October 1964 onwards these squadrons started converting to the F-104 Starfighter and this was completed by the end of 1965. 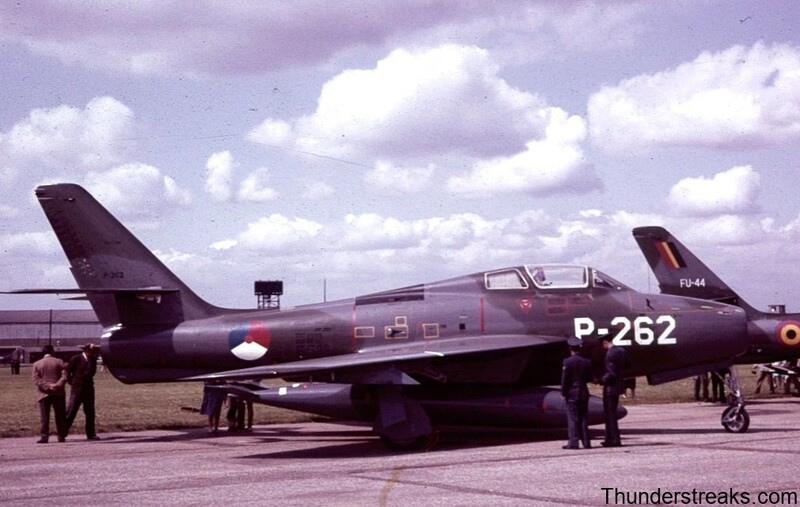 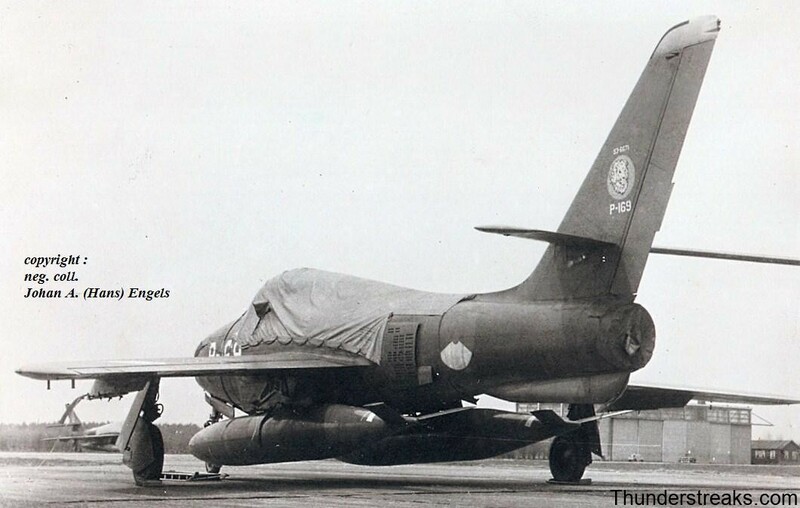 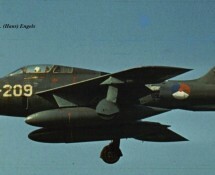 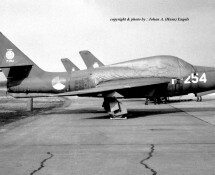 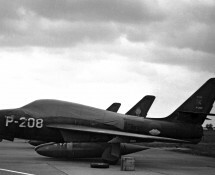 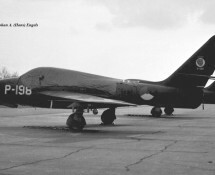 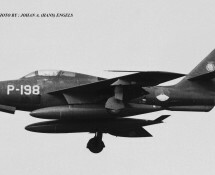 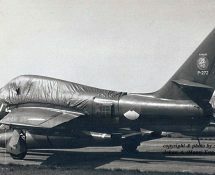 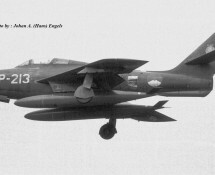 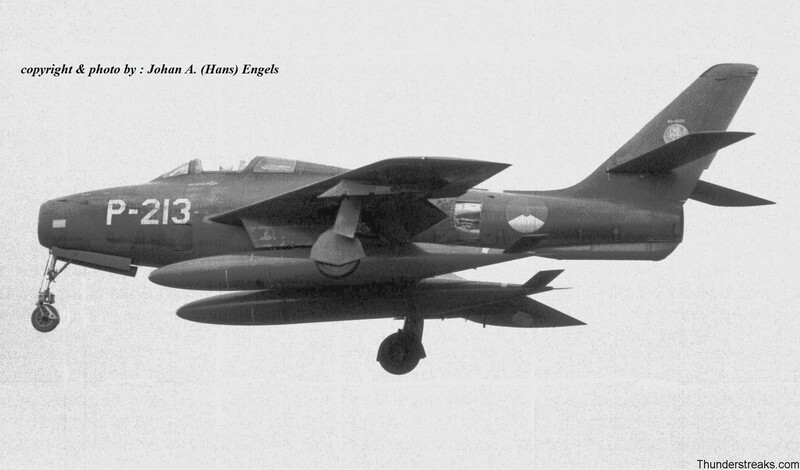 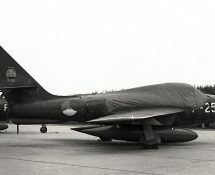 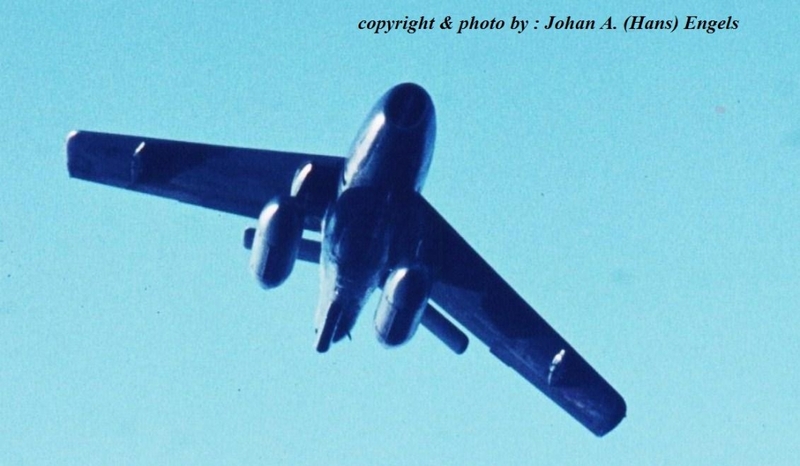 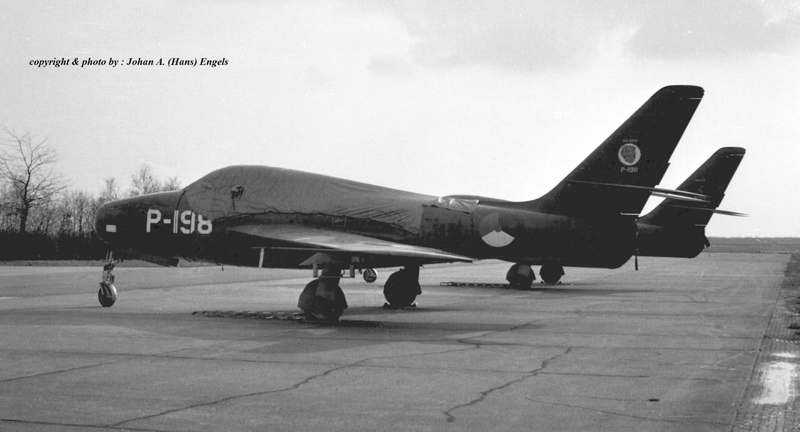 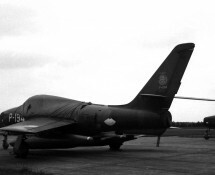 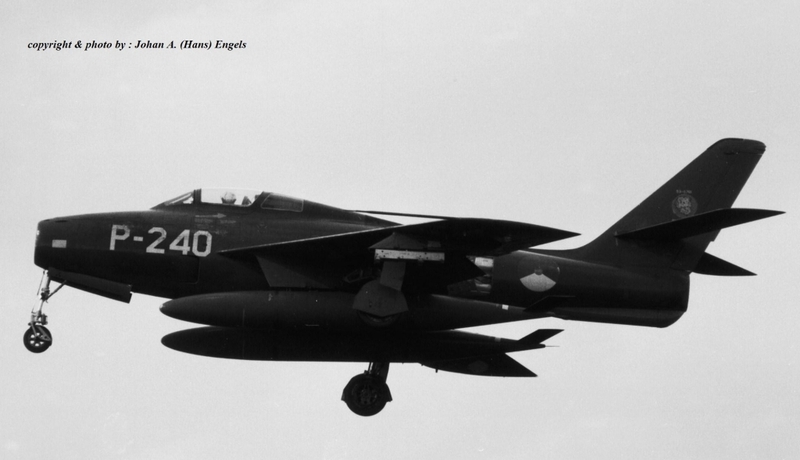 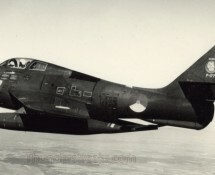 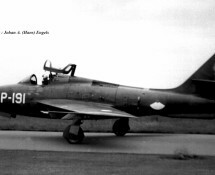 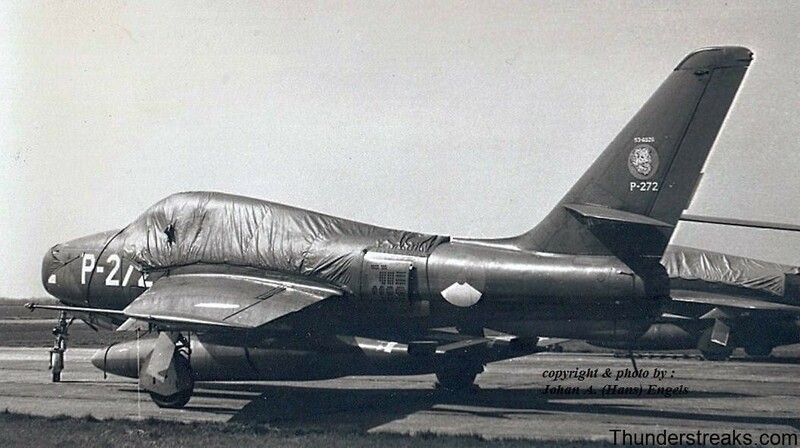 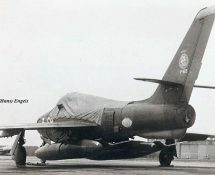 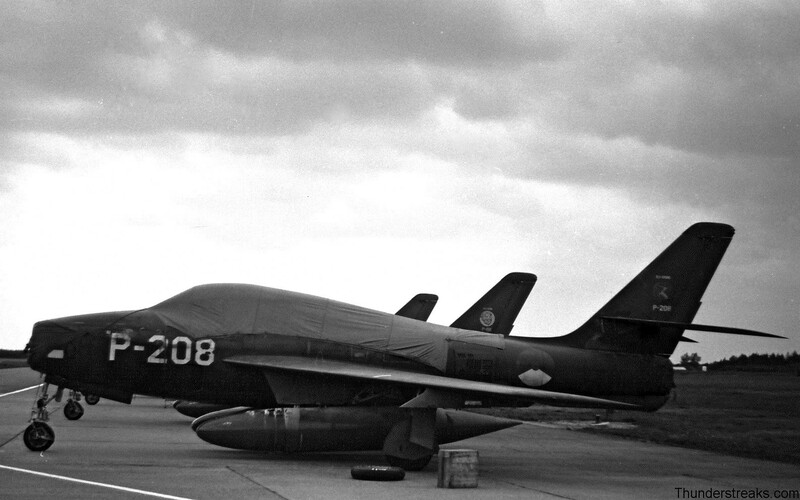 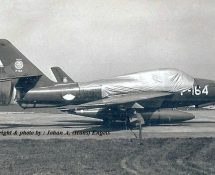 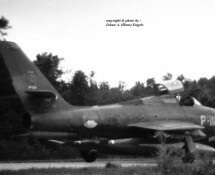 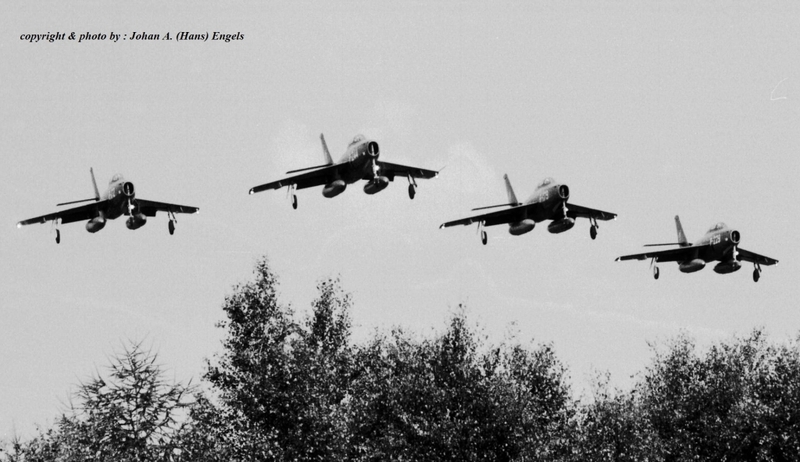 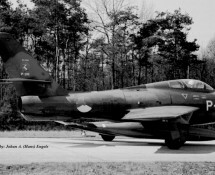 Their Thunderstreaks were either returned to the USAF (and subsequently sent to Greece and Turkey), taken in use for spareparts/decoy purposes or transferred to 314 and 315 squadrons at Eindhoven. 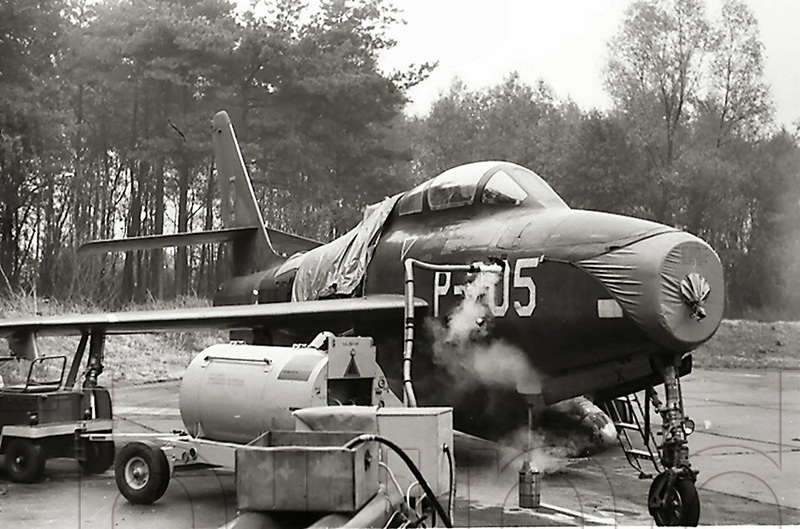 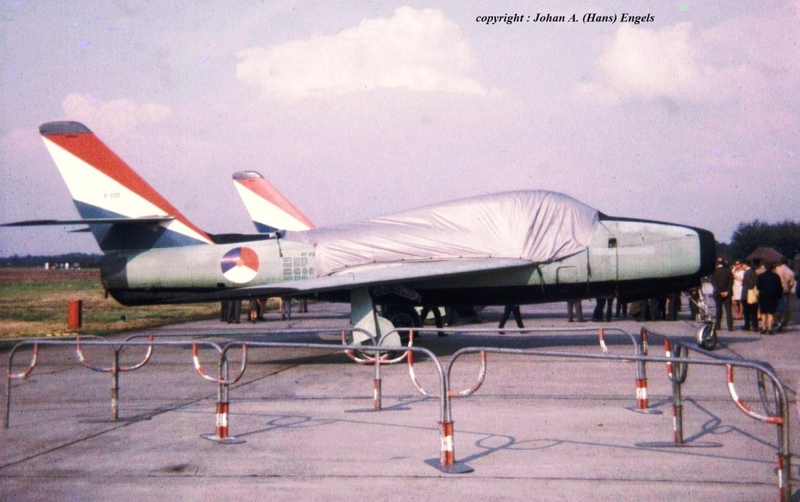 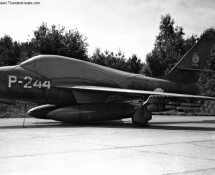 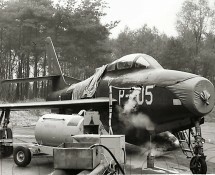 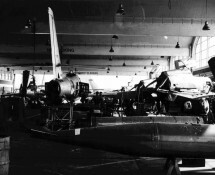 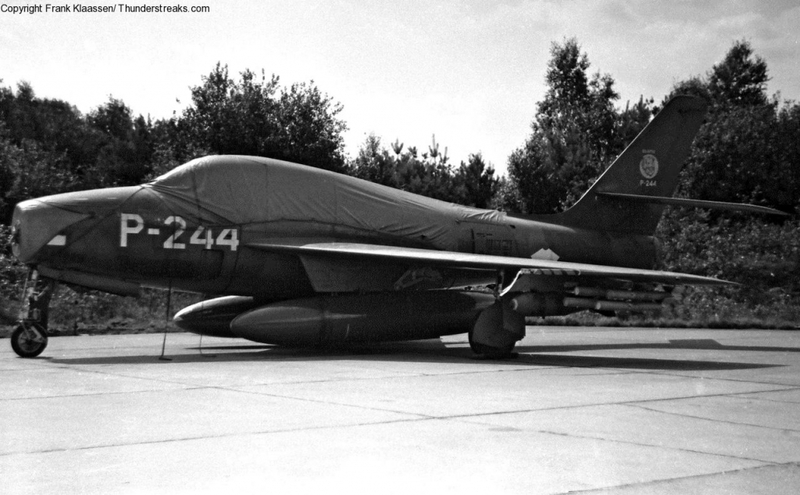 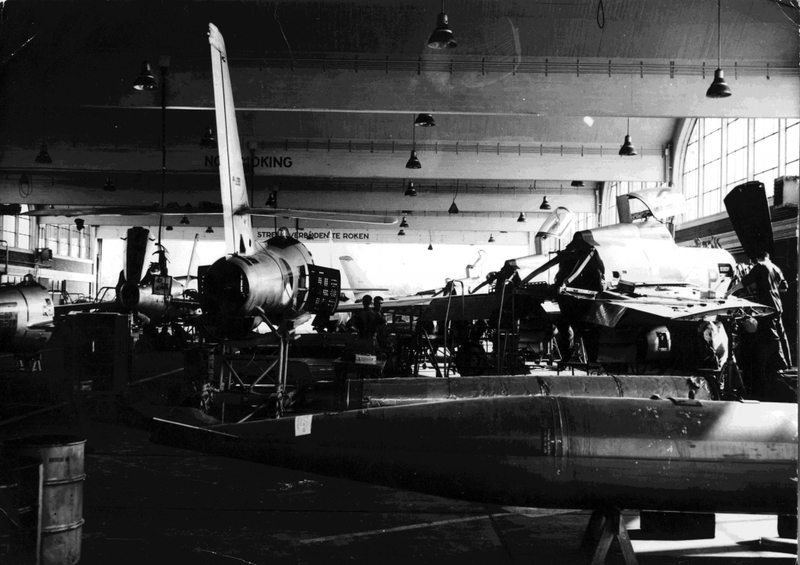 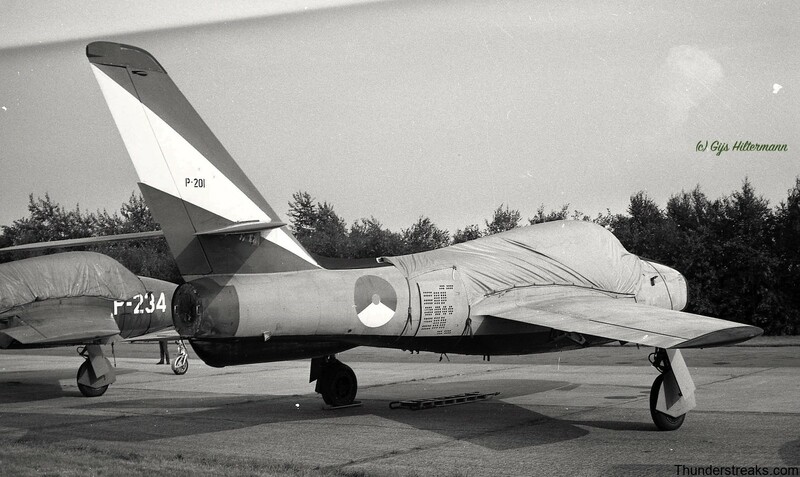 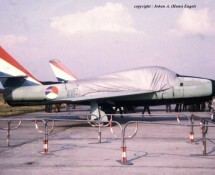 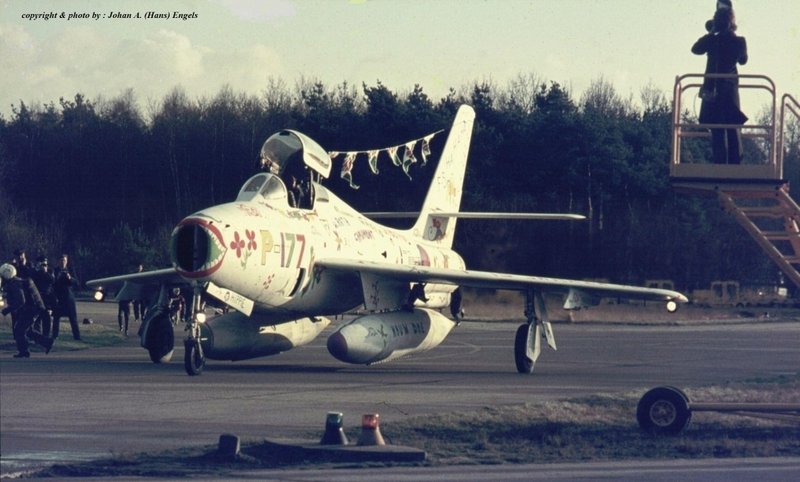 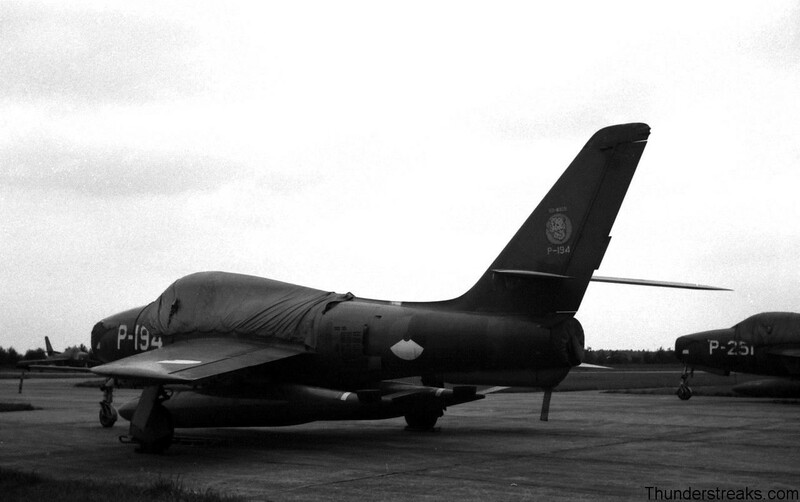 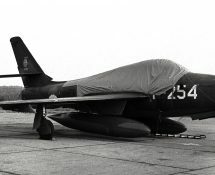 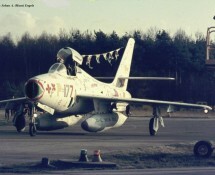 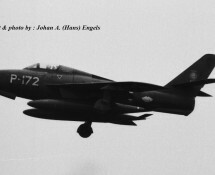 At Eindhoven the type remained in service until 1970, when the conversion to the Northrop NF-5 was completed. 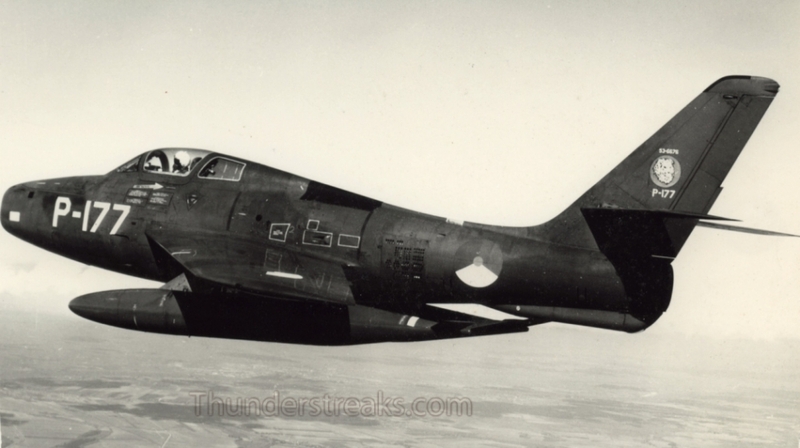 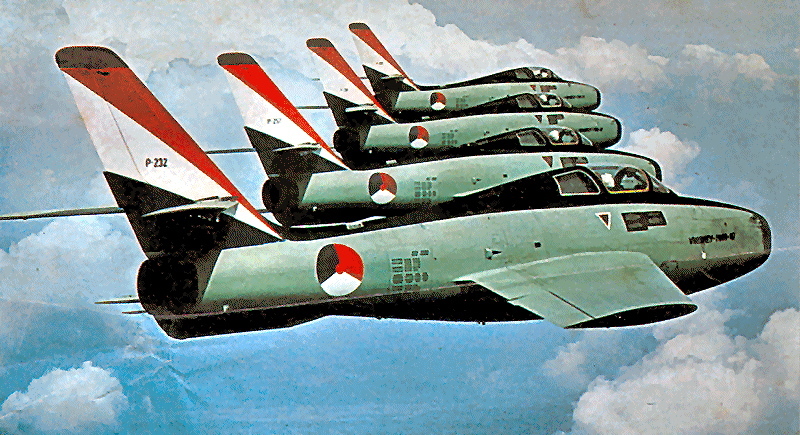 The majority of the Thunderstreaks was scrapped. 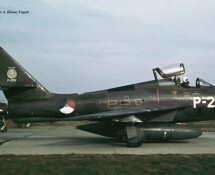 A number of them was allowed to stay in Holland mainly for decoy and museum purposes, and some 20 aircraft were transferred to Greece where they soldiered on till the early 1980s. 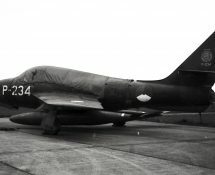 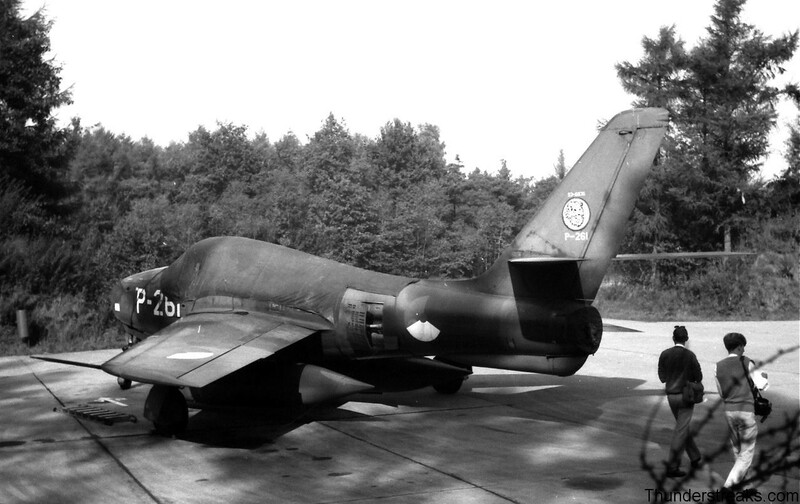 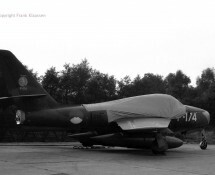 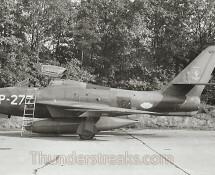 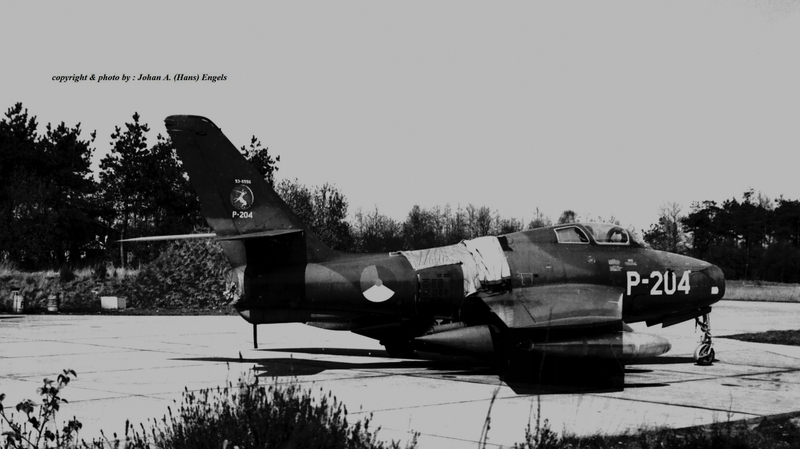 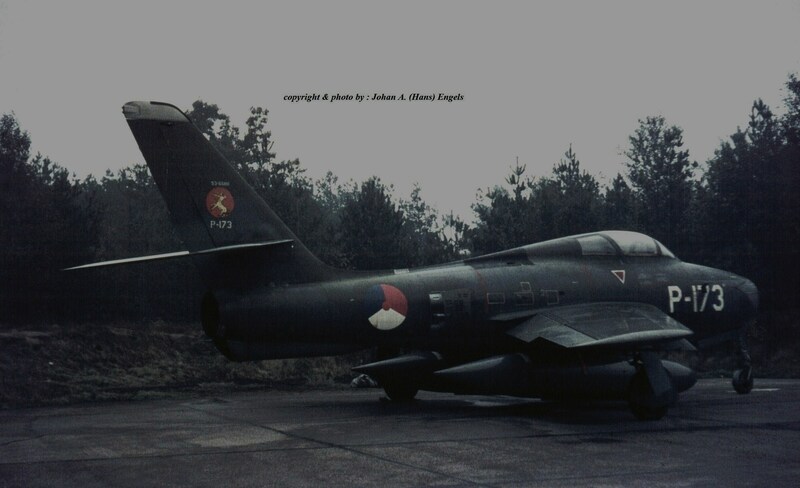 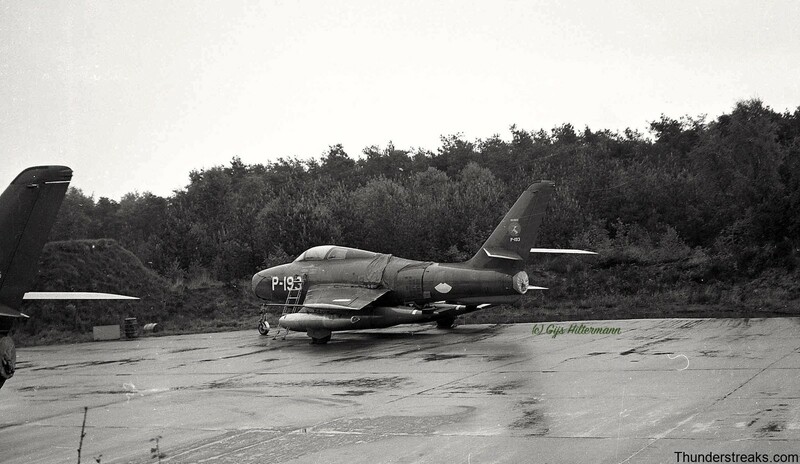 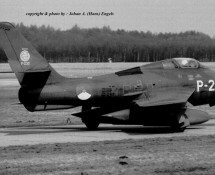 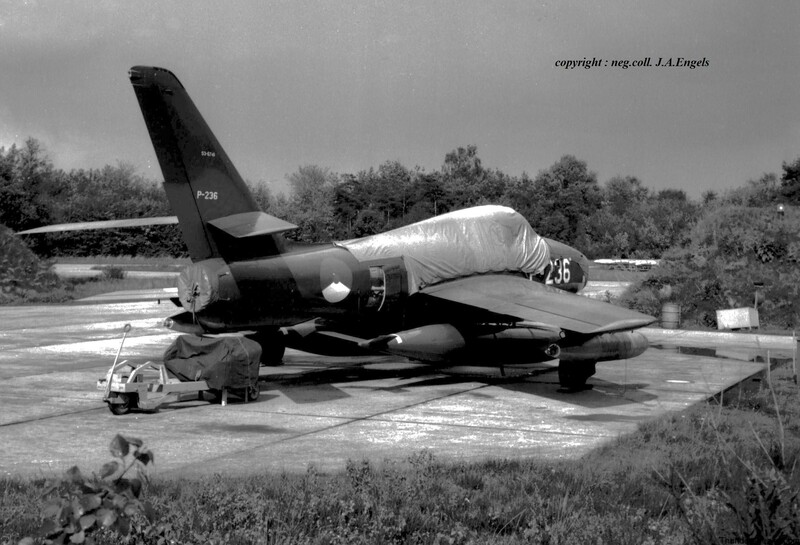 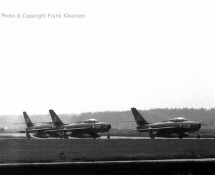 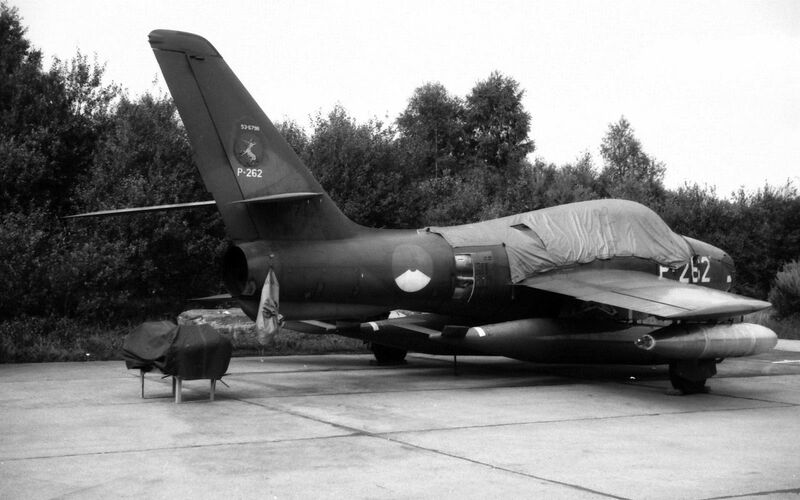 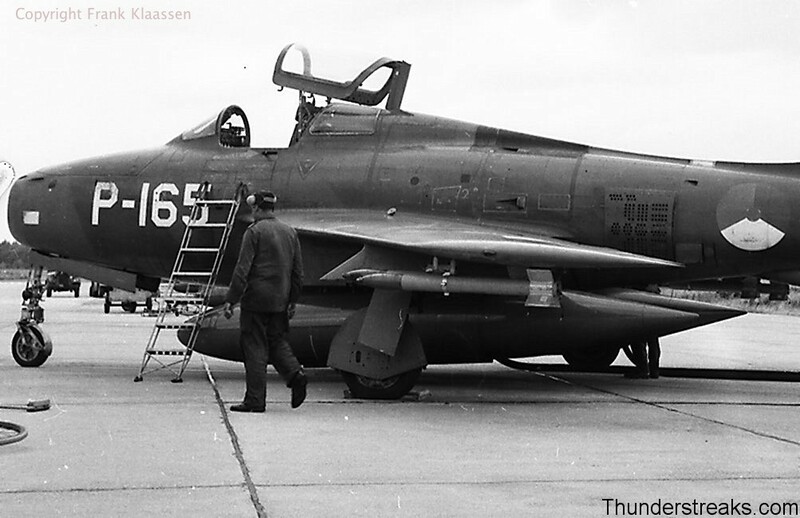 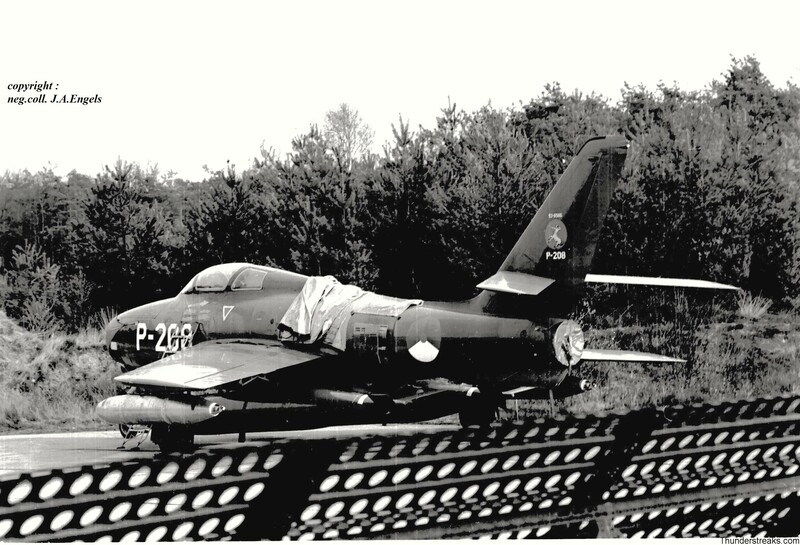 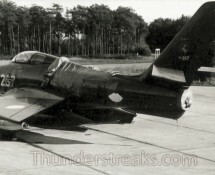 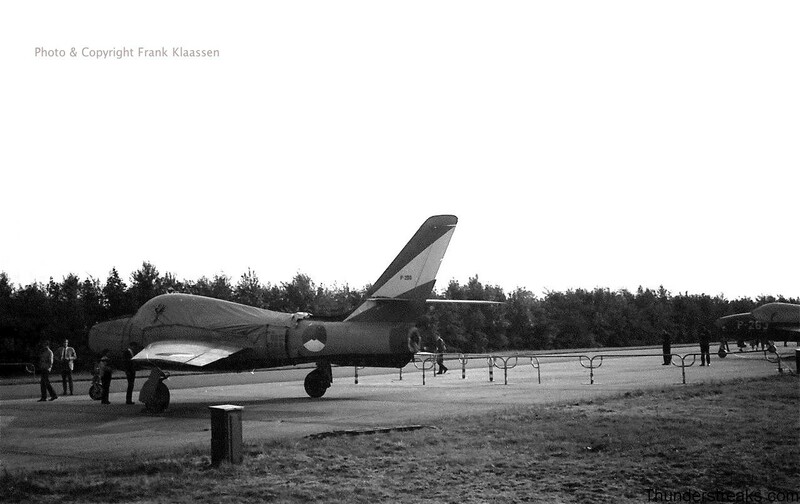 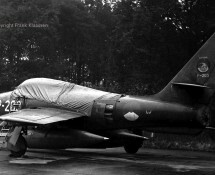 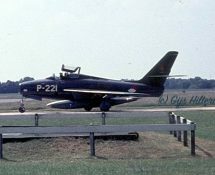 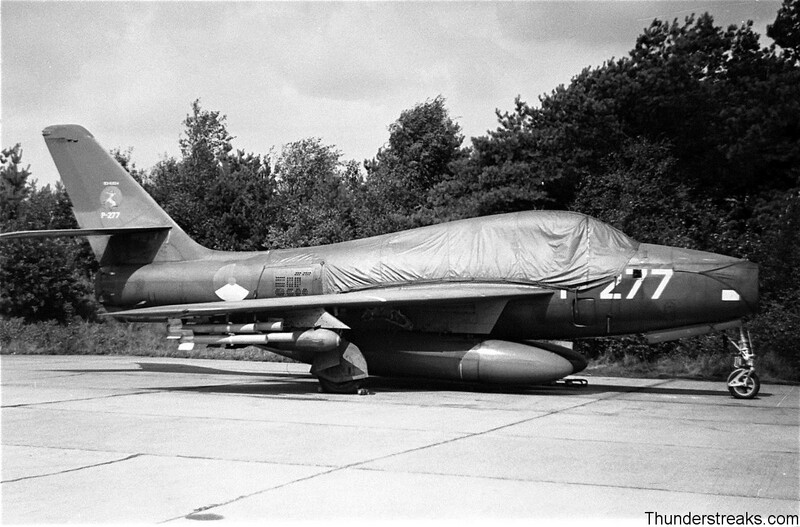 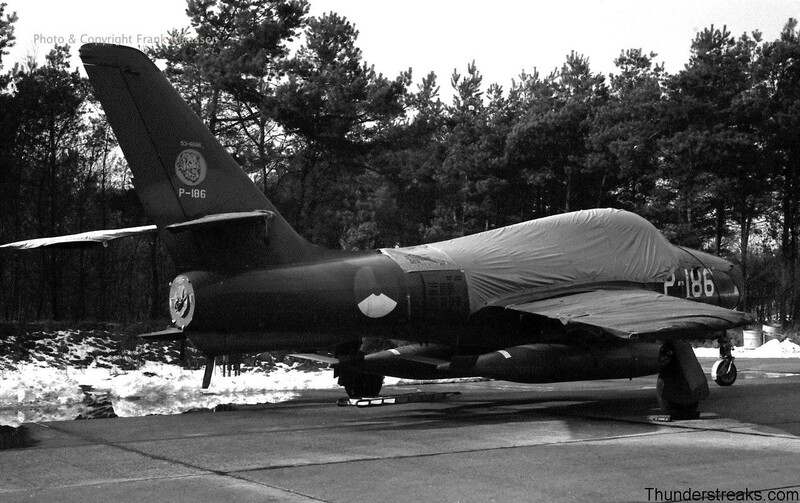 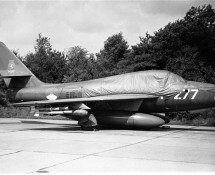 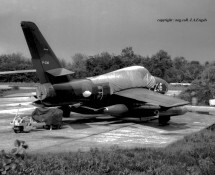 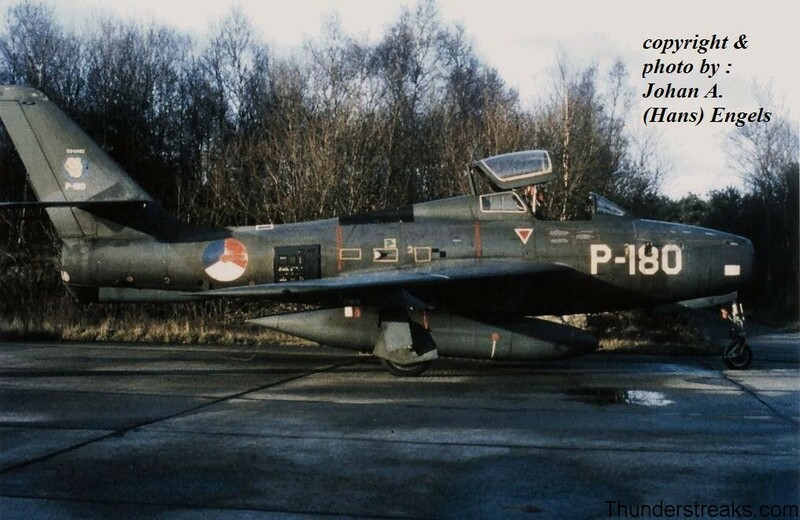 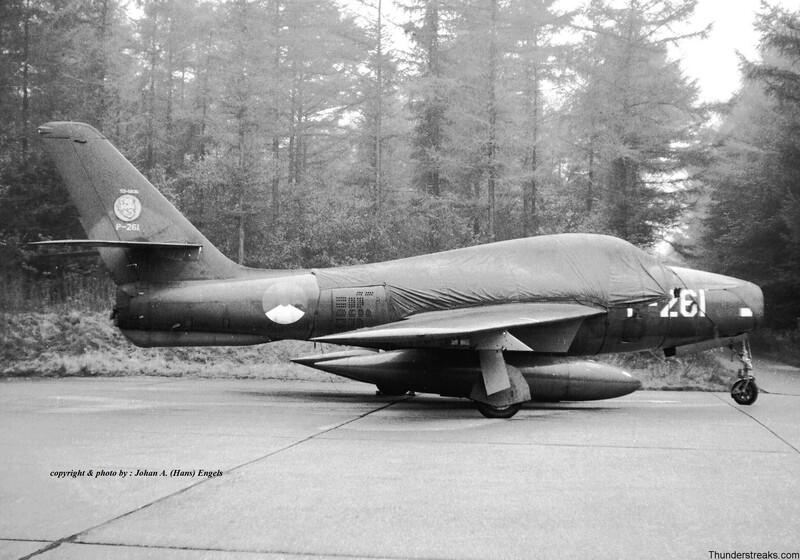 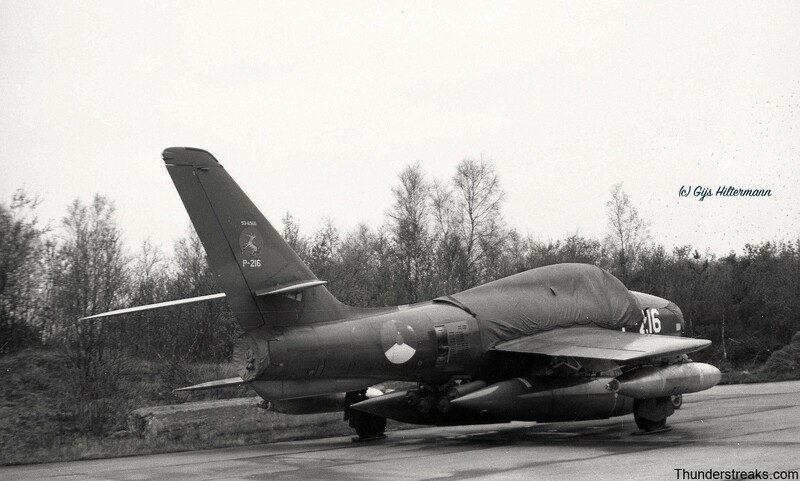 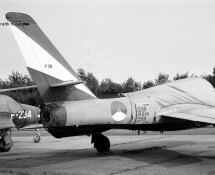 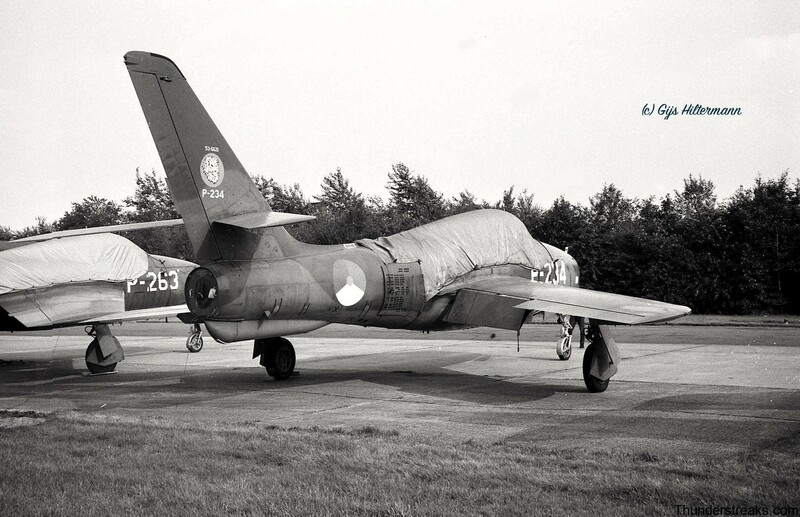 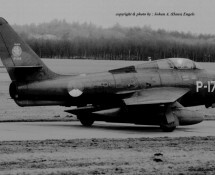 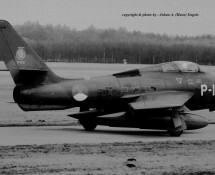 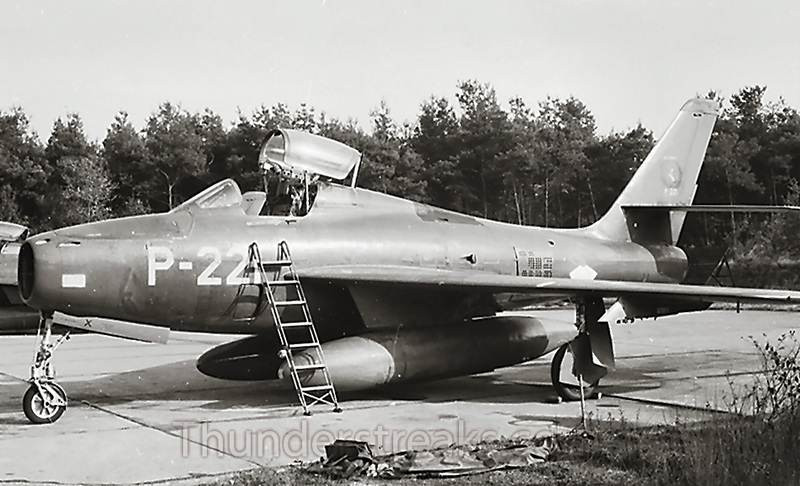 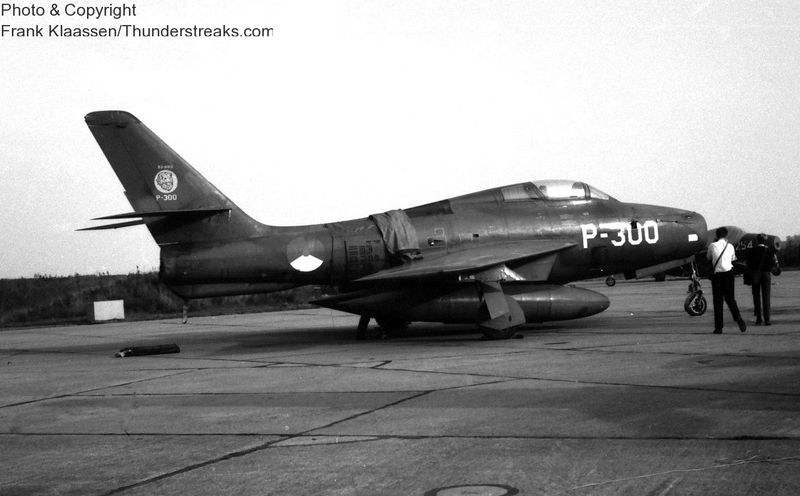 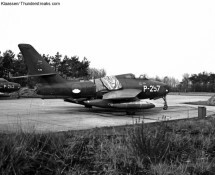 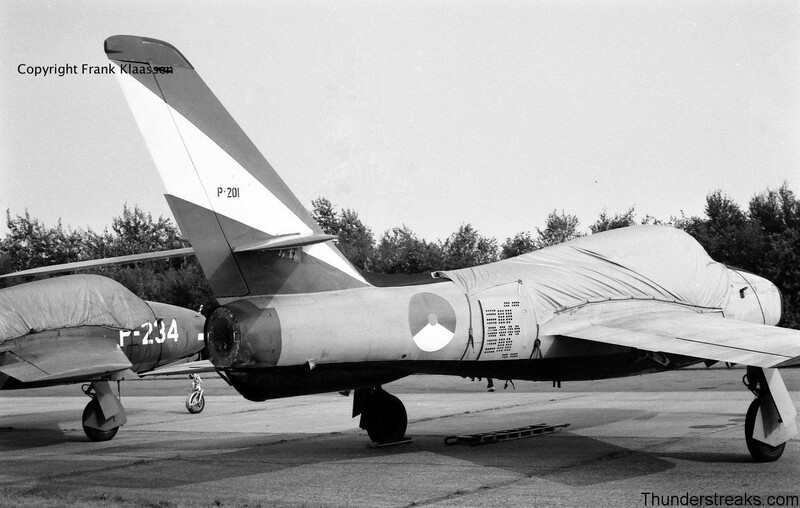 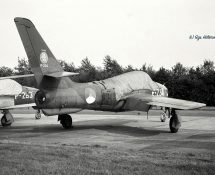 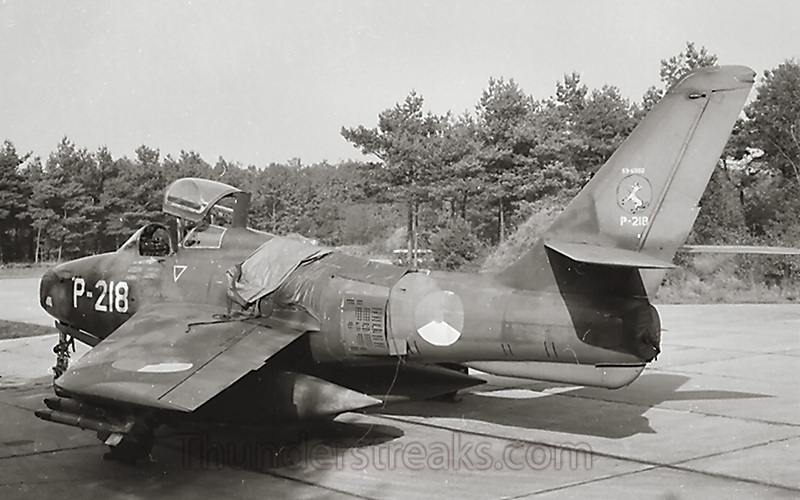 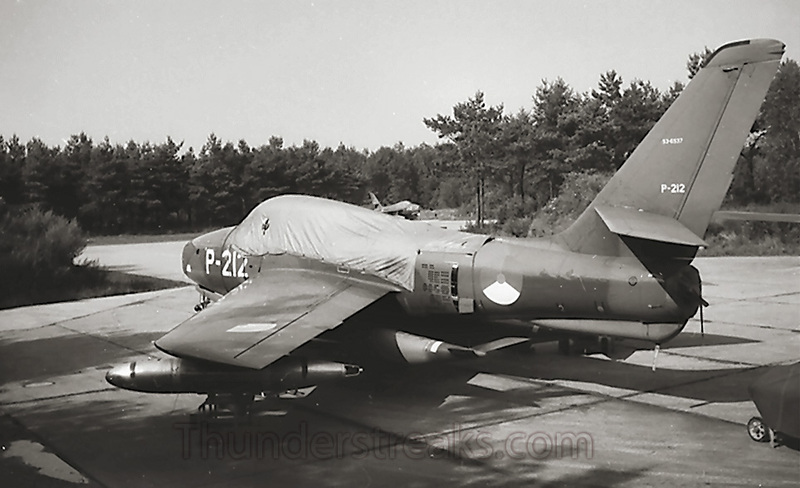 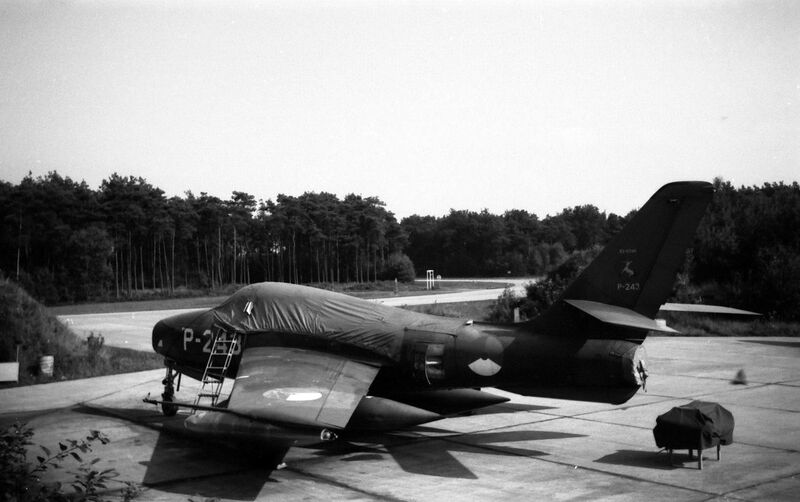 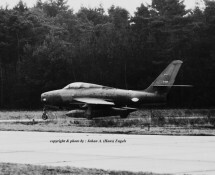 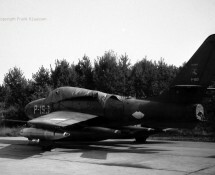 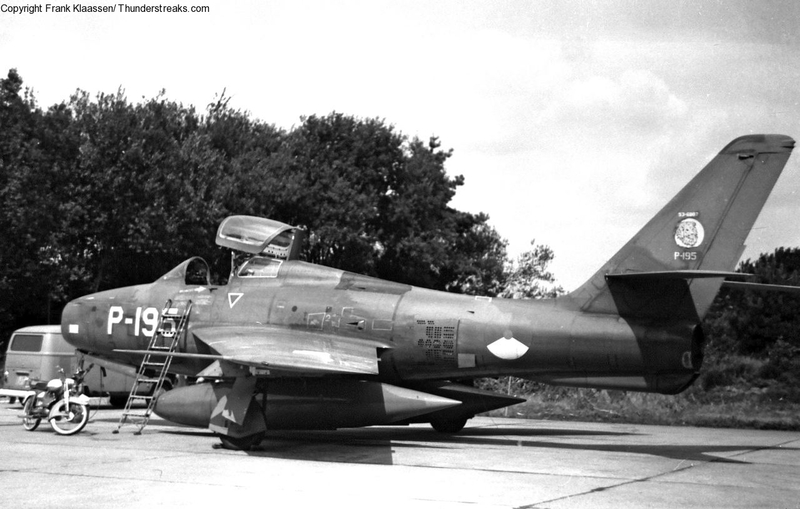 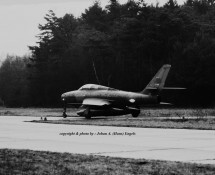 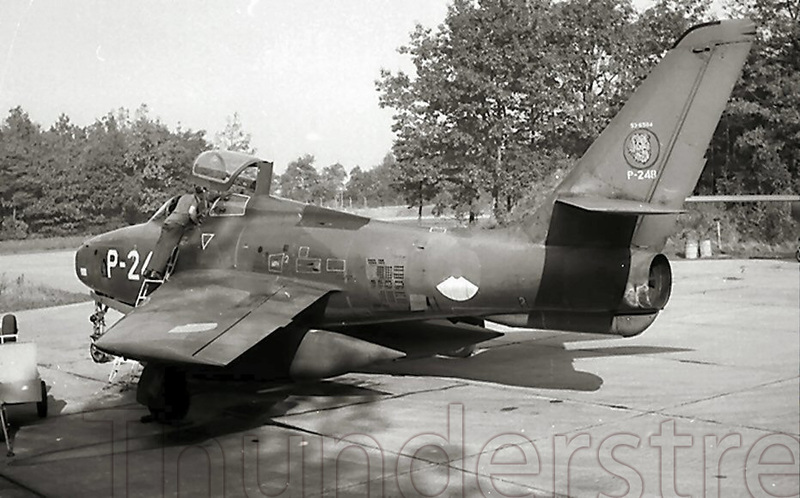 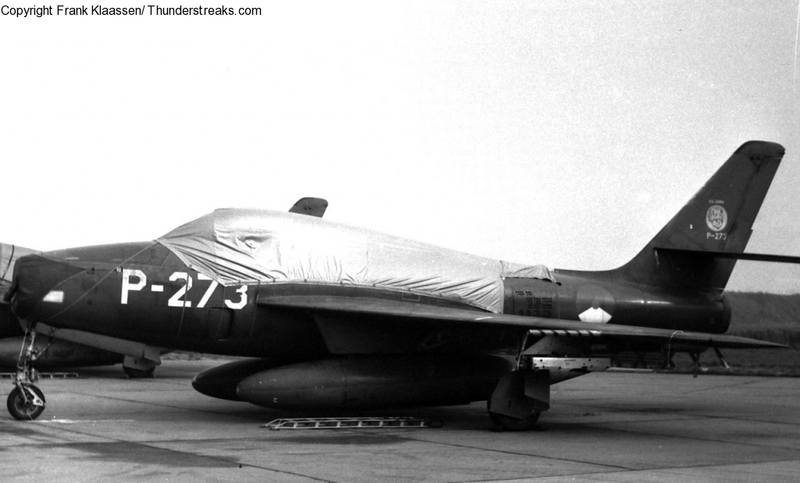 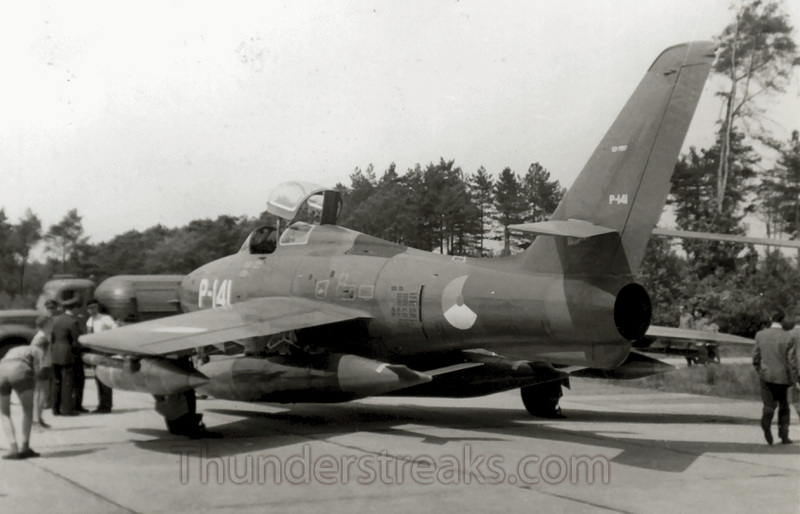 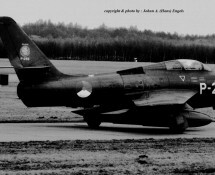 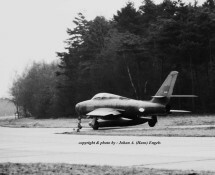 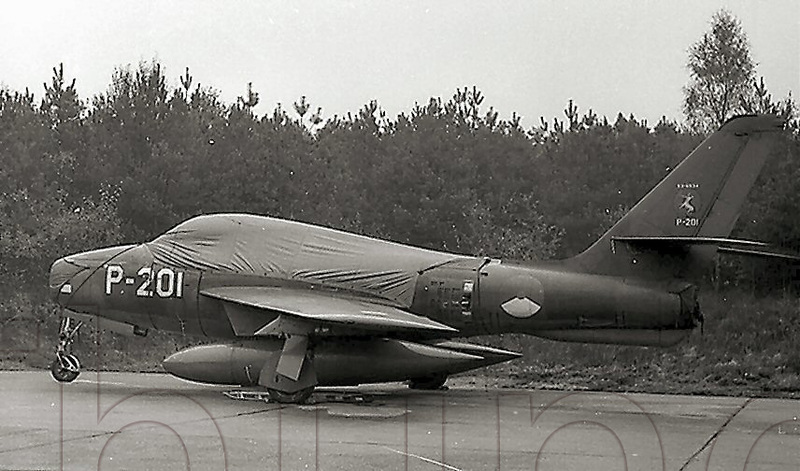 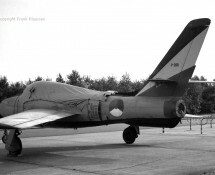 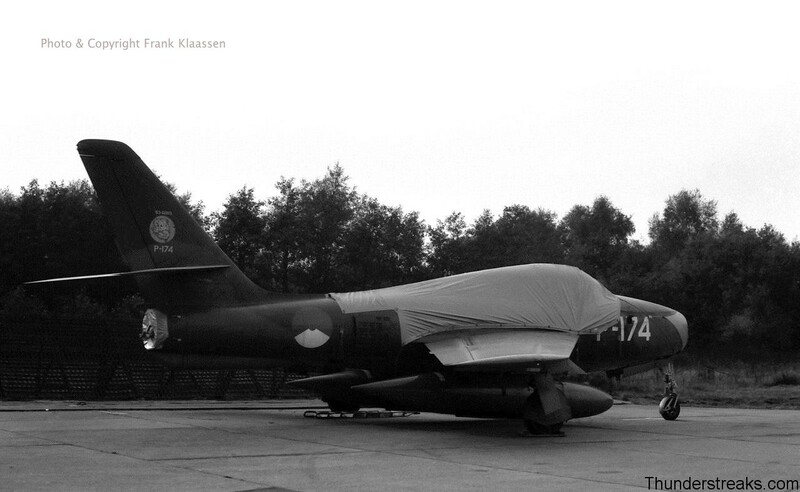 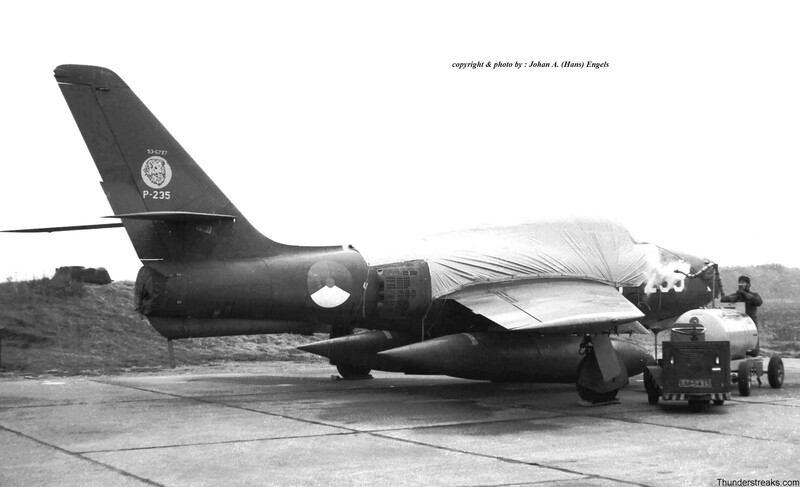 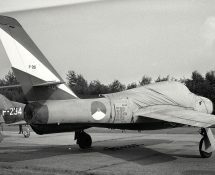 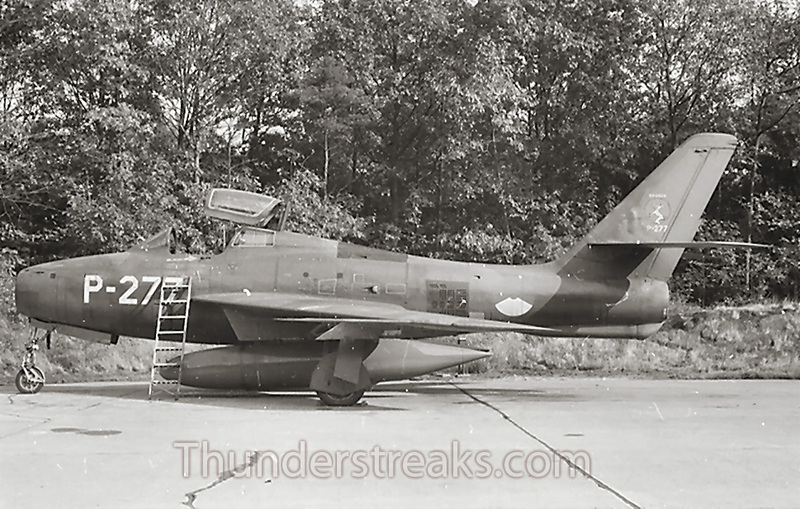 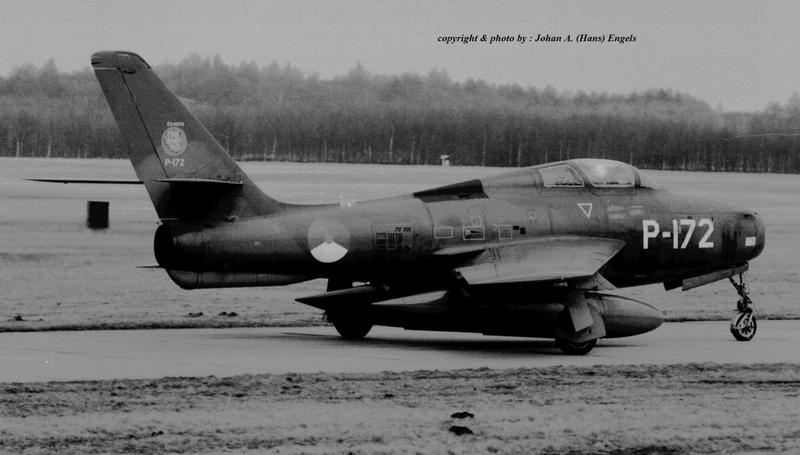 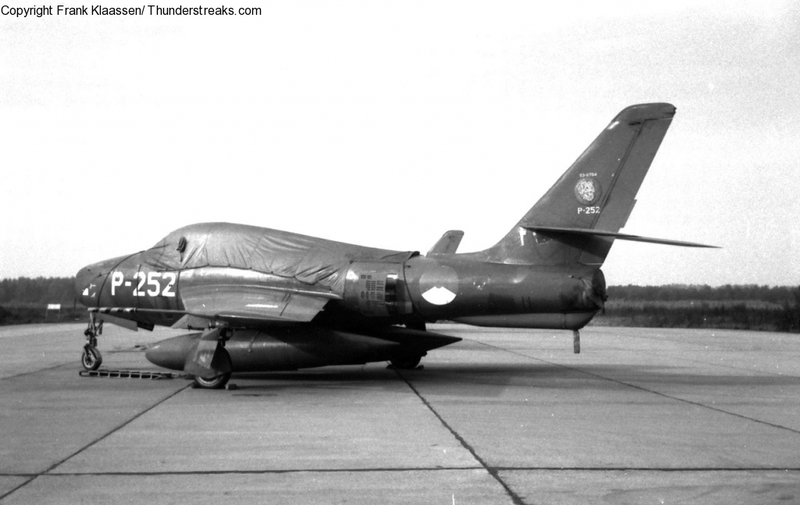 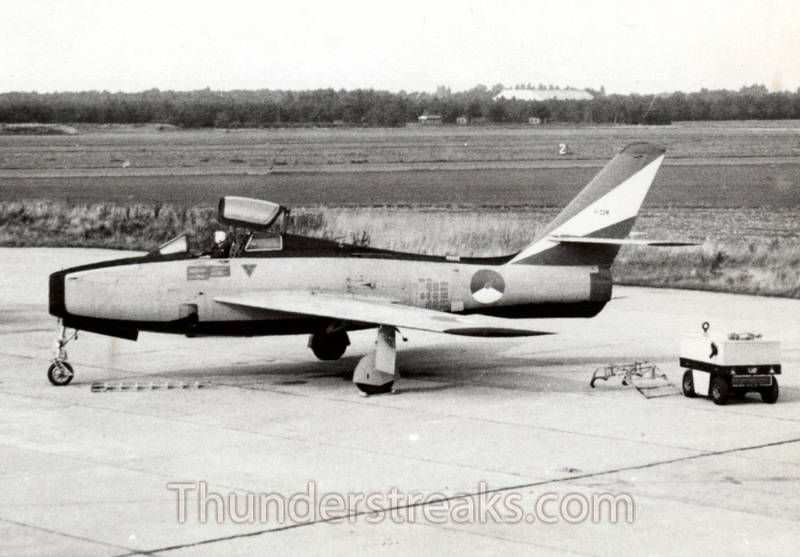 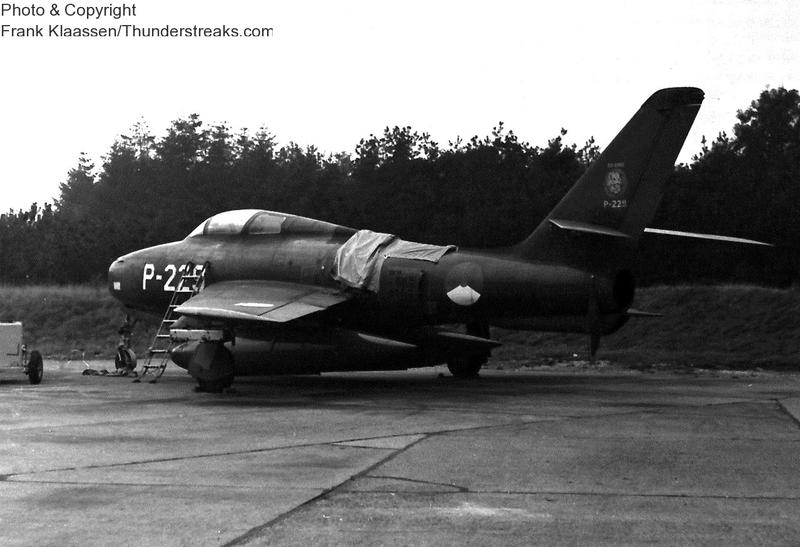 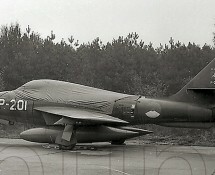 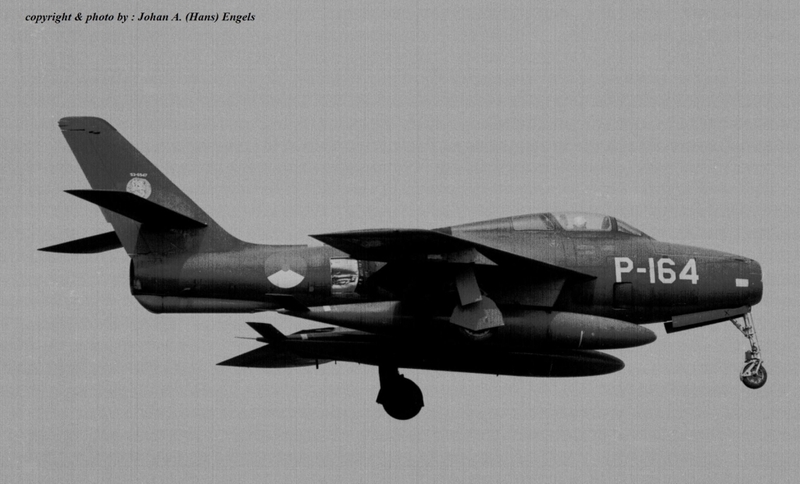 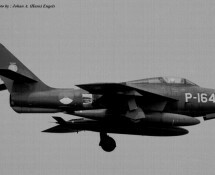 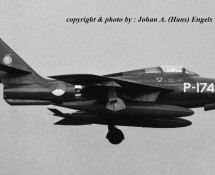 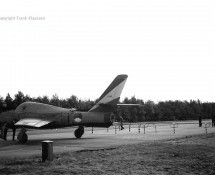 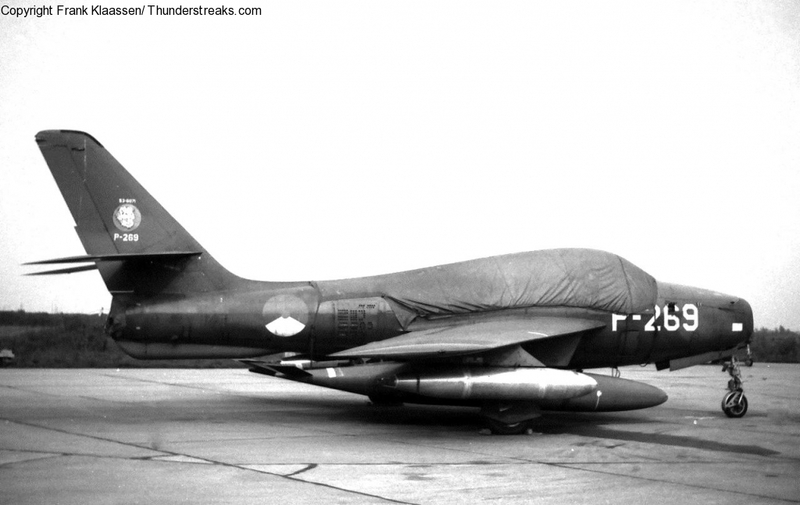 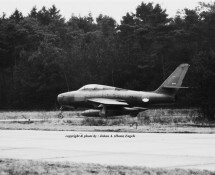 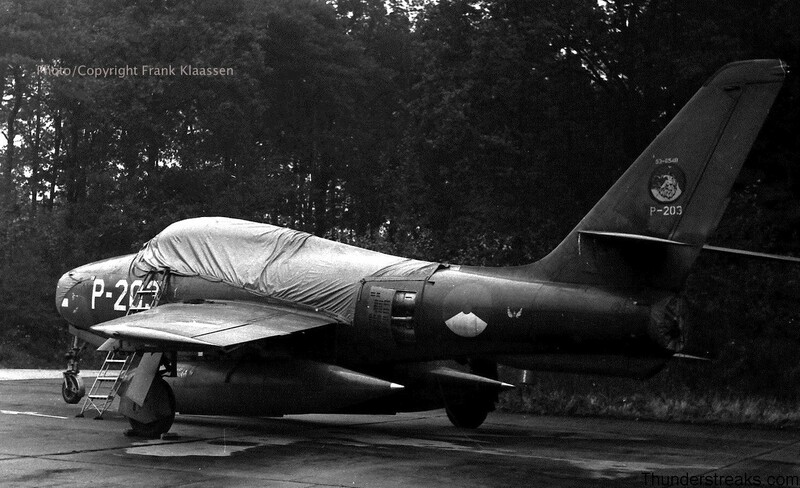 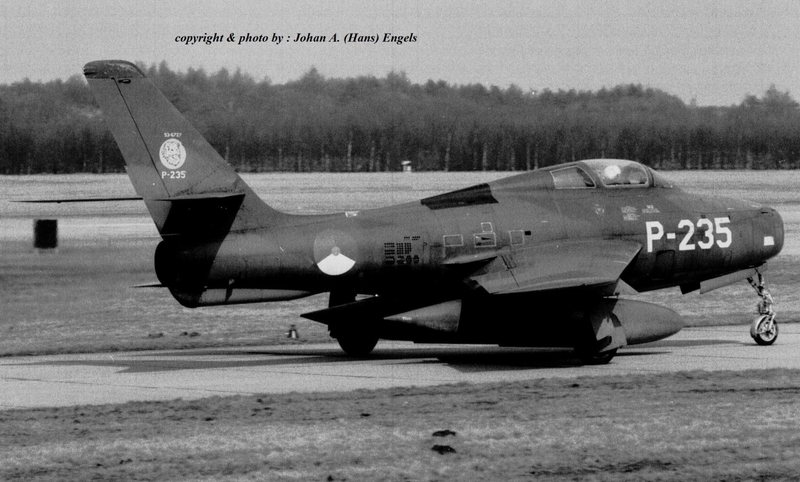 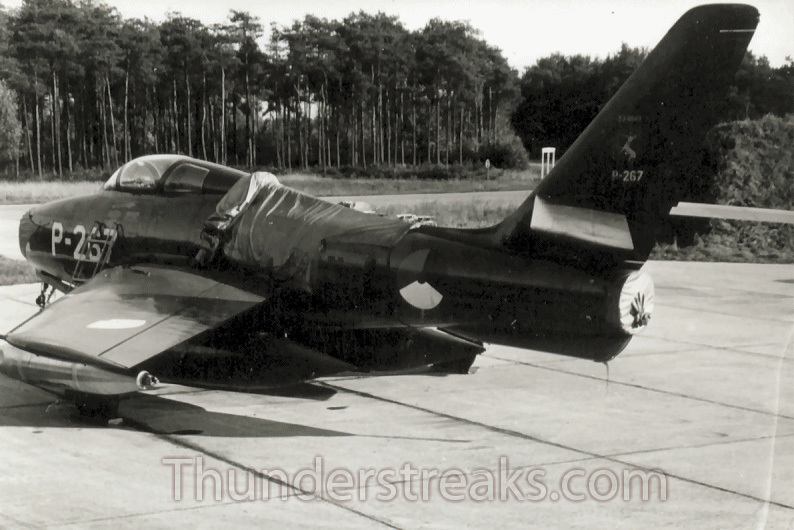 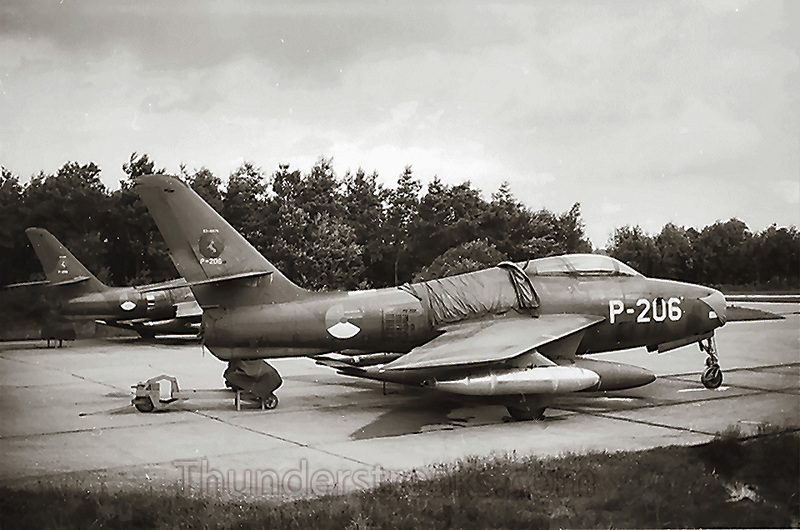 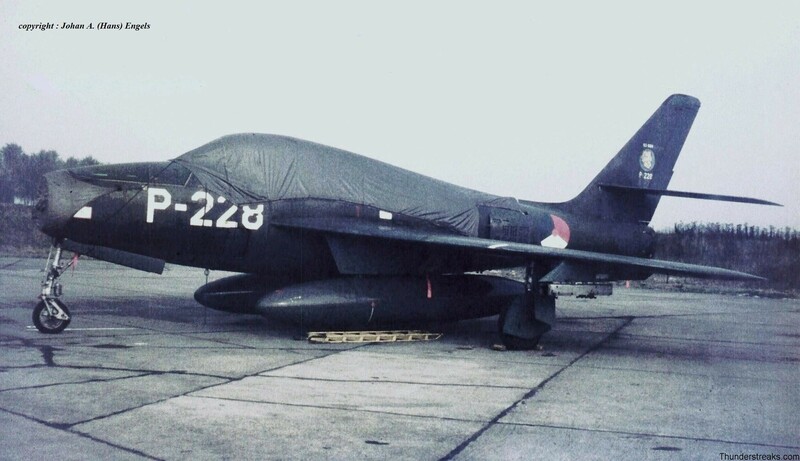 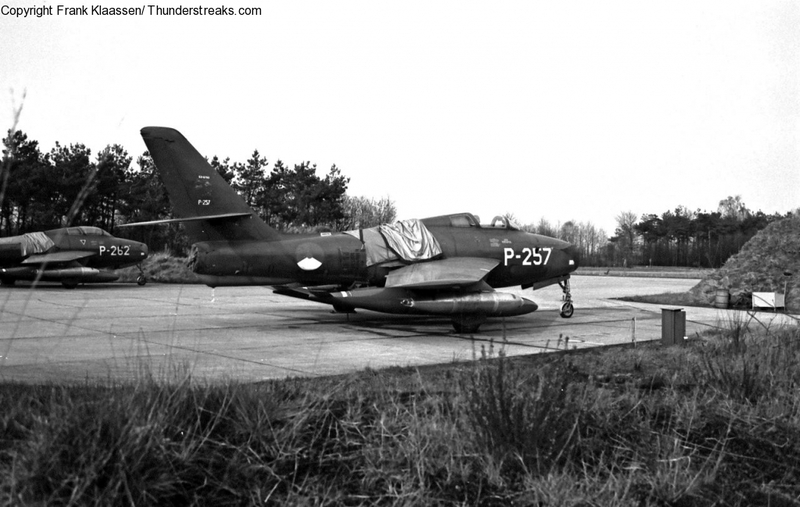 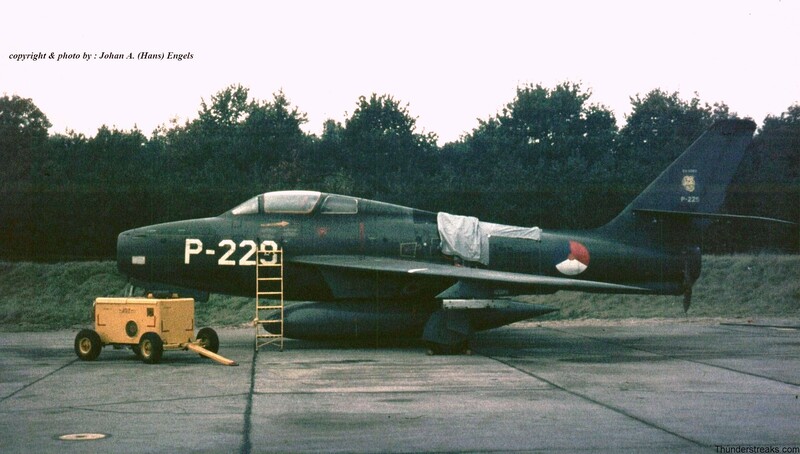 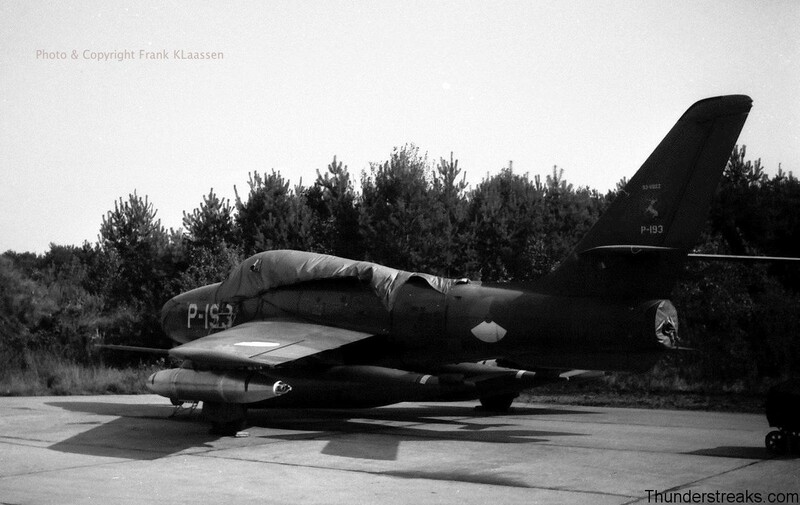 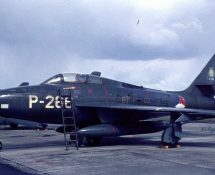 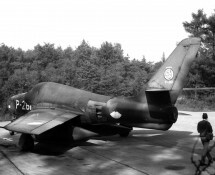 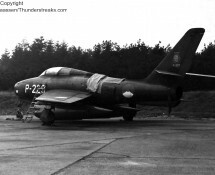 We have gathered a number of pictures of derelict Dutch Thunderstreaks in a second, seperate gallery , called : “Dutch F-84F out of service “. 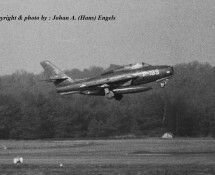 We tend to start the series of pictures below with showing you the photos we uploaded most recently (hence the use of the word “NEW”). 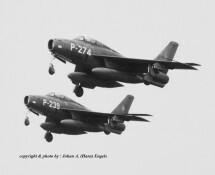 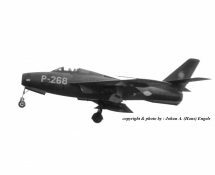 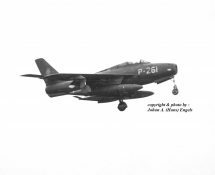 The gallery continues with images out of the range P-102 up to P-300, all of the F-84F’s represented being photographed in various configurations and actions. 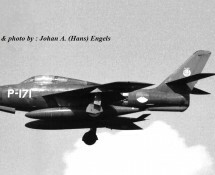 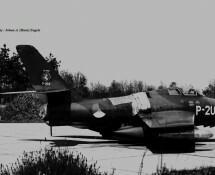 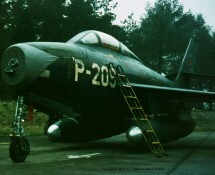 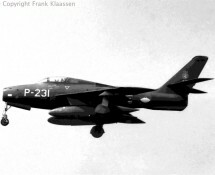 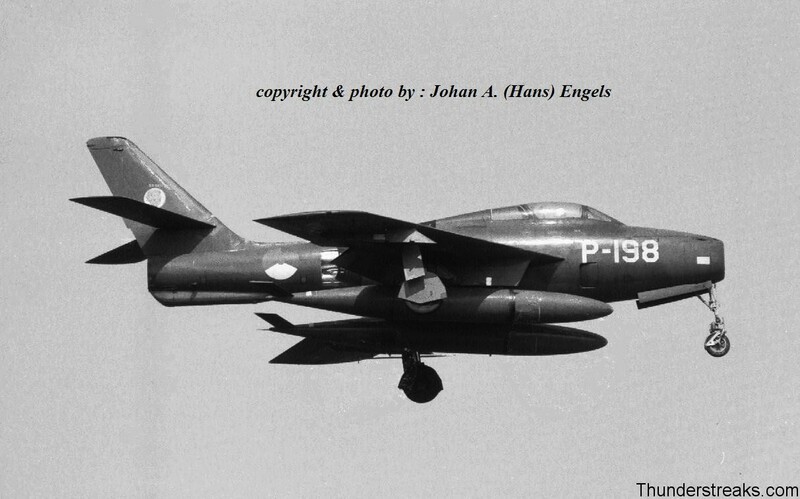 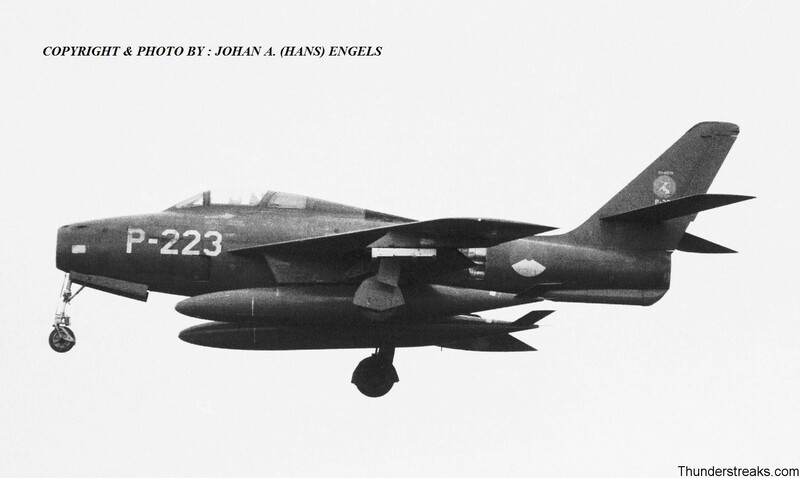 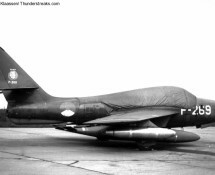 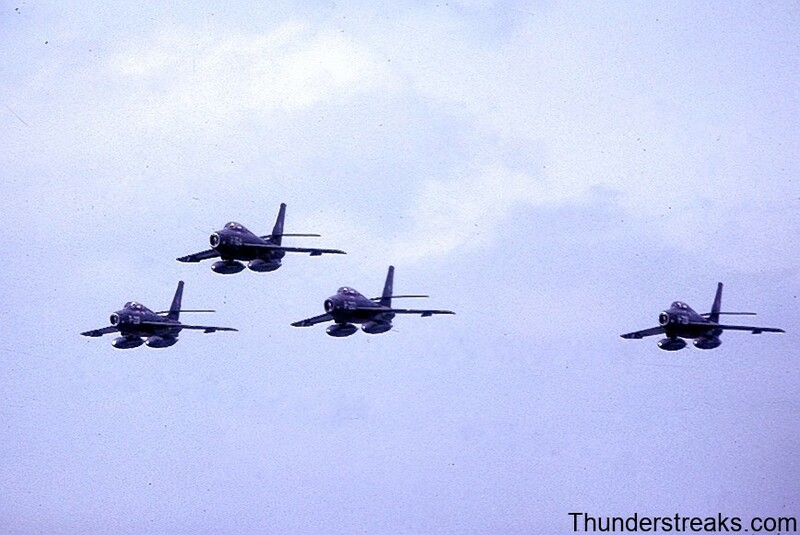 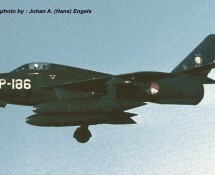 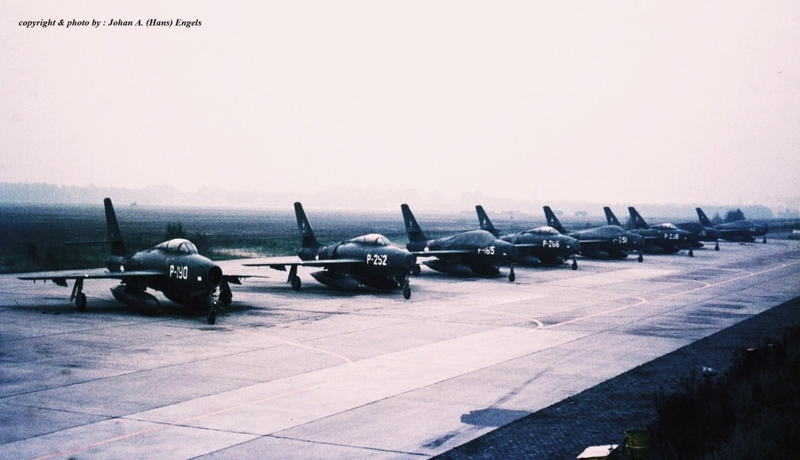 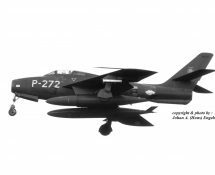 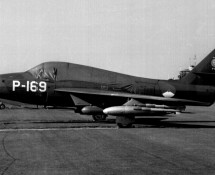 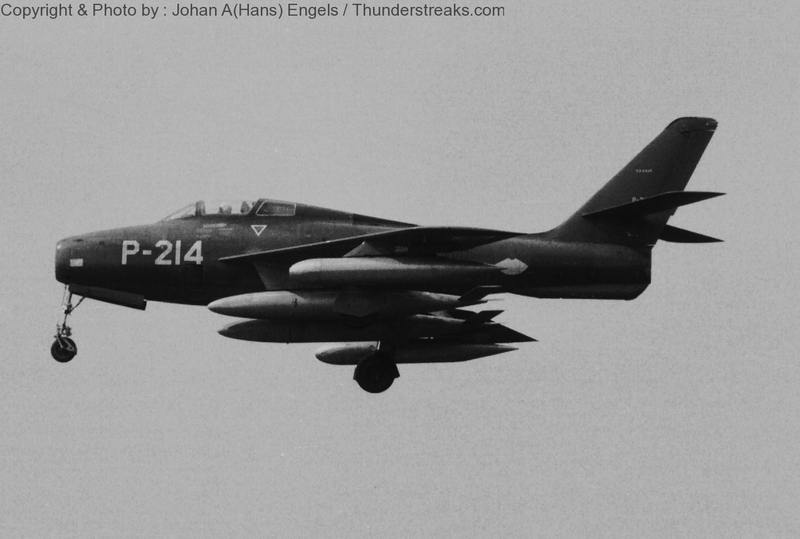 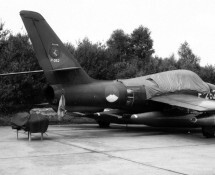 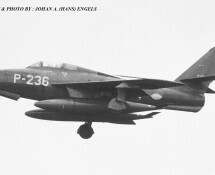 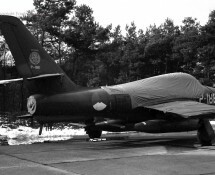 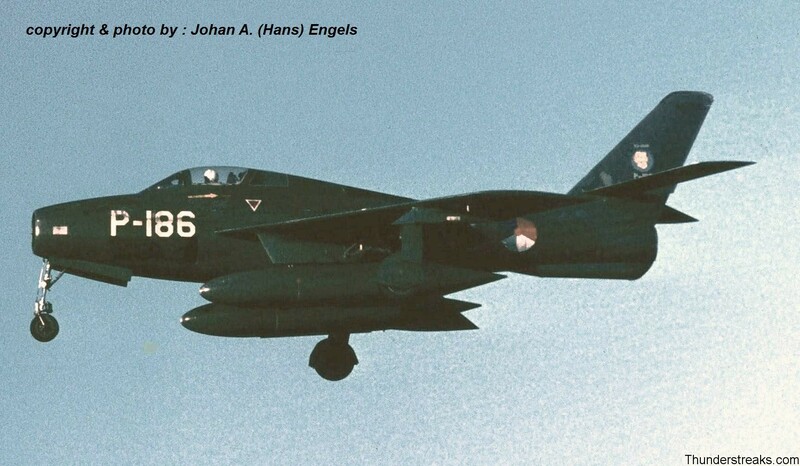 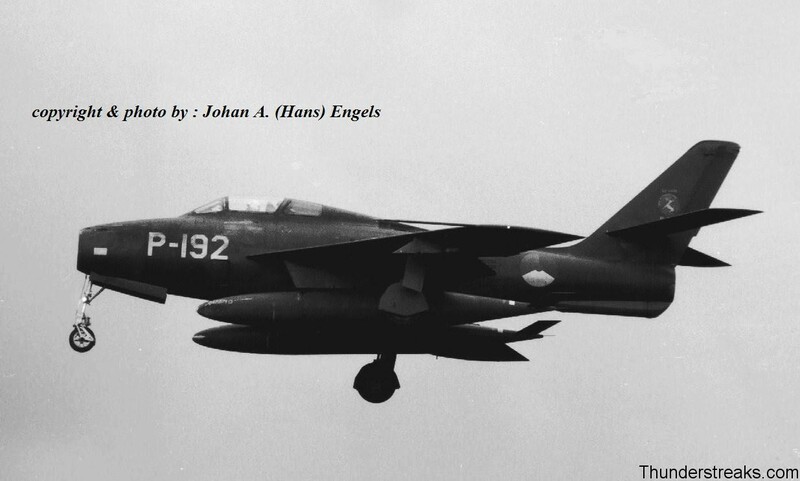 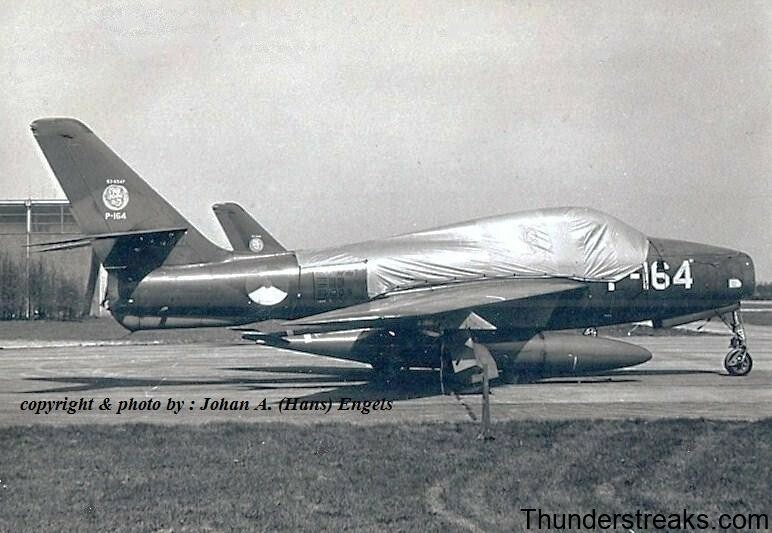 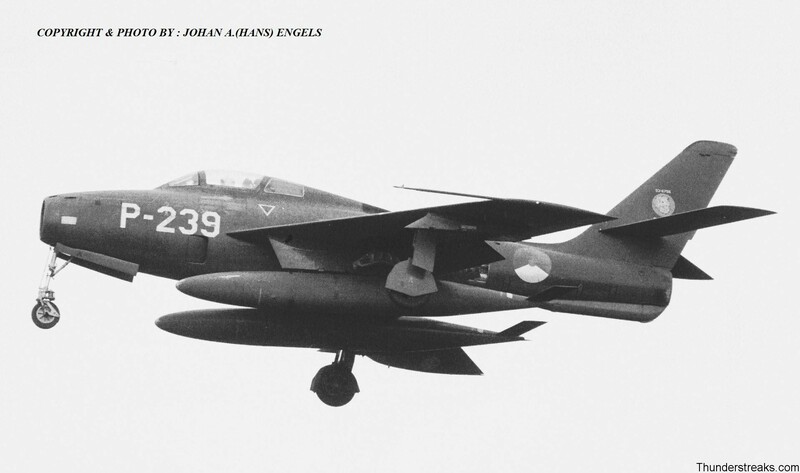 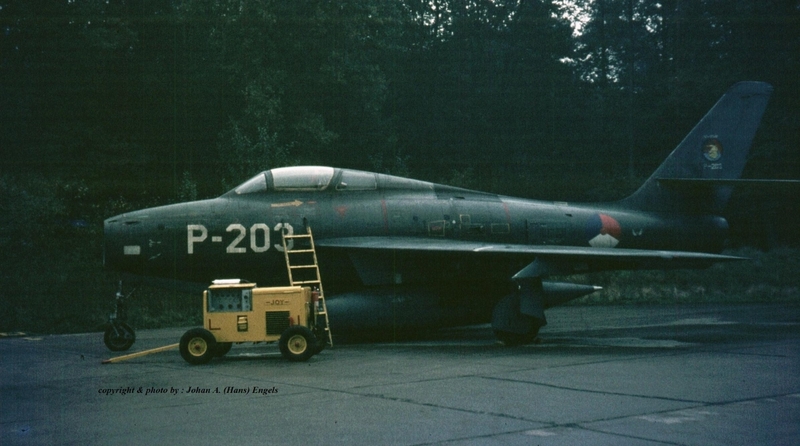 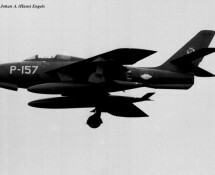 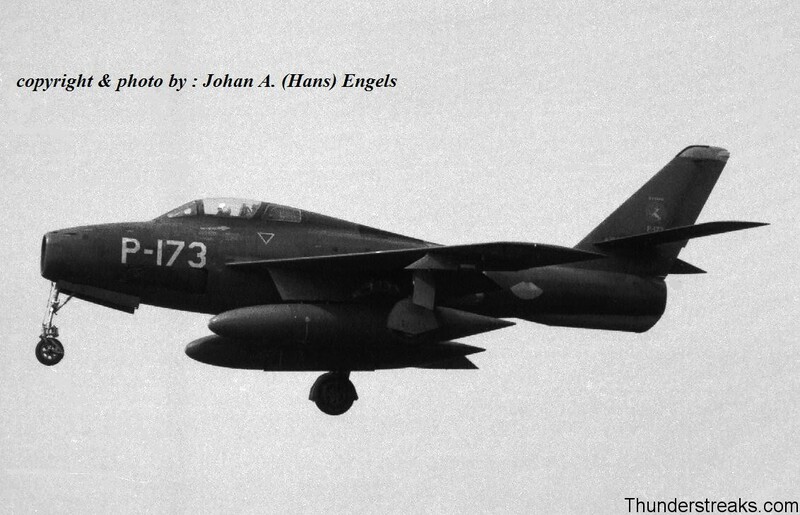 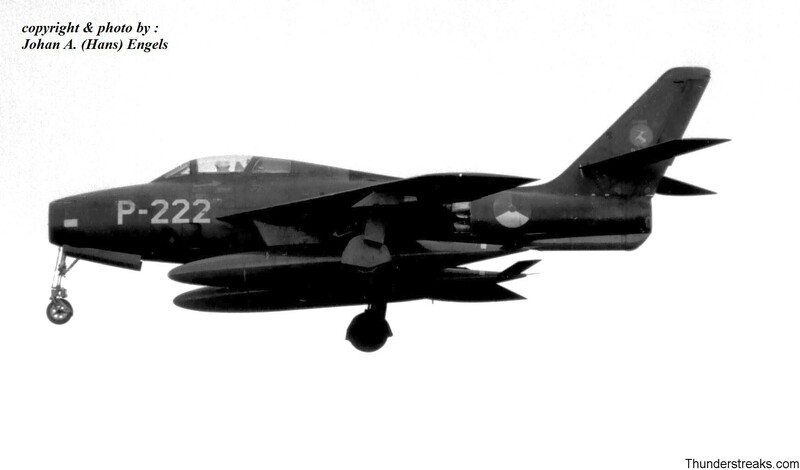 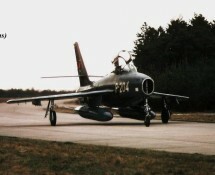 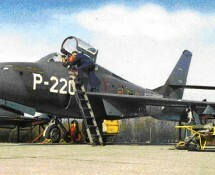 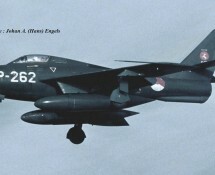 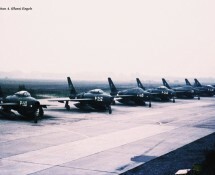 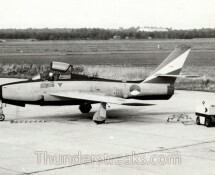 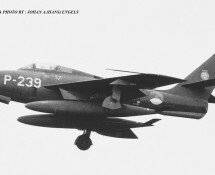 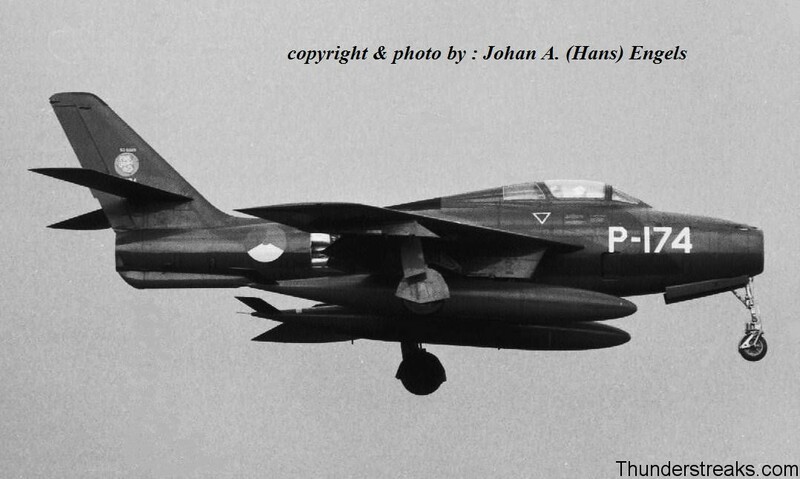 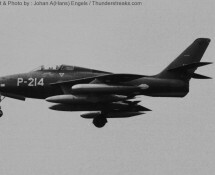 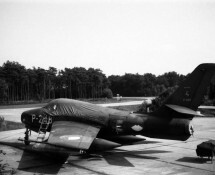 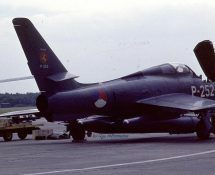 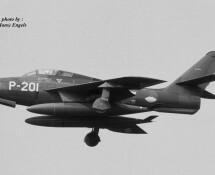 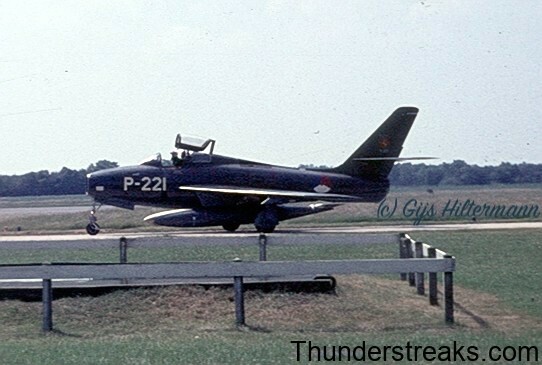 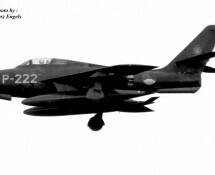 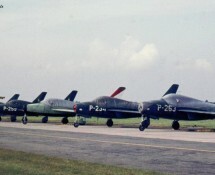 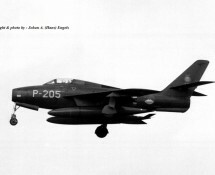 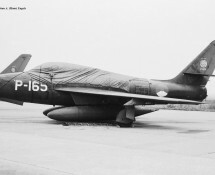 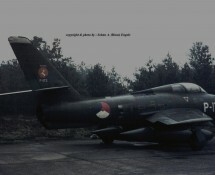 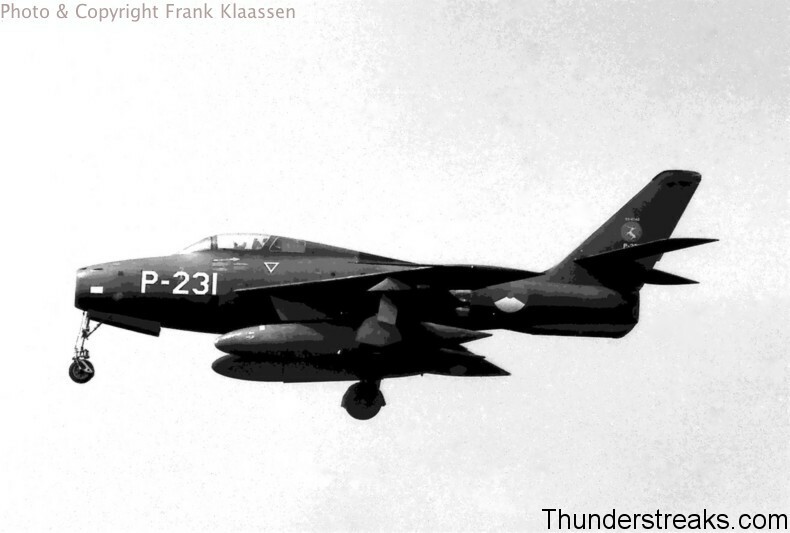 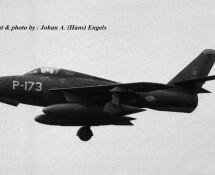 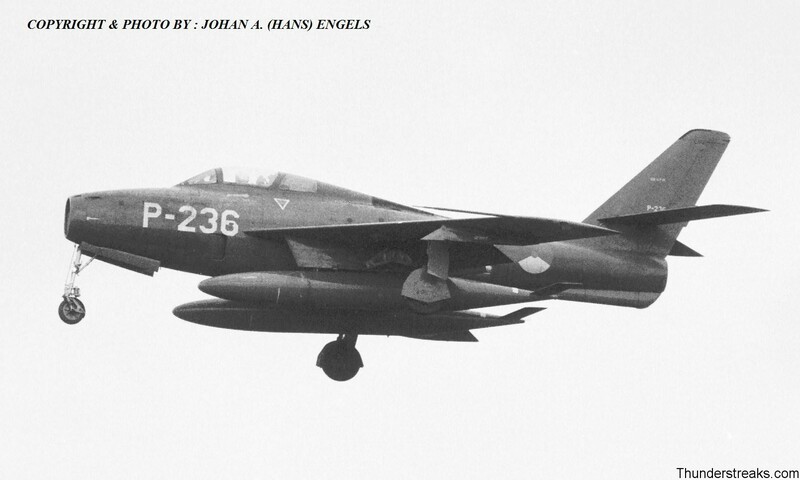 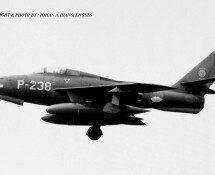 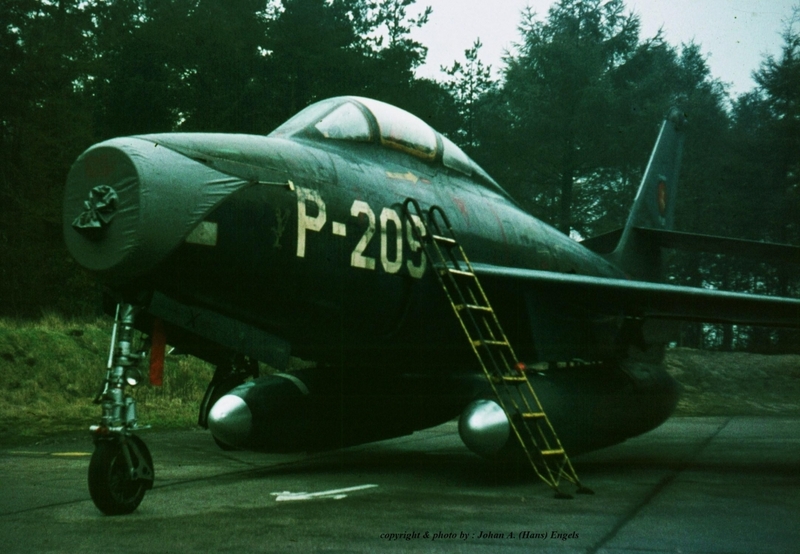 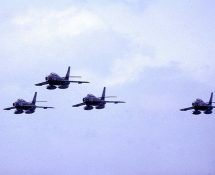 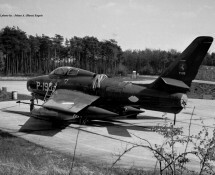 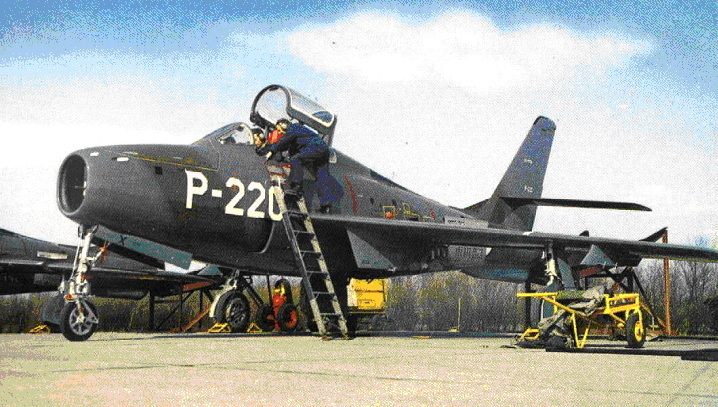 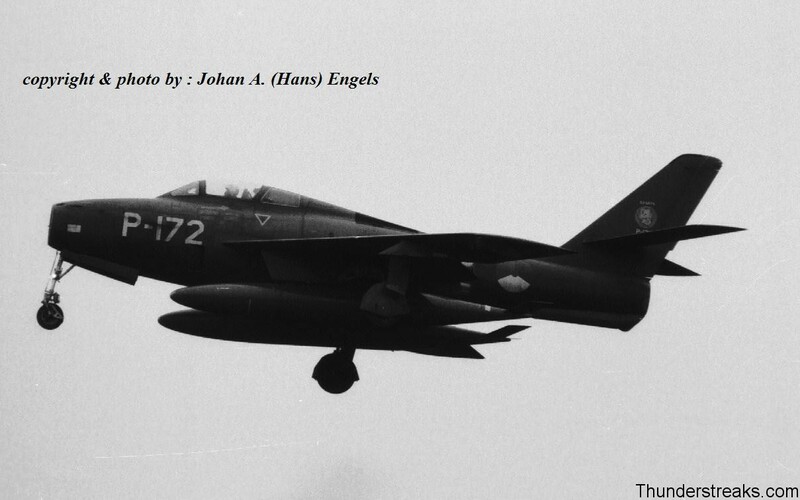 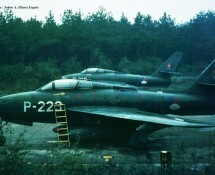 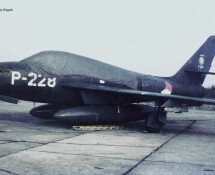 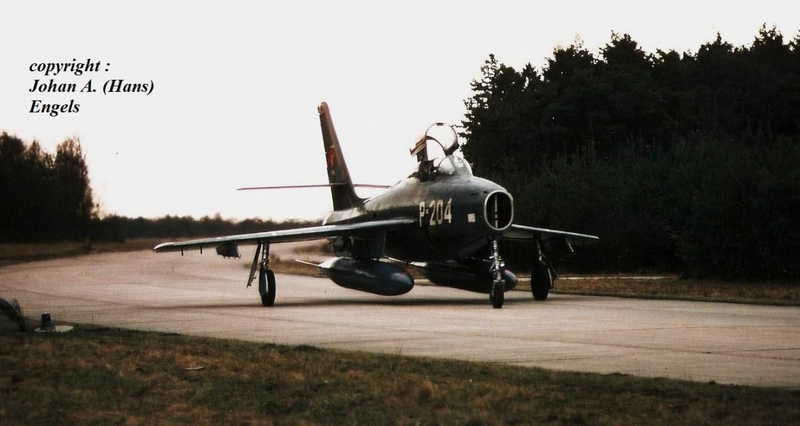 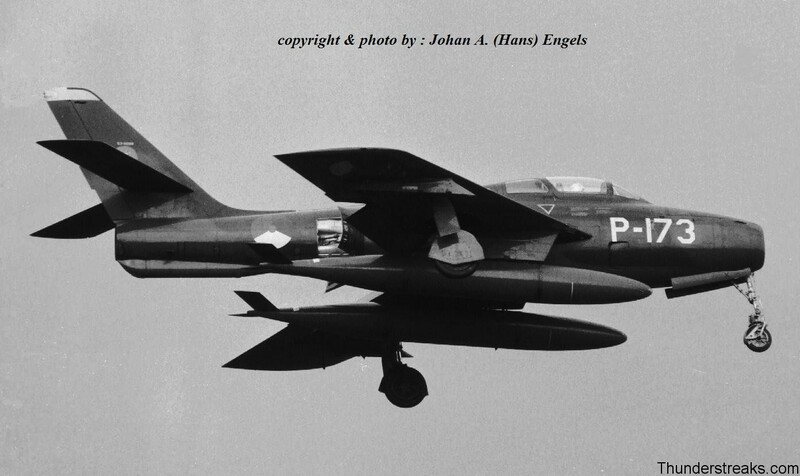 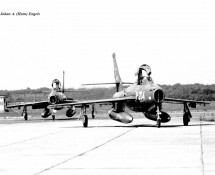 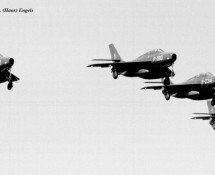 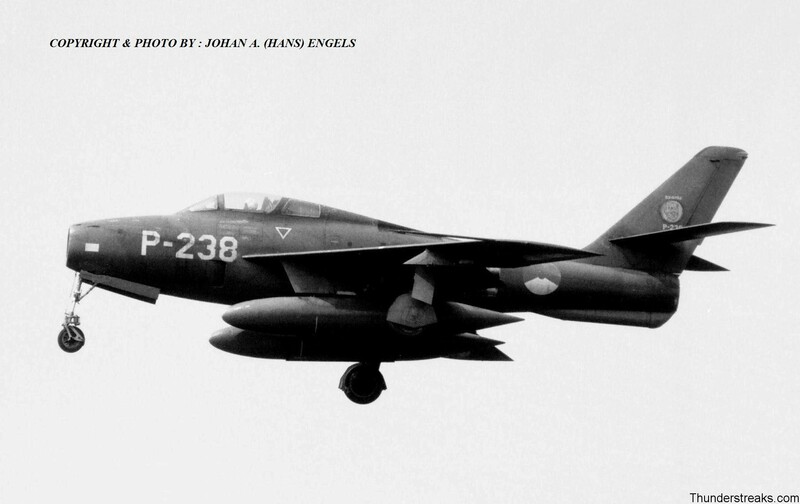 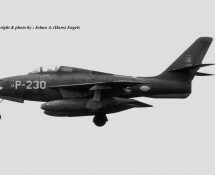 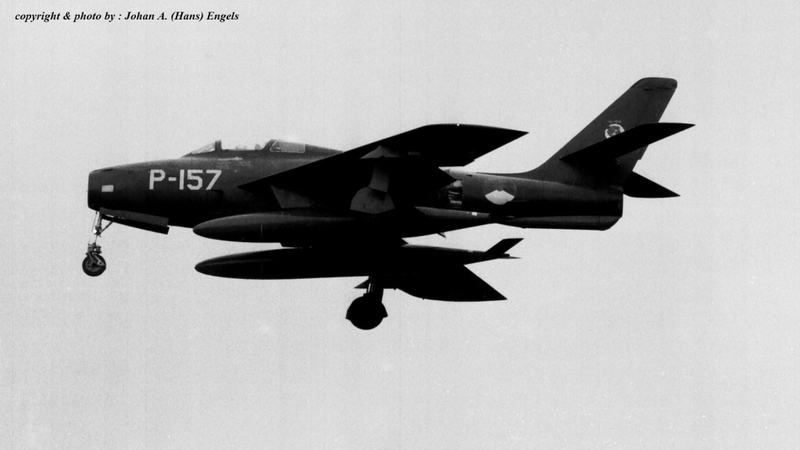 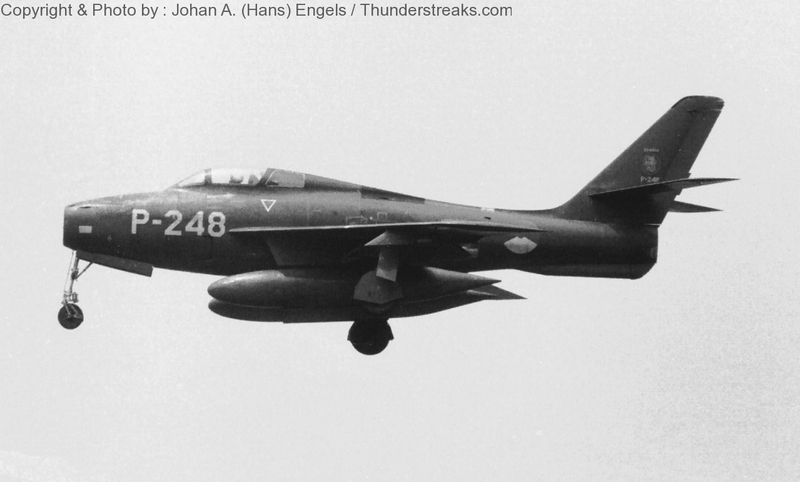 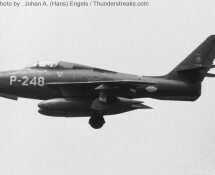 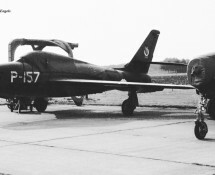 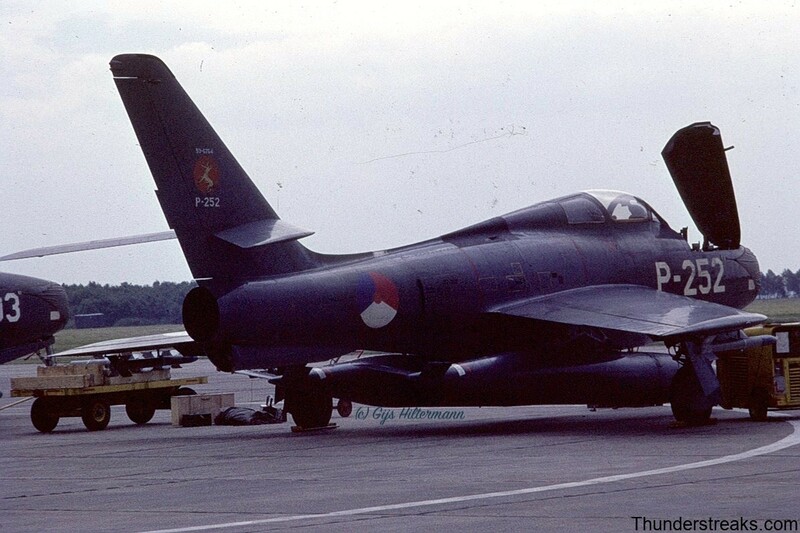 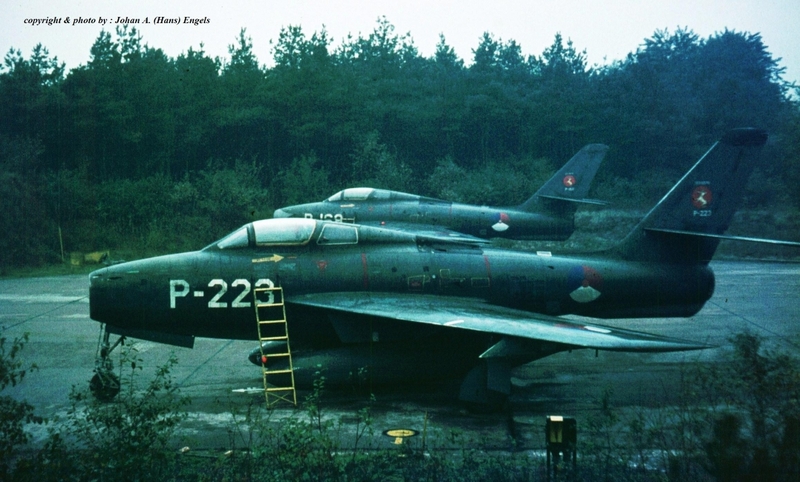 And again, most pictures refer to the final service-period of Thunderstreaks in the Royal Netherlands Air Force during the time when they were assigned to nrs. 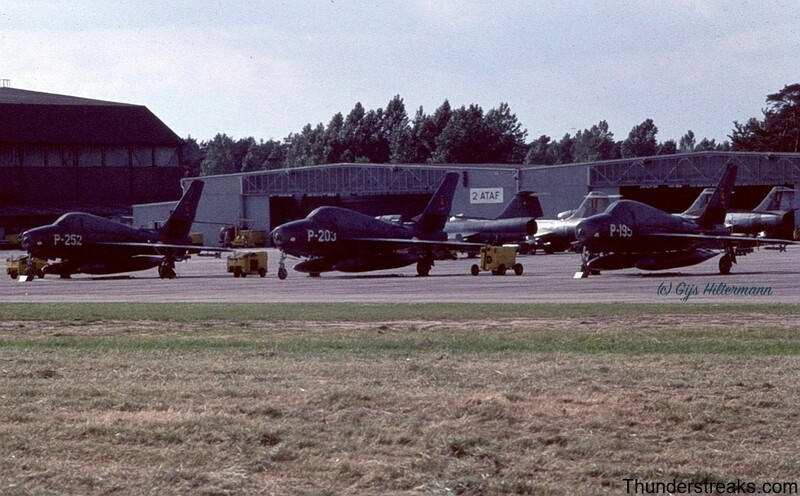 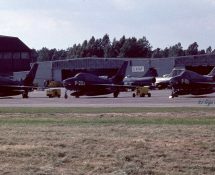 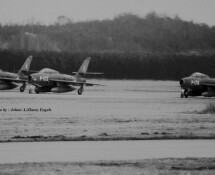 314 and 315 squadrons at Eindhoven. 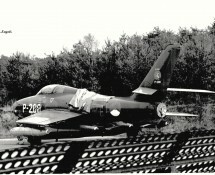 P-226 (HE)(1969) armed with rockets!